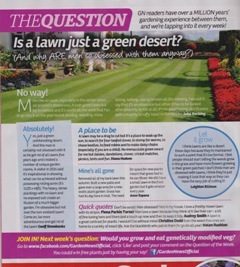 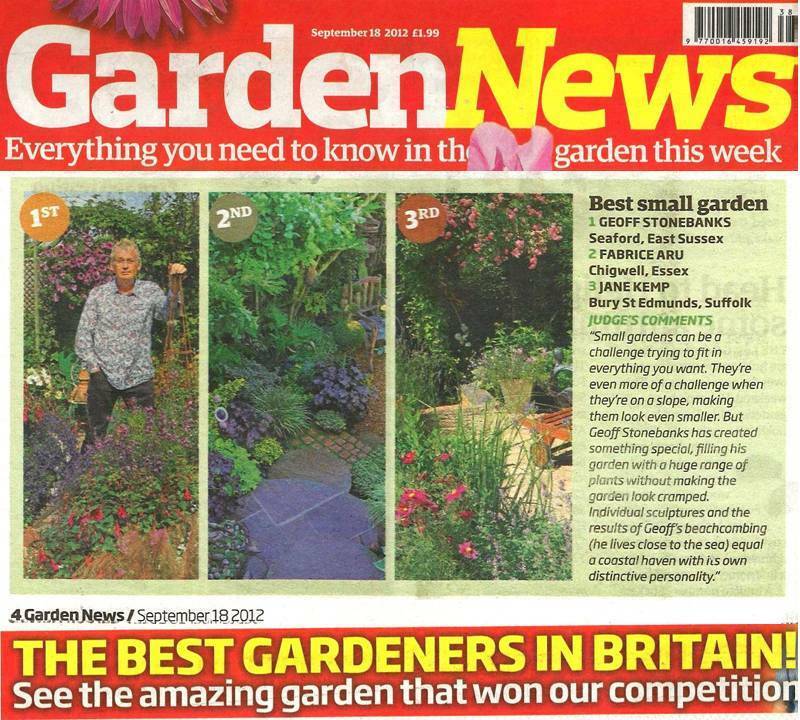 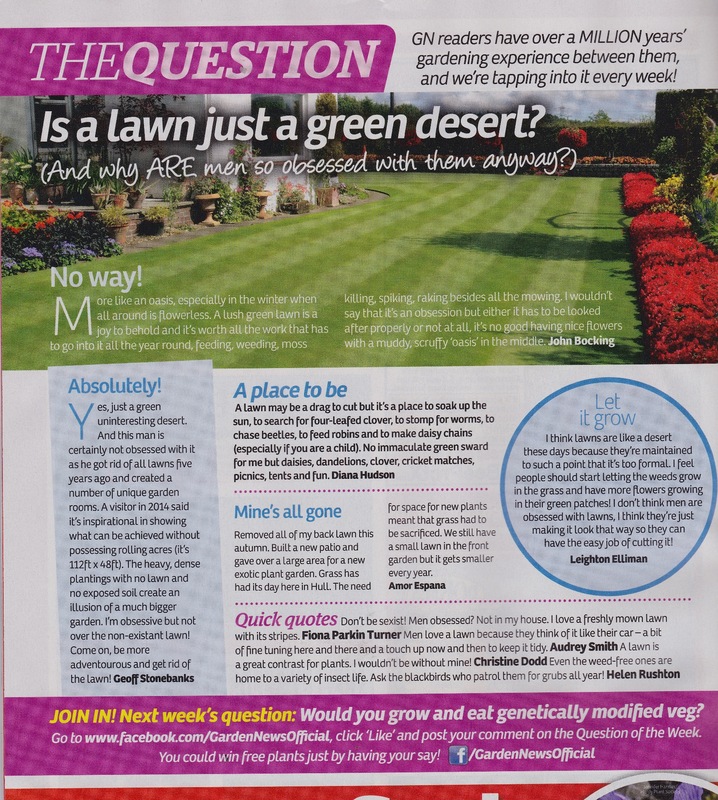 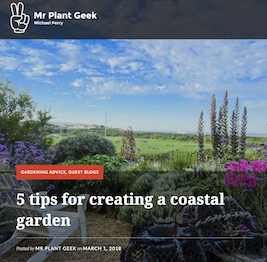 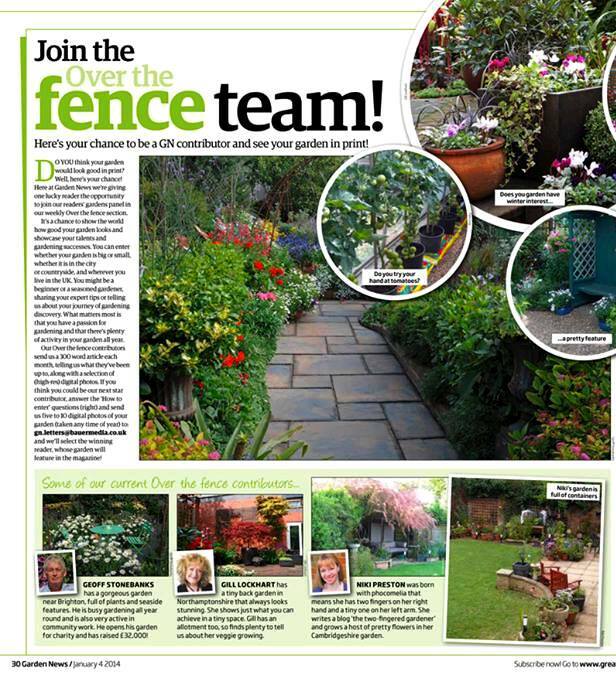 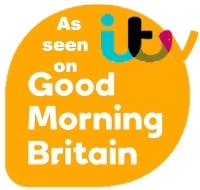 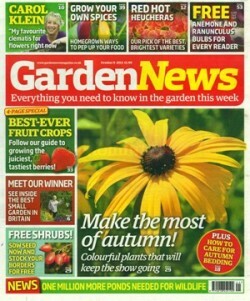 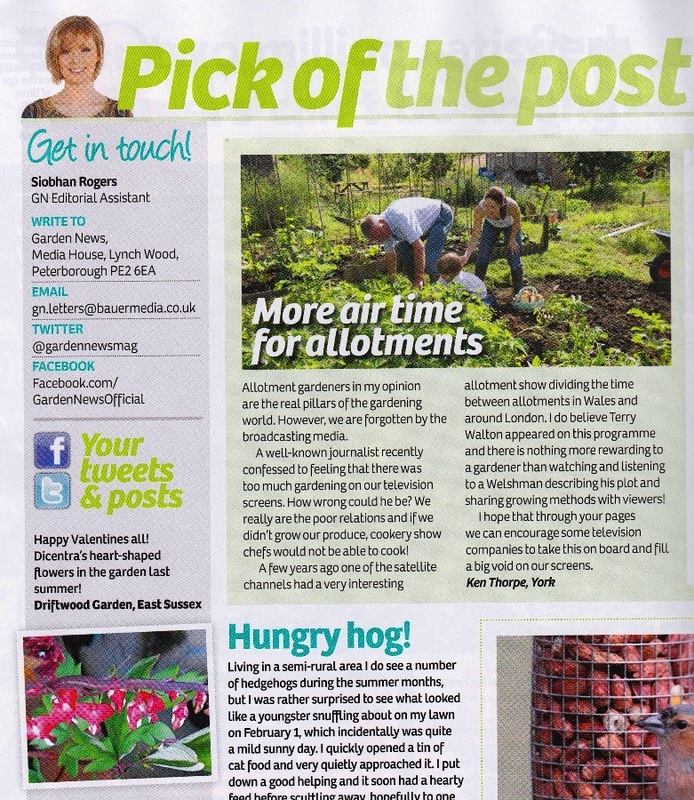 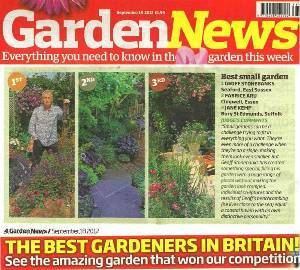 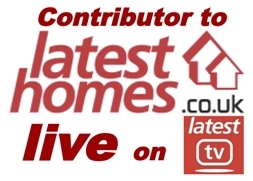 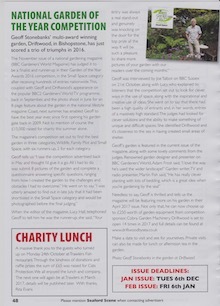 You can see the information related to my appearance on BBC Gardeners' World, view my monthly articles for Garden News, my monthly blog written for Richard Jackson's Garden as well as the media coverage we had on both ITV's Good Morning Britain and on Latest Homes Live as well as my weekly column in the Argus Newspaper by clicking the logos above. 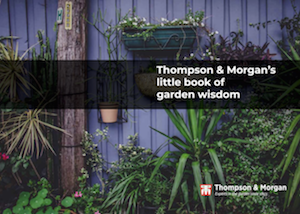 Blogs written for Thompson & Morgan here. 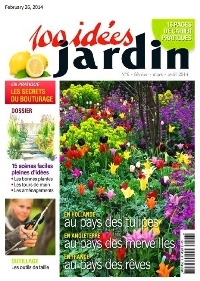 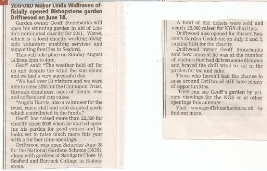 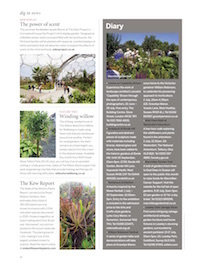 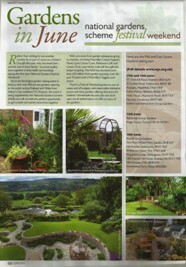 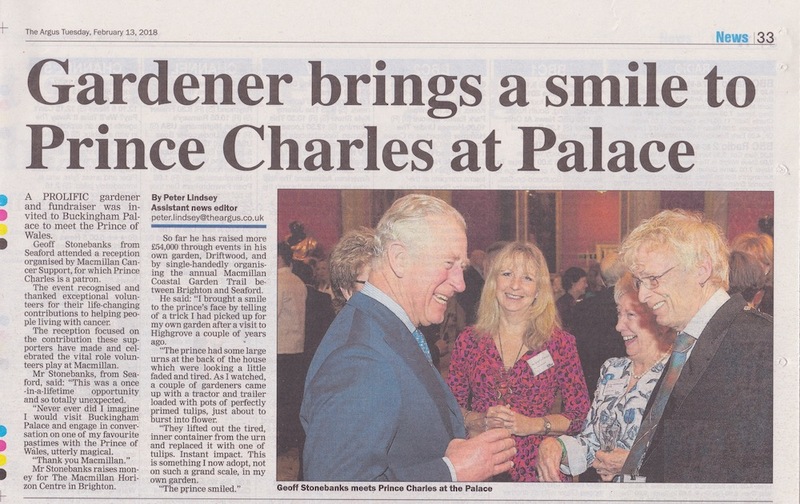 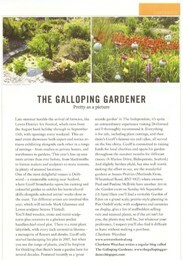 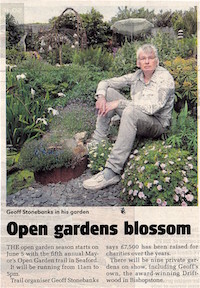 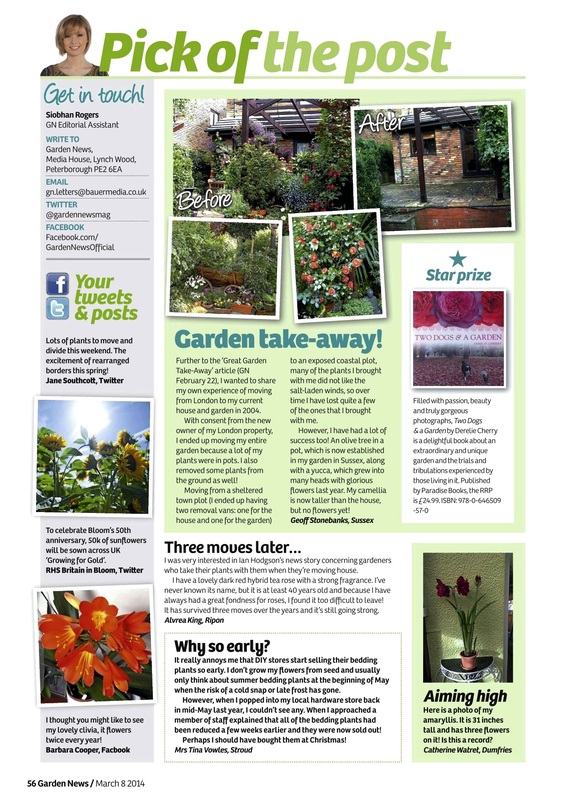 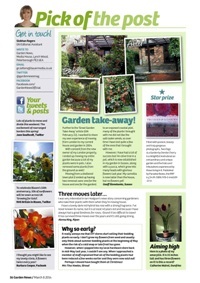 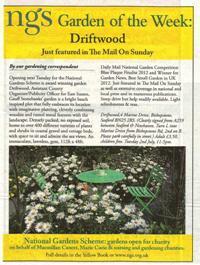 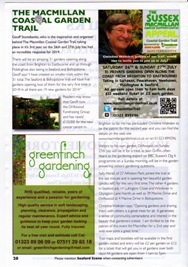 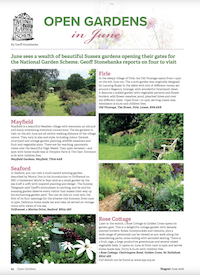 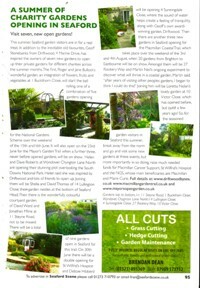 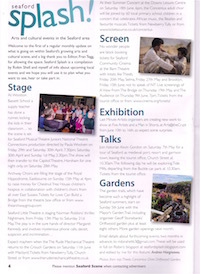 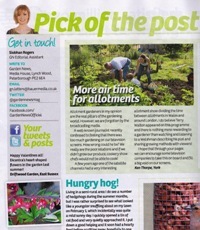 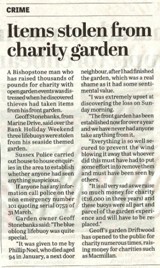 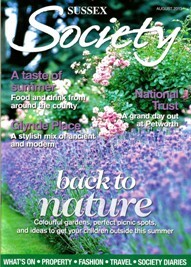 Below are cuttings from newspapers, magazine articles and on line blog pieces about the garden. 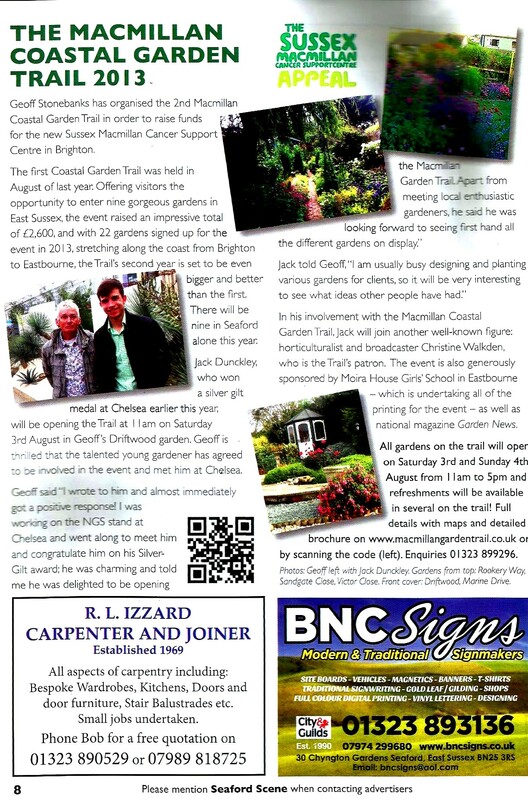 Click article to see larger view to read, click magazine cover to see feature inside or click logo to see on line blog review. 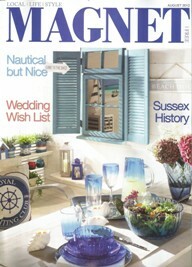 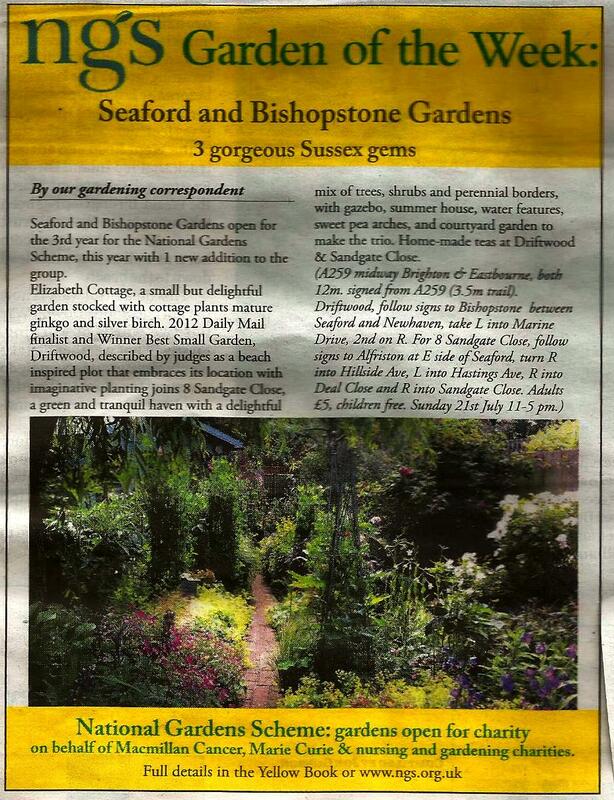 Nice piece in Seaford Scene April issue. 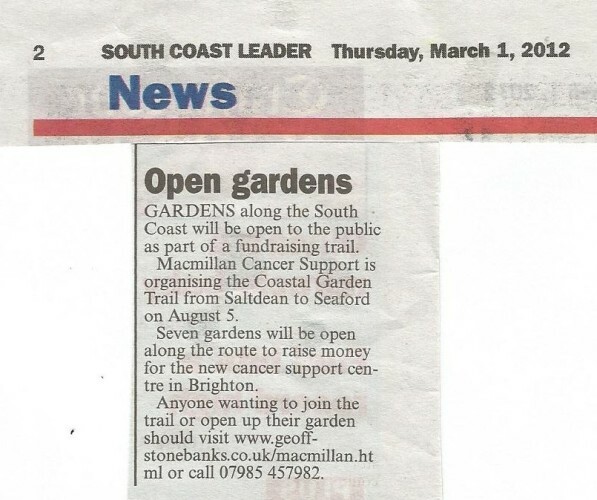 Full page 3 in The Argus newspaper and South Coast Argus on Thursday 7th February. 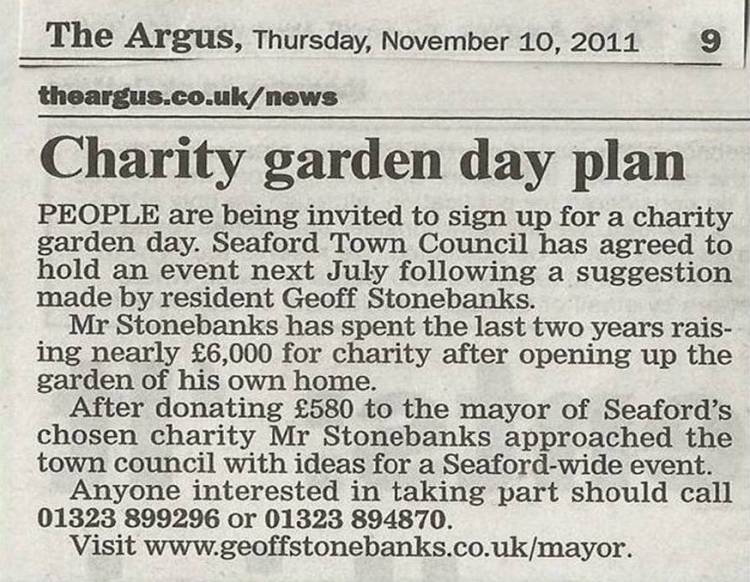 It also appeared online too on 10th February here. 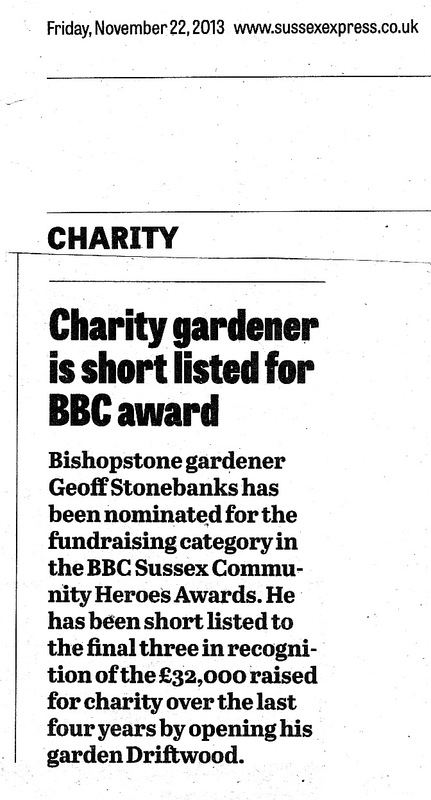 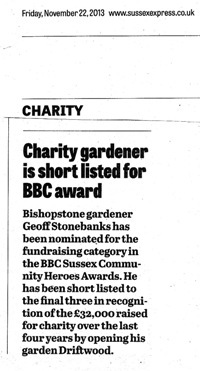 Short article in Sussex Express on Friday 8th February. 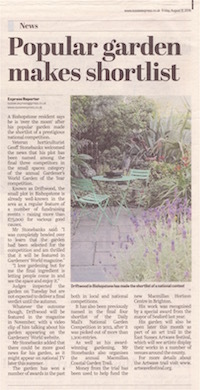 The article appeared online here too. Nice piece on Macmillan Trail in February issue of the Peacehaven Directory. 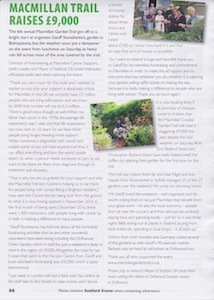 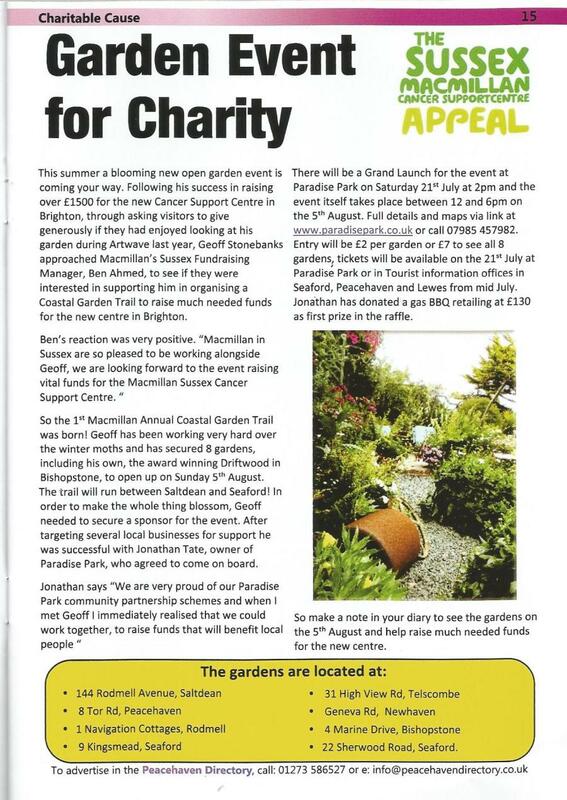 Lovely whole page article in the January issue of Seaford Scene about myself and Macmillan Cancer Support. 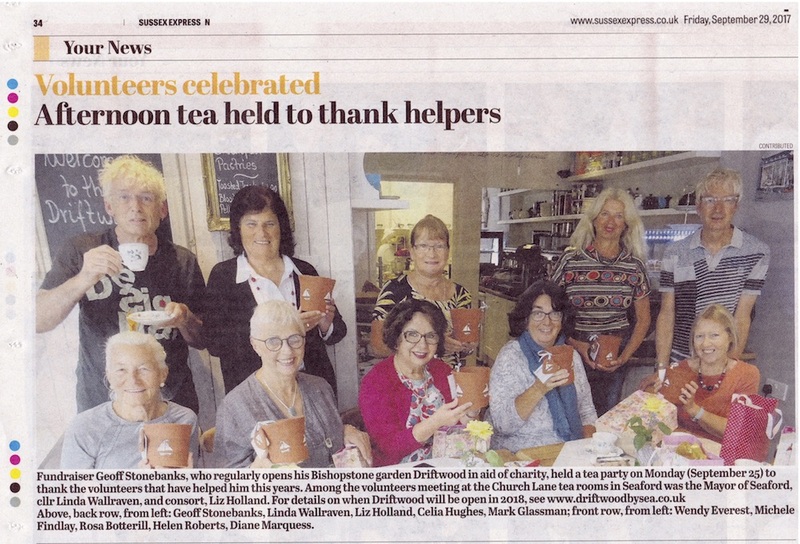 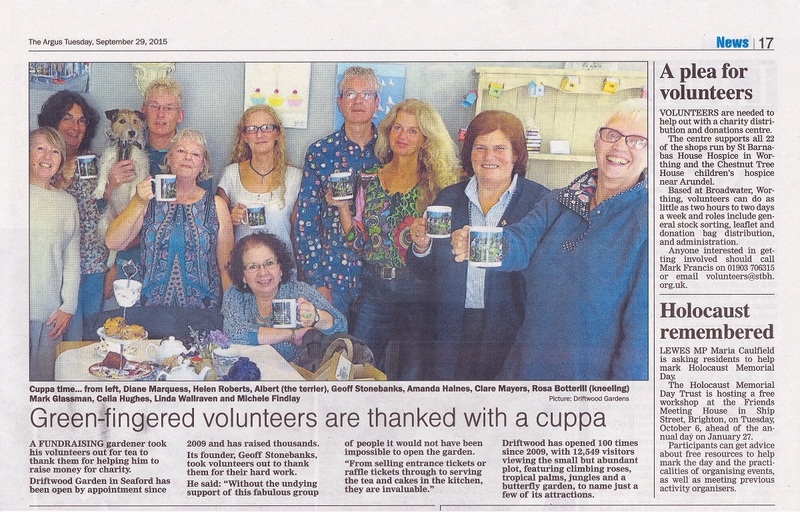 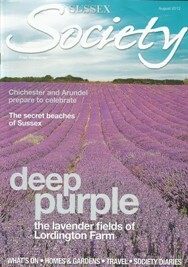 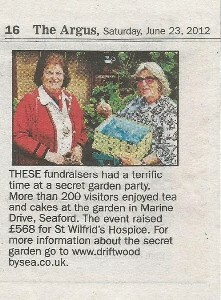 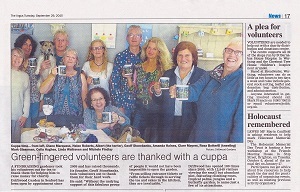 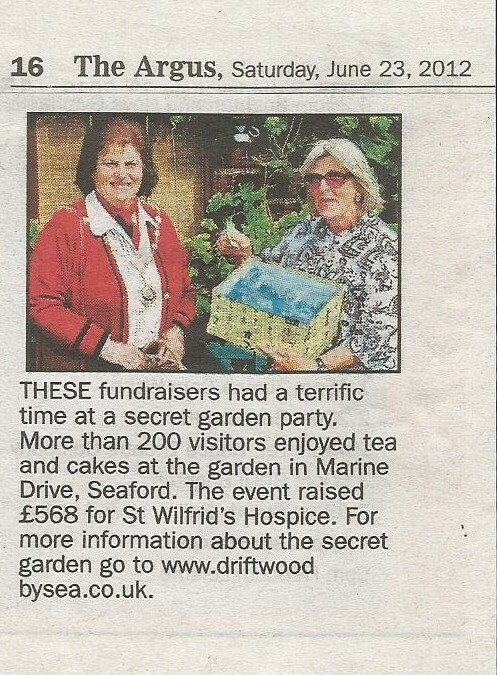 Feature in Seaford Scene December issue on Driftwood Volunteer Tea party. 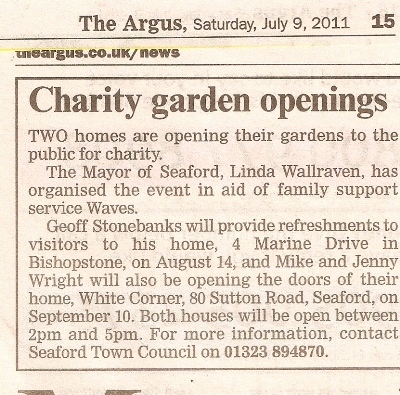 Nice piece in the Lewes & S Coast Argus on 29th November about the Horizon Centre's 2nd Birthday! 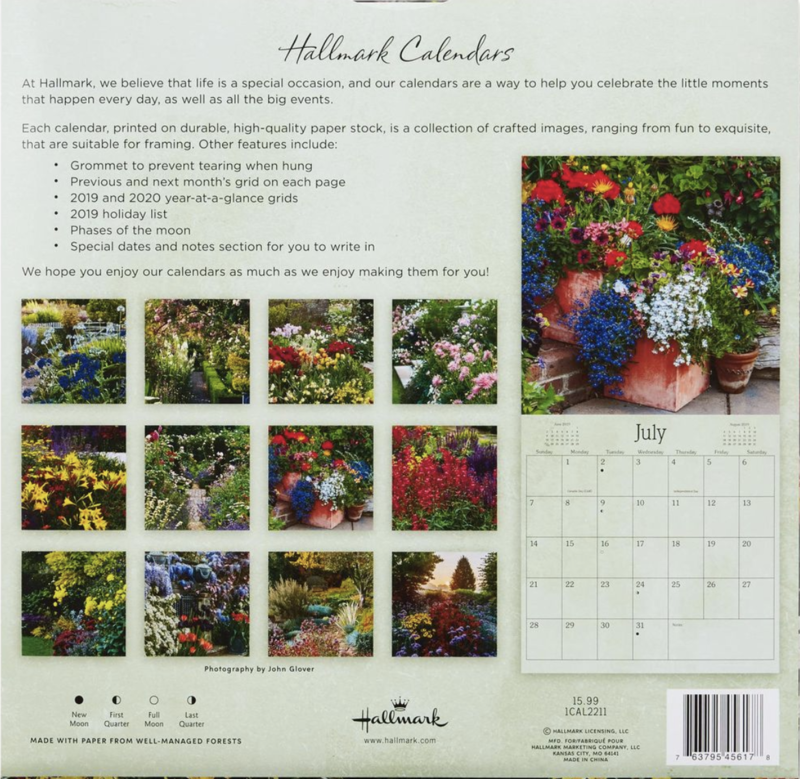 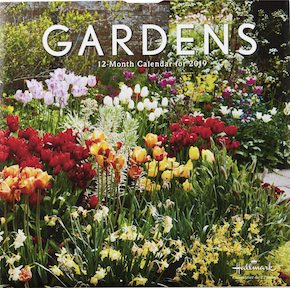 Discovered in September 2018 that the garden was the July image on the Hallmark garden calendar 2019 in the States. 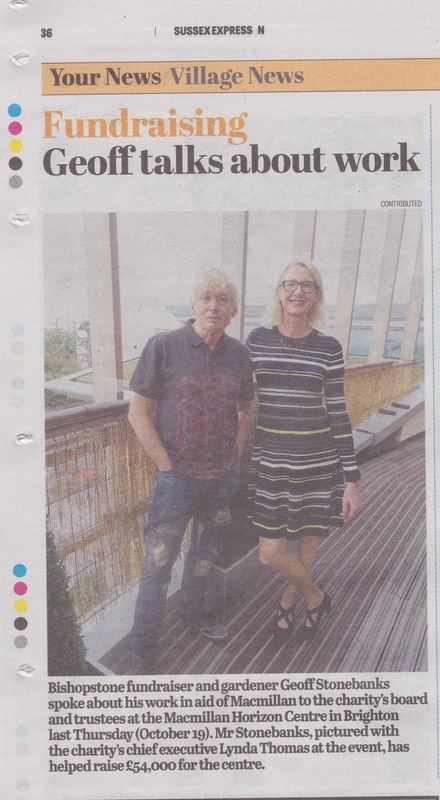 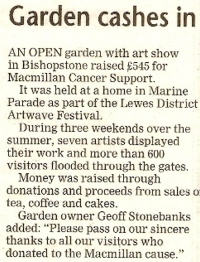 Picture and words in Sussex Express on 7th September. 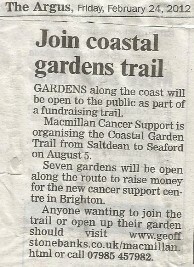 Nice article in both the daily The Argus and free South Coast Argus on Thursday 6th September. 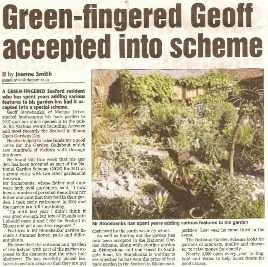 It was also online too. 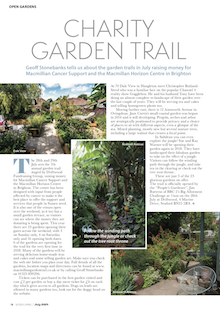 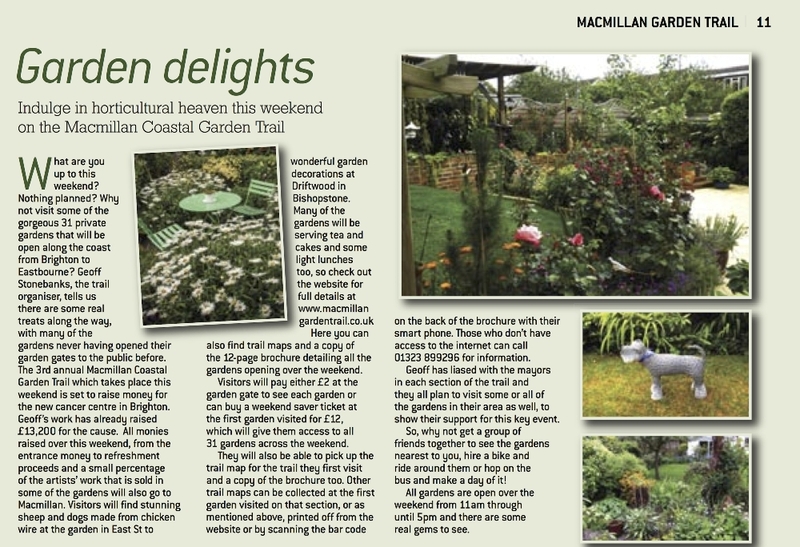 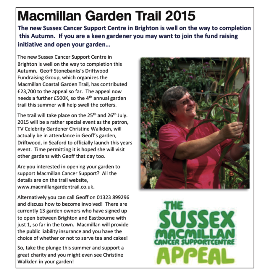 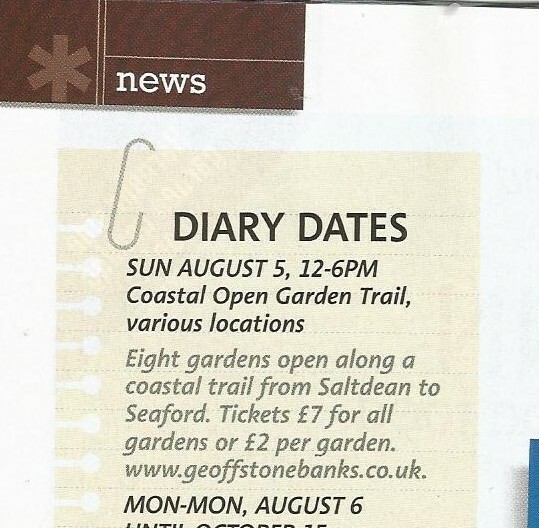 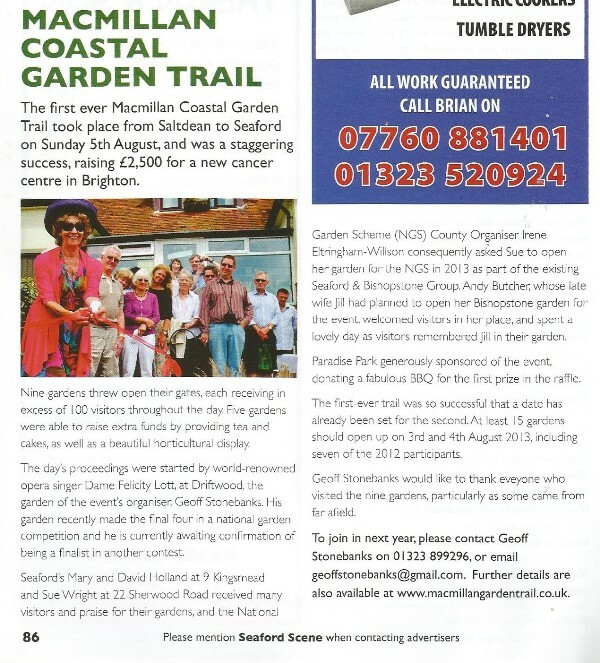 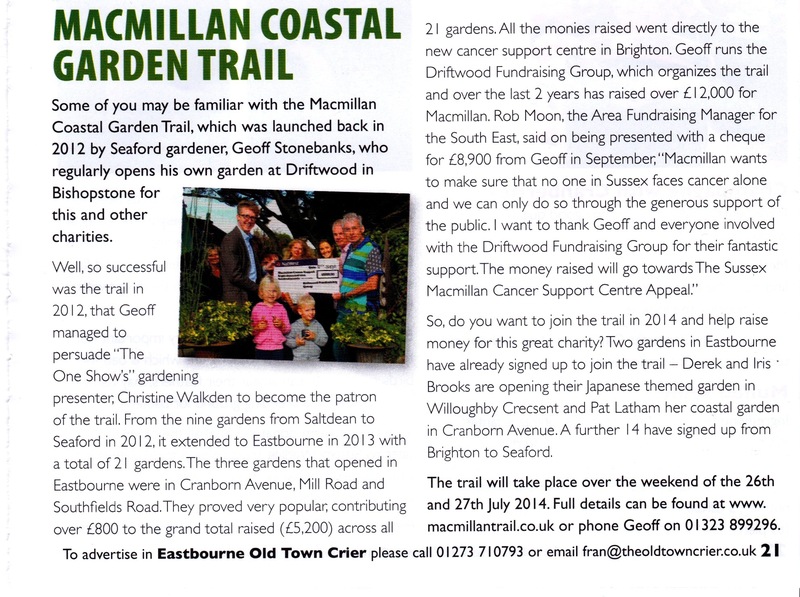 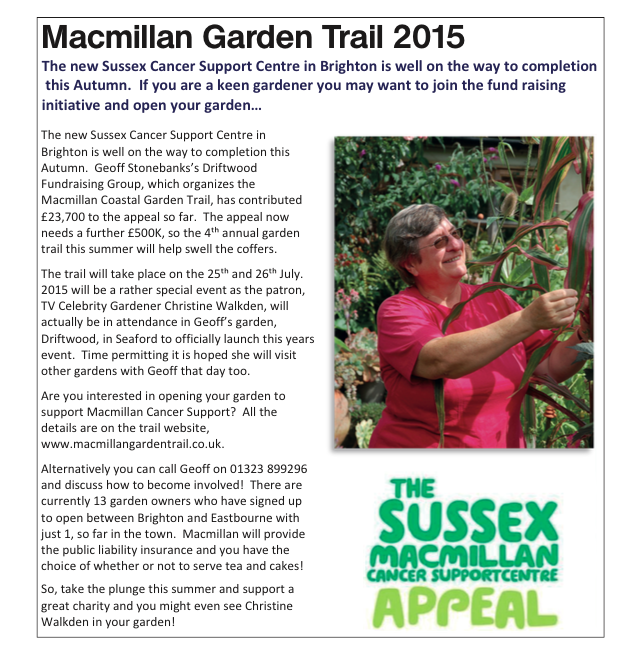 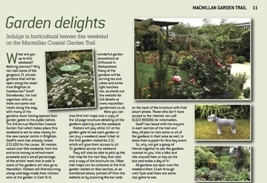 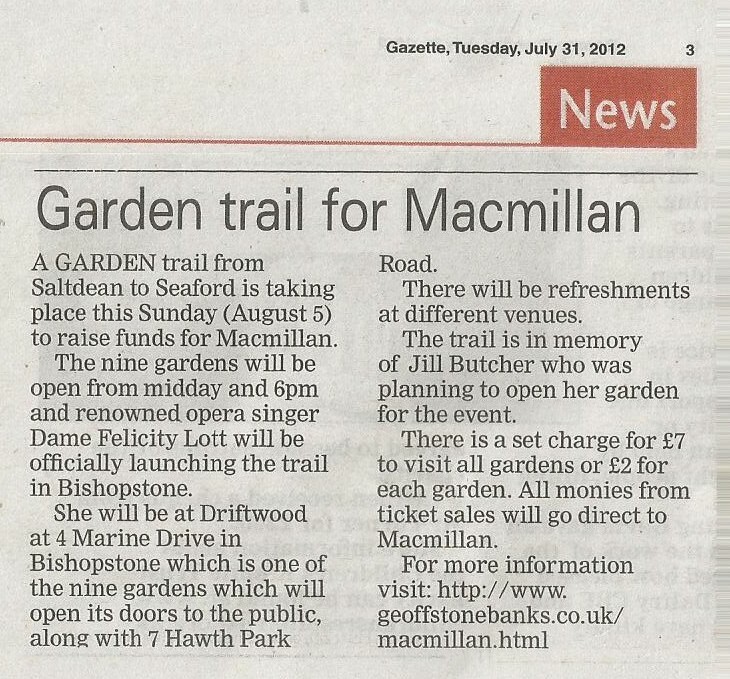 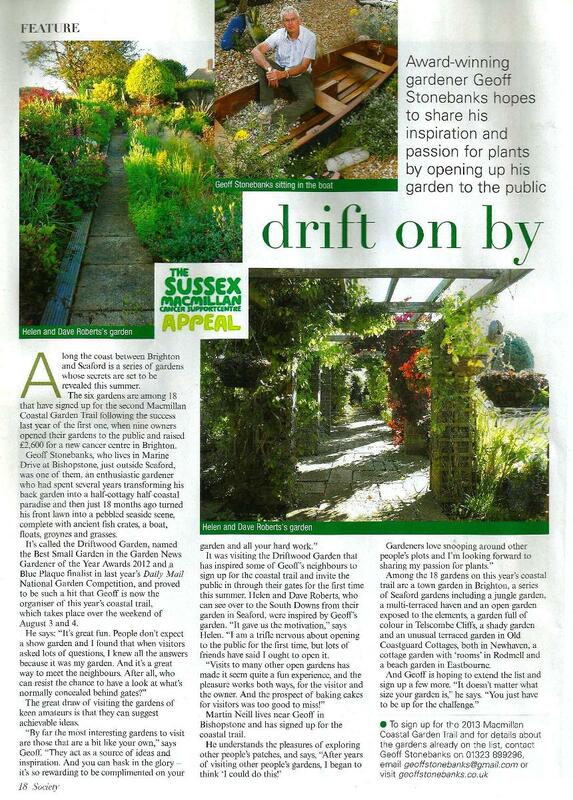 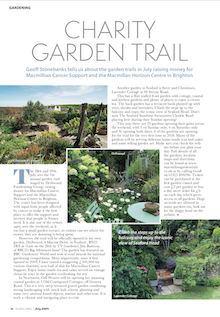 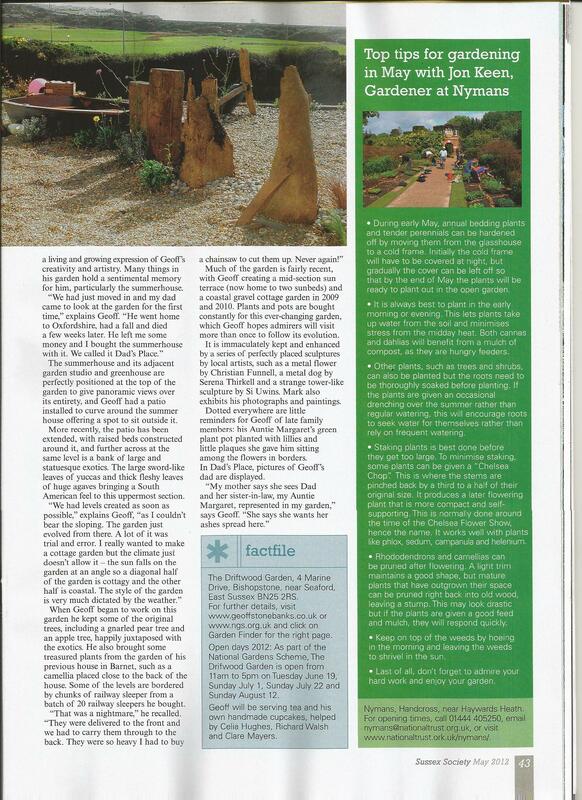 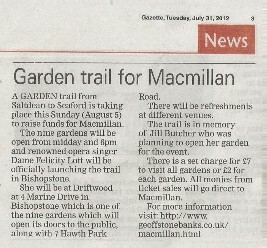 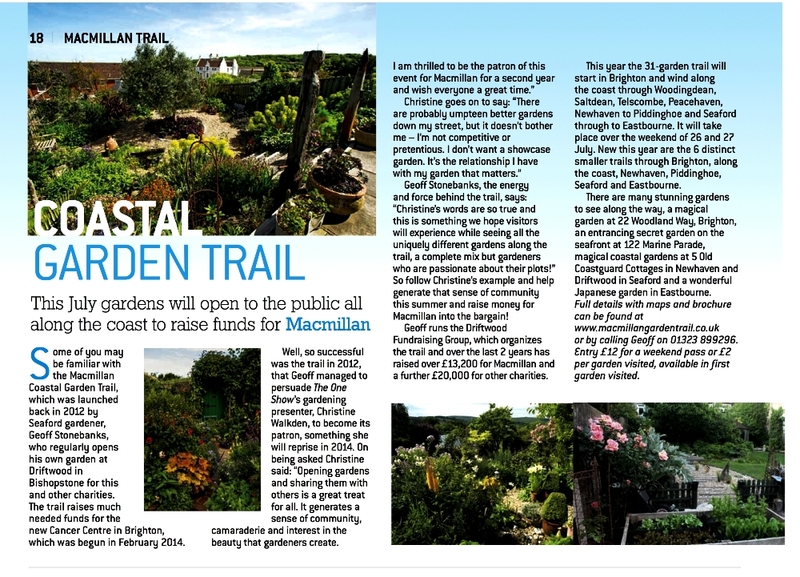 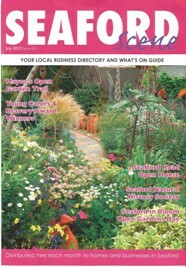 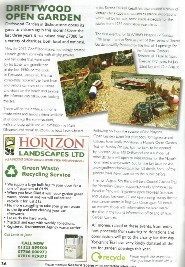 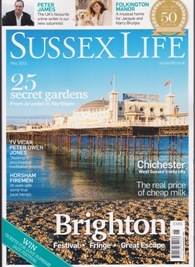 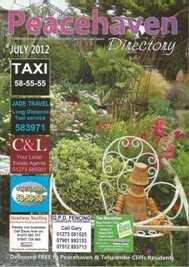 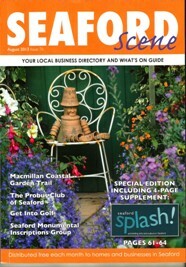 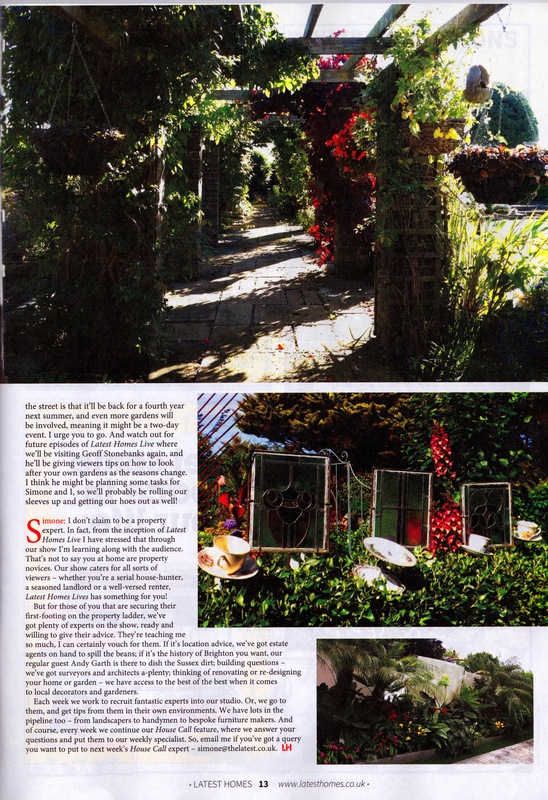 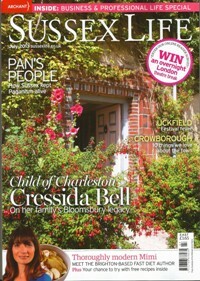 Feature on the Macmillan garden Trail in Seaford Scene in the September issue. 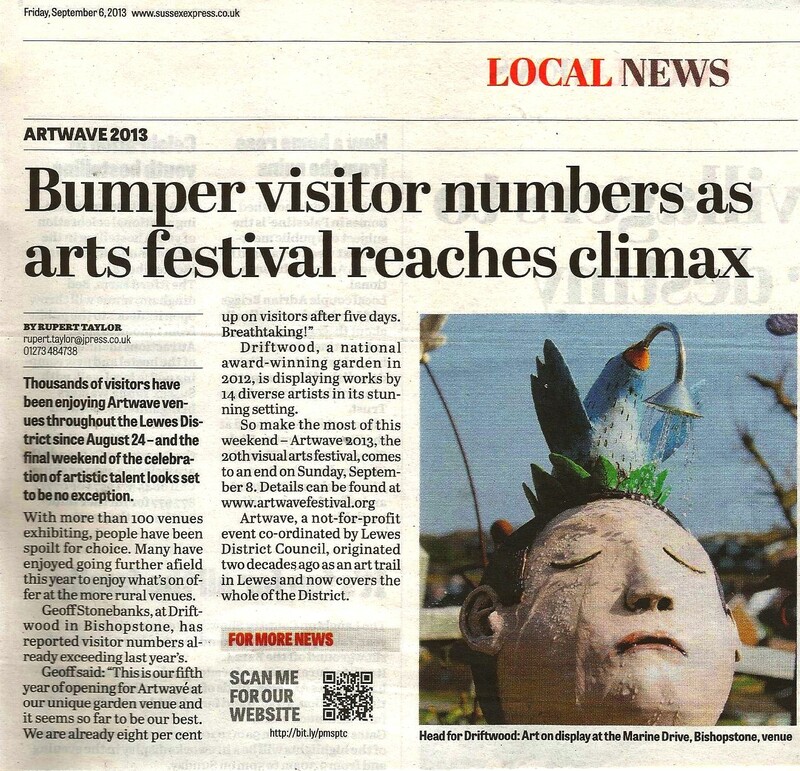 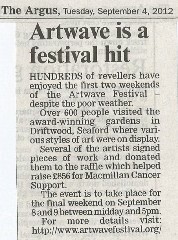 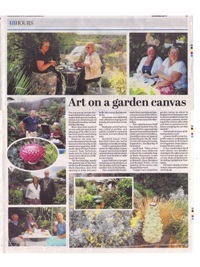 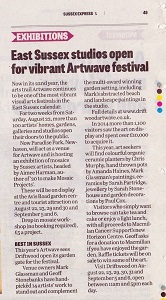 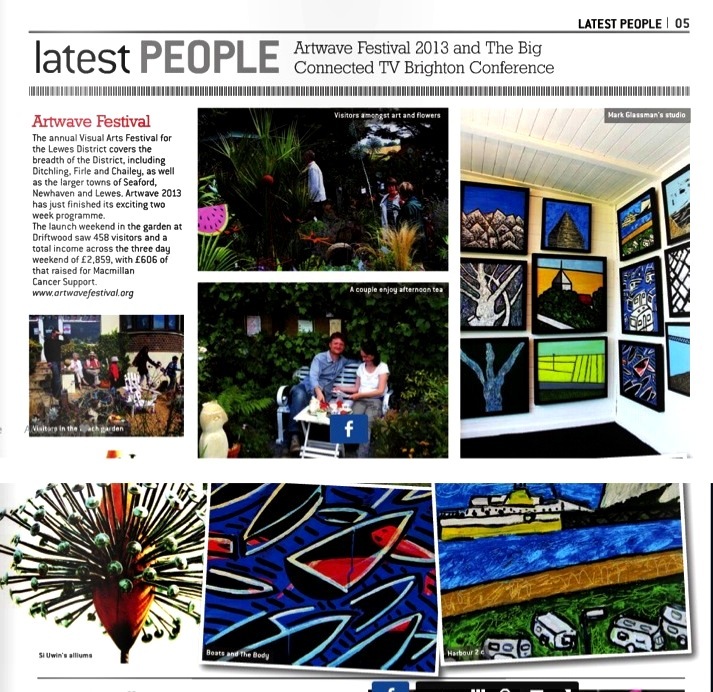 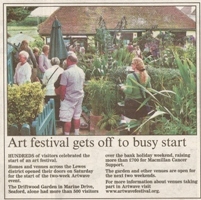 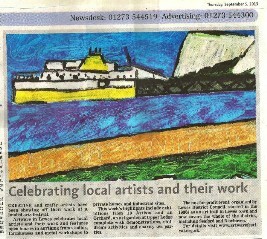 Great half page on Artwave in Sussex Express on 31st August. 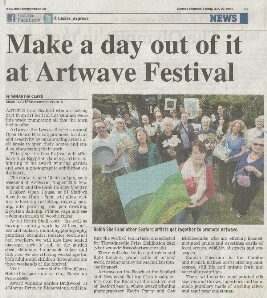 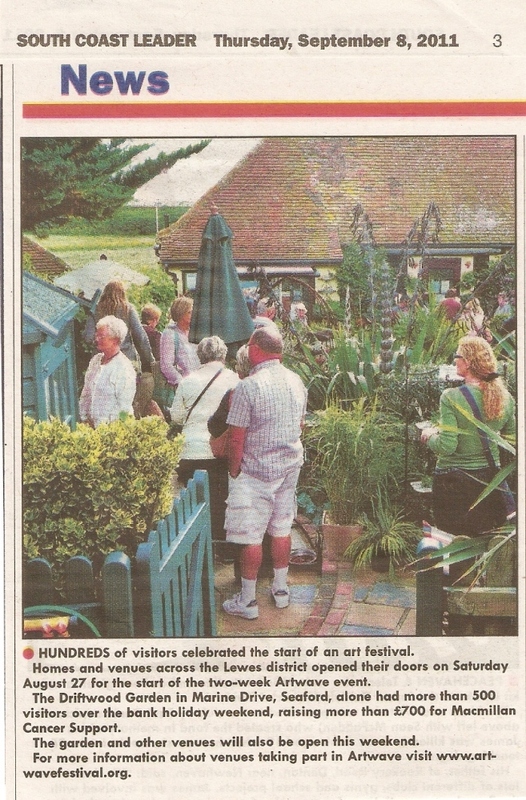 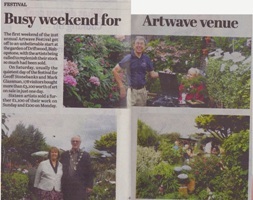 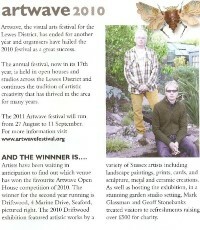 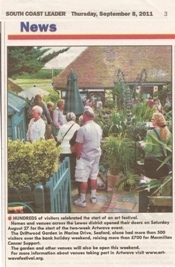 Great piece and photo in South Coast Argus on Thursday 30th about Artwave 2nd weekend. 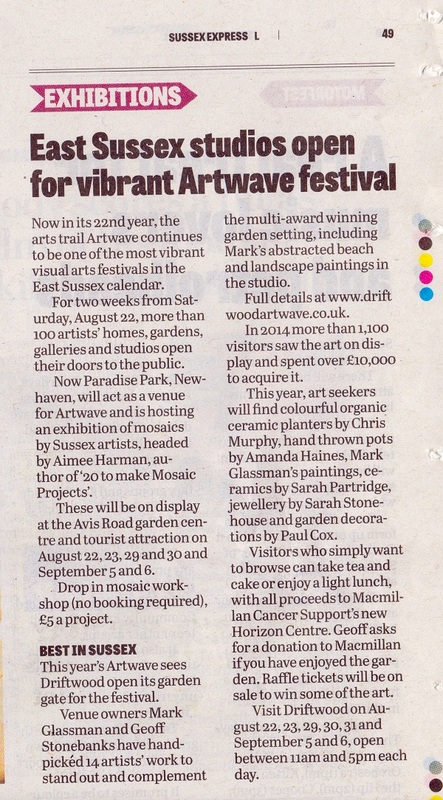 Great article in the daily The Argus in Brighton on 24th August Nice article in South Coast Argus on 23rd August on upcoming Artwave Weekend. 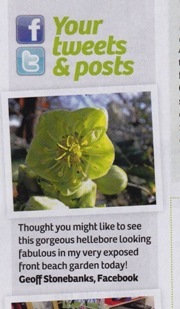 Also online too. 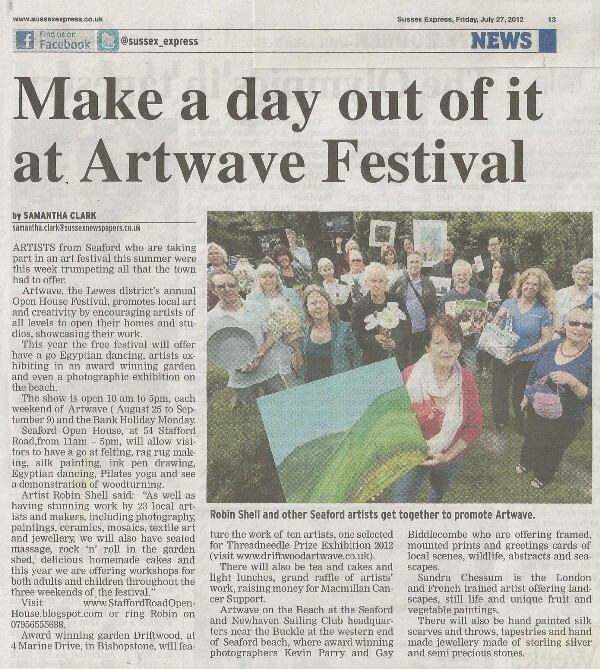 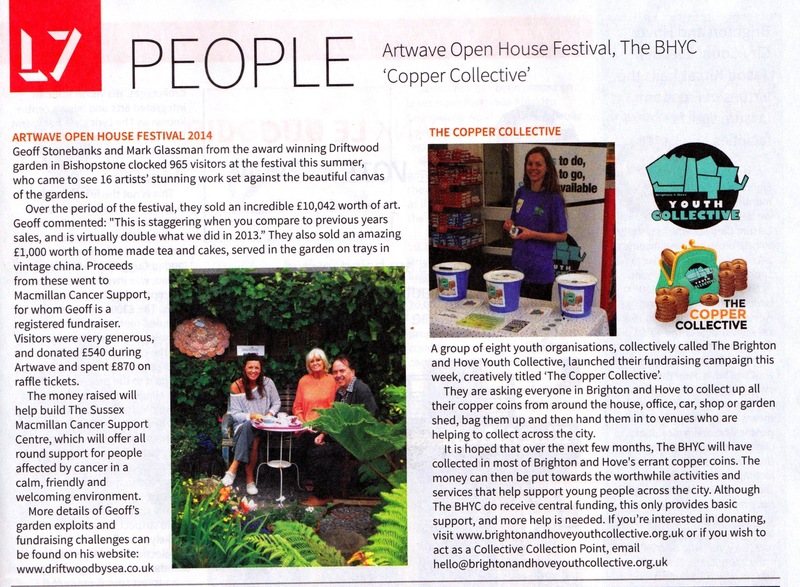 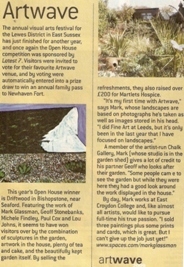 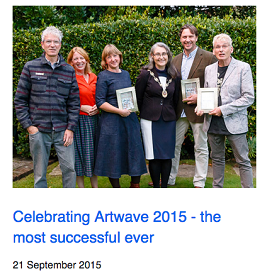 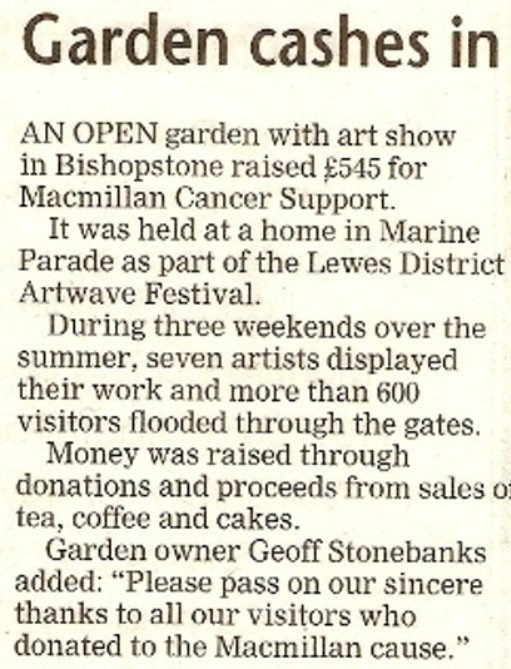 Great short piece in Sussex Express on 17th August on busy open day and Artwave. 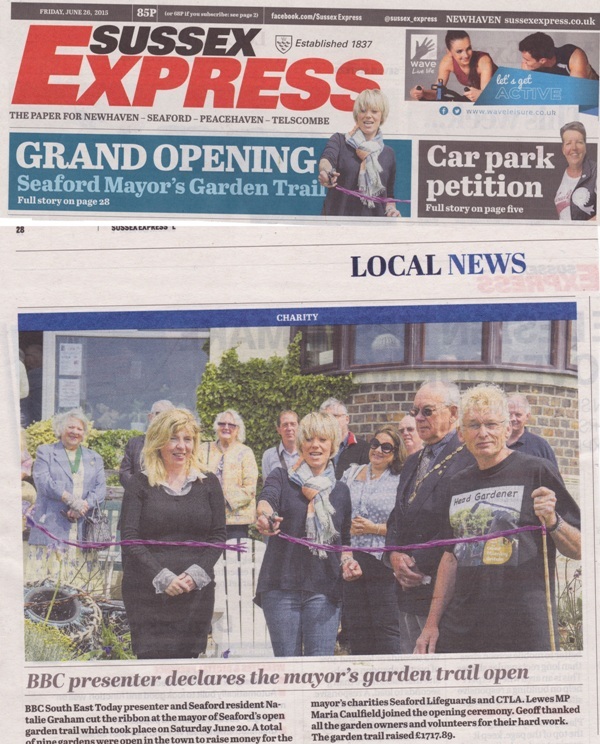 Amazing page 3 article in the Daily Mail on 13th August and online Nice piece in the South Coast Argus on 9th August about our record breaking opening on 5th and here online Great short piece in Sussex Express on 3rd August with reference on front page. 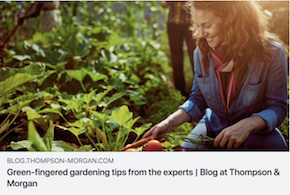 Comments from me included in a blog of experts comments by Thompson and Morgan. 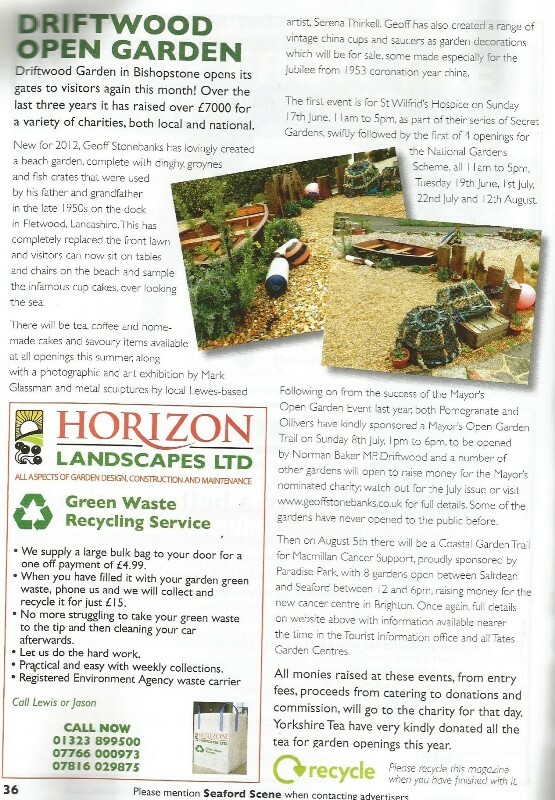 Read them here. 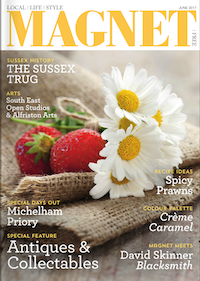 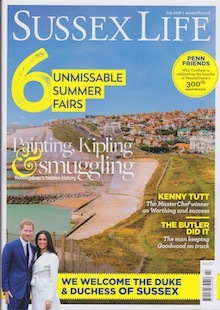 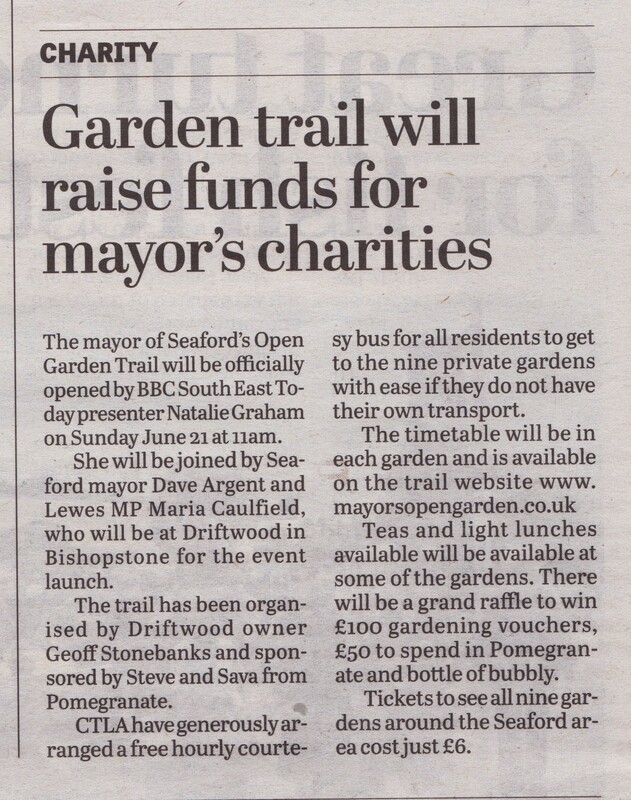 Great feature in August issue of Seaford Scene on the Mayor's trail 2 on line articles with Sussex Express and Brighton & Hove Independent on 27th July about Macmillan Trail. 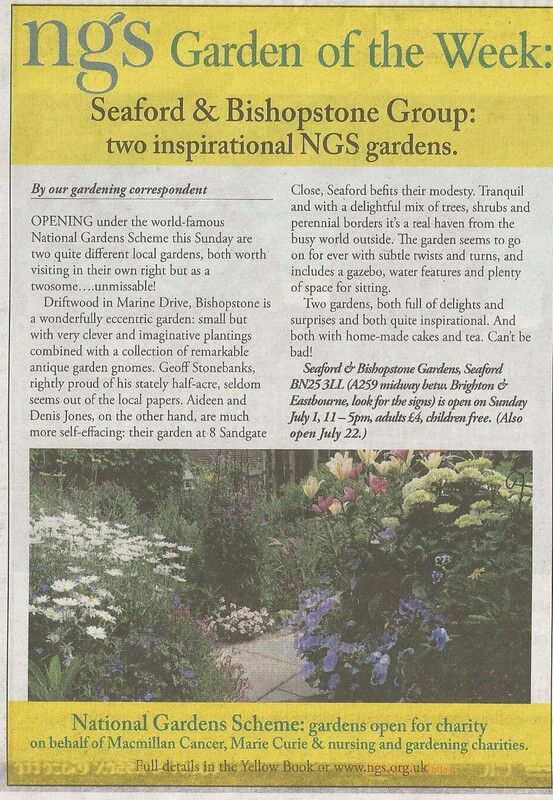 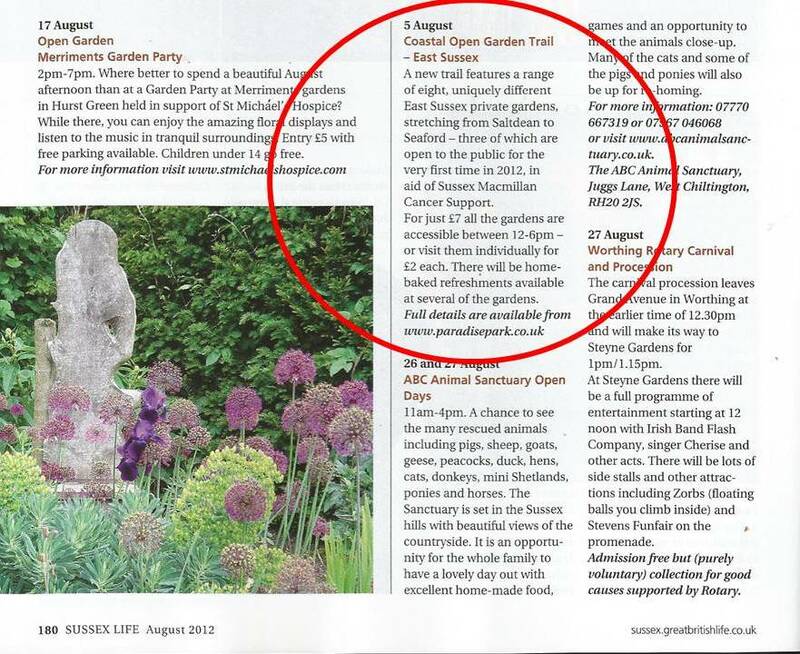 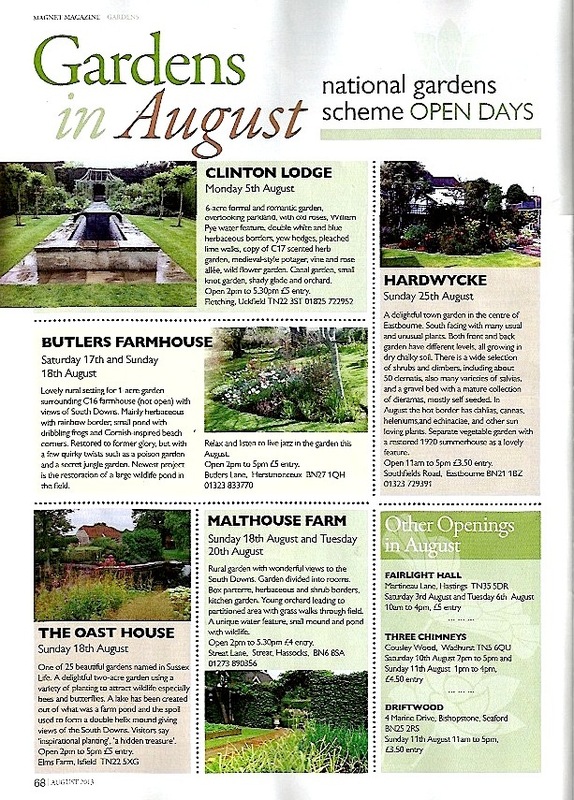 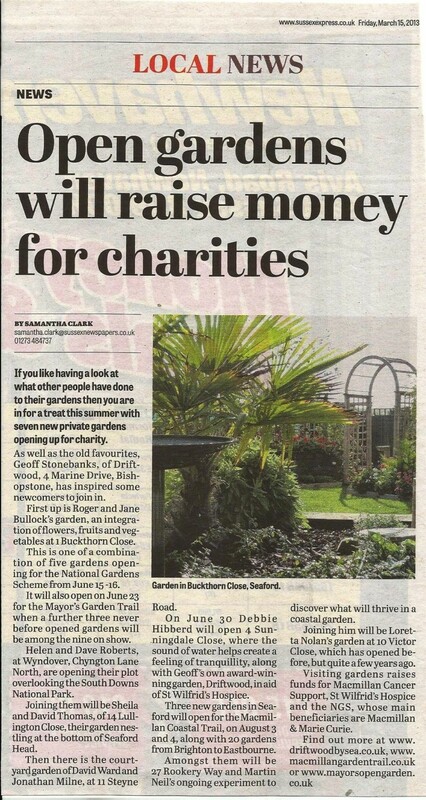 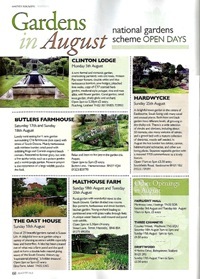 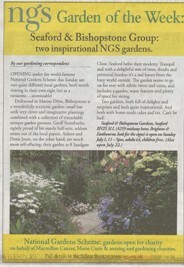 Great diary mention in the Sunday Express on 22nd July for NGS opening. 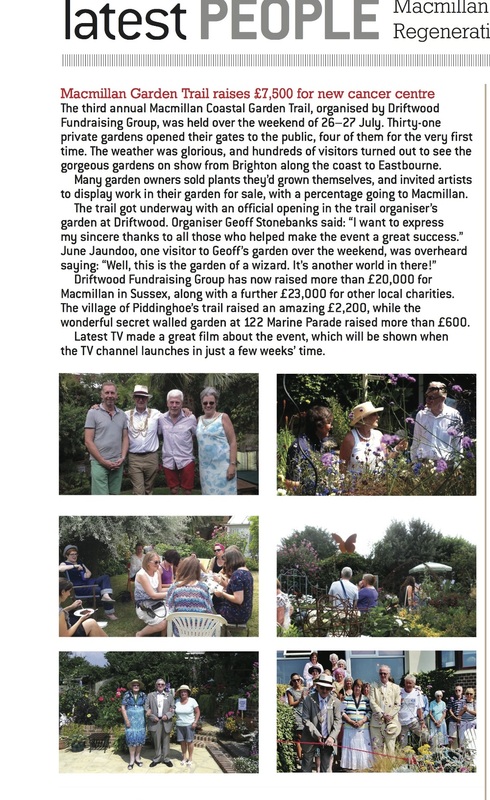 Great image and listing in August issue of Women's Weekly Gardening Magazine for Macmillan Garden Trail Great mention on front page of Sussex Express on 13th July with nice feature inside. 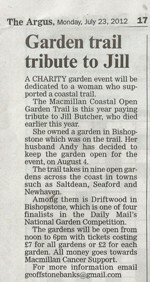 Great piece in the daily Argus on Friday 13th July also on line here. 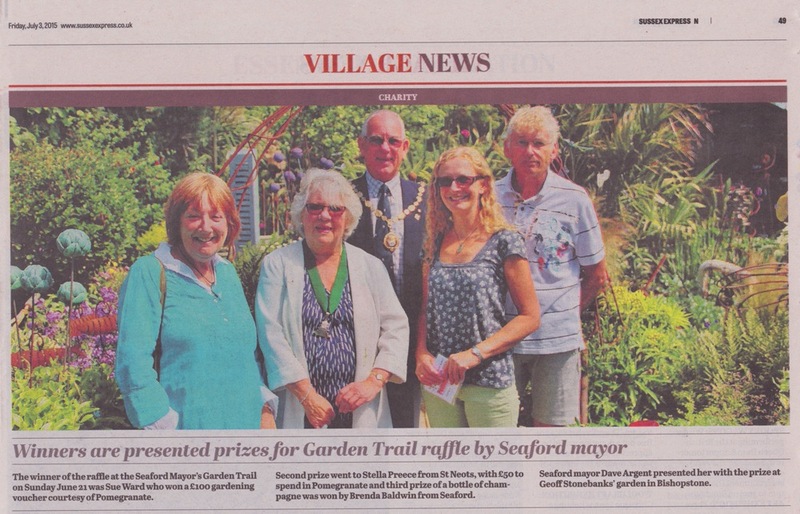 Half page in South Coast Argus on 12th July Nice article posted by Seaford Town Council in Seaford Scene on Mayor's Awards presented last May. 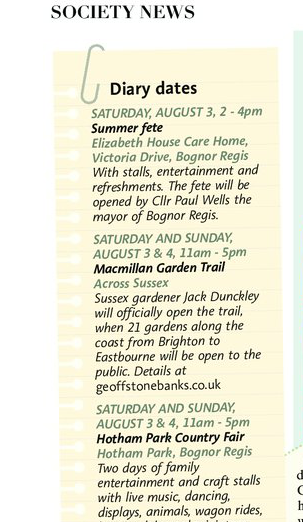 Lovely whole page on Macmillan Garden Trail in July issue of Sussex Living West Lovely piece in Lewes & S Coast Argus on 28th June and also on line here. 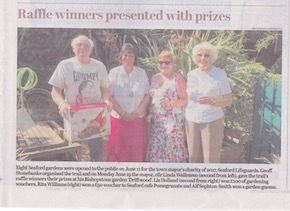 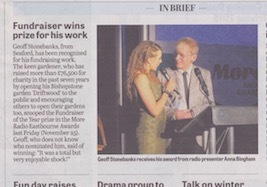 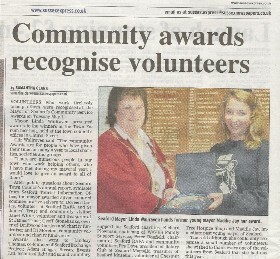 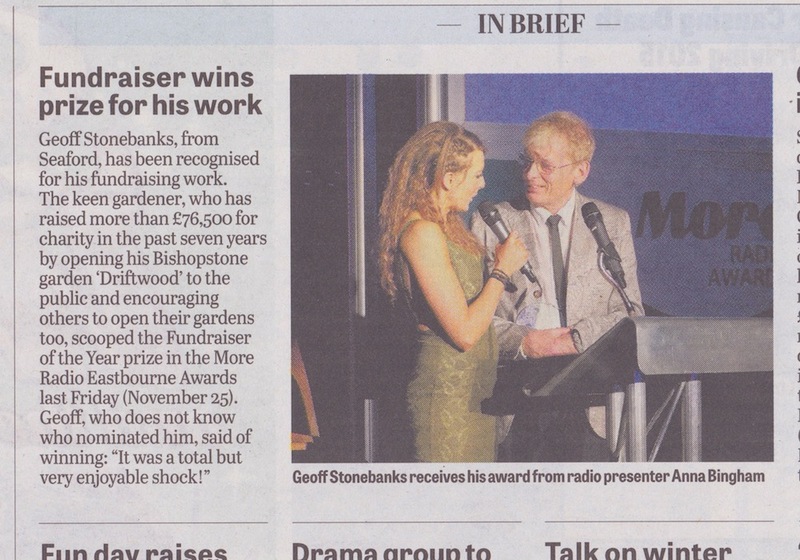 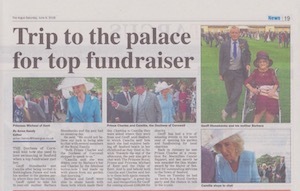 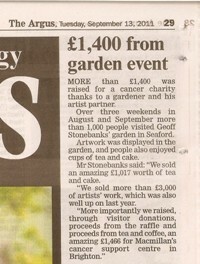 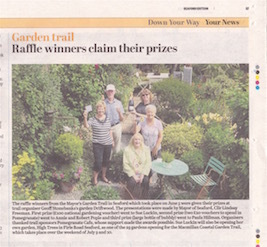 Nice piece in Sussex Express on 22nd June on raffle winners. 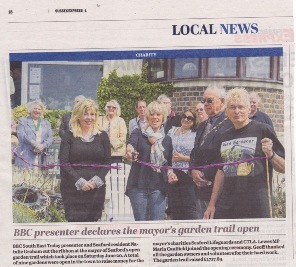 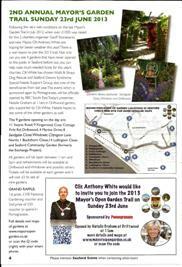 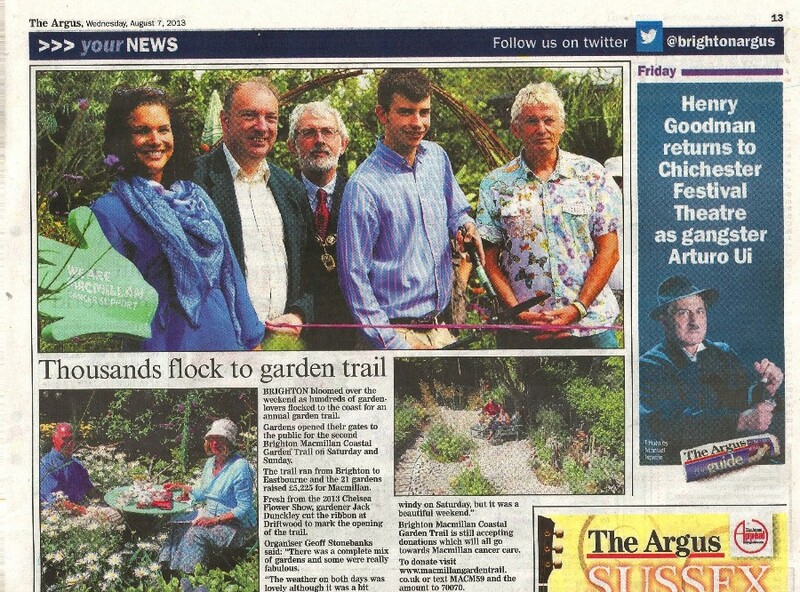 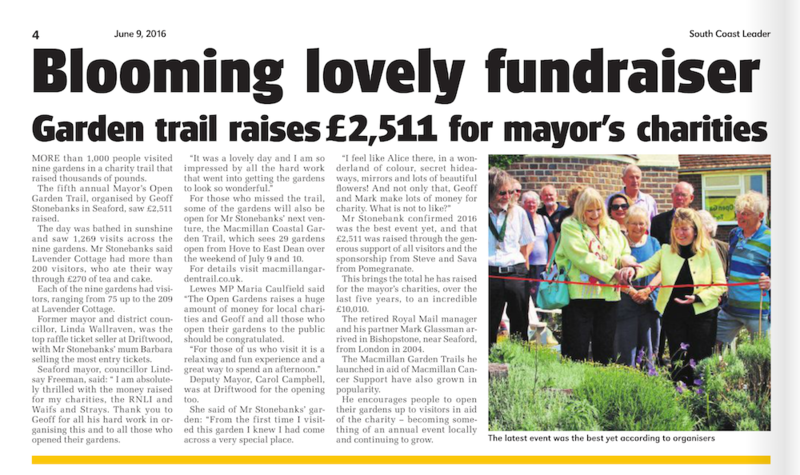 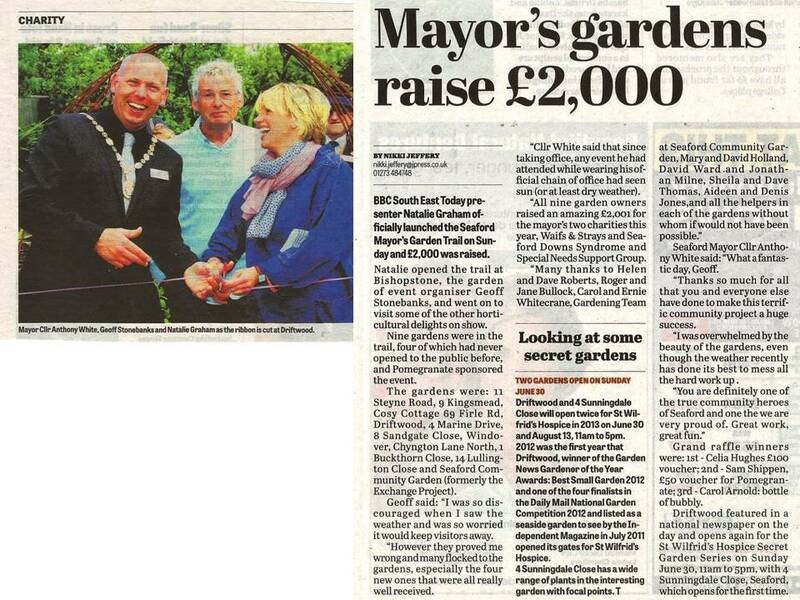 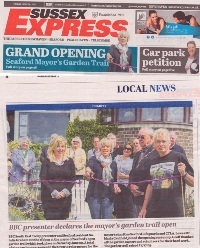 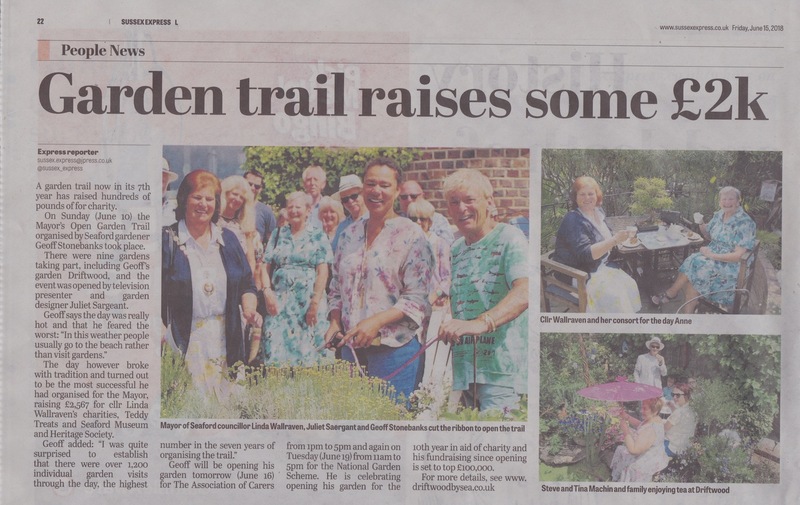 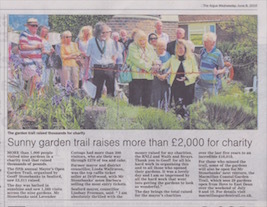 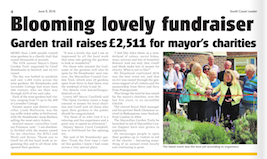 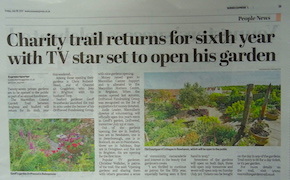 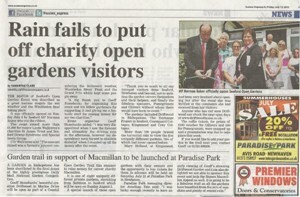 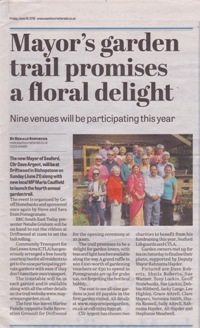 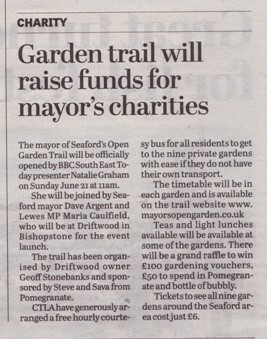 Coverage of the Mayor's Trail in Sussex Express 15th June. 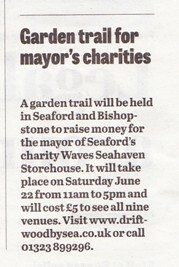 Half page in South Coast Argus on 14th June about Mayor's Trail Nice piece in The South Coast Argus on 14th June. 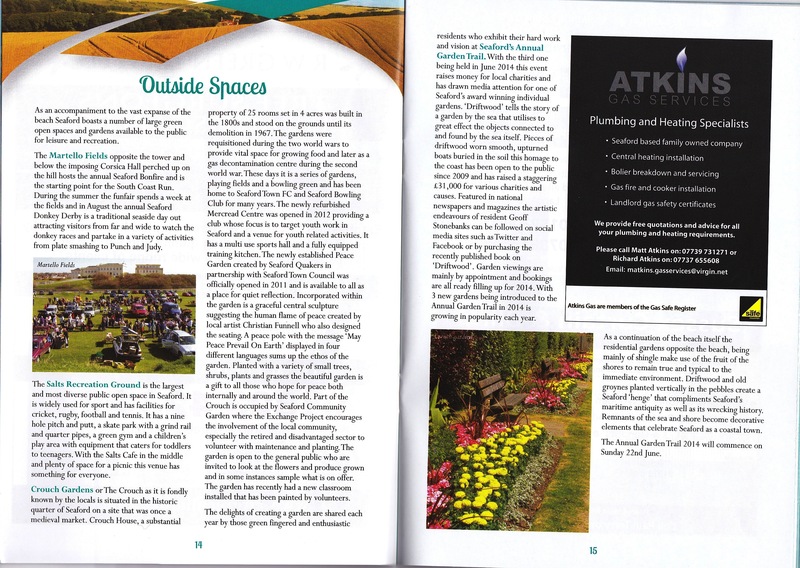 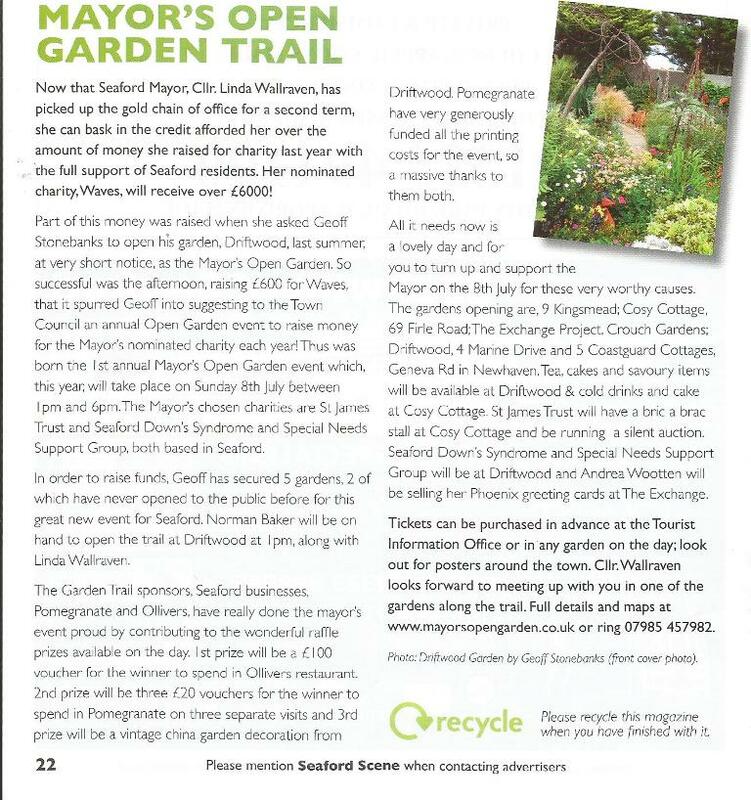 Feature on Mayor's Garden Trail in Seaford Scene June issue Great short session on Seahaven FM to promote the garden Summer Season, 26th May. 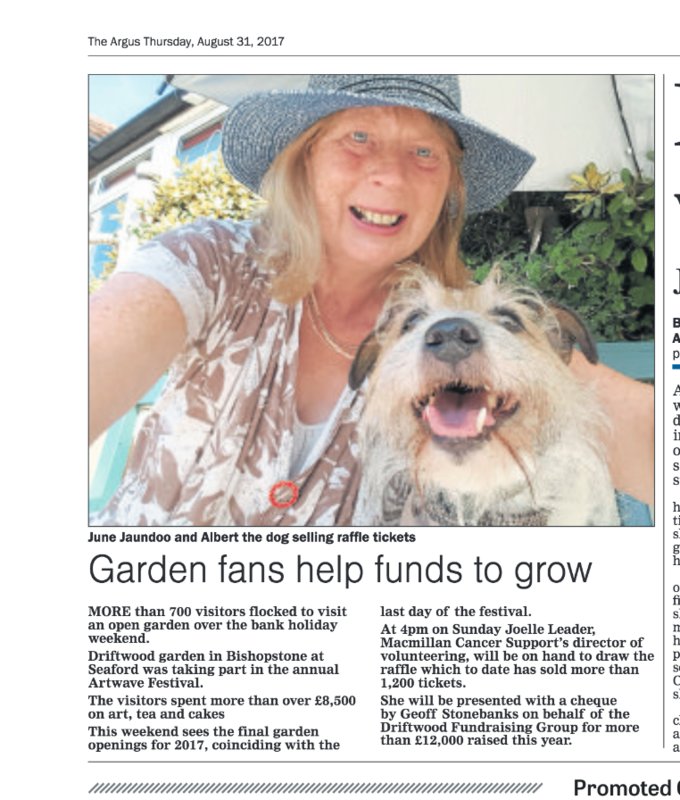 Nice feature in The South Coast Argus on 24th May also on line here. 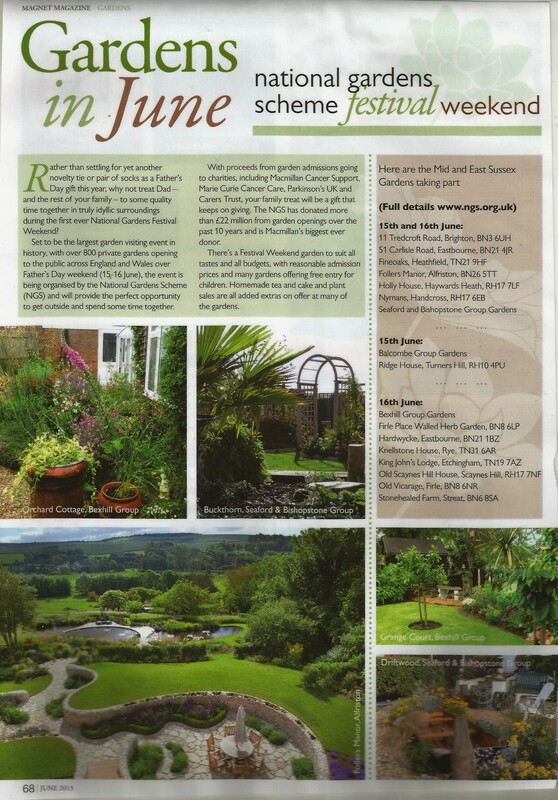 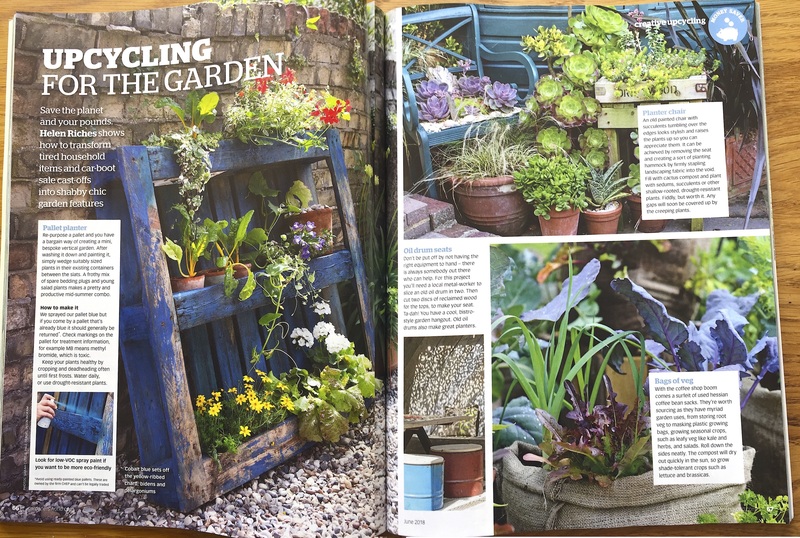 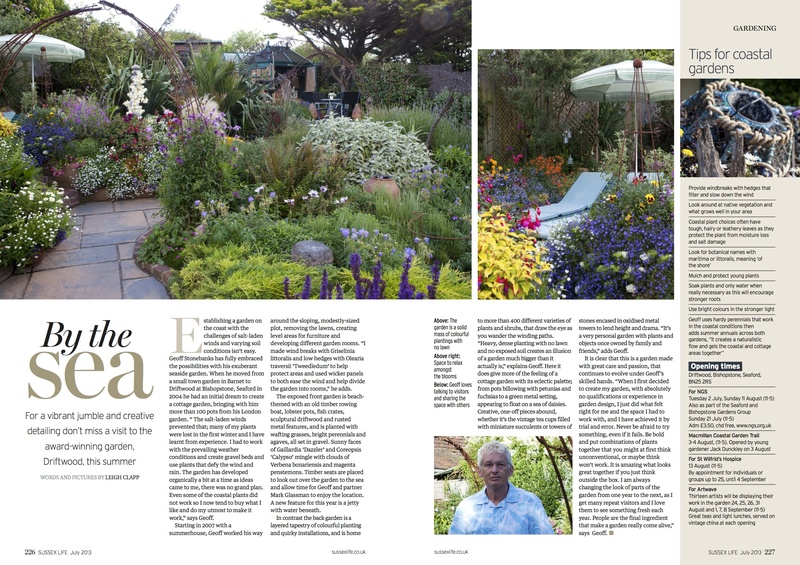 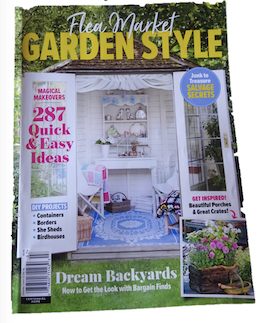 Image (top right) of garden in feature on Upcycling: June 2018 Nice news item in the April issue of Sussex Life Magazine Great 6-page feature in an american gardening magazine. 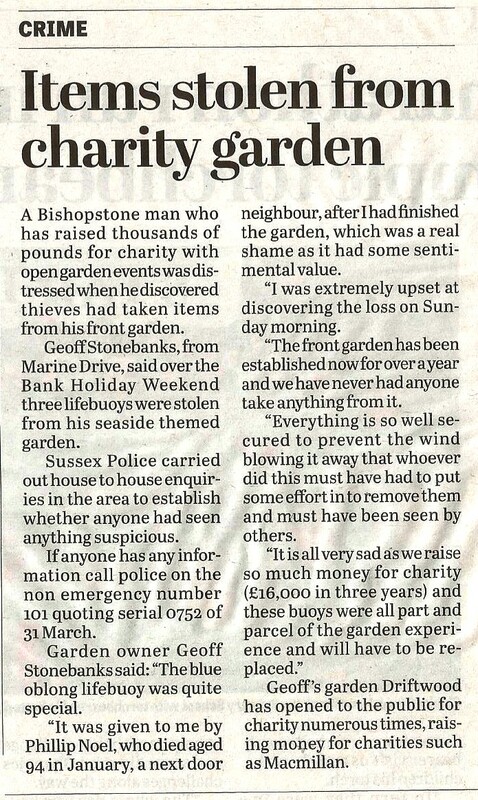 You can read the whole piece here. 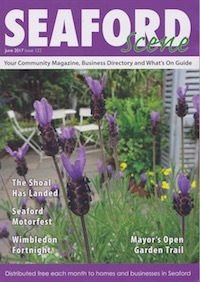 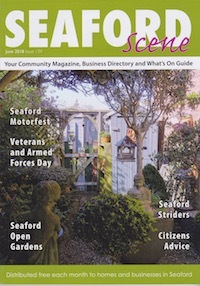 Nice article in April issue of Seaford Scene. 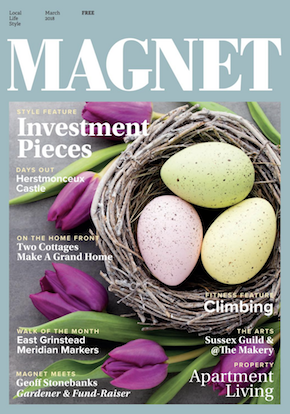 Lovely feature in Magnet Magazine, Magnet meets Geoff Stonebanks: 5th March 2018, on line too. 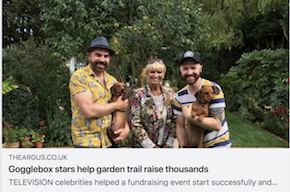 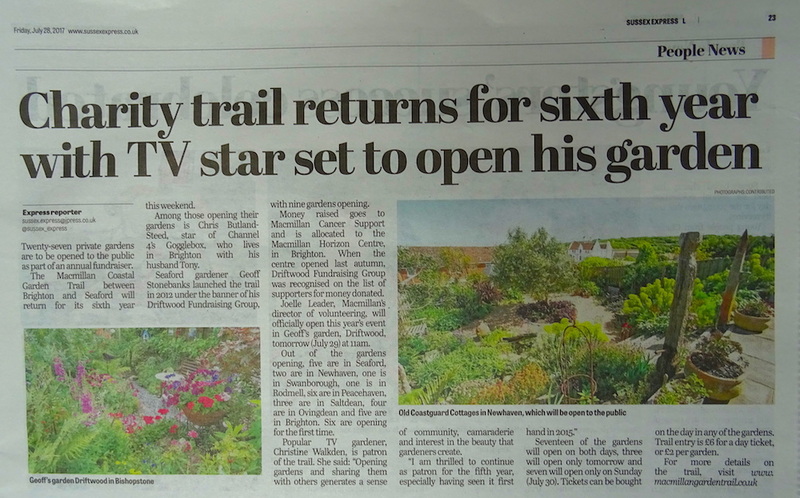 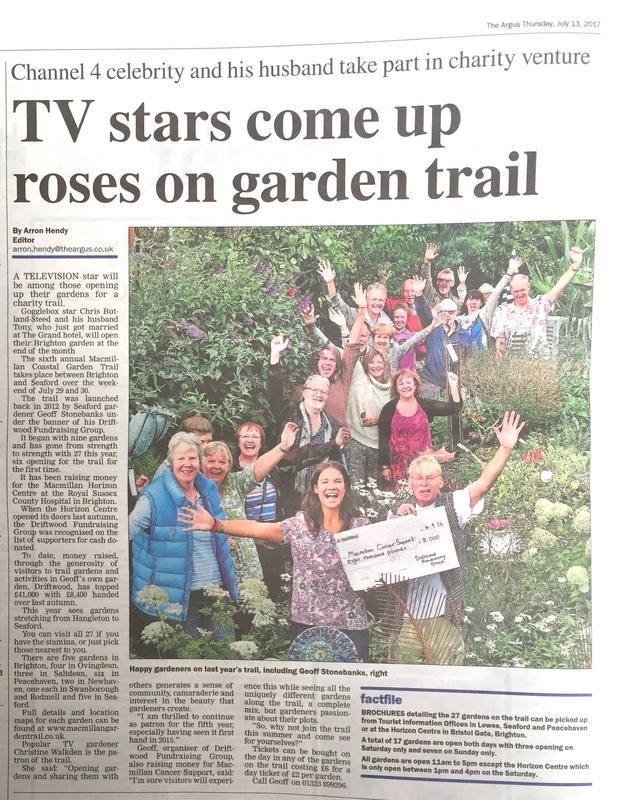 Great article in The Argus on TV celebrities for garden trails: 5th March 2018. 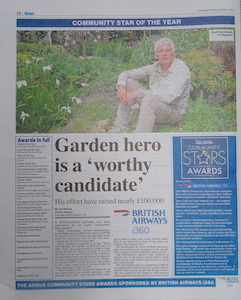 Feature also appeared on line too. 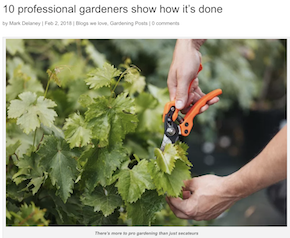 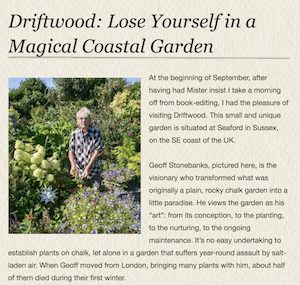 Blog by Thompson & Morgan on 10 great gardening blogs, Driftwood being one of them. 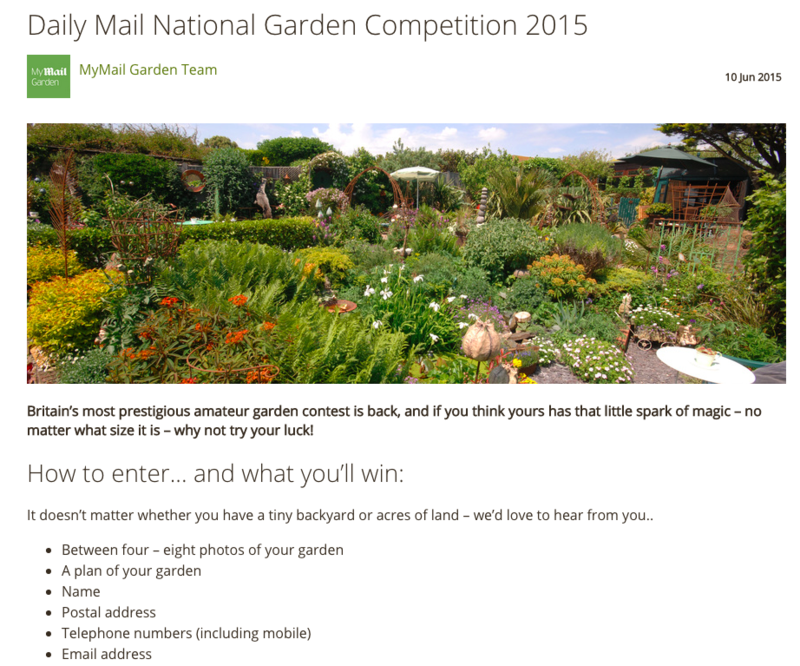 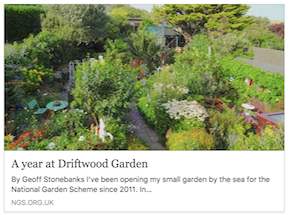 Post by National Garden Scheme on a year at Driftwood in 12 images. 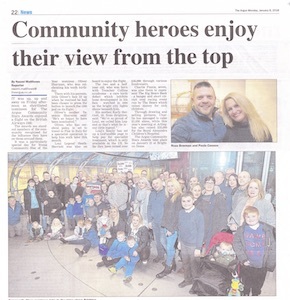 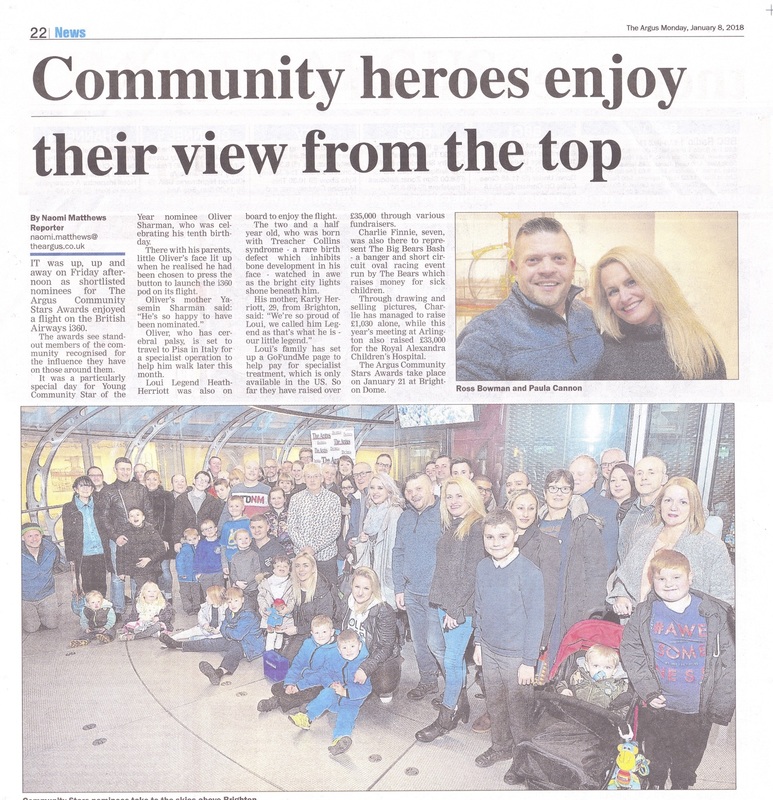 9th January 2018 Feature in the Argus on 8th January about Community Stars nominees i360 flight of 5th January. 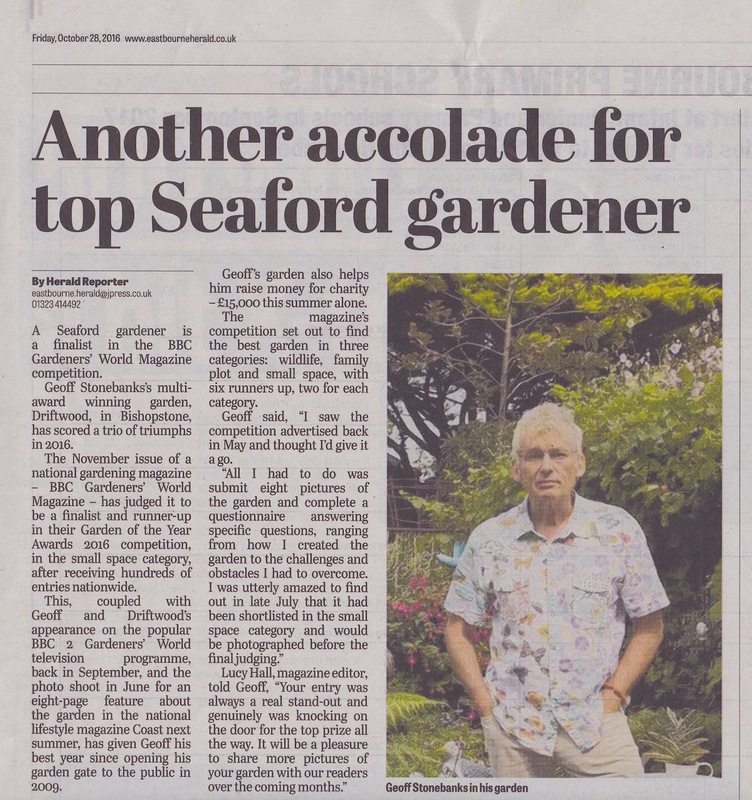 Nice article in South Coast Argus on 4th January 2018 12 minute interview on Talk Radio Europe in Spain about the Garden and Christmas decorations: 3rd January 2018 Nice piece in January issue of Seaford Scene. 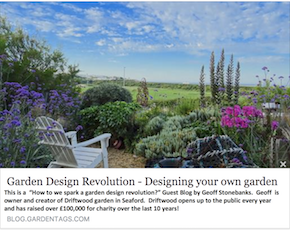 Blog on garden design for Garden Tags: 9th November On line article on the National Garden Scheme web site, 2nd November. 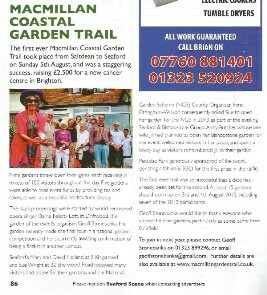 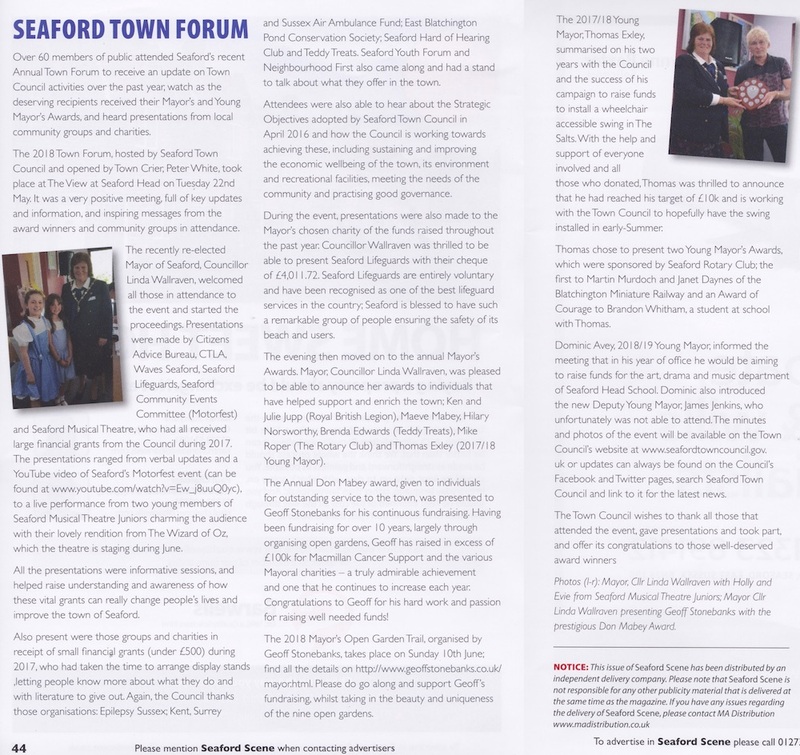 Article in Seaford Scene November issue. Bakker posted a blog I had written about their plants this Summer: 23rd October Whole page in The Argus on 7th October outlining nomination for Community Stars Awards Lovely photo and words in Sussex Express 29th September for Volunteers' Tea Party. 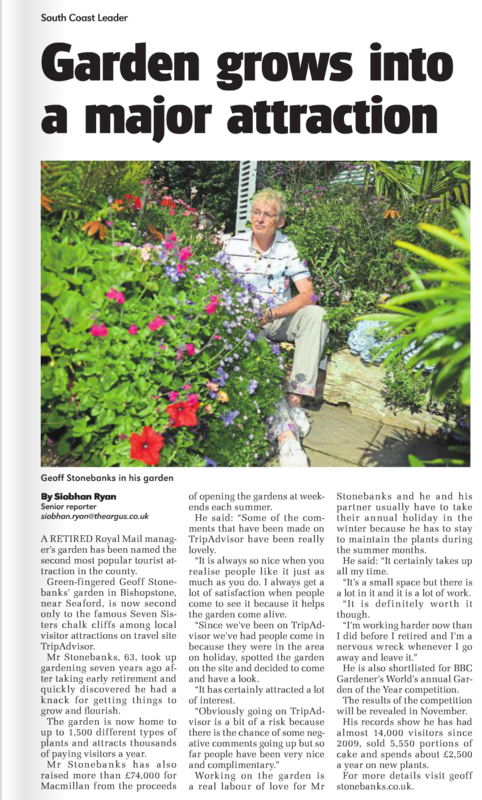 Check out the "60 seconds with" me in The Argus on 11th August. 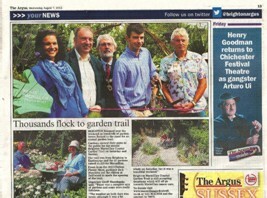 Great article in the Argus Lewes & S Coast on 31st August! 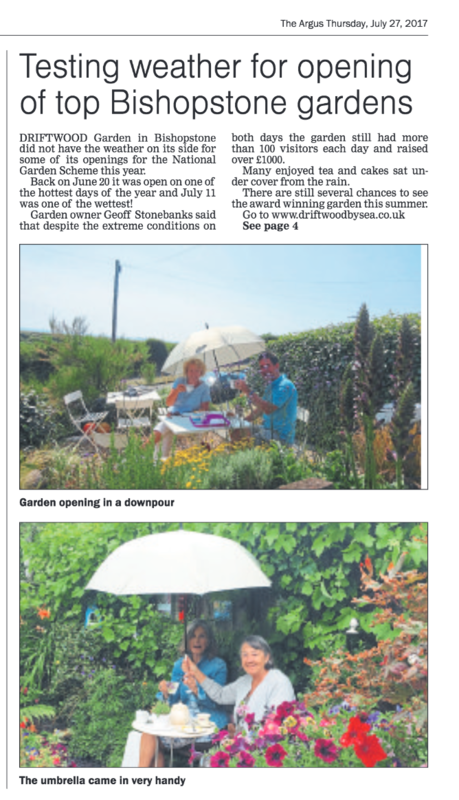 Great feature in the The Argus daily paper on Bank Holiday Monday. 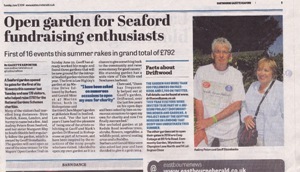 Nice coverage in Sussex Express on 28th July and on line as well. 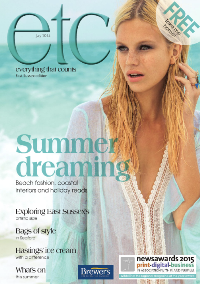 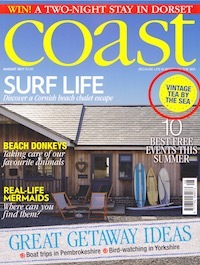 Fabulous 8-page feature in August issue of Coast Magazine. 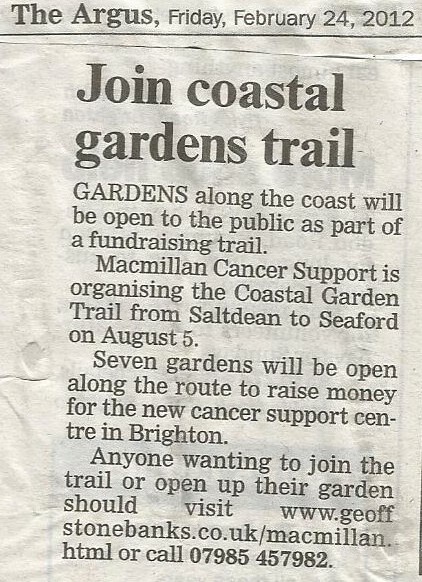 Article on Macmillan Garden Trail in Lewes & South Coast Argus 27th July 2017. 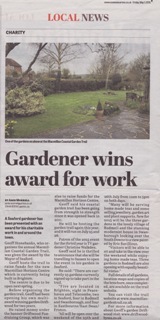 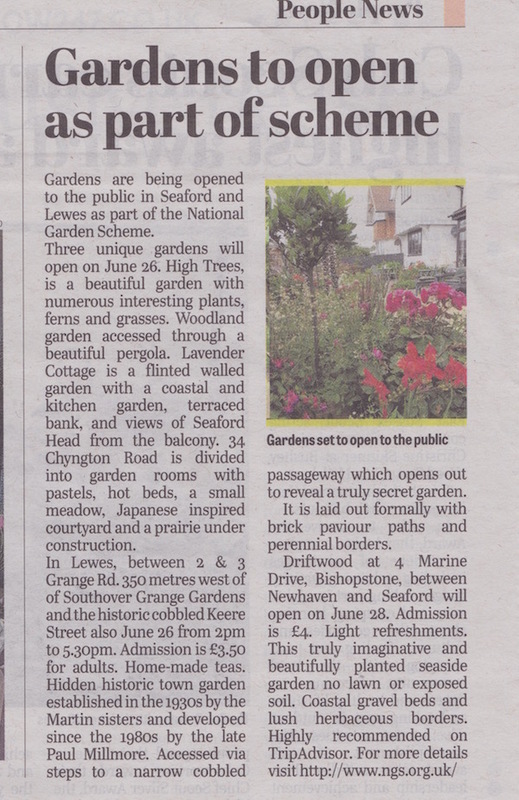 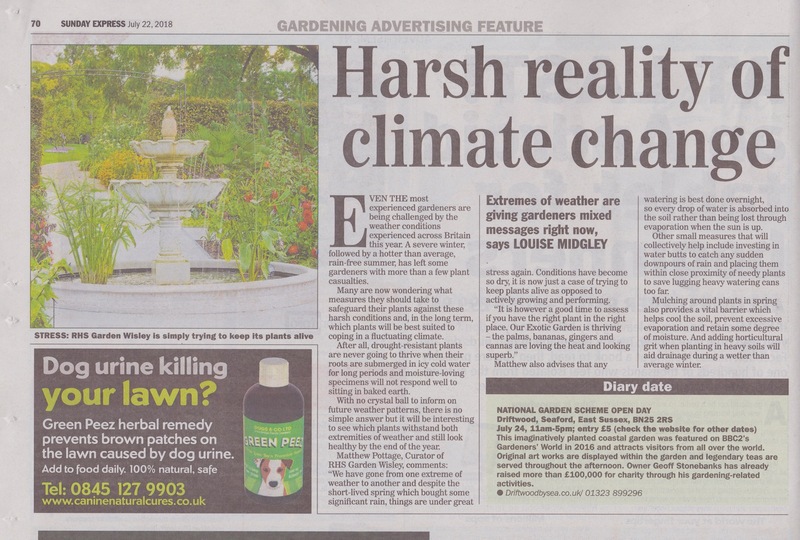 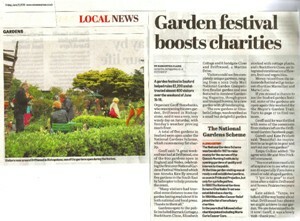 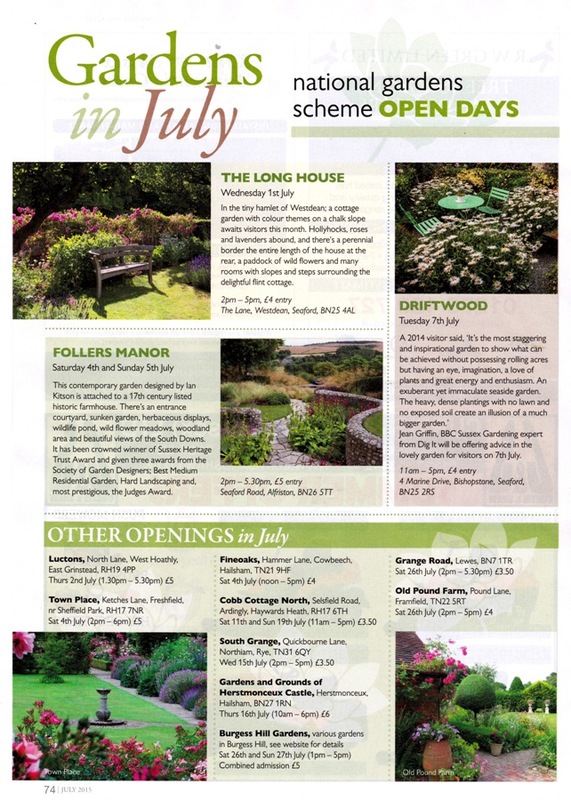 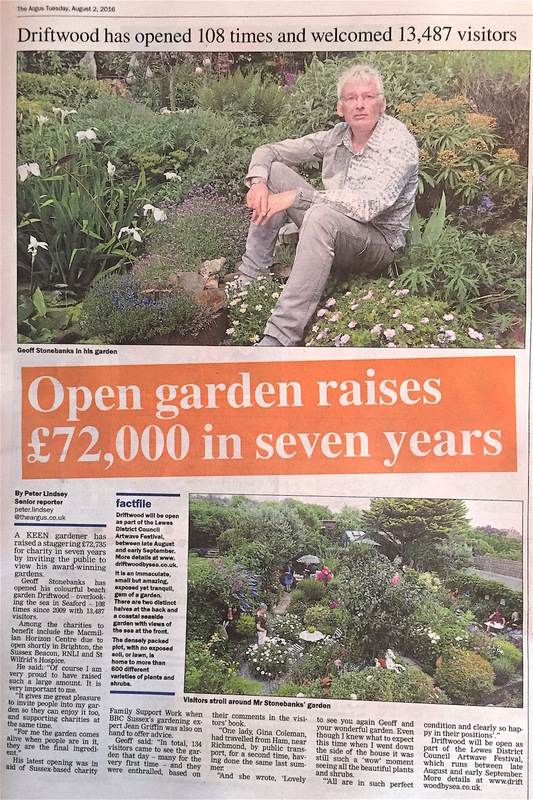 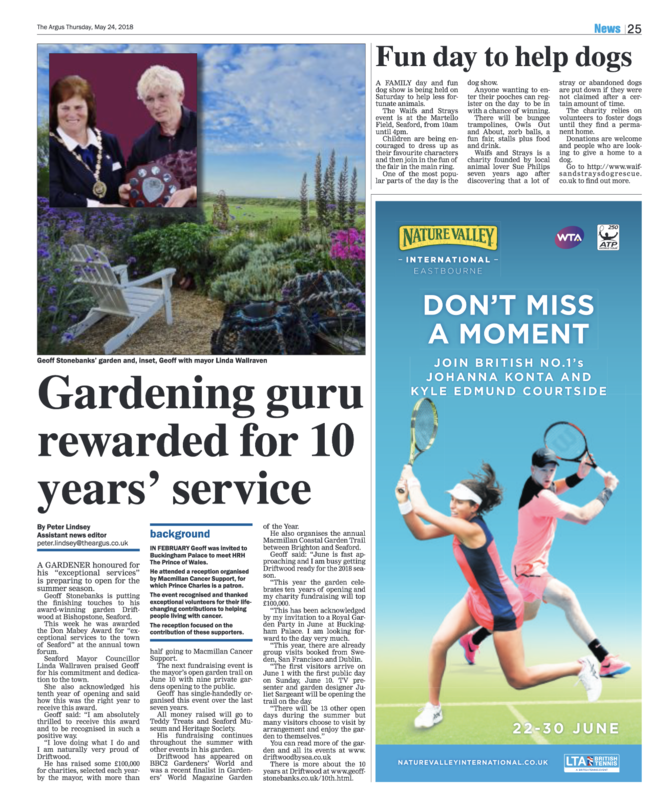 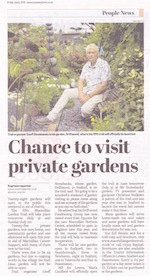 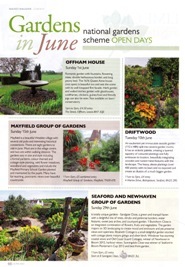 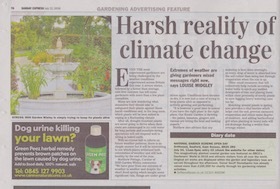 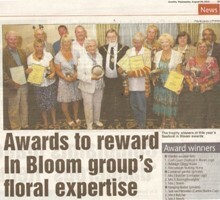 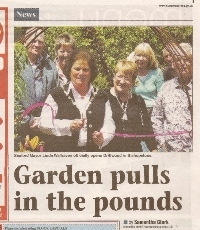 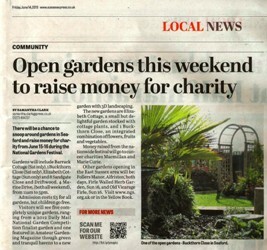 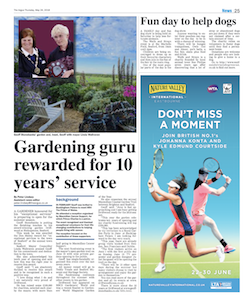 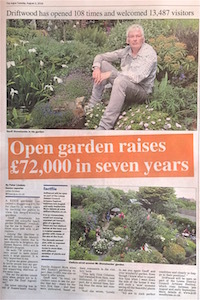 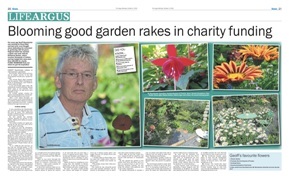 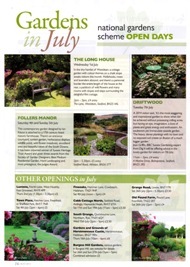 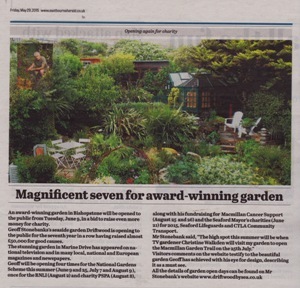 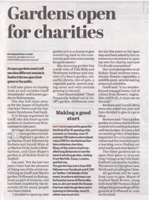 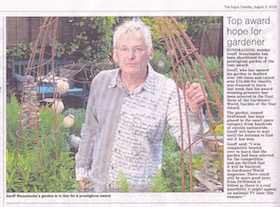 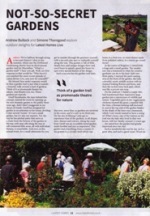 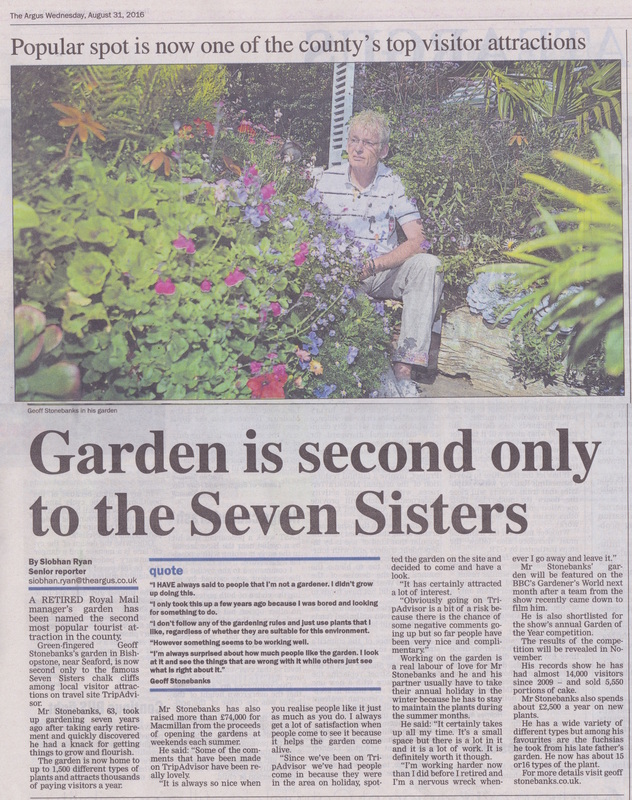 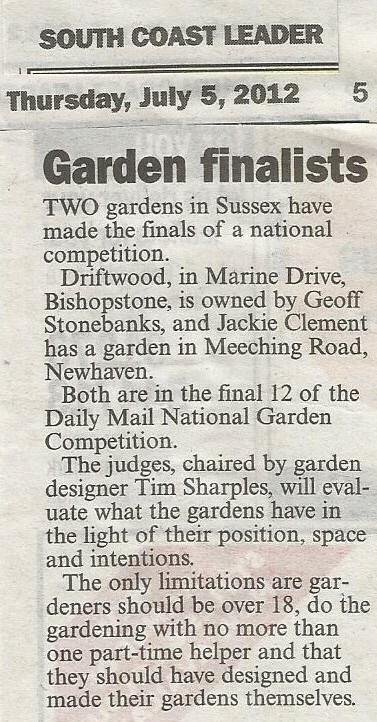 Piece on National Garden Scheme openings in Lewes & South Coast Argus 27th July. 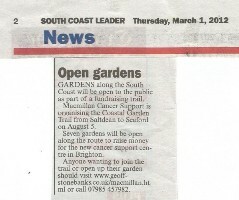 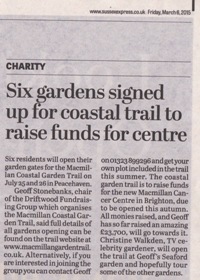 Macmillan Trail appeared in the Lewes & South Coast Argus for a second week too! 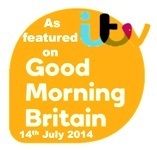 20th July. 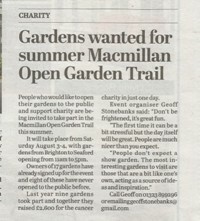 Article on Macmillan Garden Trail in Lewes & South Coast Argus 13th July 2017. 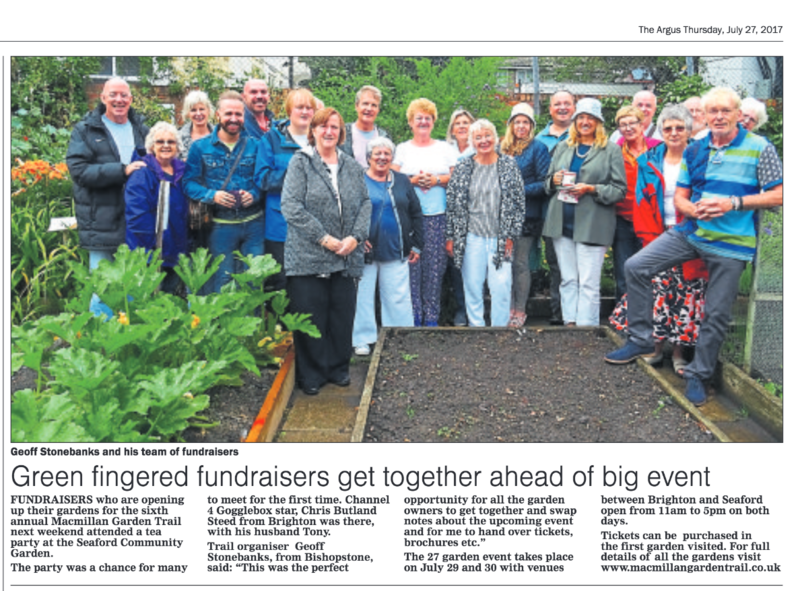 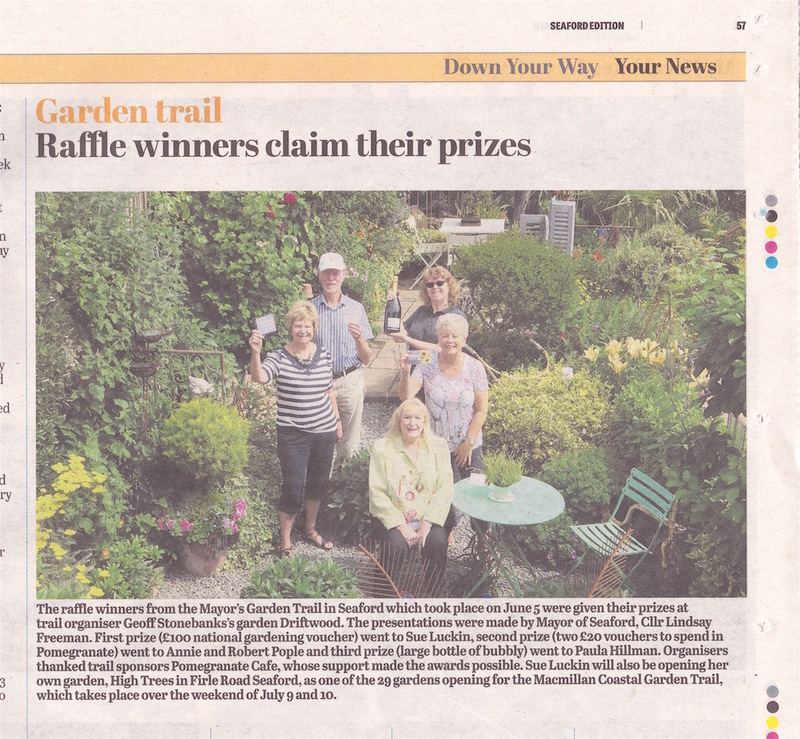 Coverage of Macmillan Garden Trail in The Argus, 13th July 2017 Picture of raffle winners in Sussex Express: 30th June. 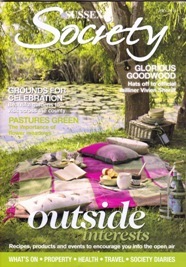 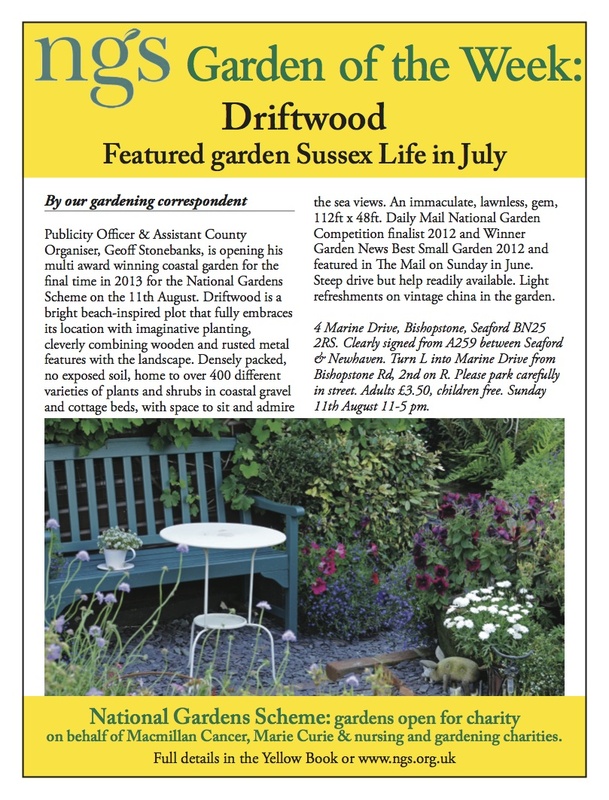 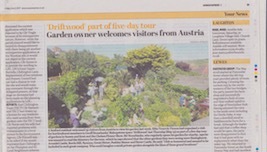 Article on Austrian visit to Driftwood in Seaford Scene July issue. 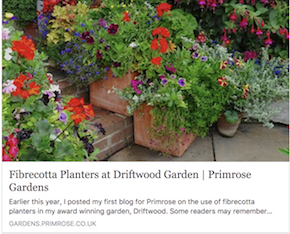 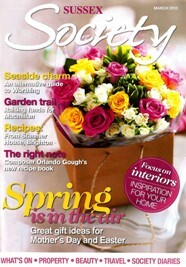 Blog on fibrecotta planters published by Primrose UK, 25th April. 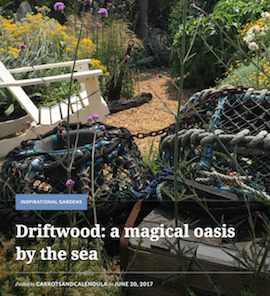 Great article in Country Gardener Magazine: June 2017 Blog for Baaker about Driftwood Garden, published April 2017. 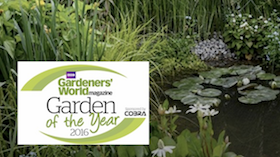 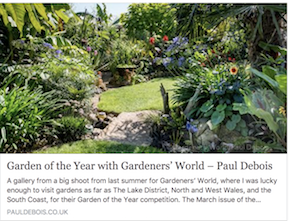 On 20th February, photographer, Paul Debois, who had shot the garden last Summer for Gardeners' World magazine, posted a blog including images of Driftwood. 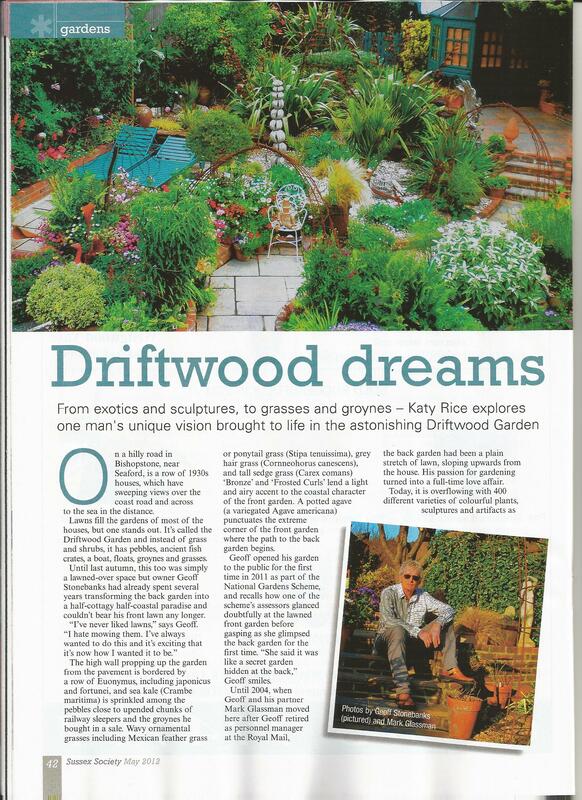 The February issue of Modern Gardens magazine listed Driftwood as one of several winners of their Happy Places with picture of the garden. 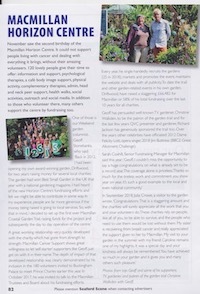 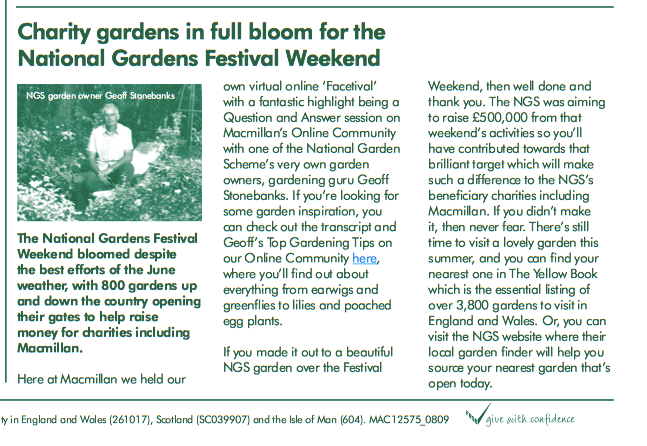 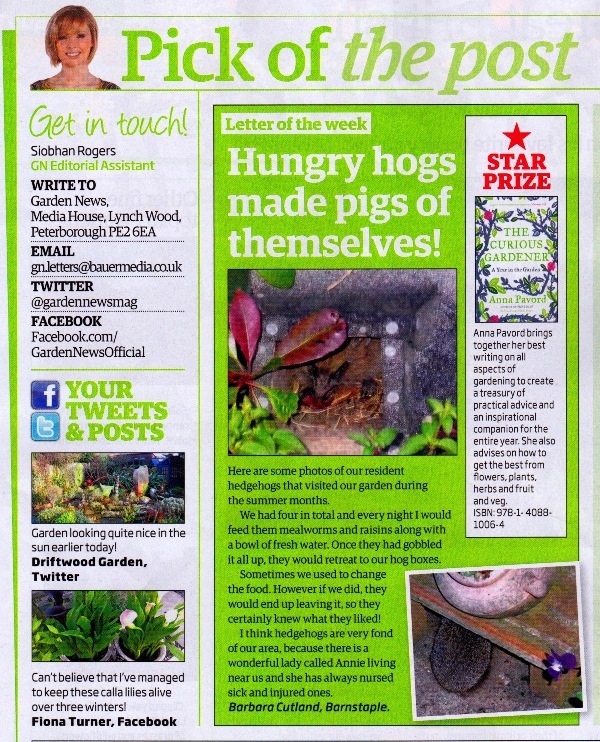 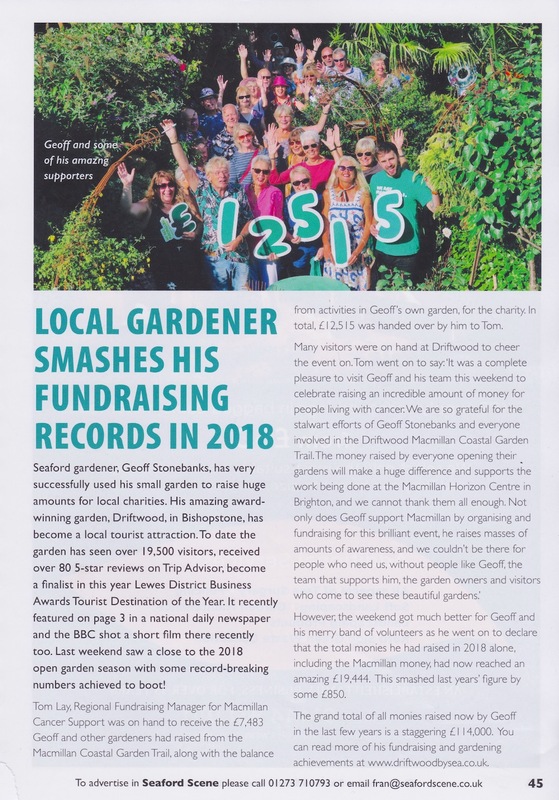 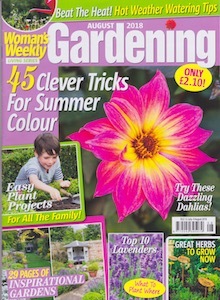 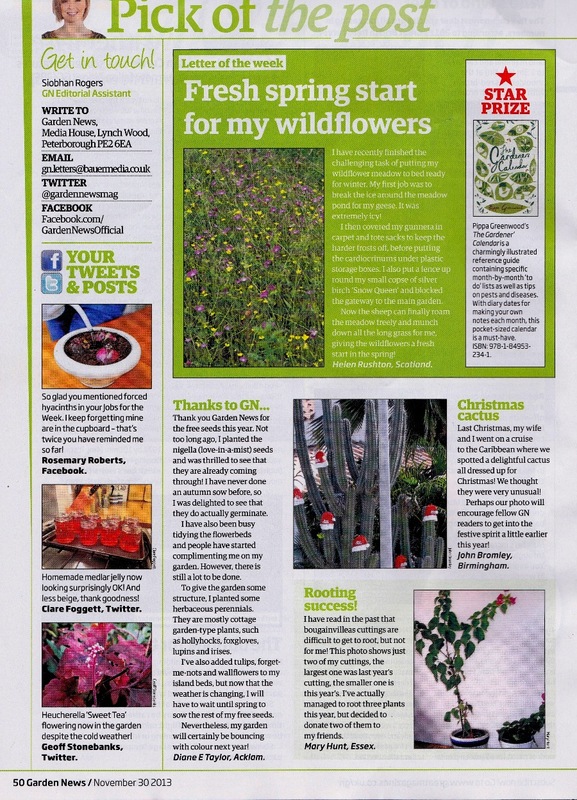 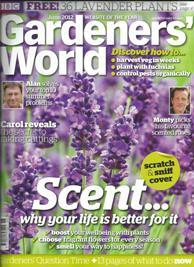 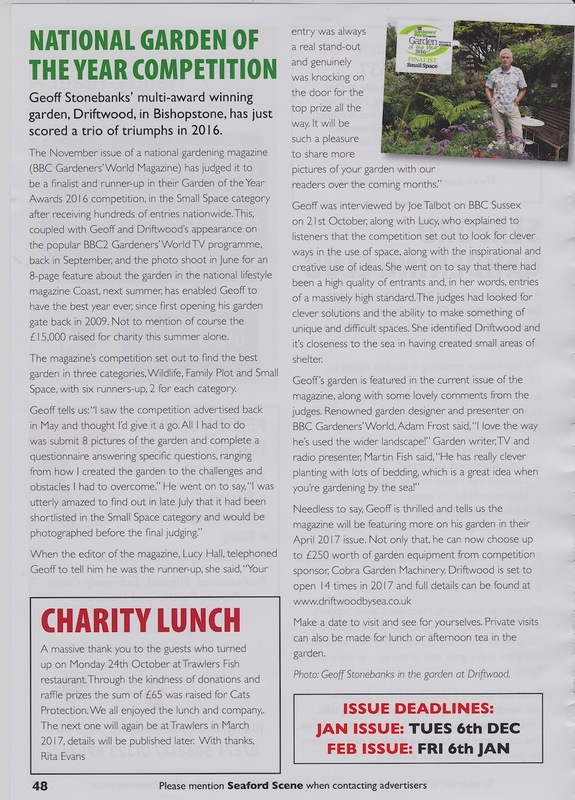 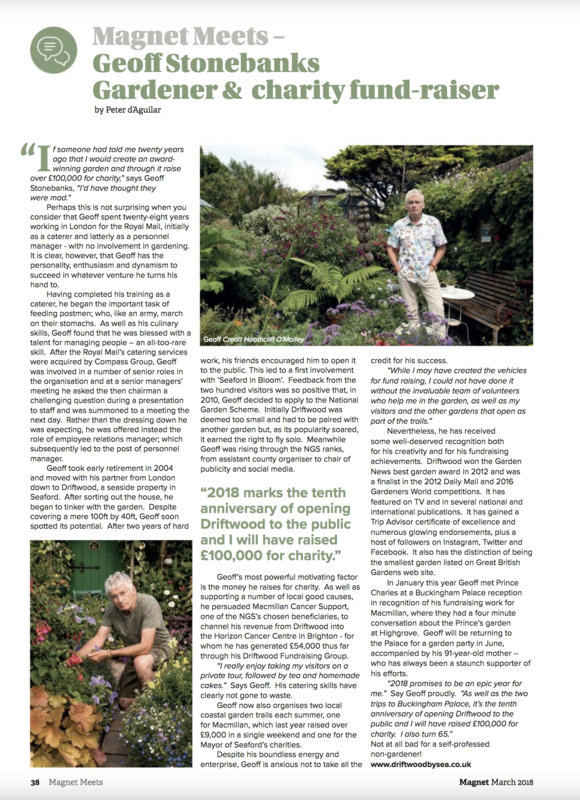 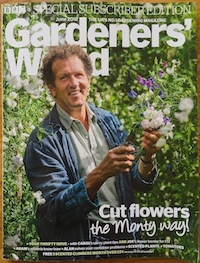 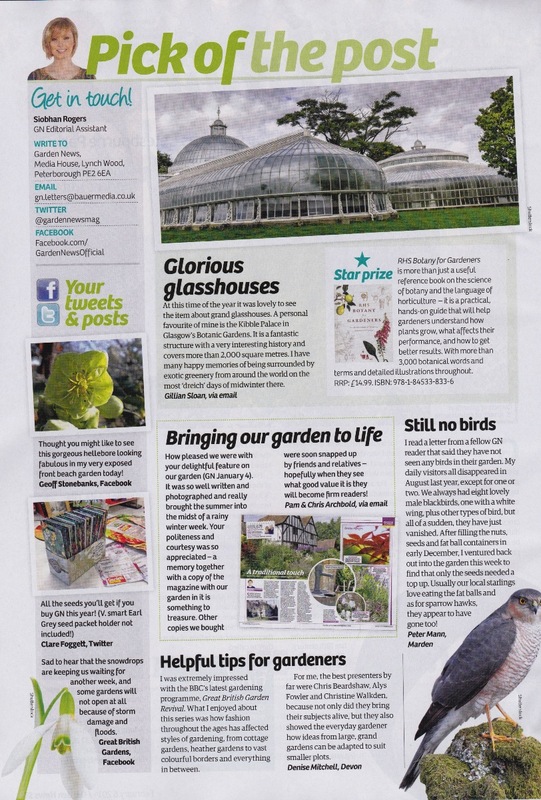 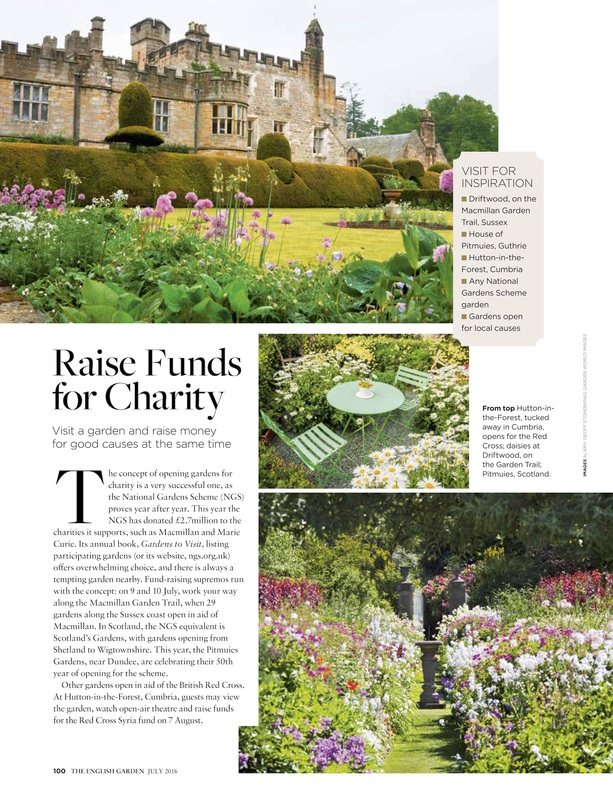 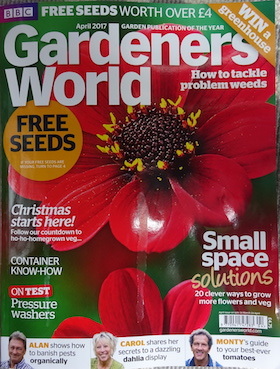 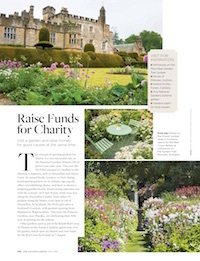 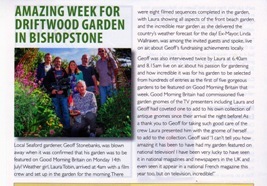 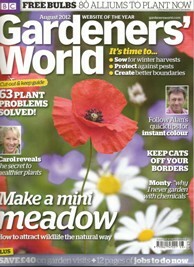 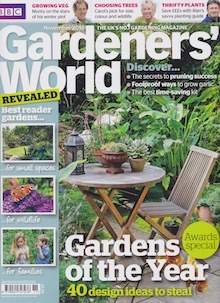 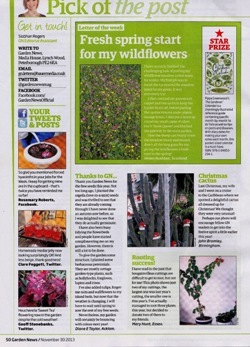 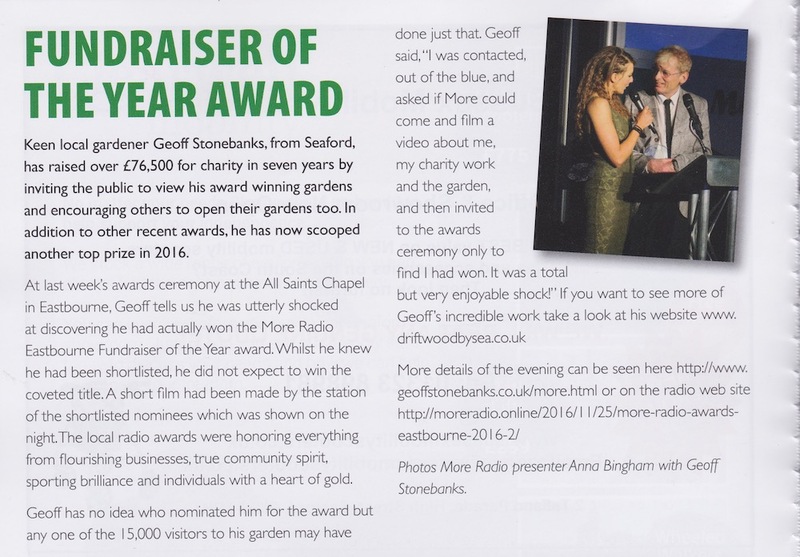 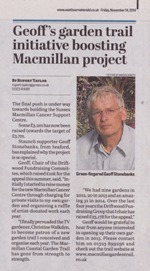 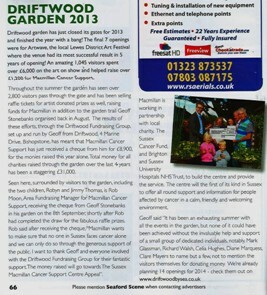 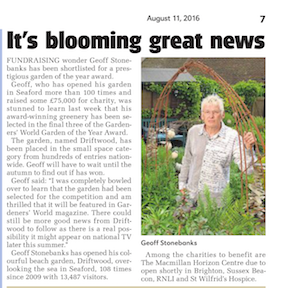 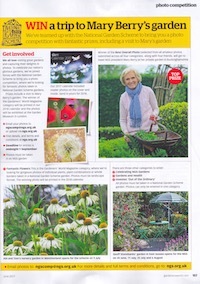 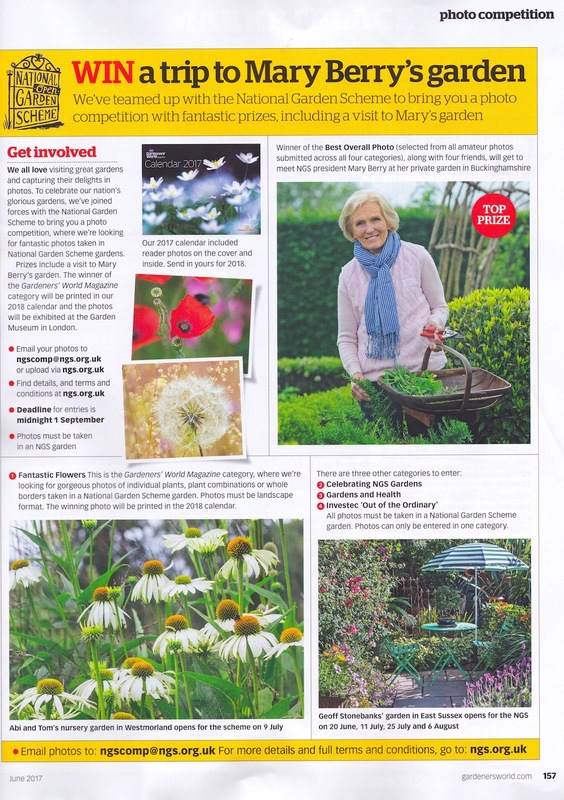 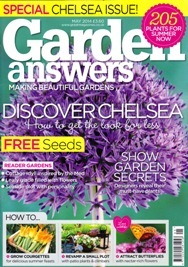 Nice mention of fundraising success in the January issue of Gardeners' World Magazine. 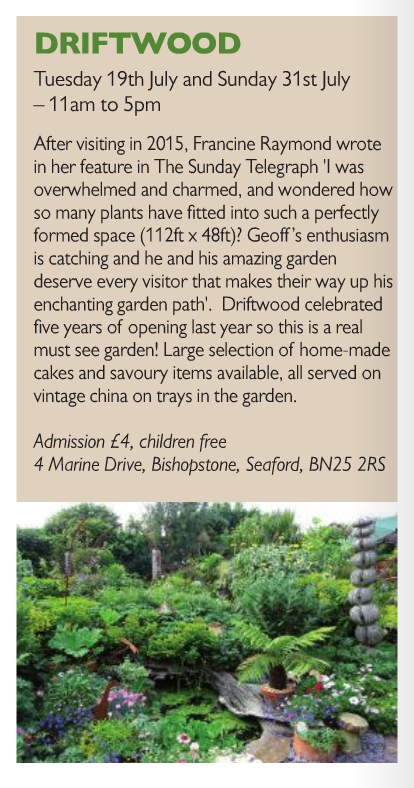 Best Of England published their 2017 guide and Driftwood is listed in there too! 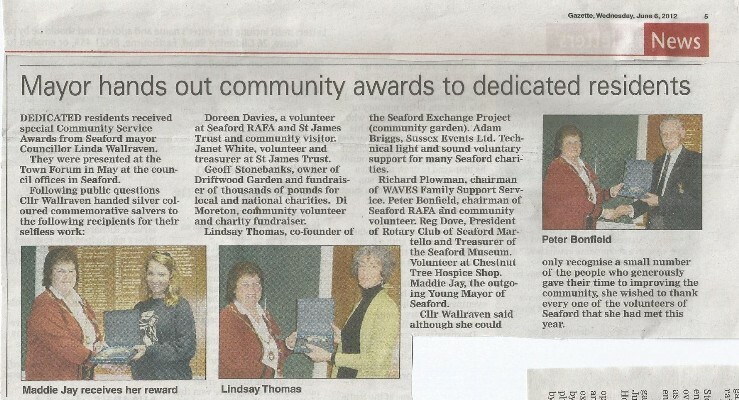 Fundraiser of the Year in January issue of Seaford Scene. 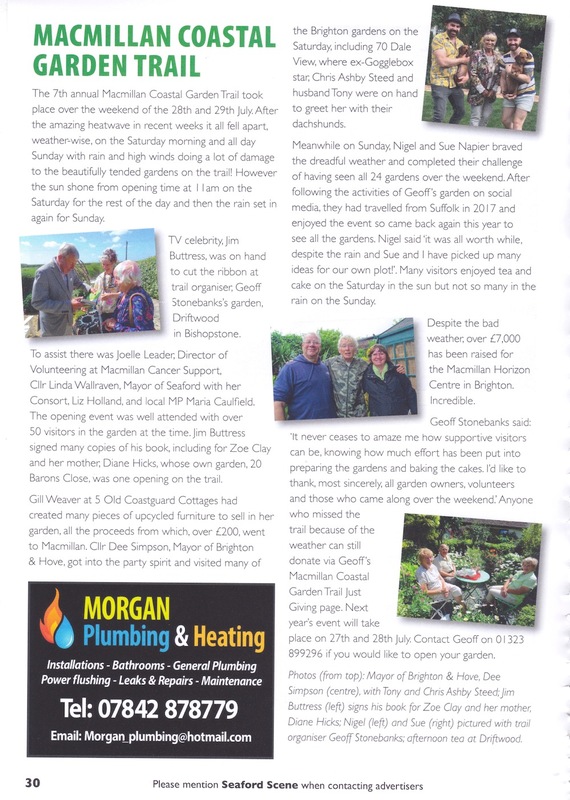 Great mention in feature on "influential personalities in the Sussex gardening world" in Sussex Life magazine January 2017. 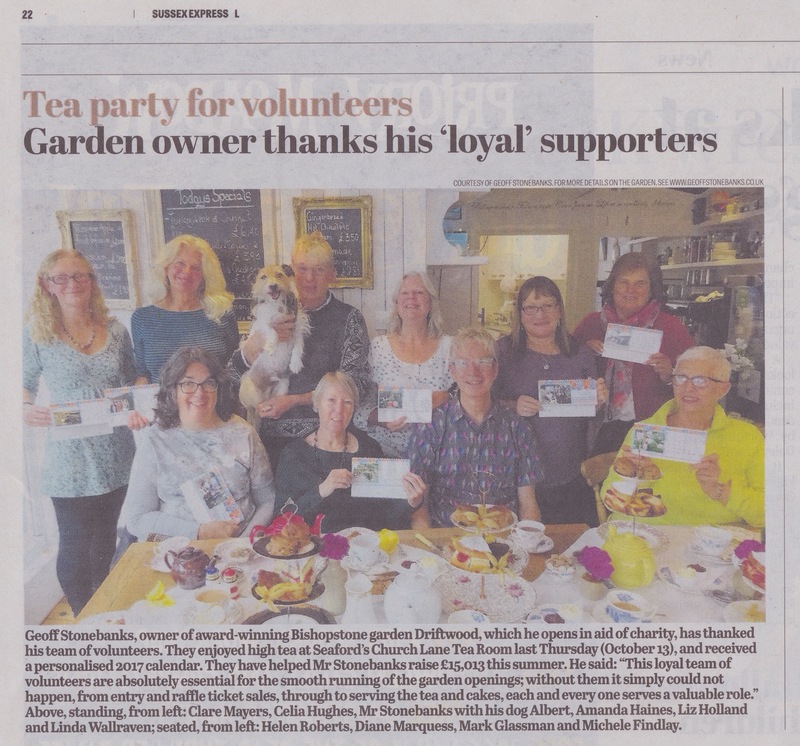 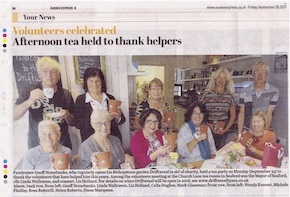 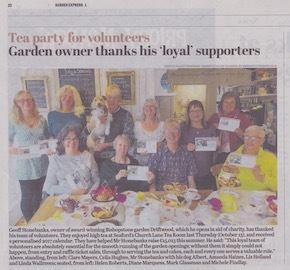 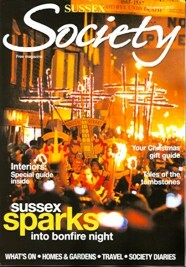 Nice photo and report on tea party in Sussex Express on 21st October Full page feature in October's issue of Seaford Scene. 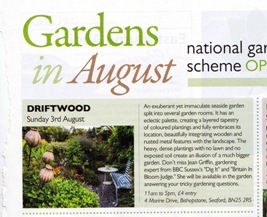 Chapter on Driftwood in new book published in September 2016 about National Gardens Scheme Gardens. 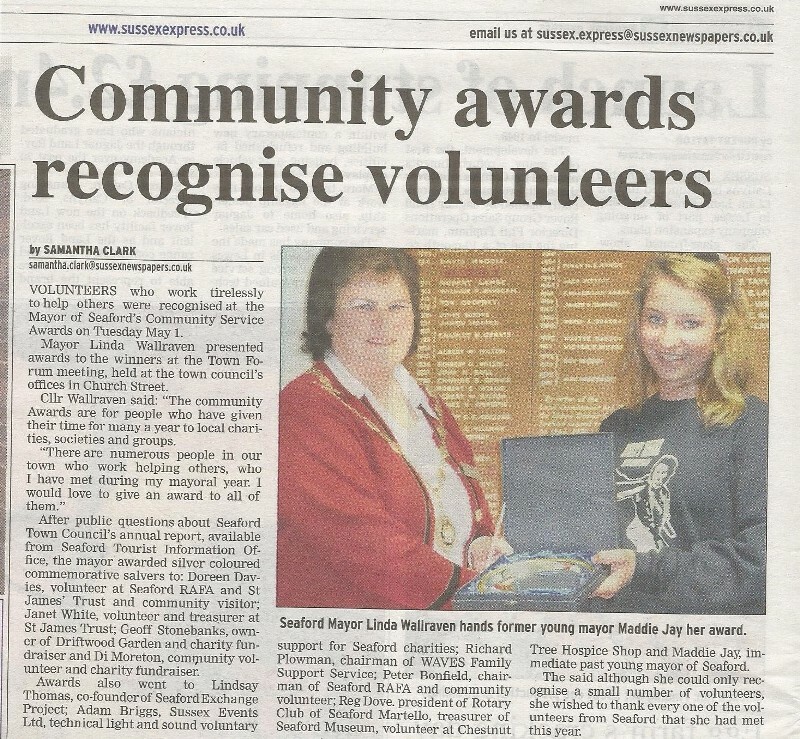 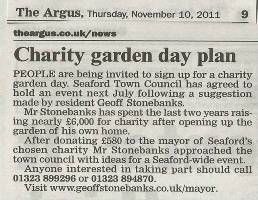 Nice mention on front page and on page 3 of Seaford Herald on 23rd September. 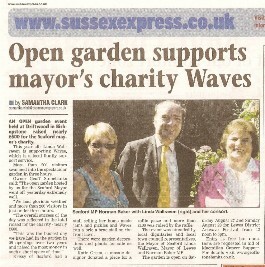 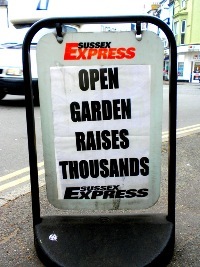 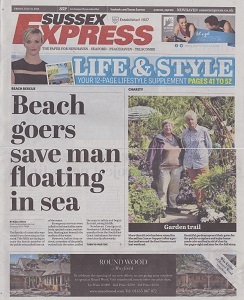 Nice mention on front page and on page 3 of Sussex Express on 23rd September. 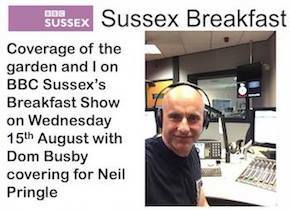 Brief talk with Neil Pringle on the BBC Sussex breakfast show on 23rd September. 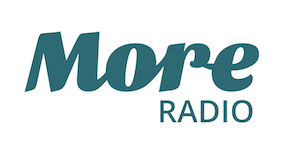 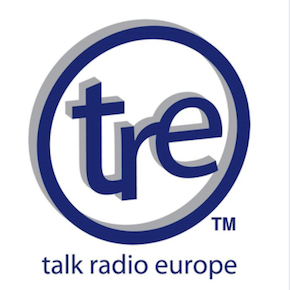 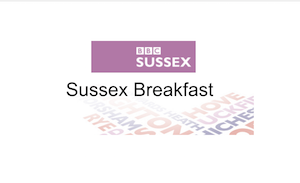 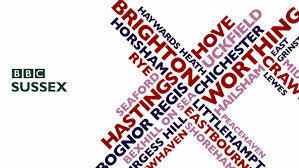 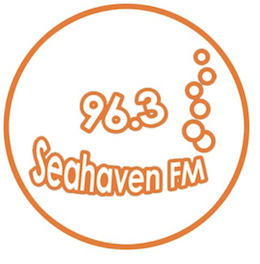 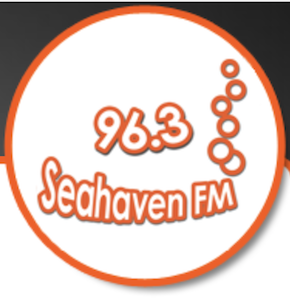 We were in the 8am news on BBC Sussex on 23rd September, click logo to listen. 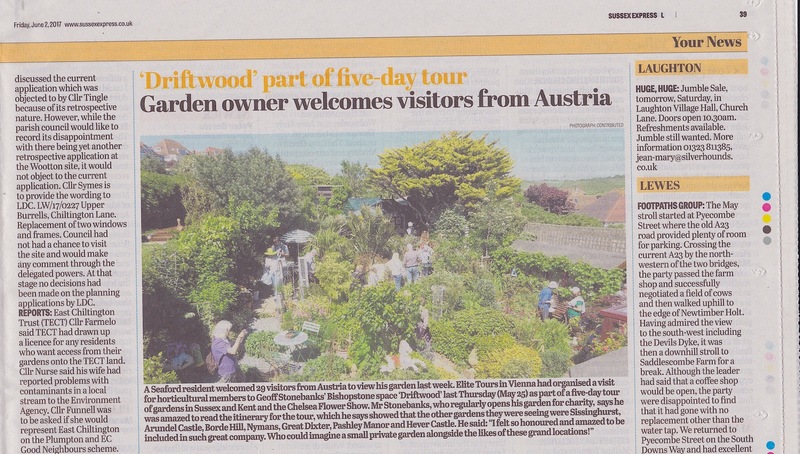 Lovely blog written about the garden by Sarah Potter after visiting during Artwave, 21st September 2016 Great piece on line with Eastbourne Herald on 19th September. 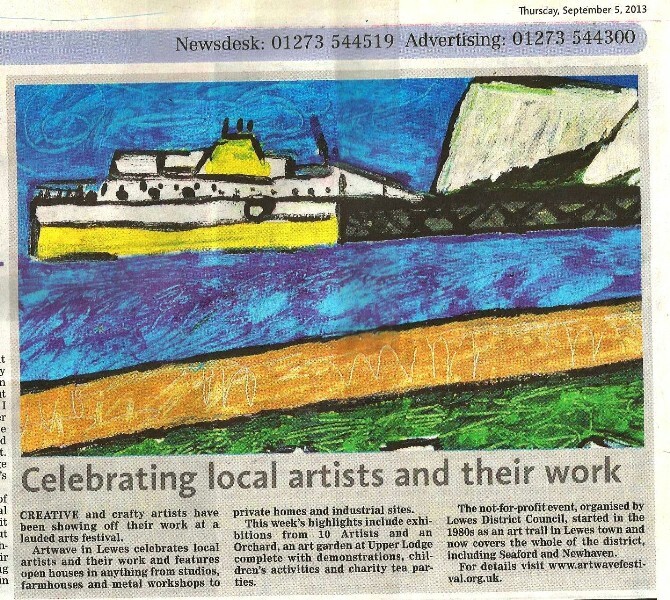 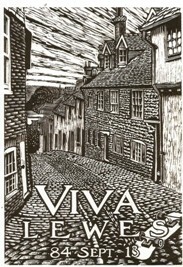 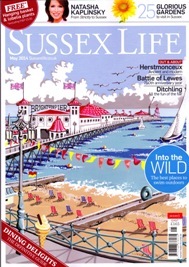 Printed in Sussex Express on 9th September Piece in September's issue of Seaford Scene. 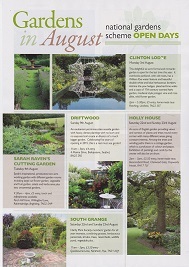 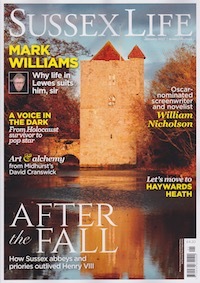 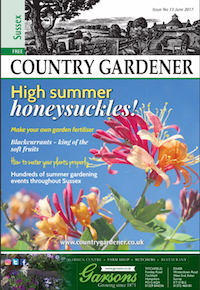 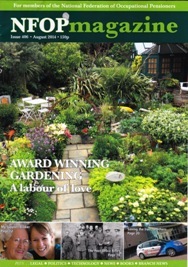 Great piece on page 4 of Country Gardener (Sussex), September issue. 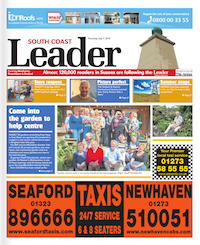 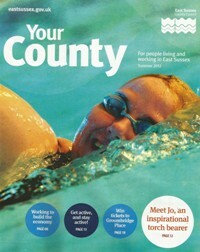 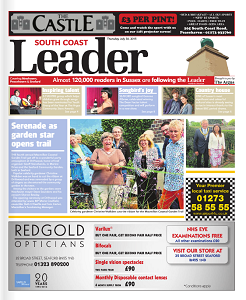 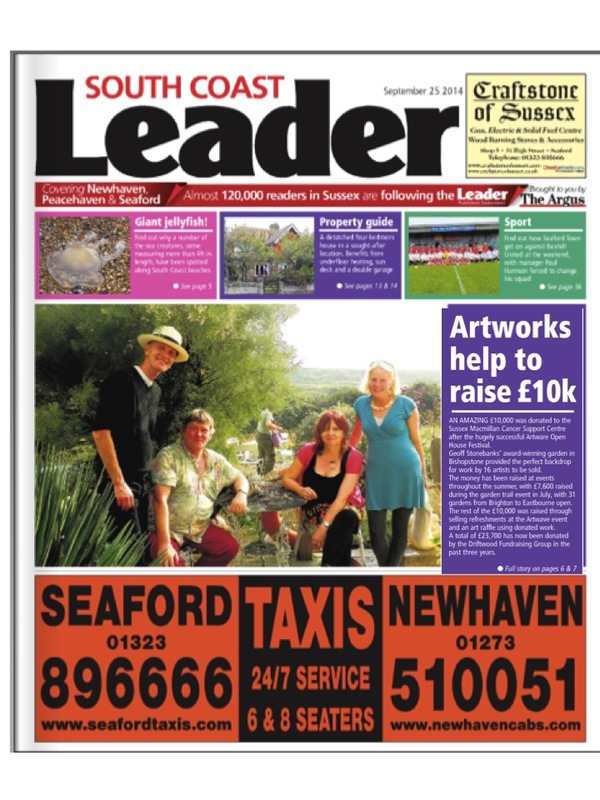 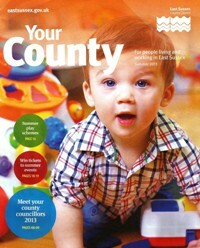 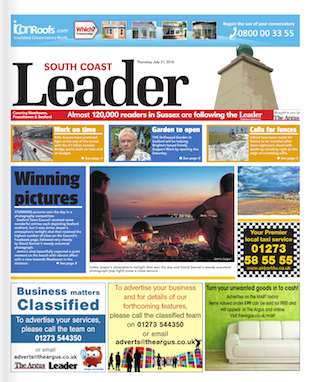 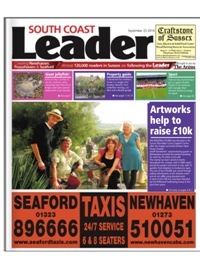 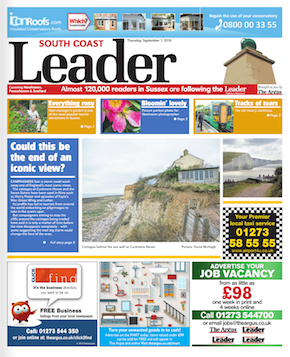 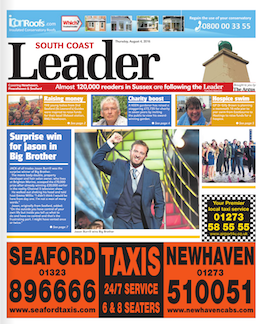 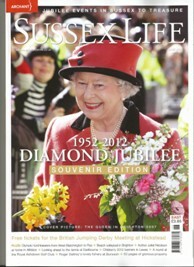 Mention on cover and article on page 3 of South Coast Leader on 1st September. 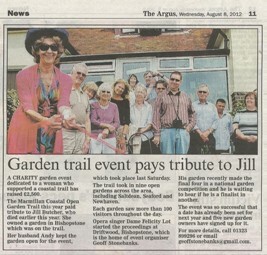 Amazing article in the Argus on 31st August. 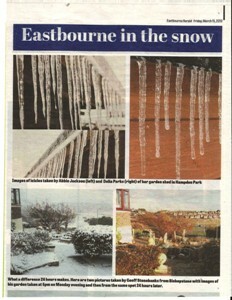 It was posted online too. 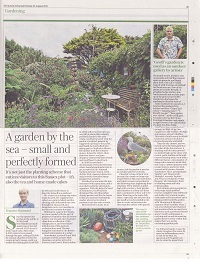 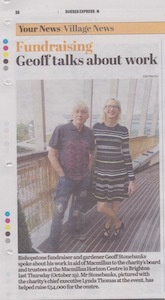 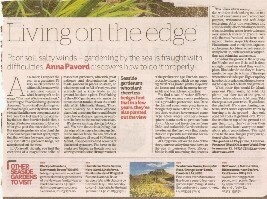 Great piece on page 17 of The Sunday Telegraph on 28th August! 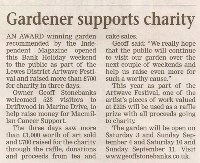 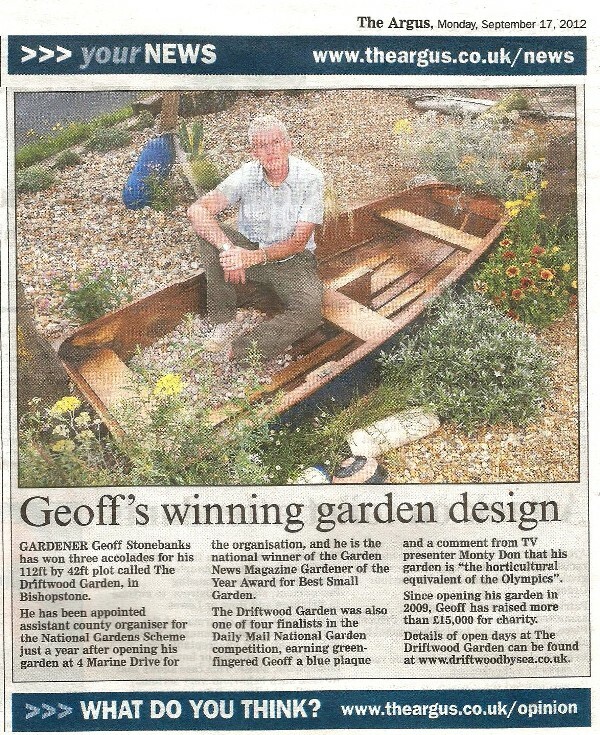 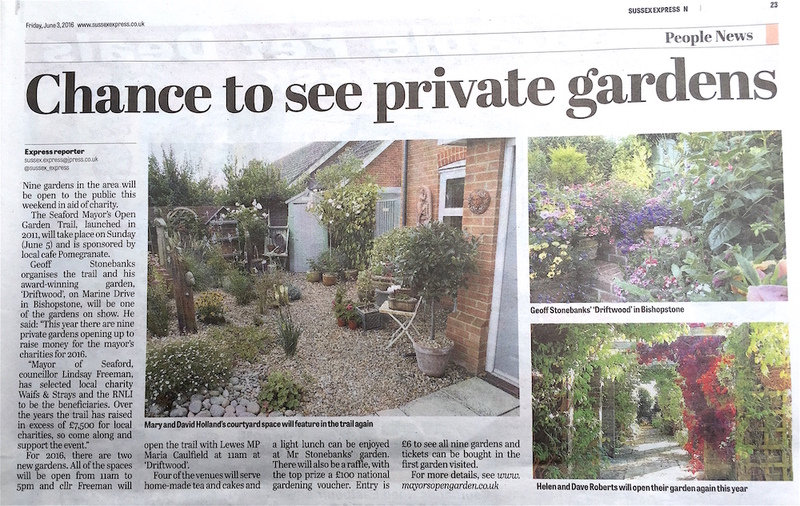 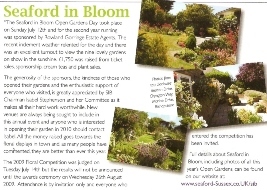 Lovely piece in Sussex Express on garden 12th August Nice mention in Seaford Herald on garden competition on 12th August. 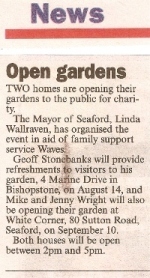 Nice mention in South Coast Leader on 11th August. 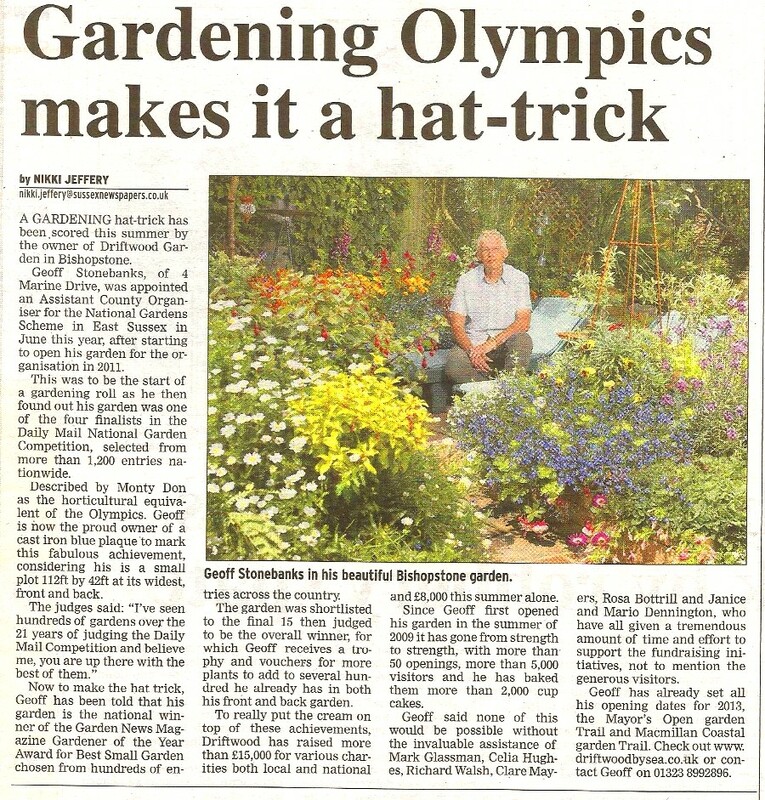 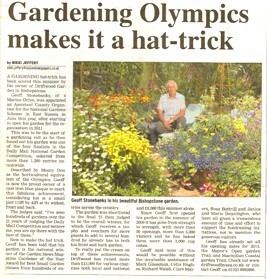 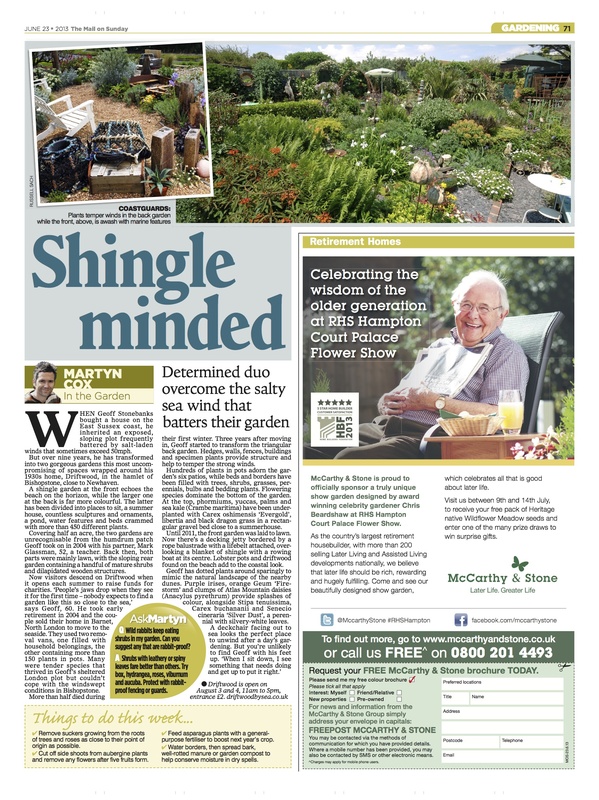 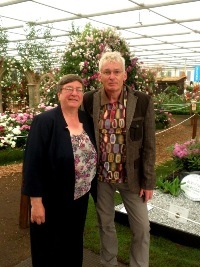 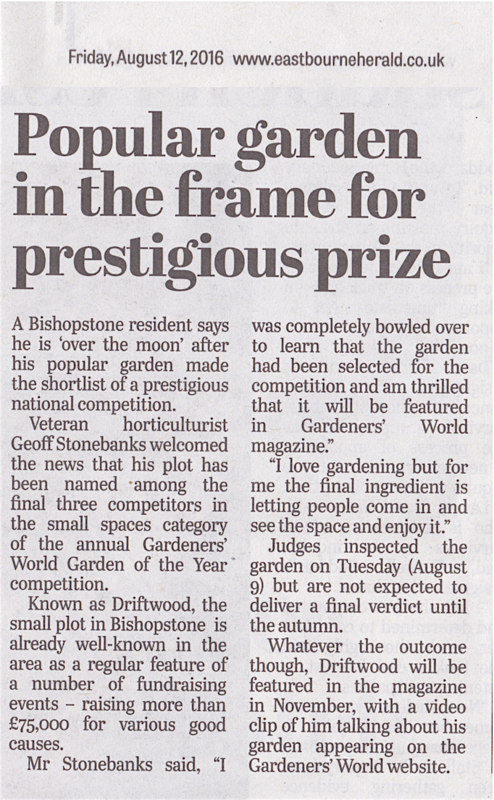 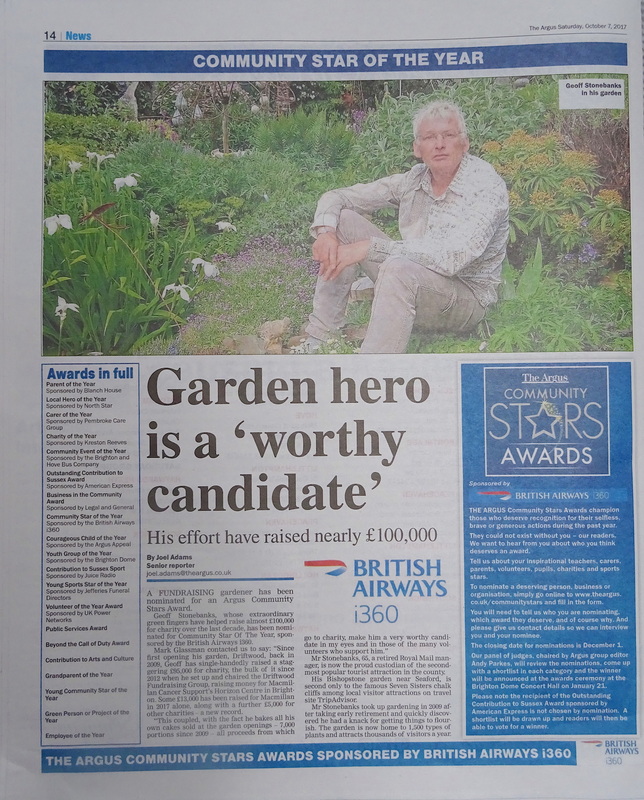 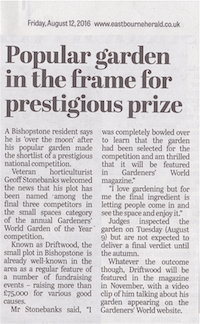 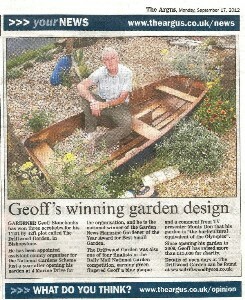 Nice piece in the Argus on Gardeners' World competition and online too. 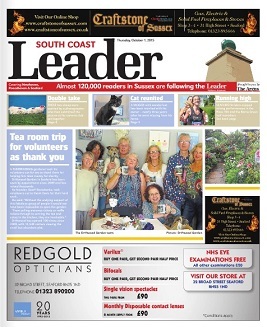 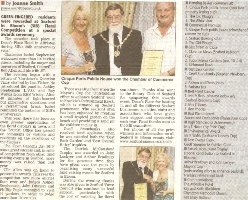 Front page mention and article inside South Coast leader on 4th August. 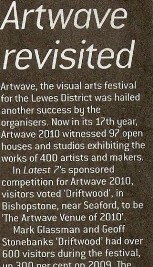 Nice half page in Magnet August issue of Artwave opening. 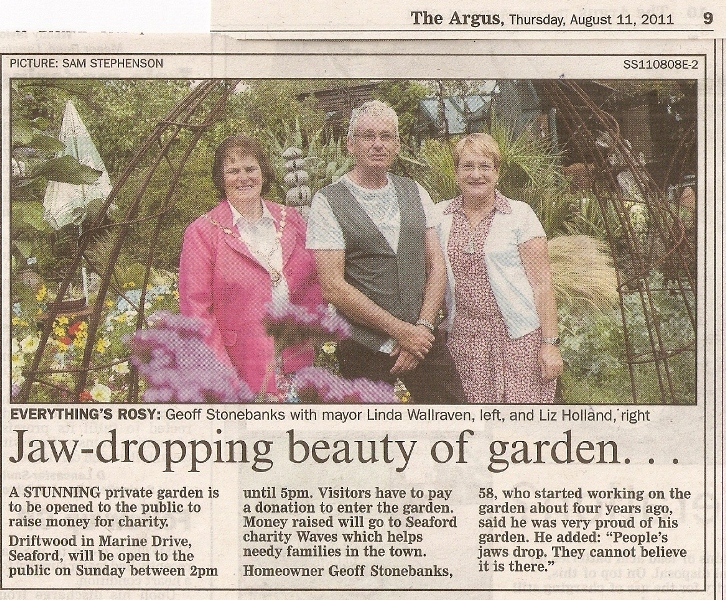 Great article in The Argus on 2nd August and online too. 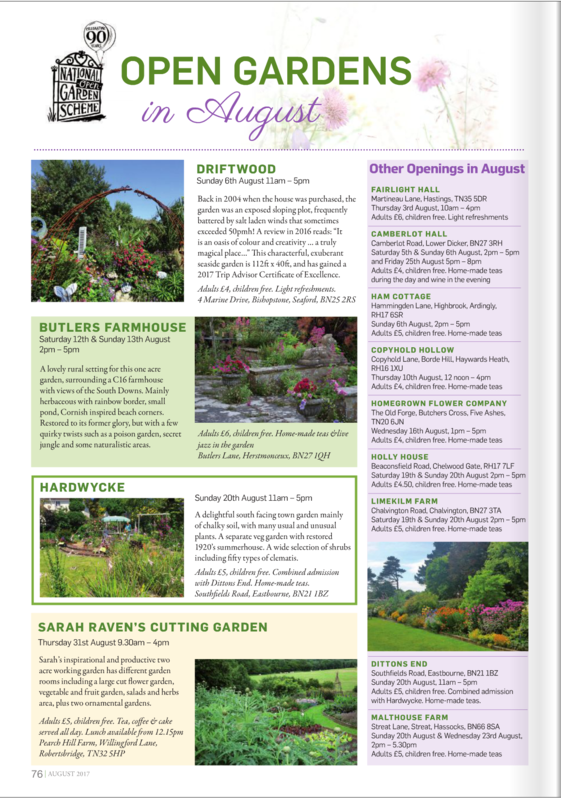 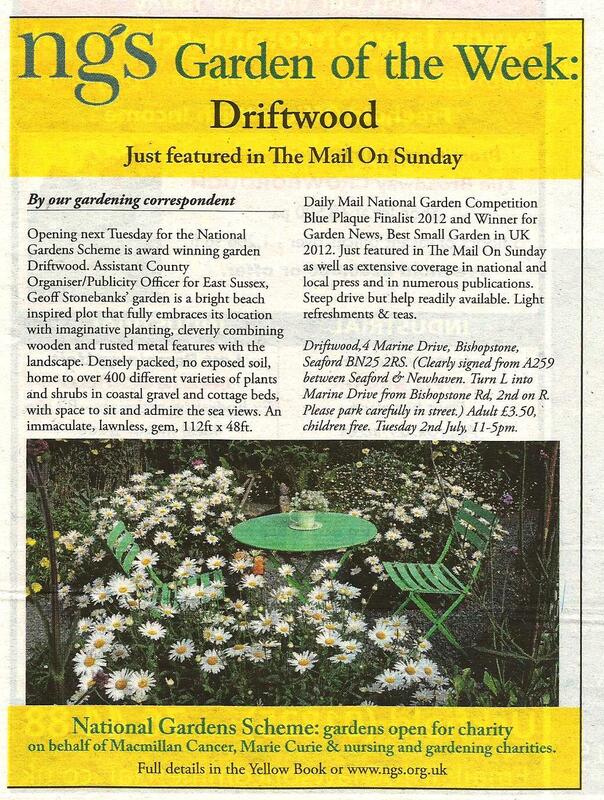 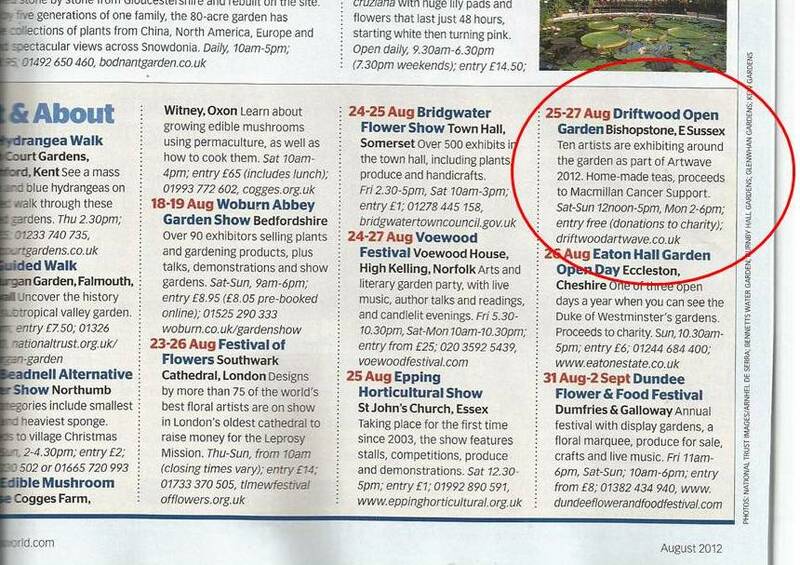 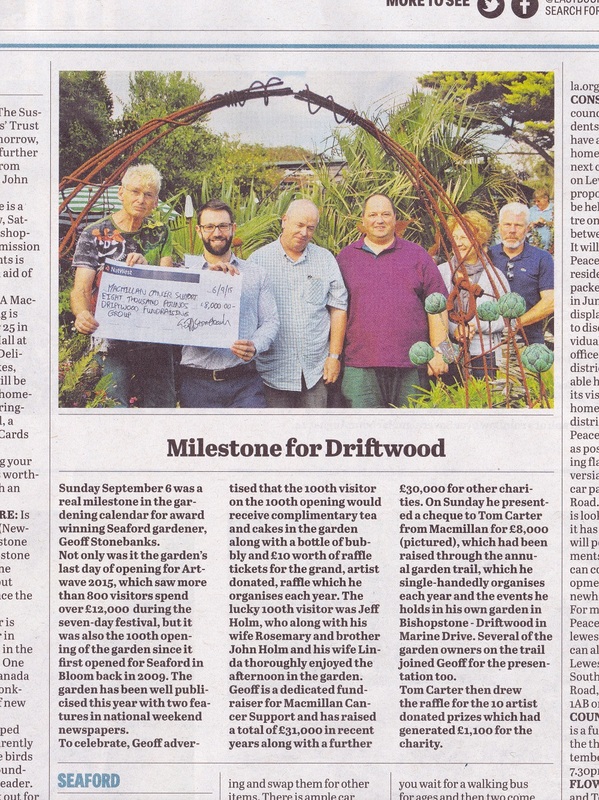 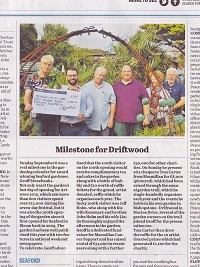 Driftwood was one of 3 featured gardens opening for The National Gardens Scheme on 30th July in the Telegraph's online gardening section. 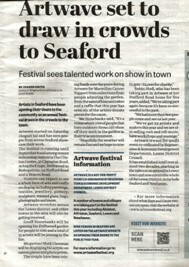 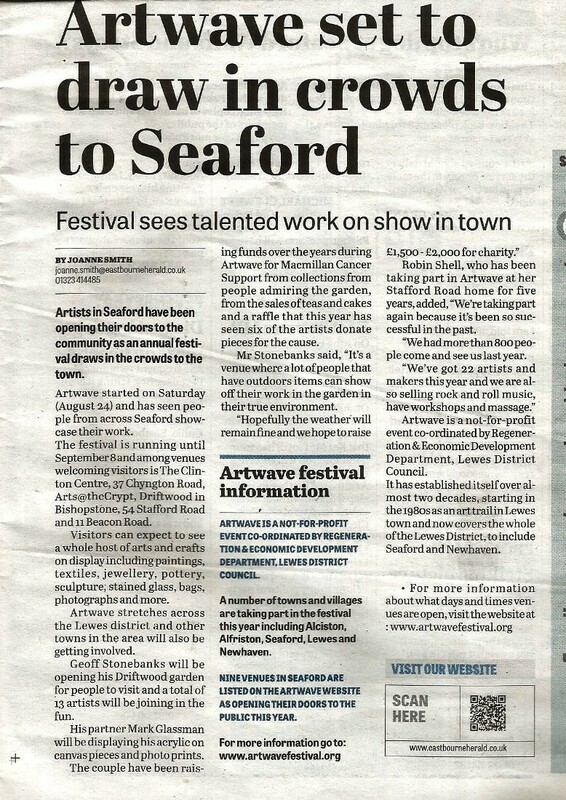 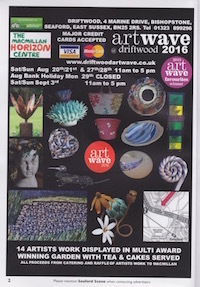 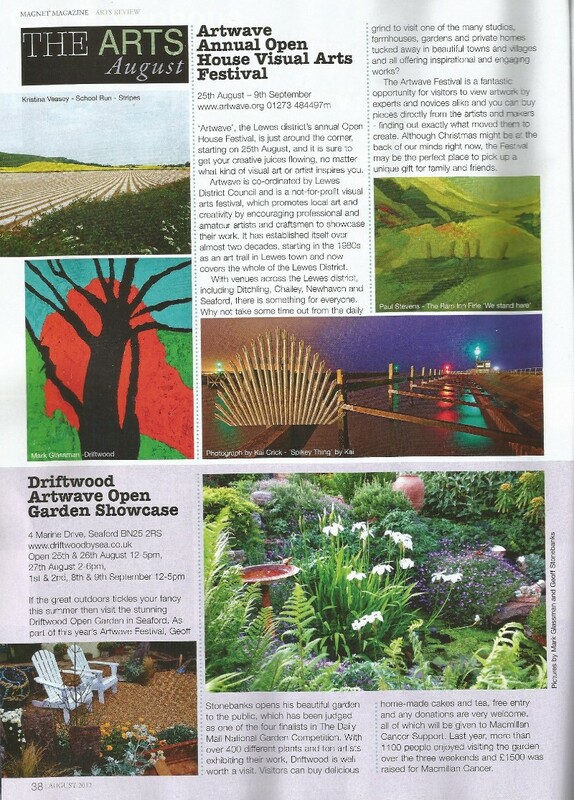 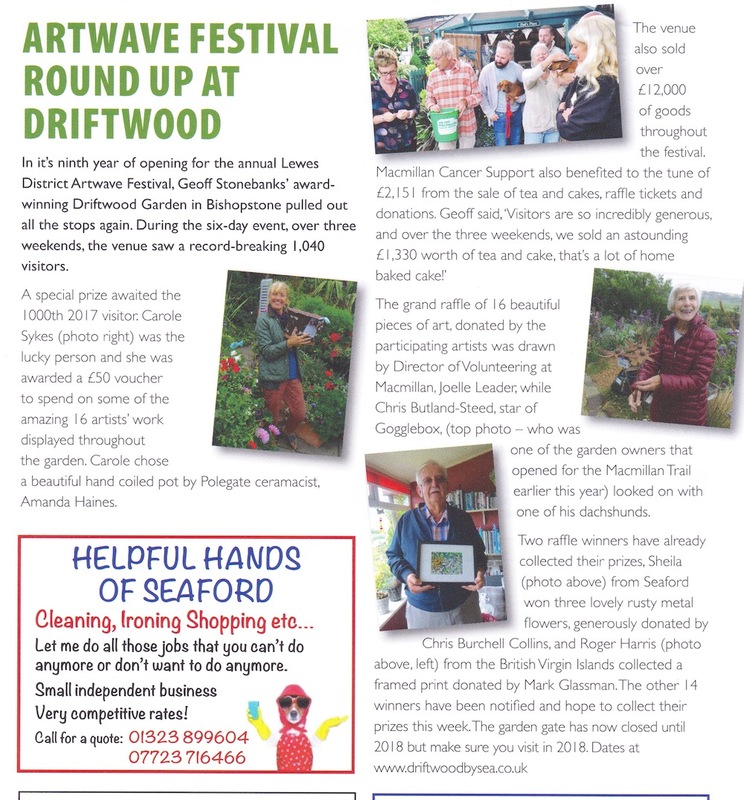 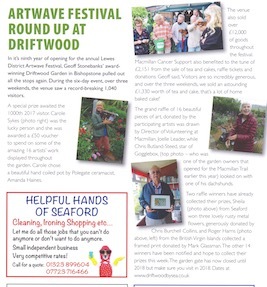 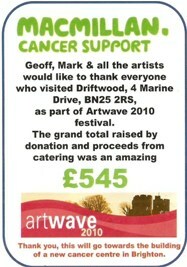 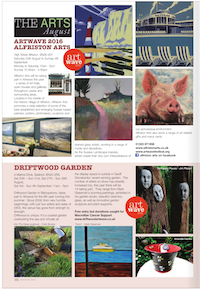 Lovely coverage of Driftwood Artwave openings in the August issue of Seaford Scene. 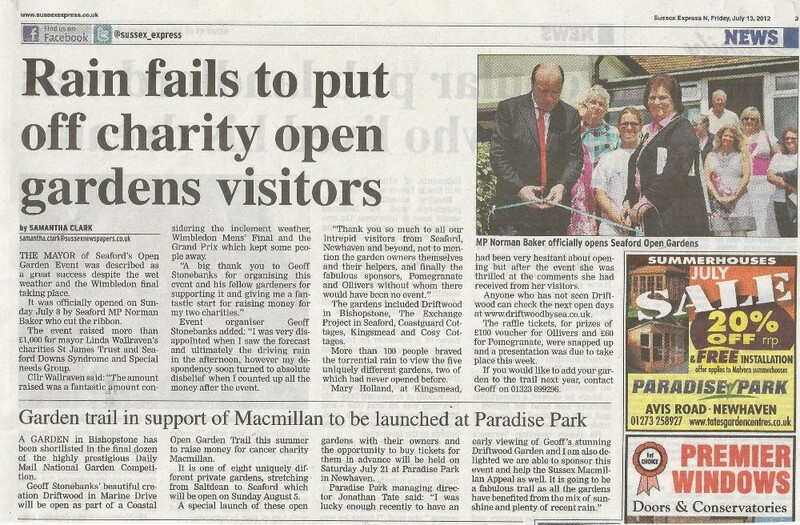 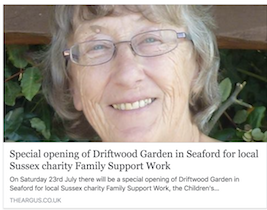 Front page and page 8 of South Coast Leader on Family Support Work opening on 21st July. 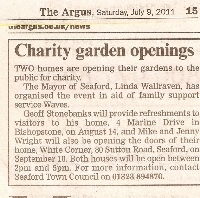 Great article on line with The Argus about the Family Support Work opening on 18th July. 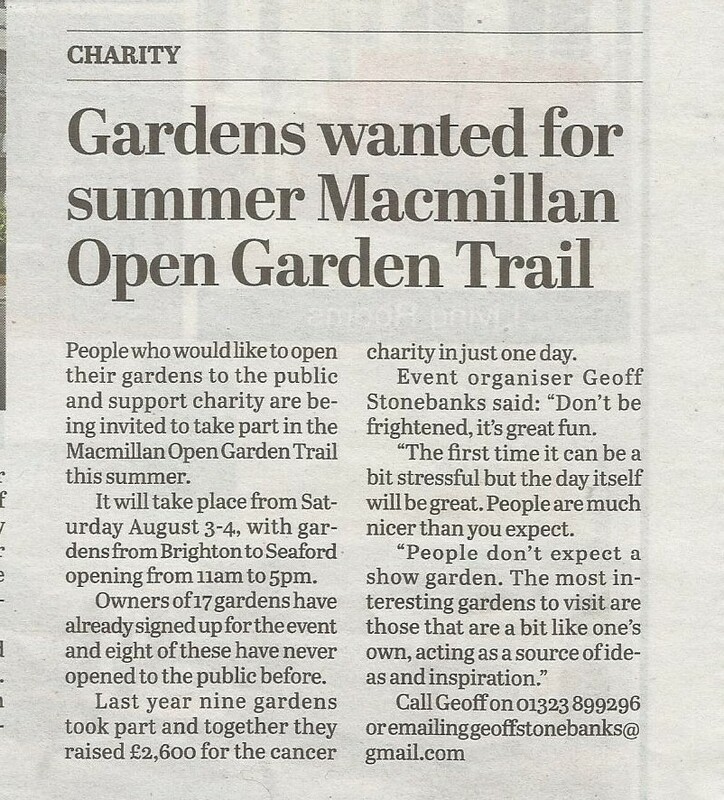 Great on-line article in the Eastbourne Independent on Macmillan Trail 14th July 2016. 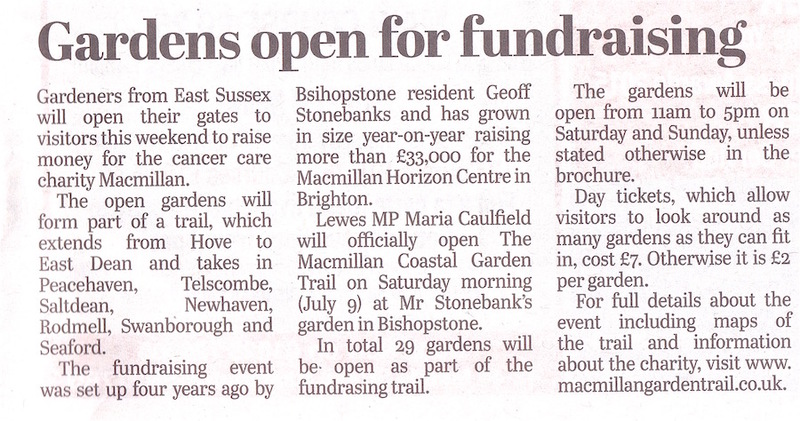 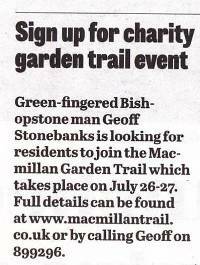 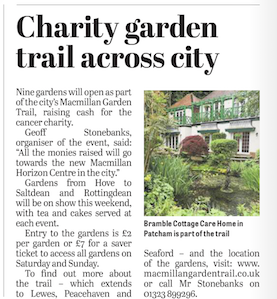 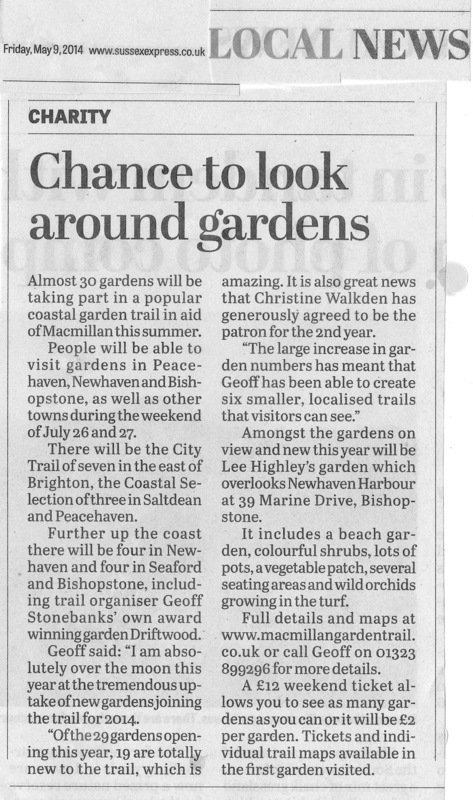 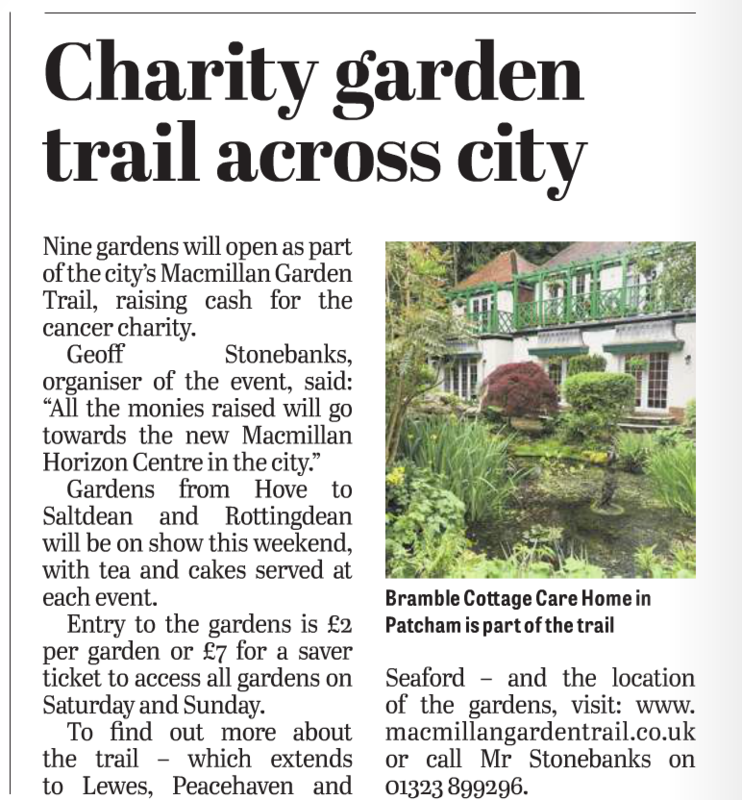 Nice article in Sussex Express on 15th July for Macmillan Garden Trail Great coverage on full page in Seaford Herald on 15th July for Macmillan Garden Trail Great article in The Argus on Macmillan Trail 14th July 2016 and Argus on-line too. 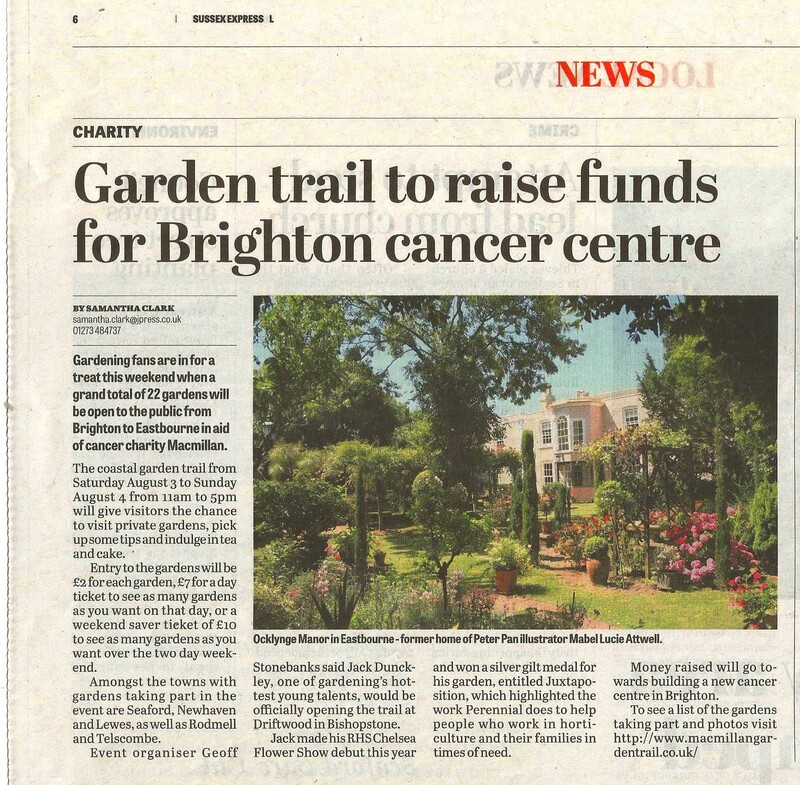 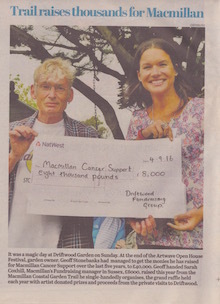 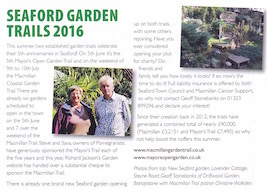 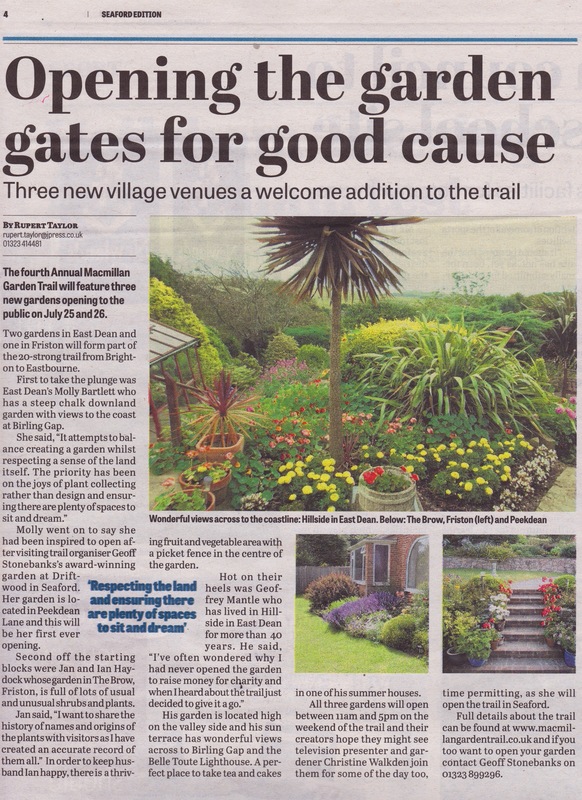 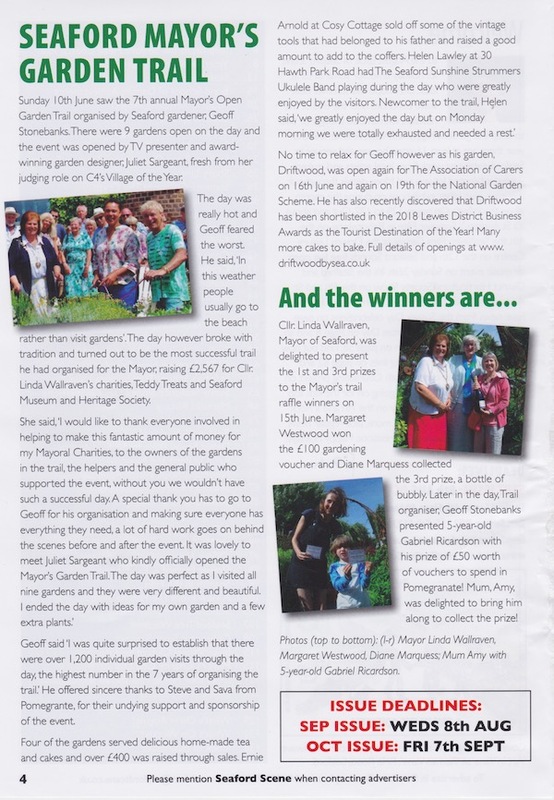 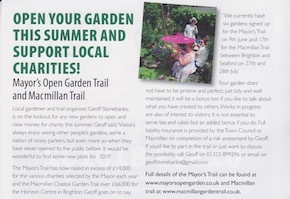 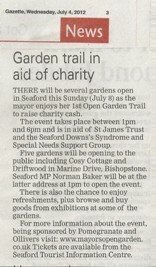 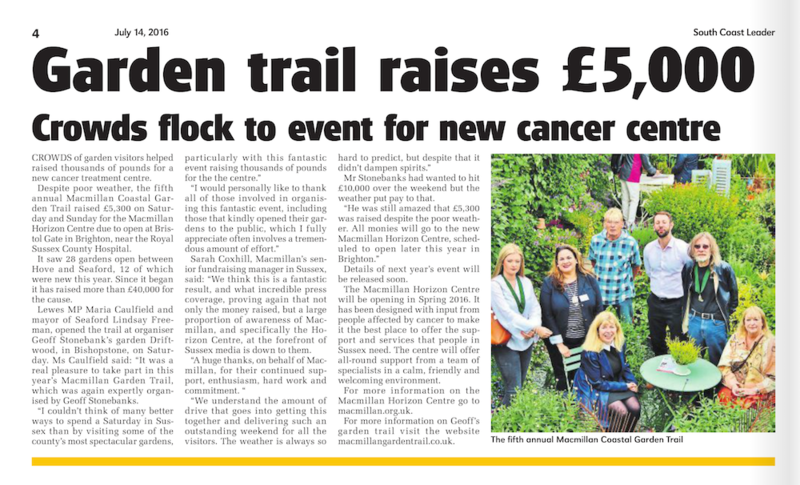 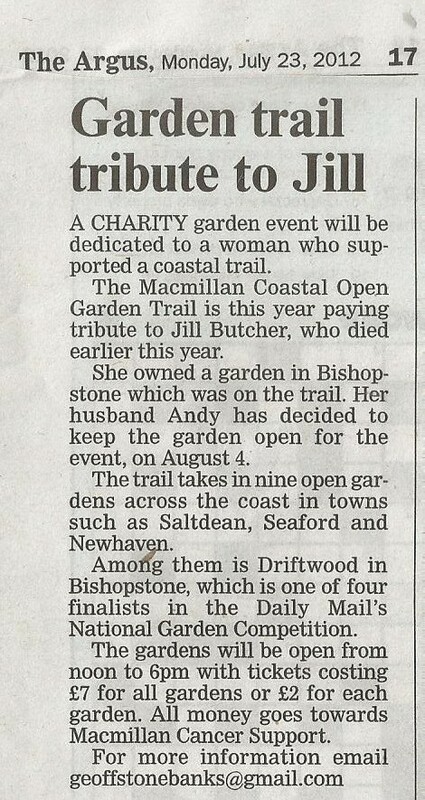 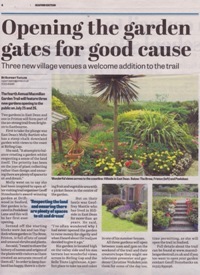 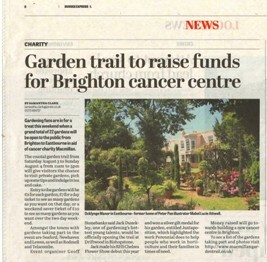 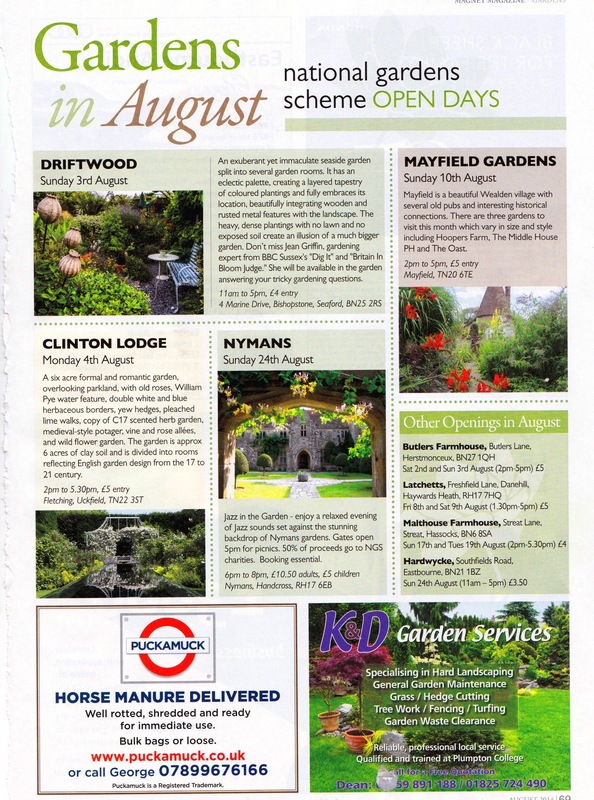 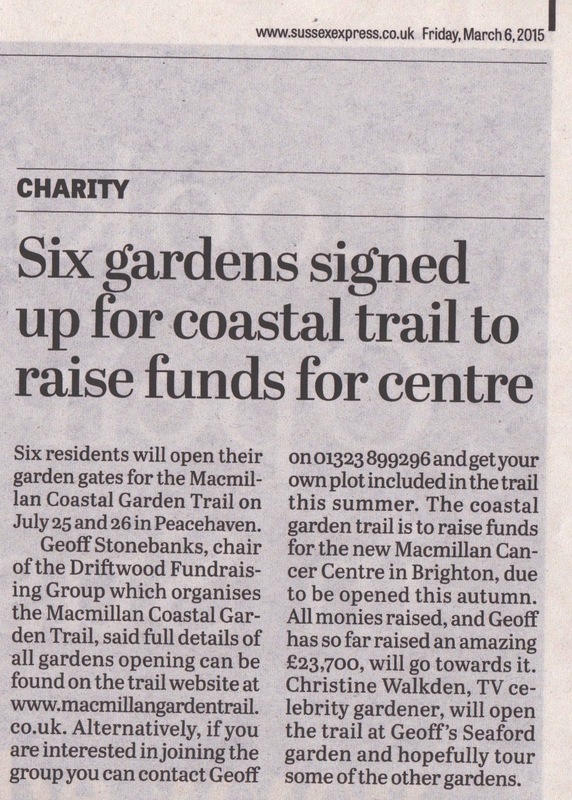 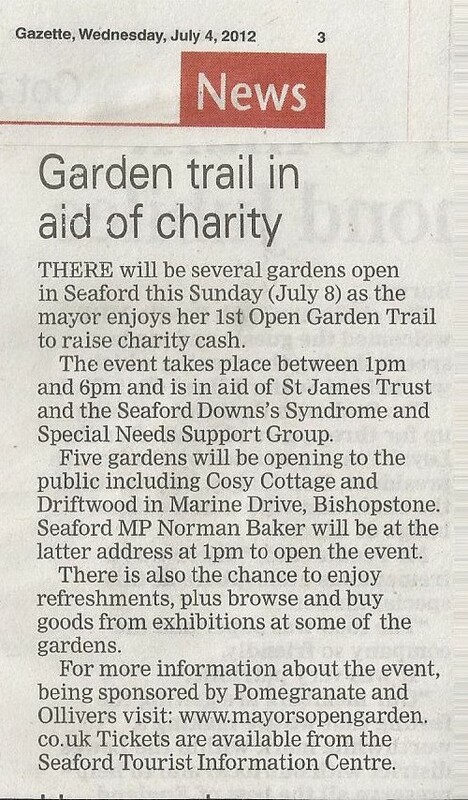 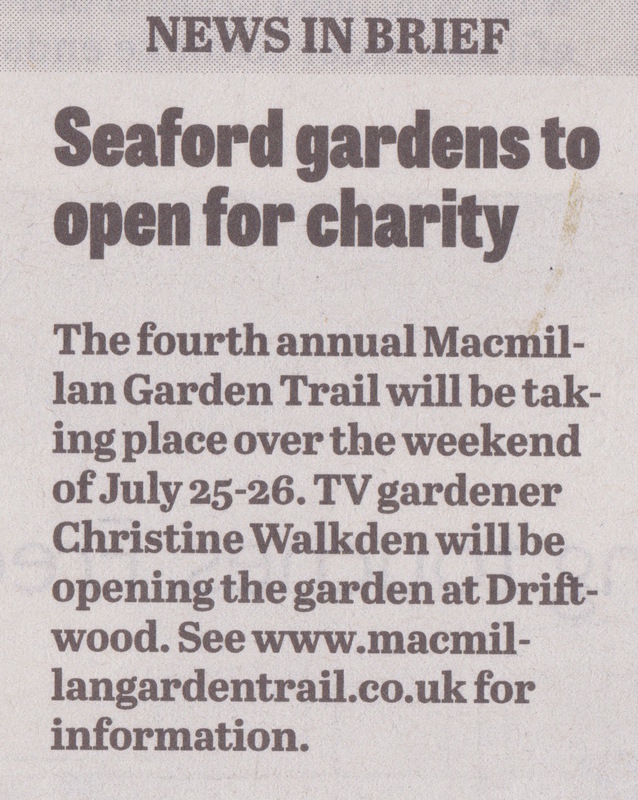 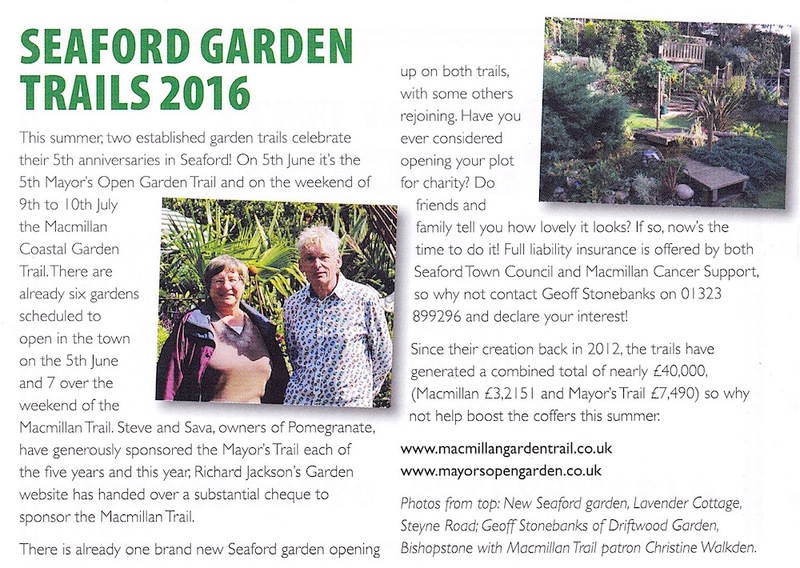 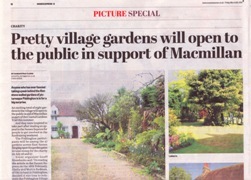 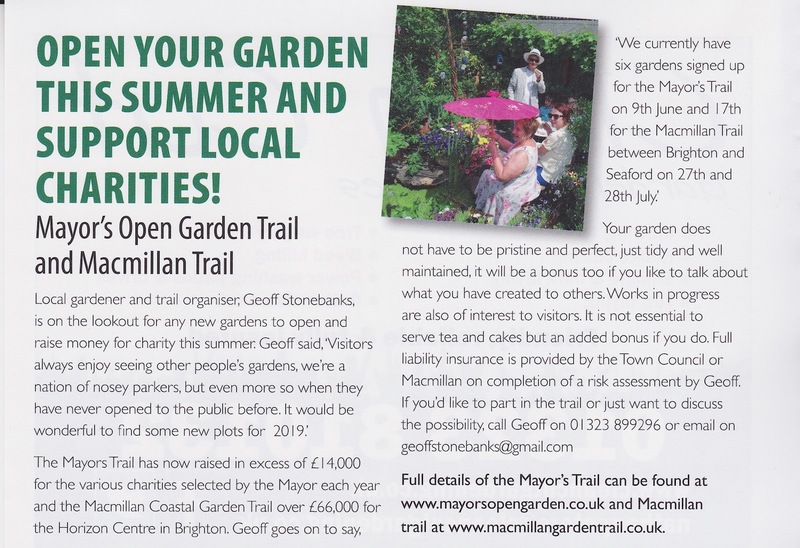 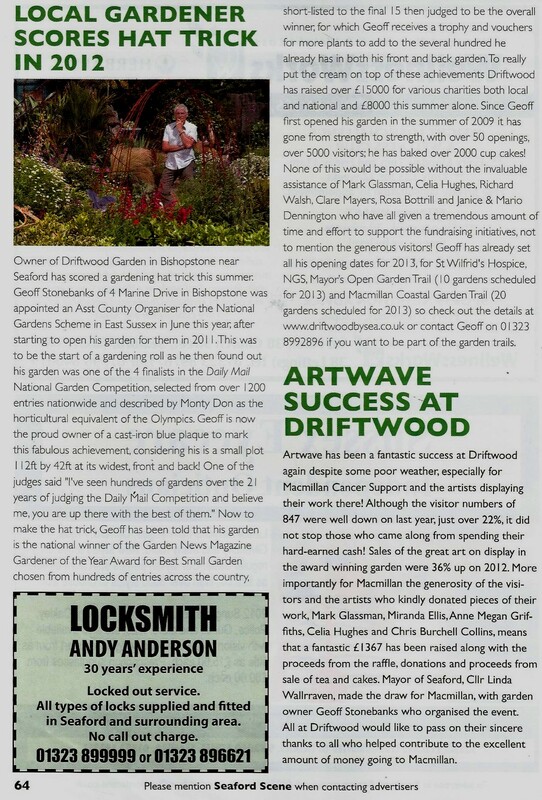 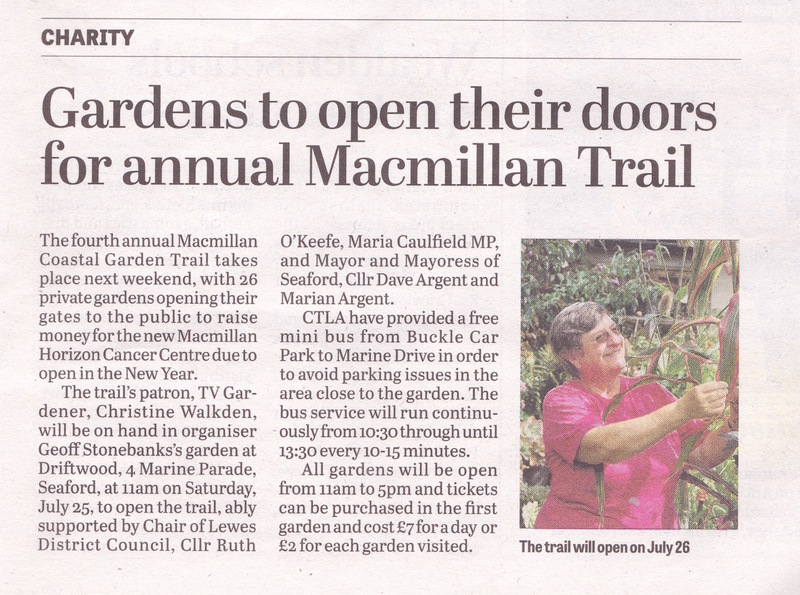 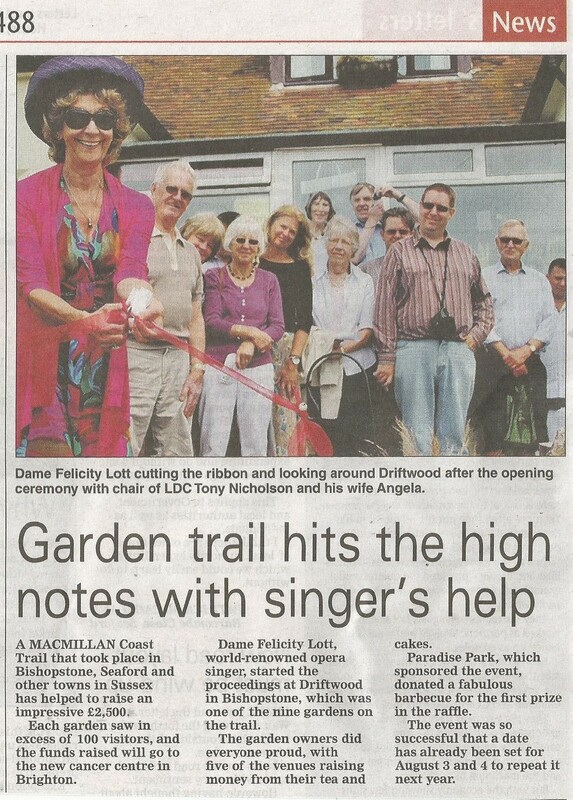 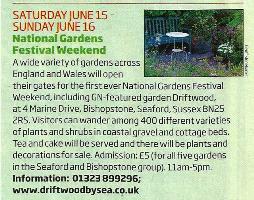 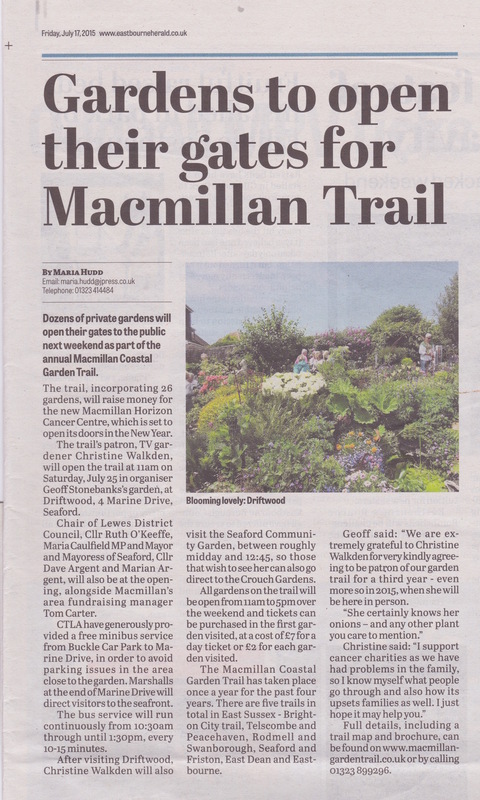 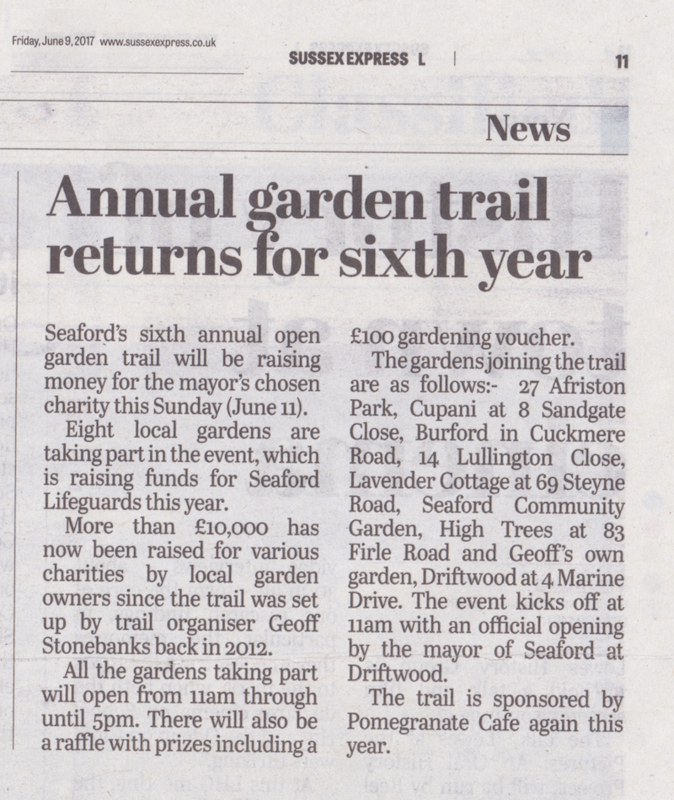 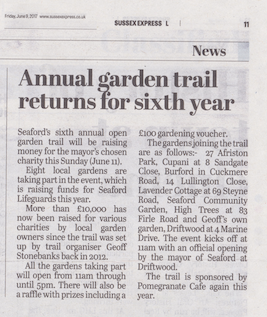 Great feature on Macmillan garden Trail in The Argus 6th July 2016 Advert for Driftwood opening for NGS in July issue of Magnet Magazine Nice piece about the Mayor's Trail raffle winners and the Macmillan garden Trail in Seaford Scene July issue. 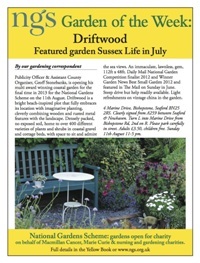 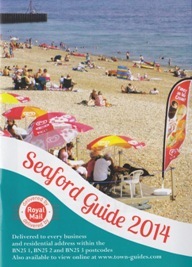 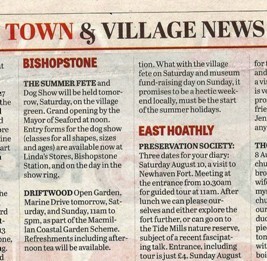 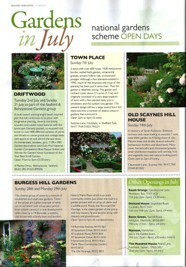 Seaford Scene July events with Driftwood listed. 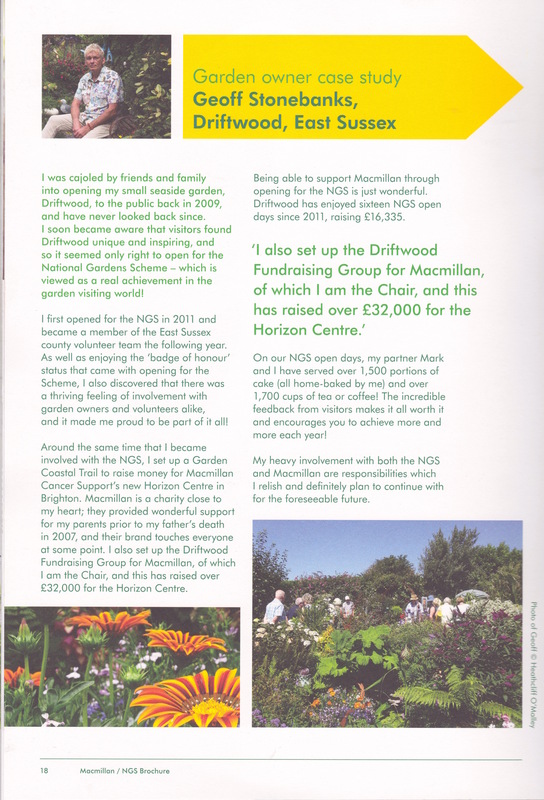 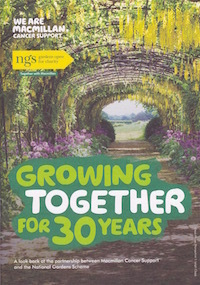 May 2016 Macmillan Cancer Support & The NGS publish brochure on 30 year relationship with feature on Driftwood. 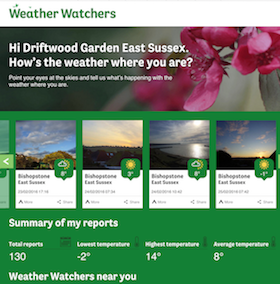 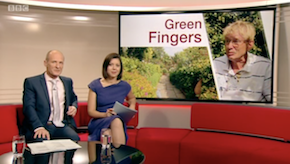 April 2016 On 1st March I was live on Neil Pringle's BBC Sussex Breakfast Show talking about my Weather Watchers reports from the garden, click image to hear! 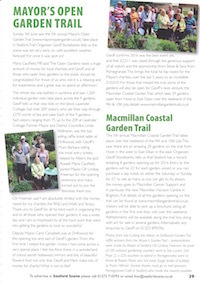 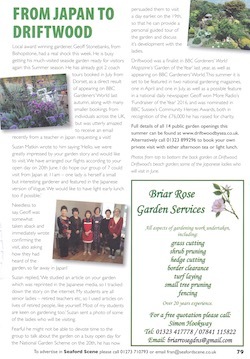 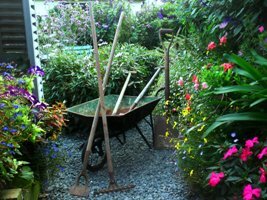 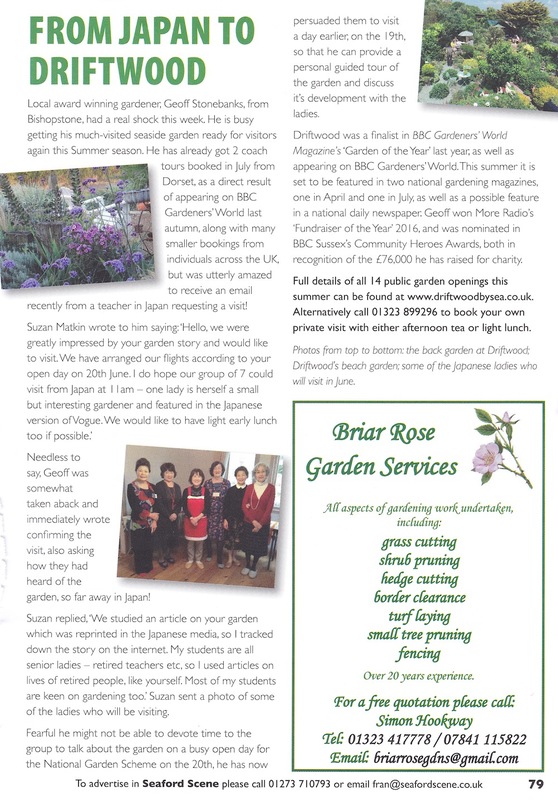 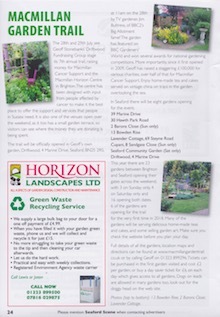 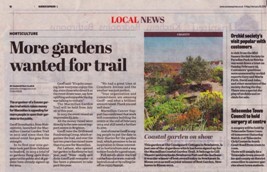 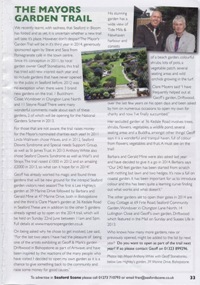 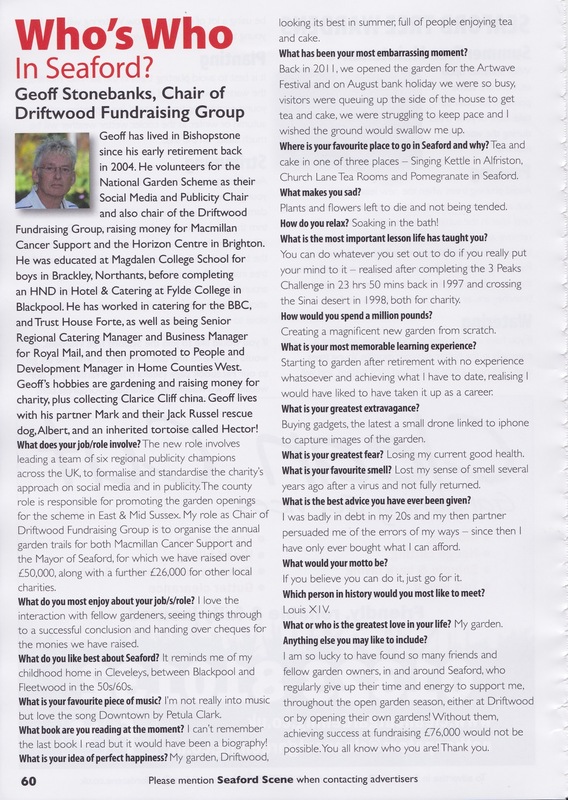 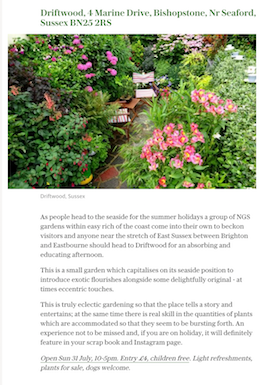 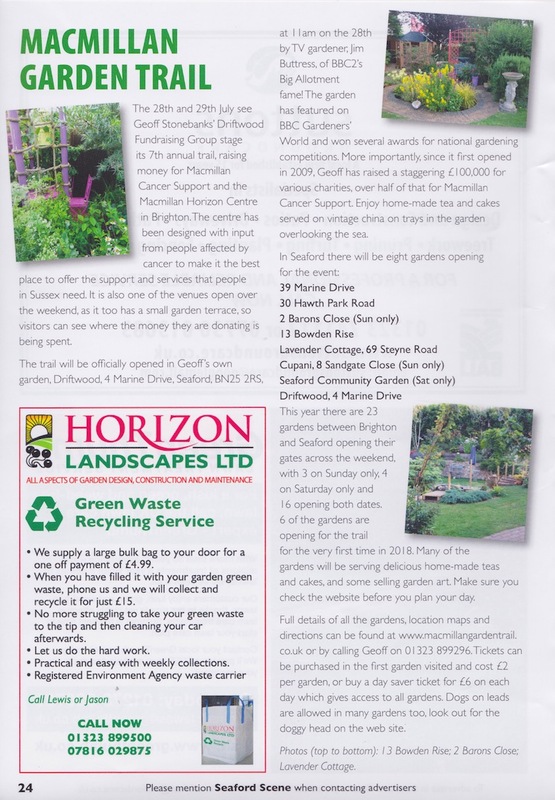 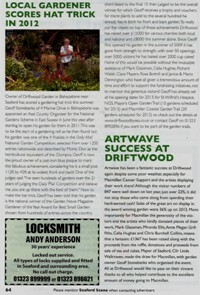 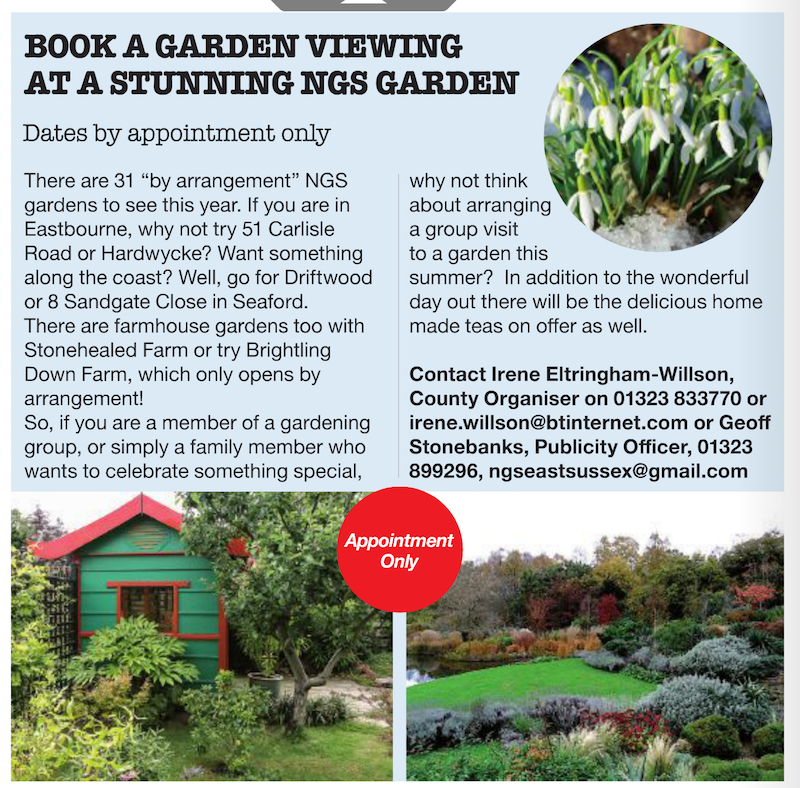 Article on two garden trails in Seaford Scene January 2016 "Garden Connections Can Spark A Growing Revolution"
Blog posted on Garden Tags new web blog 22nd January 2016. 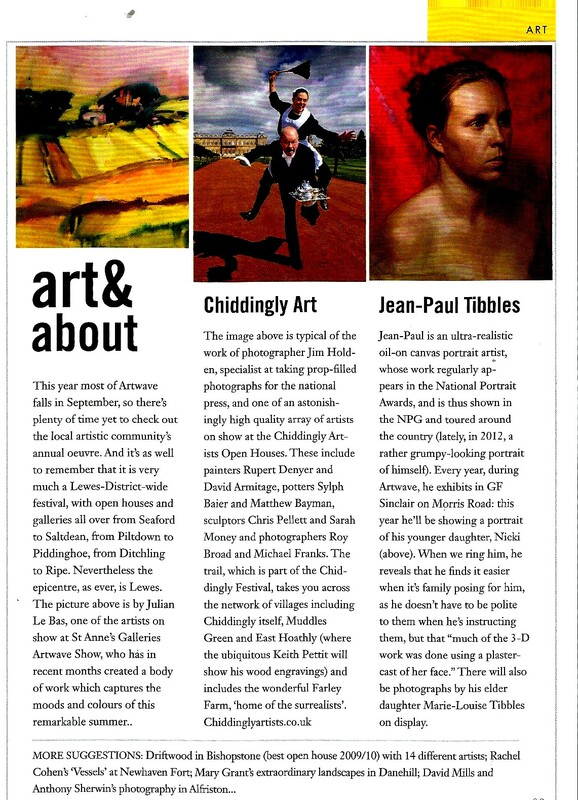 Listed in Magnet Magazine in January for appointment only visits in 2016. 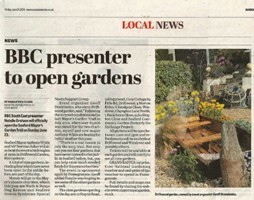 Use of garden photo on lunchtime, 7pm and 10.30 pm weather broadcasts for BBC SE Today on 14th December. 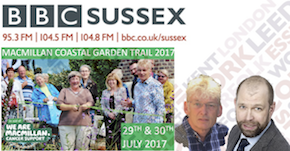 Click image for lunchtime session clip. 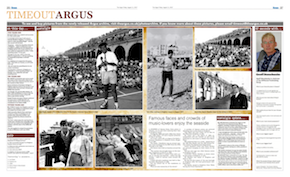 Centre-page spread in The Argus 5th October 2015, online too. 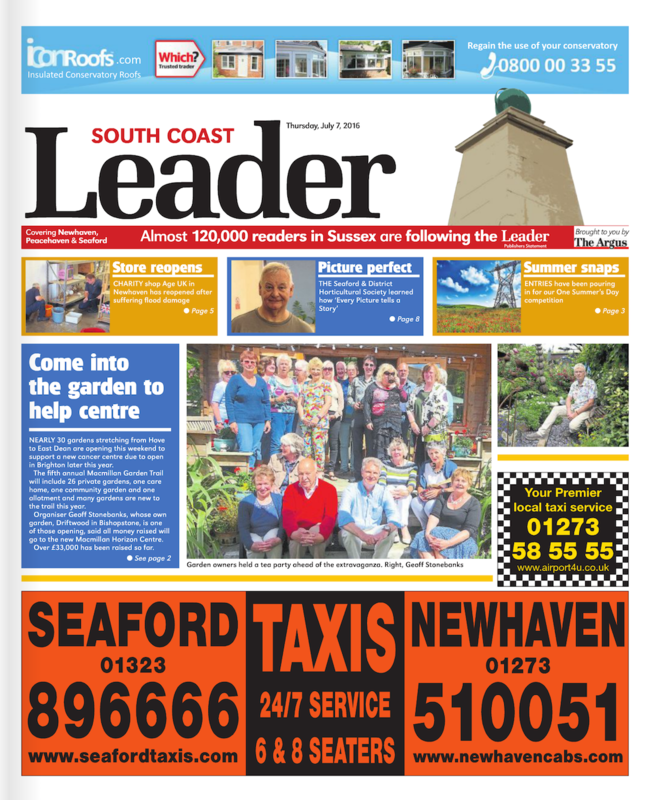 Front page of South Coast Leader 1st October 2015 Great article in The Argus on 29th September and online too. 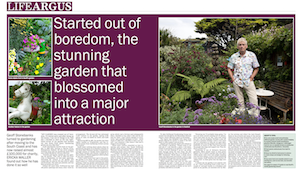 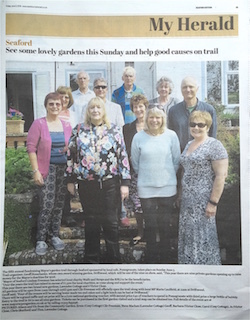 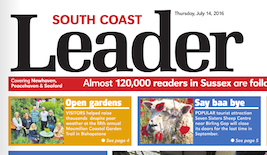 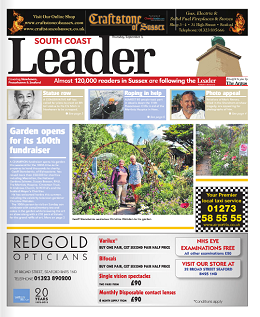 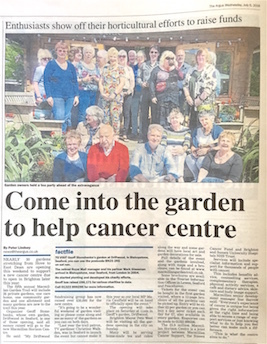 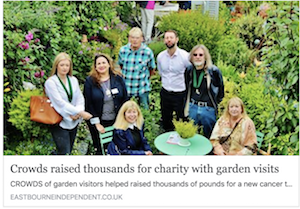 Front page coverage in South Coast Leader on 3rd September on the 100th opening of garden Article in the September issue of Seaford Scene on Macmillan Trail Feature on the garden in the Sunday Telegraph "Living" Magazine 23rd August 2015 posted on line on 1st September here. 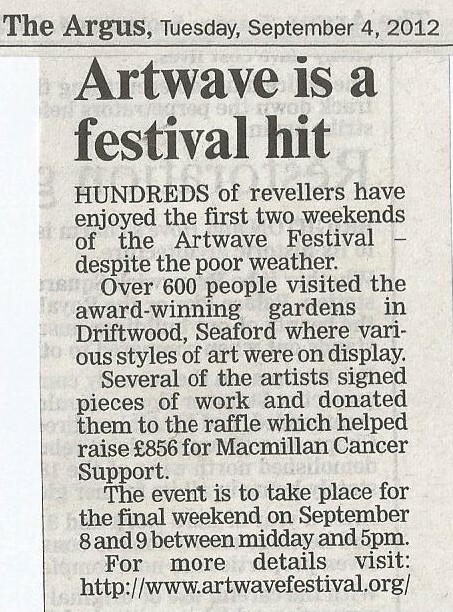 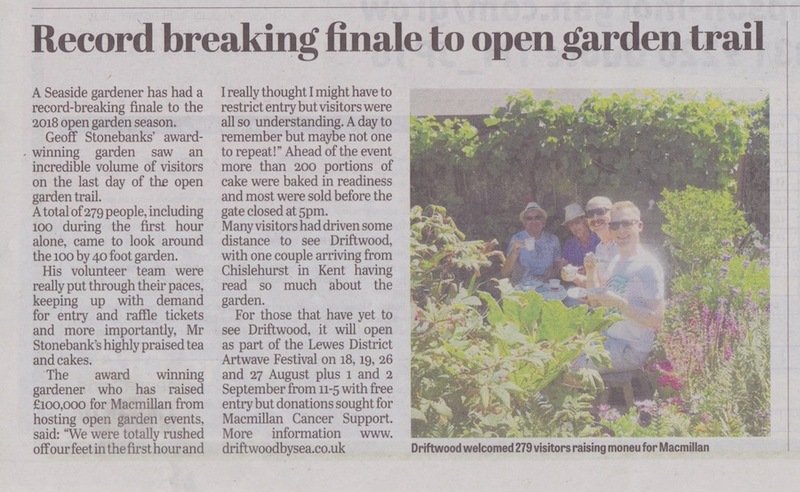 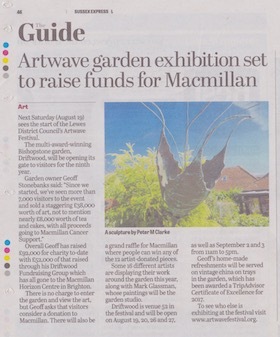 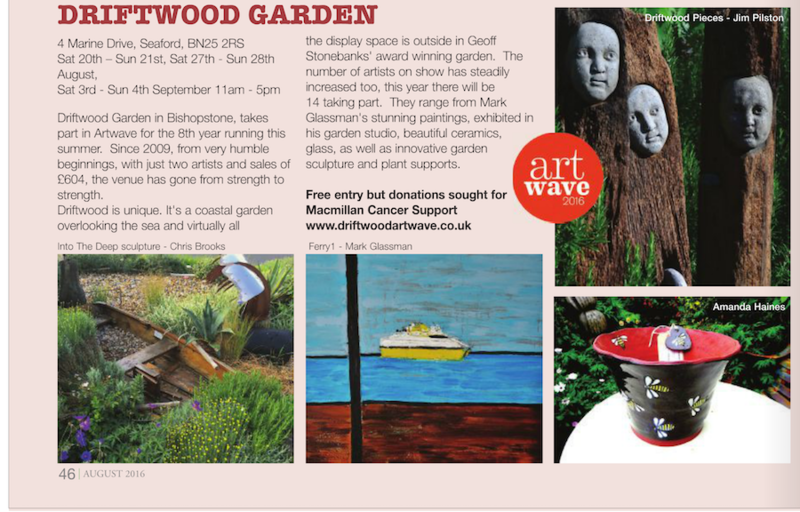 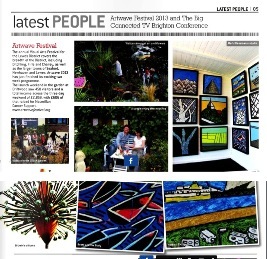 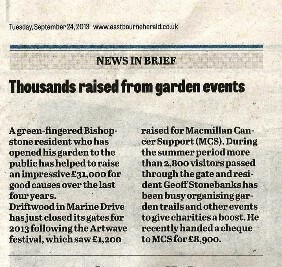 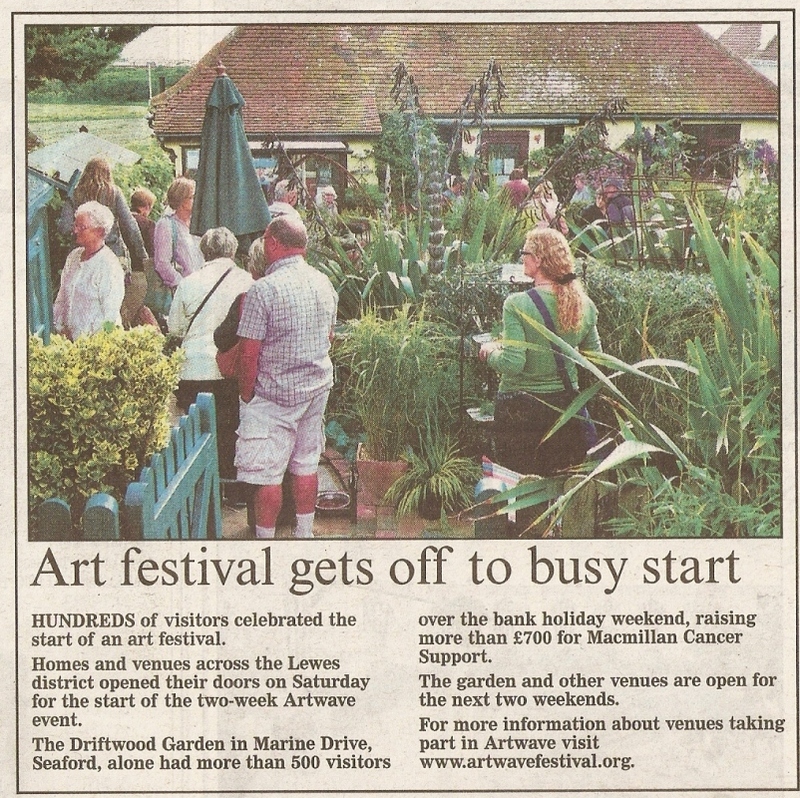 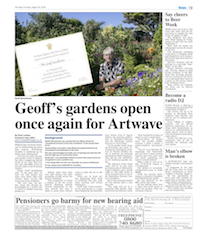 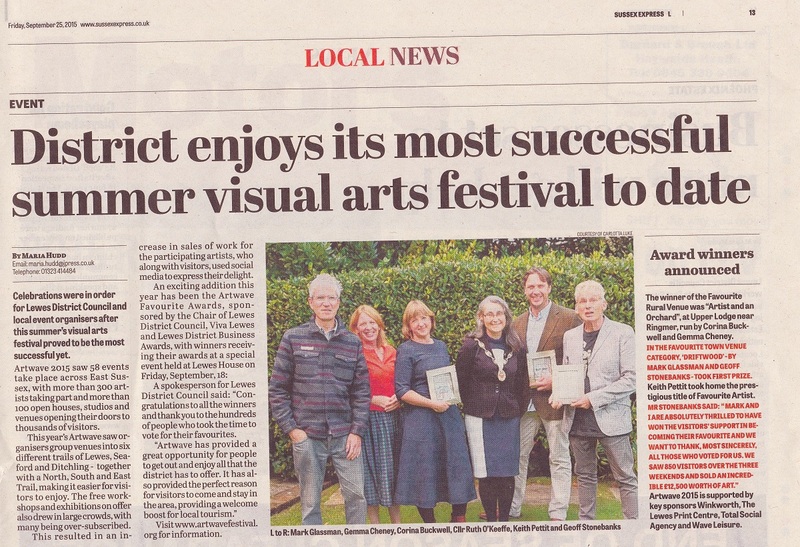 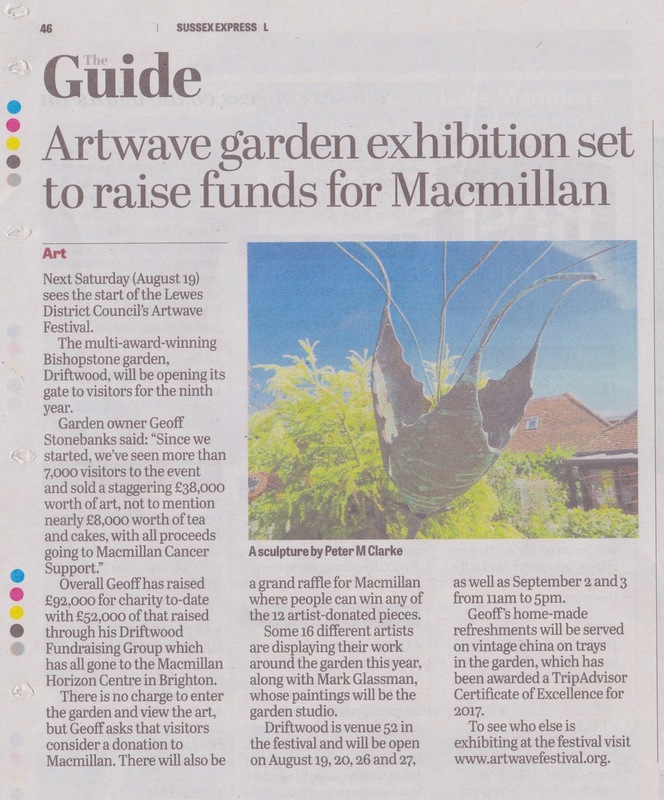 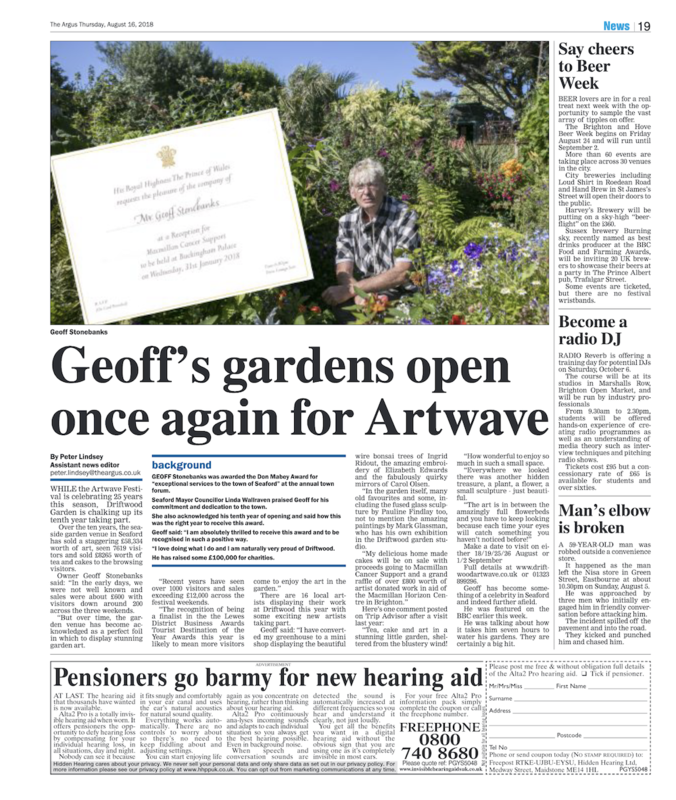 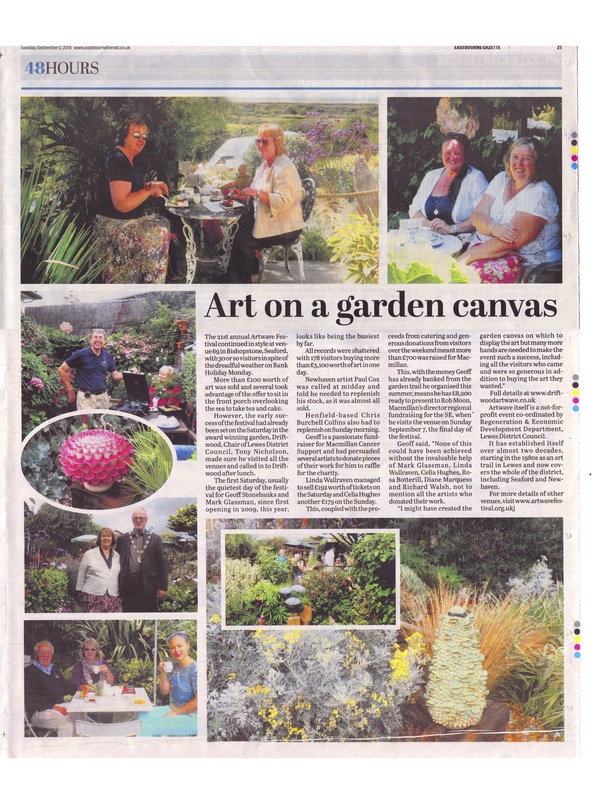 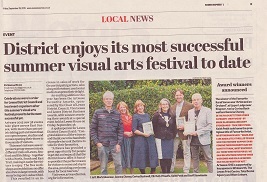 Article in Sussex Express on Artwave at Driftwood 20th August 2015 Wonderful blog written by Telegraph journalist Jean Vernon after visiting the garden in August 2015. 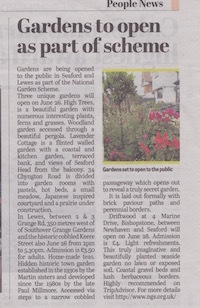 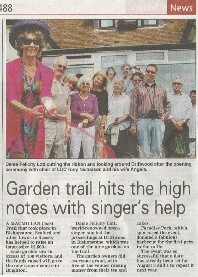 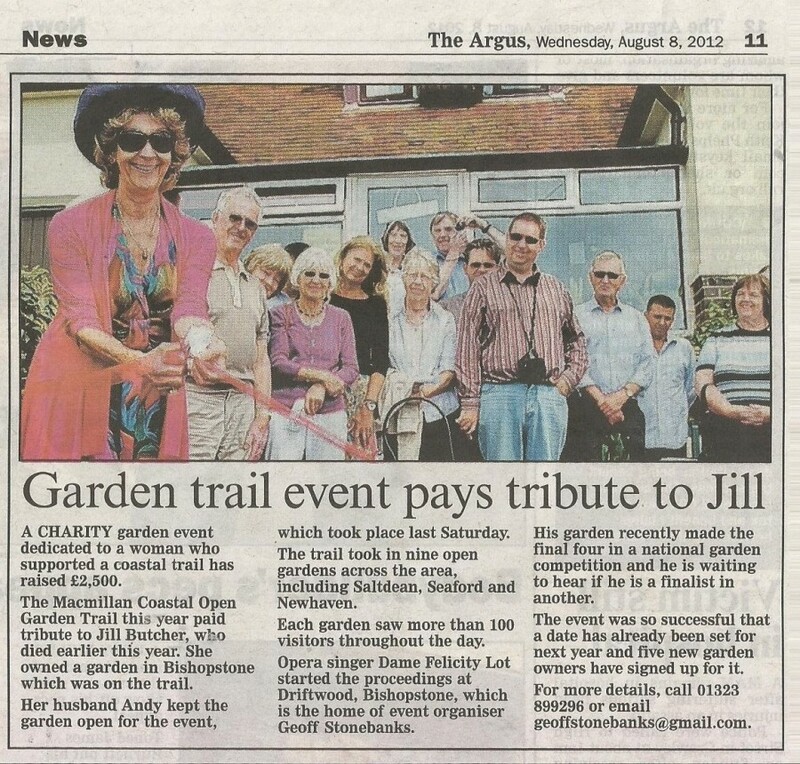 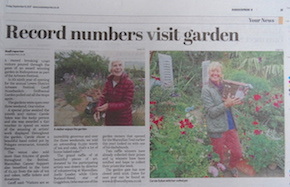 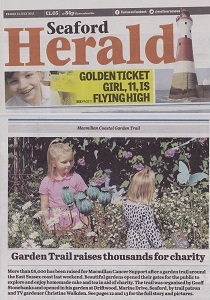 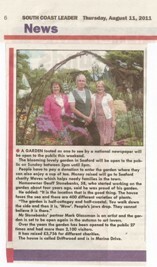 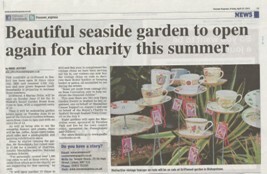 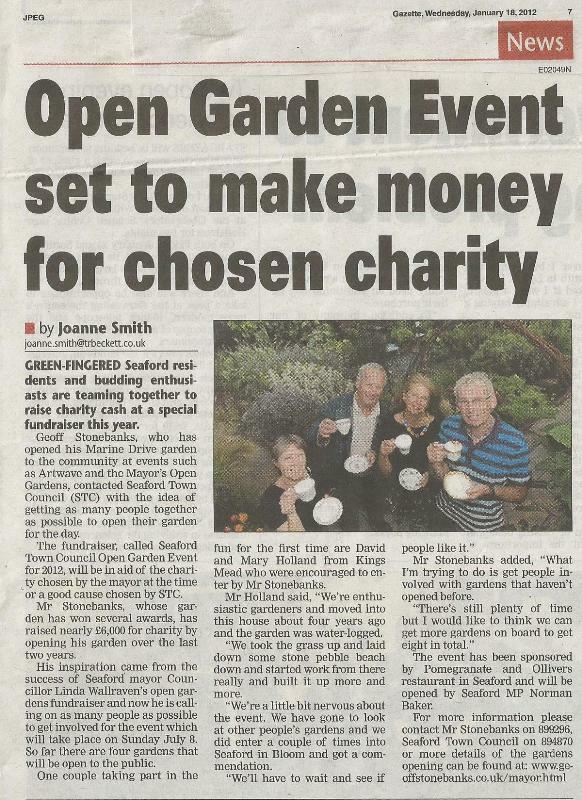 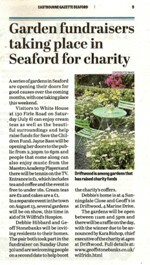 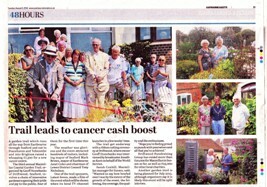 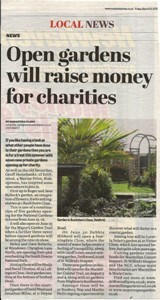 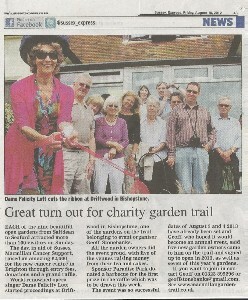 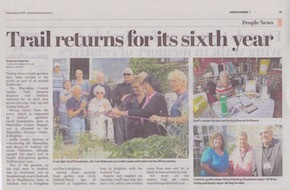 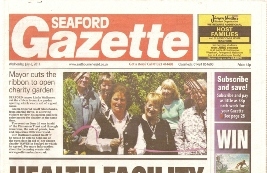 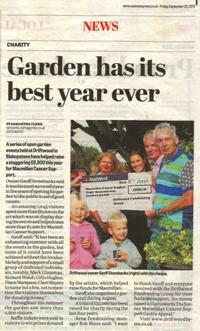 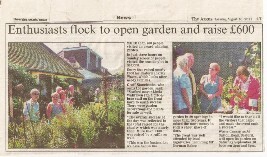 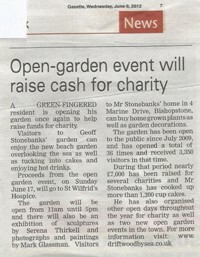 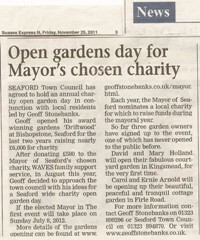 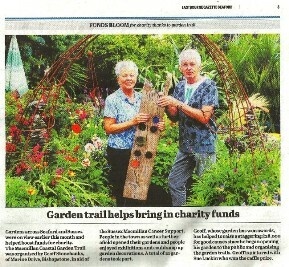 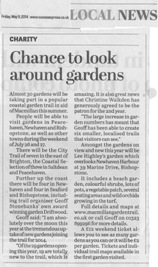 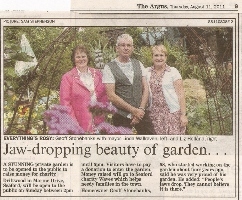 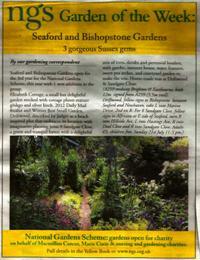 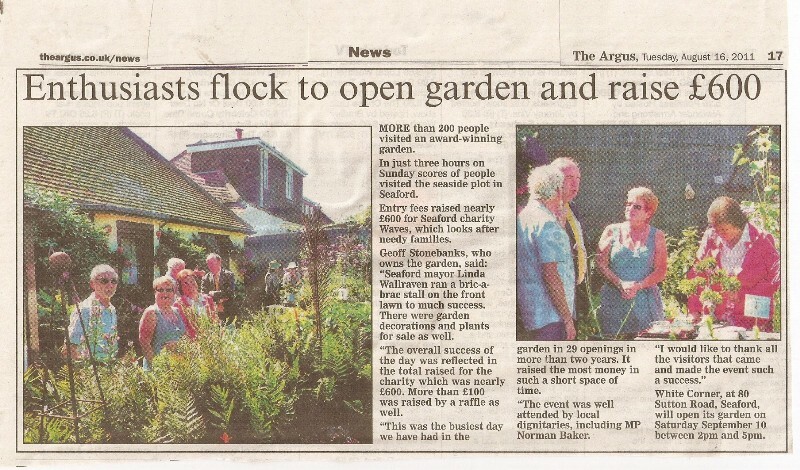 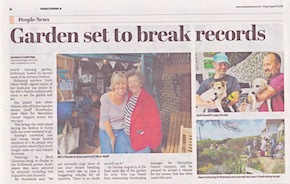 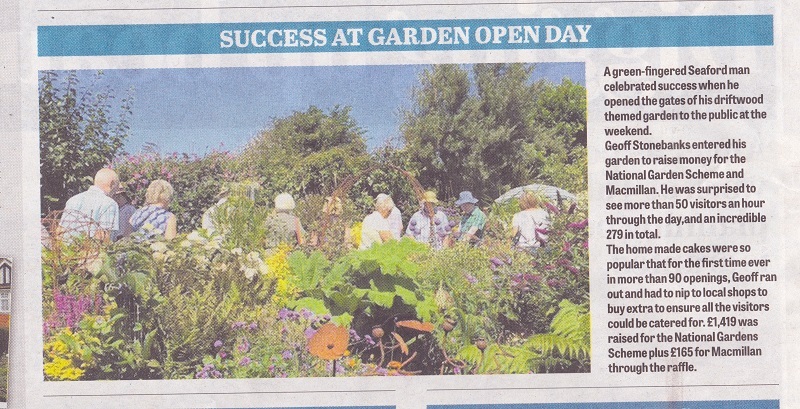 Article about final NGS opening in Seaford Herald on 14th August. 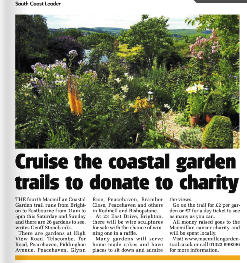 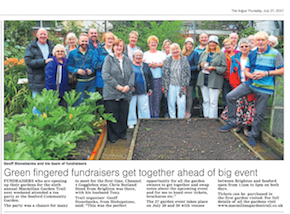 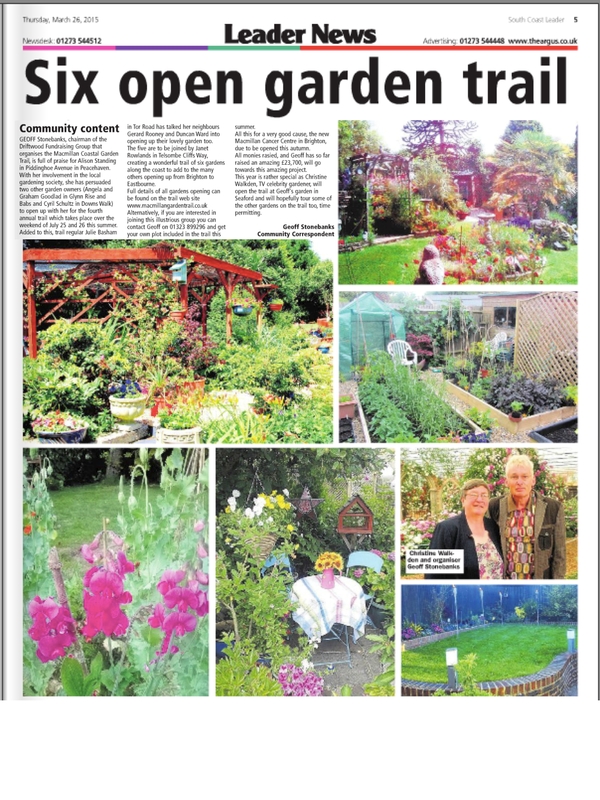 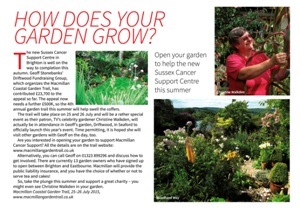 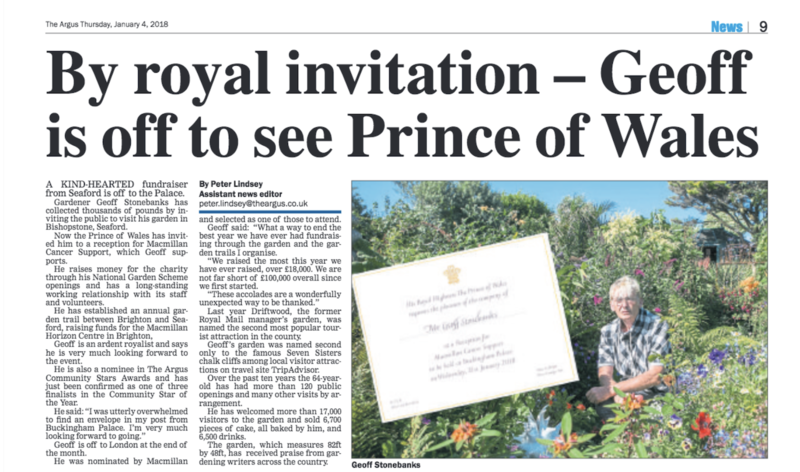 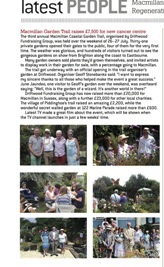 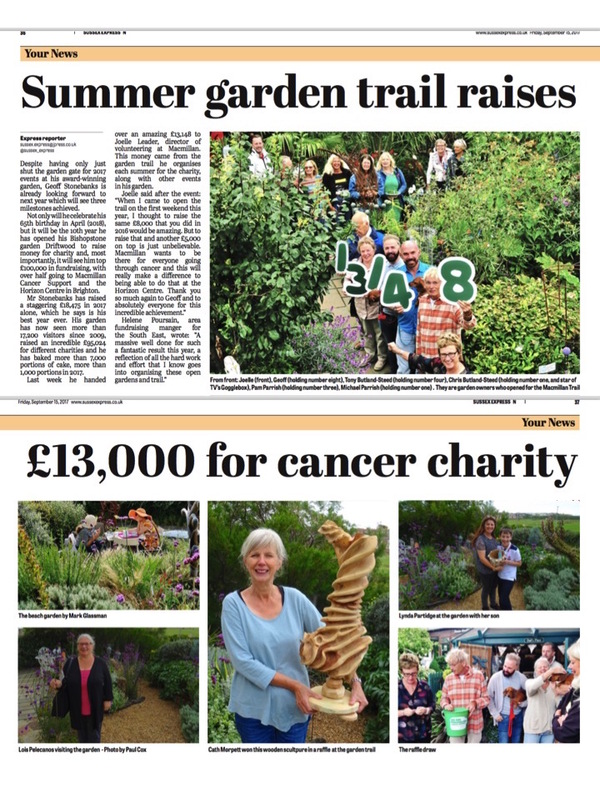 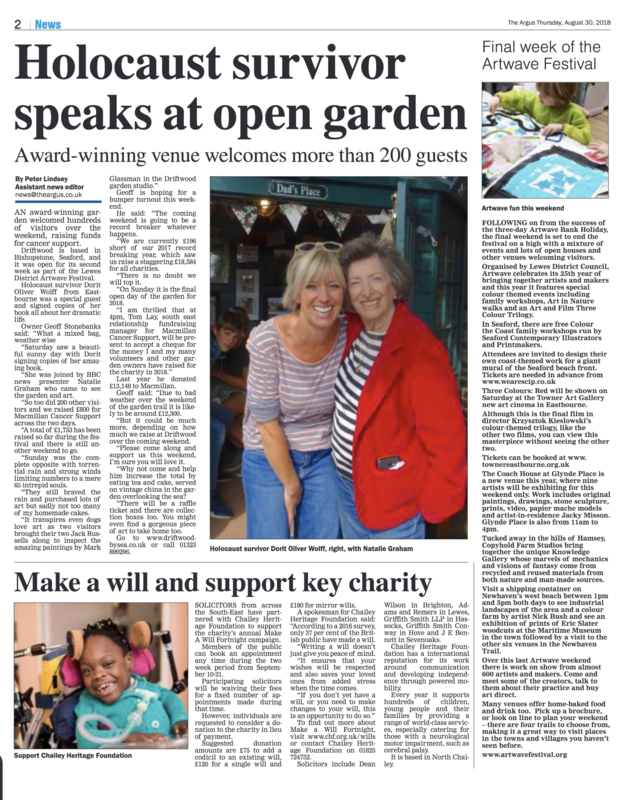 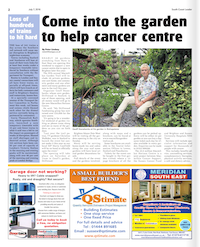 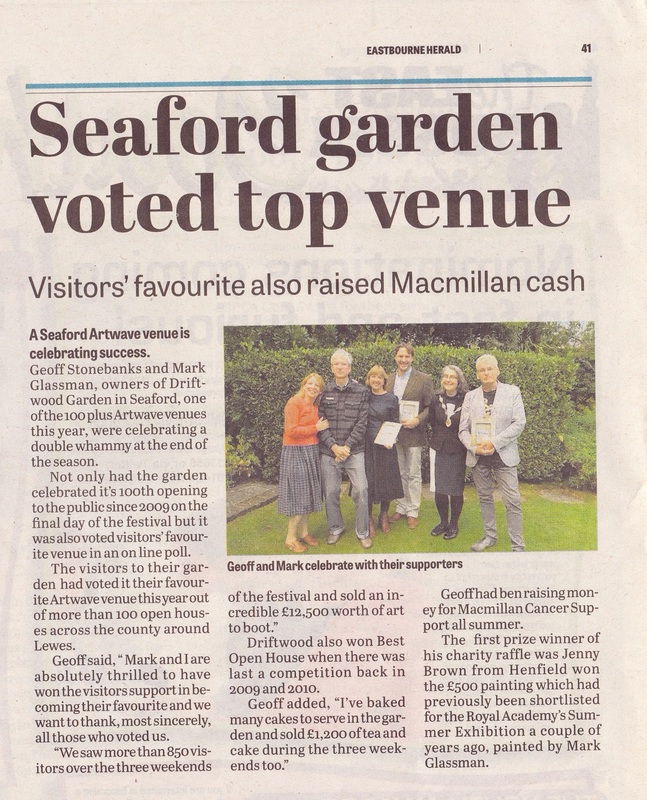 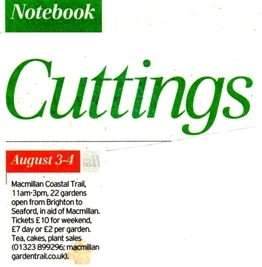 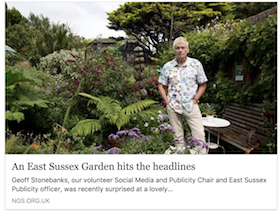 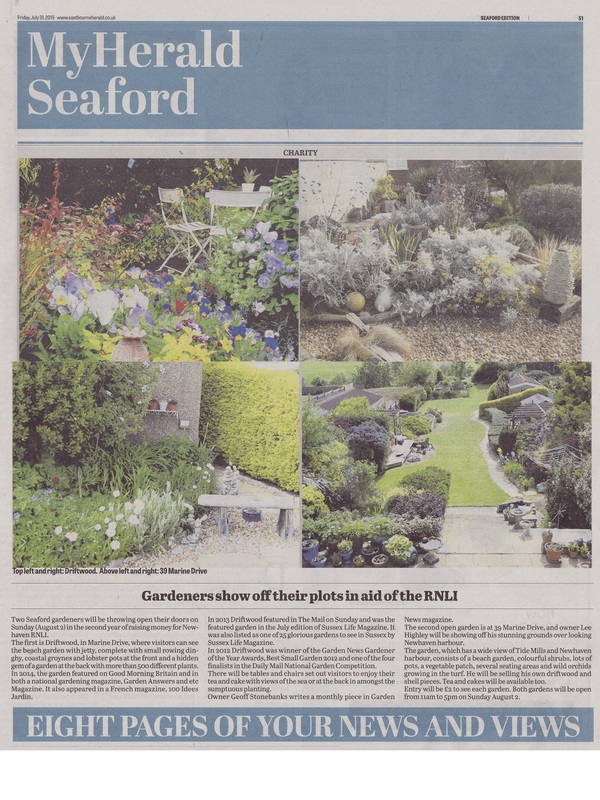 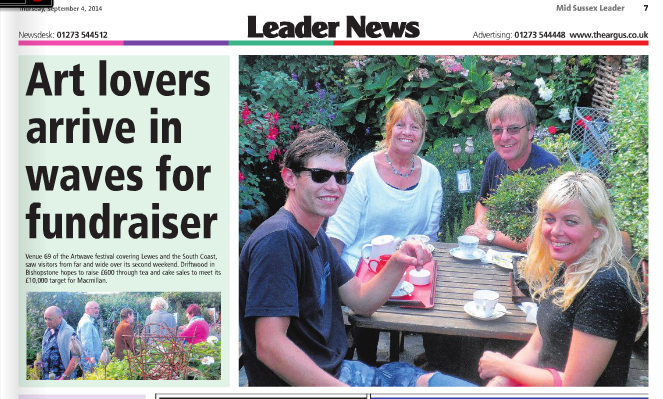 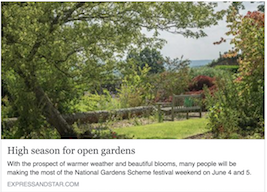 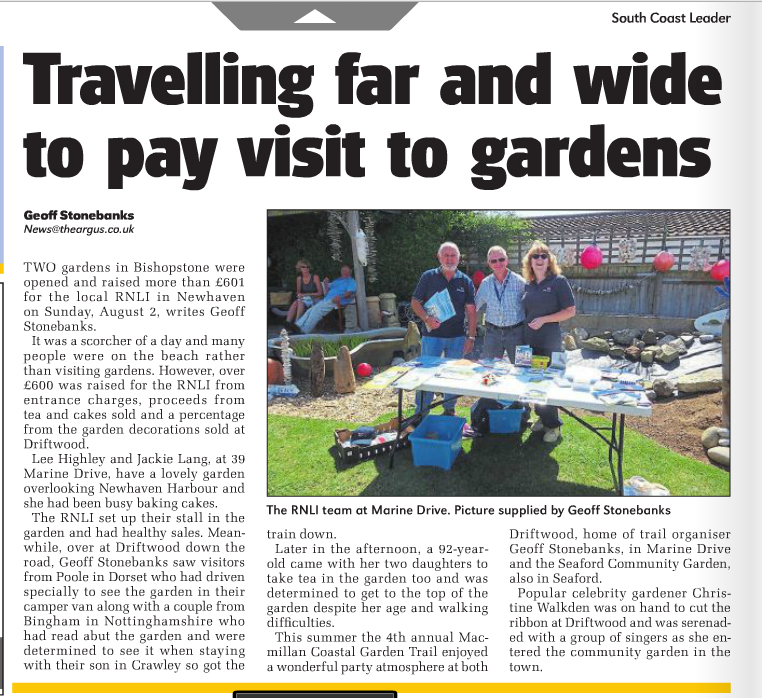 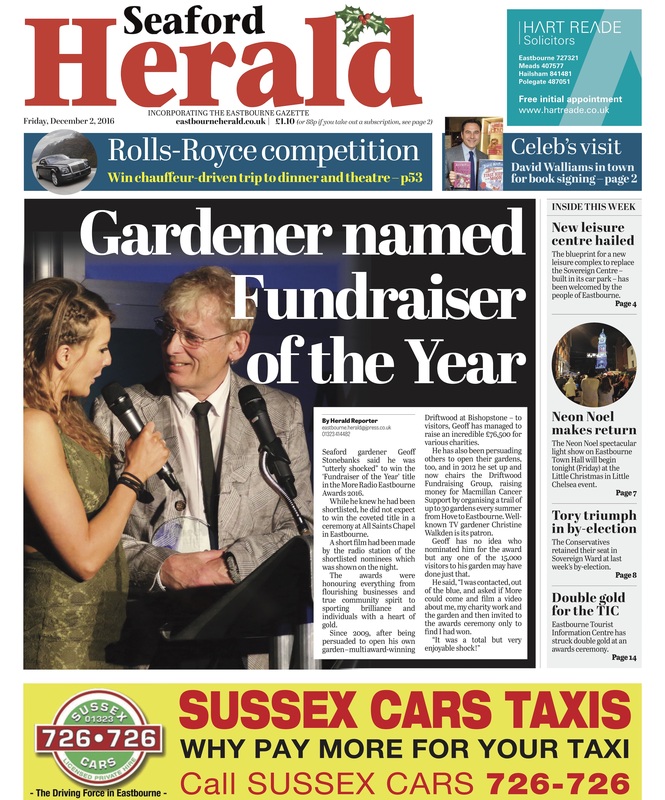 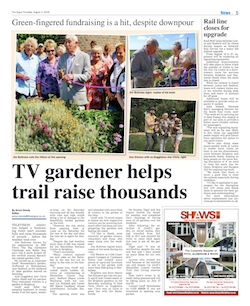 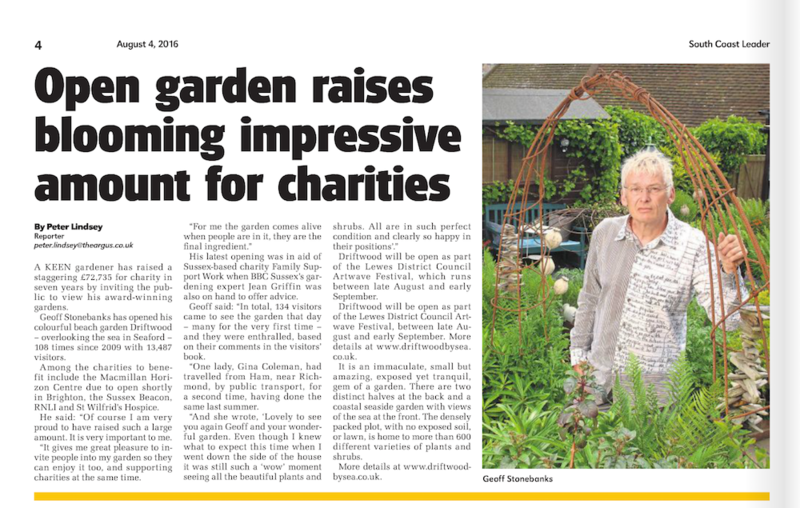 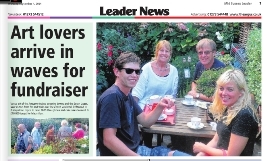 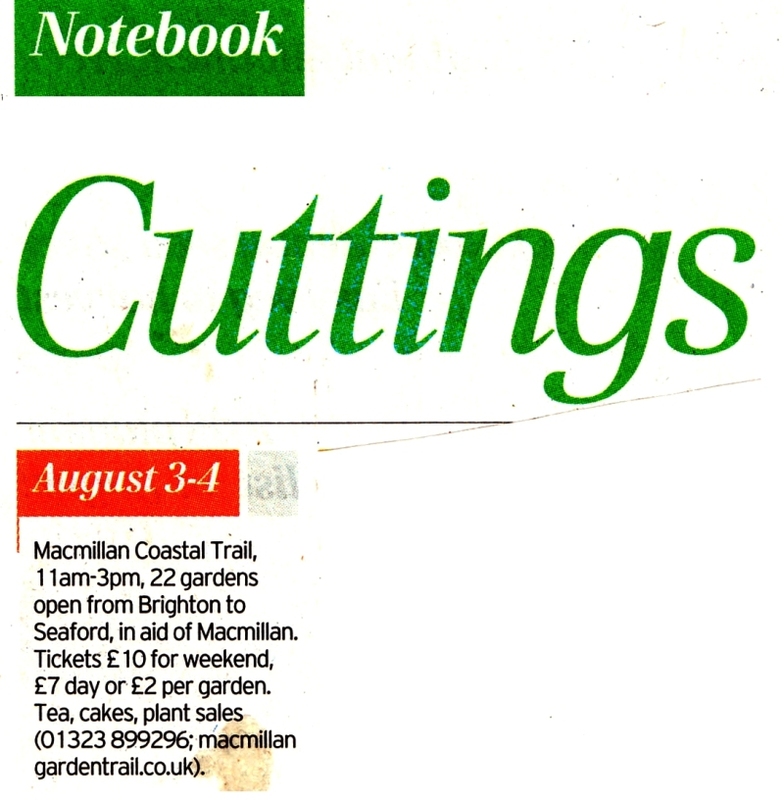 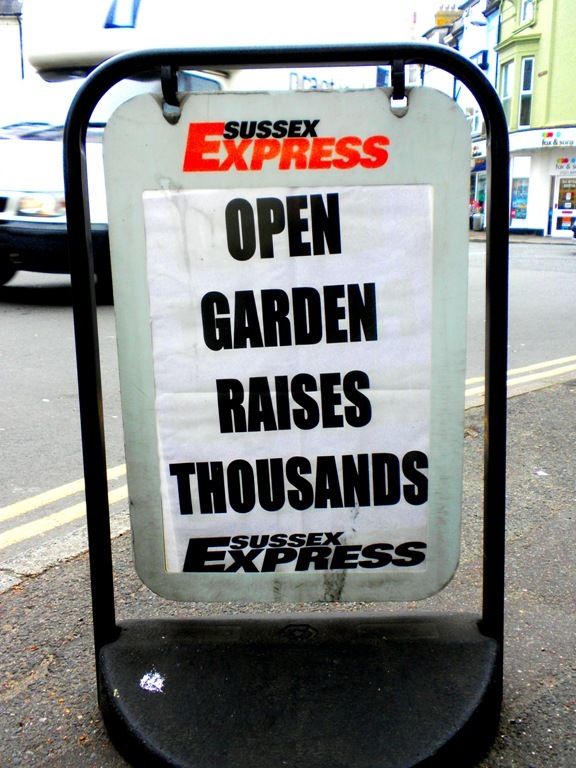 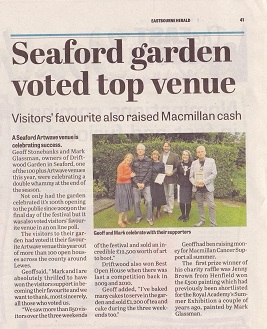 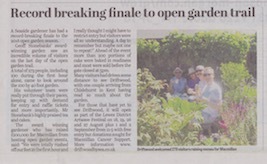 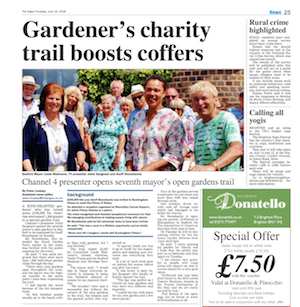 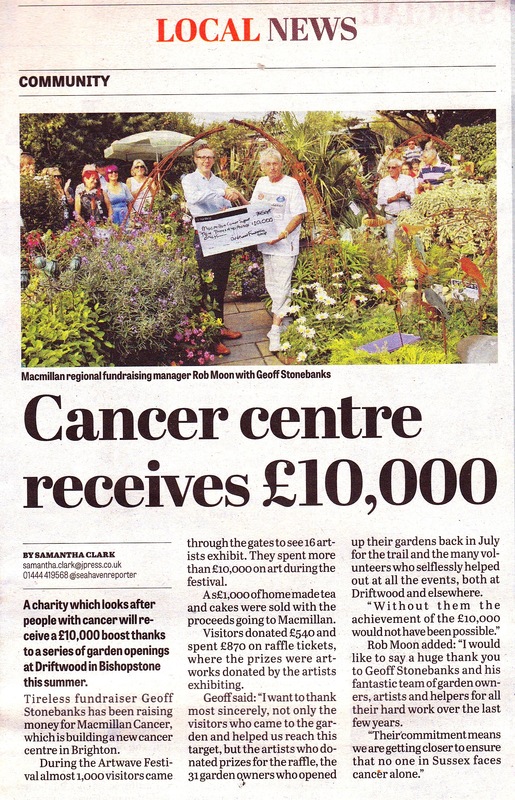 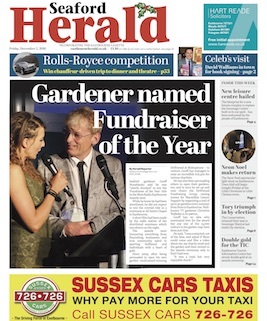 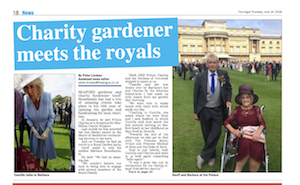 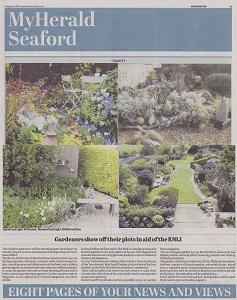 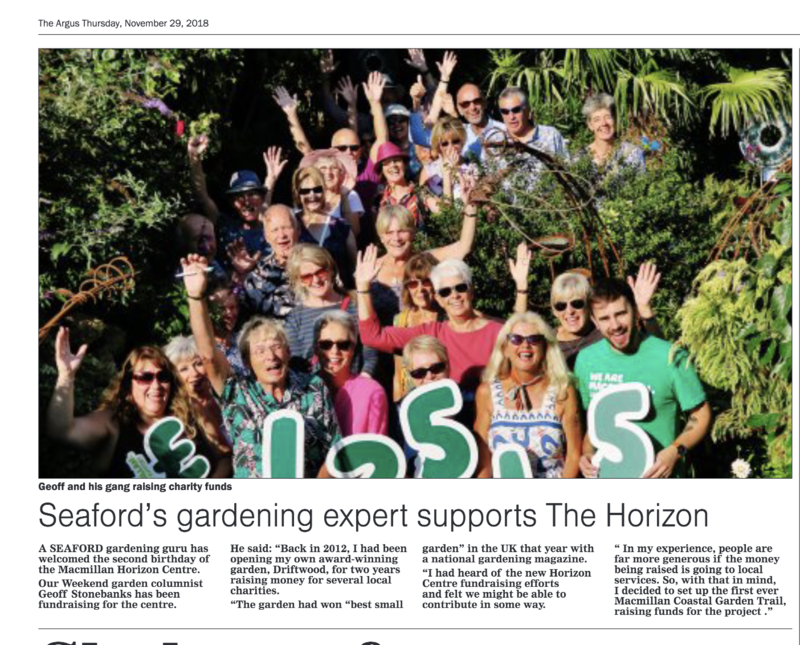 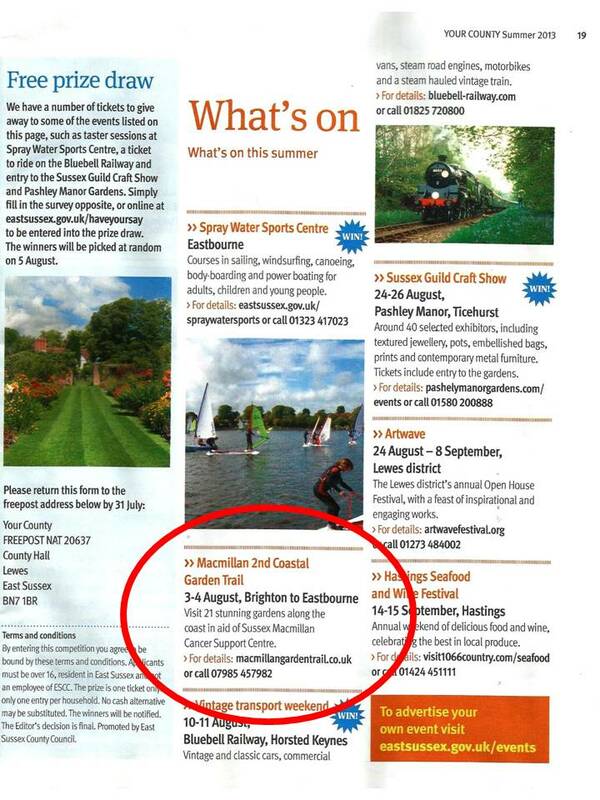 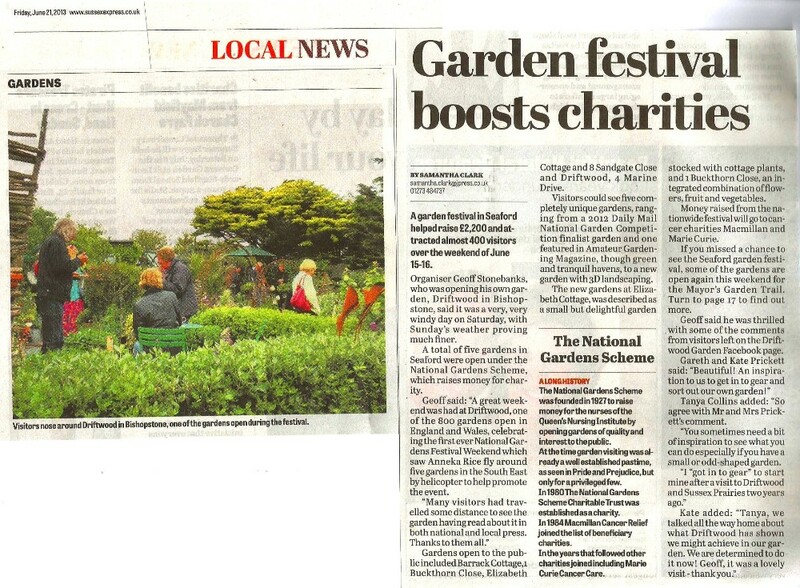 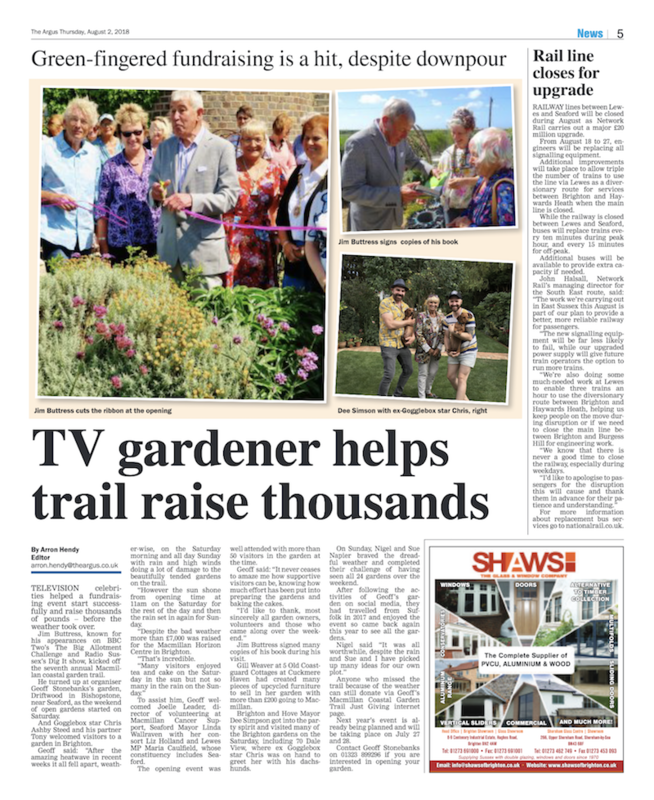 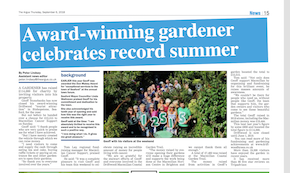 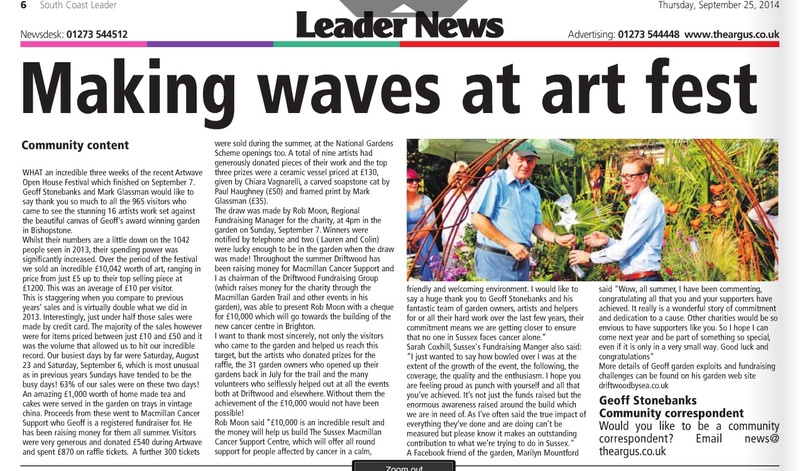 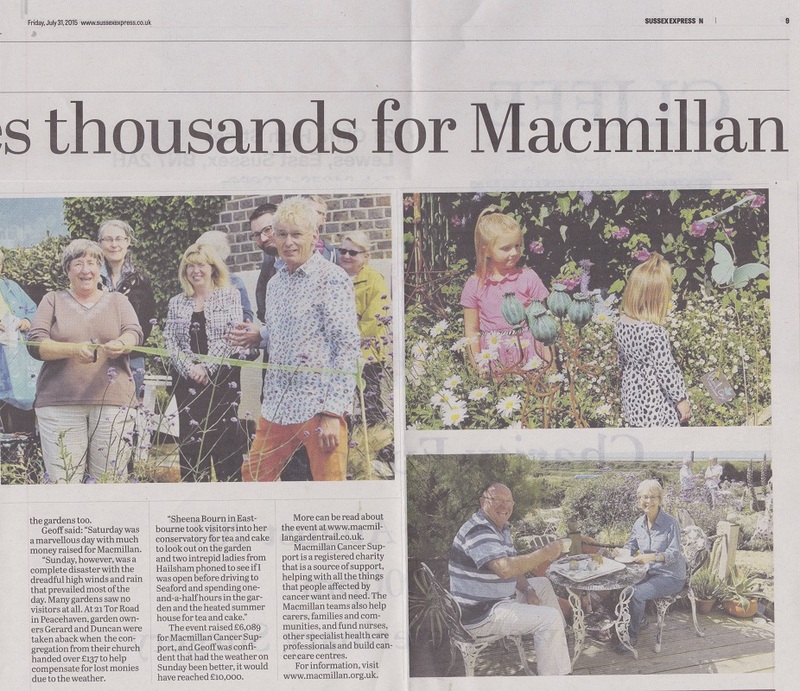 Article in South Coast leader about RNLI and Macmillan open gardens 13th August 2015 On line article about final NGS opening 10th August 2015 Article about RNLI opening Sussex Express 7th August. 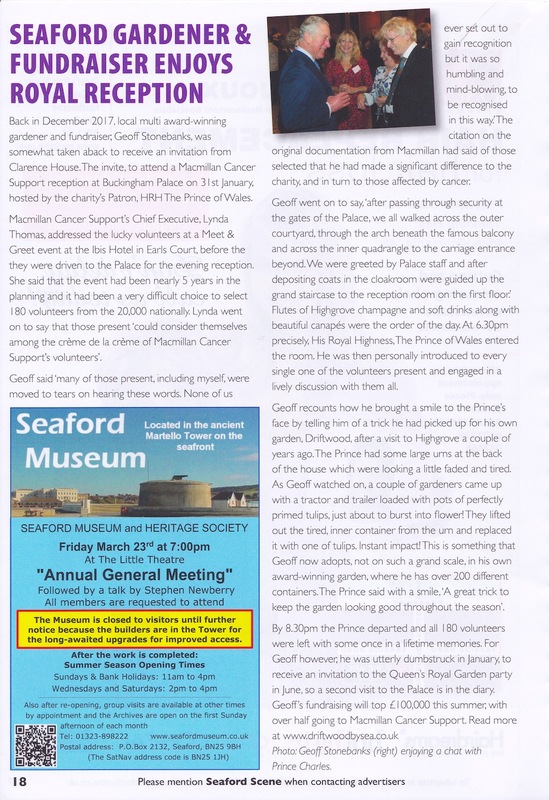 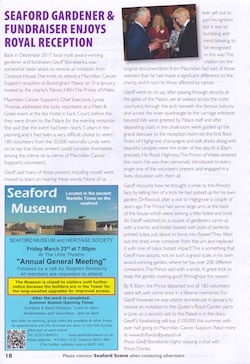 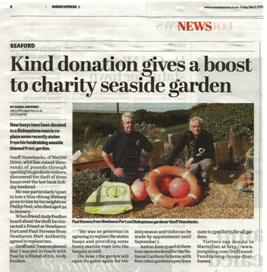 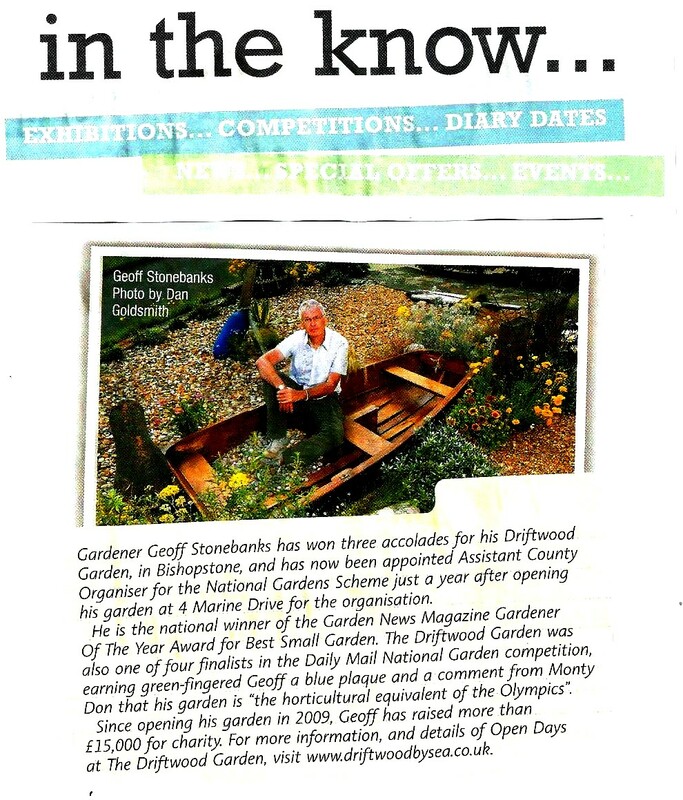 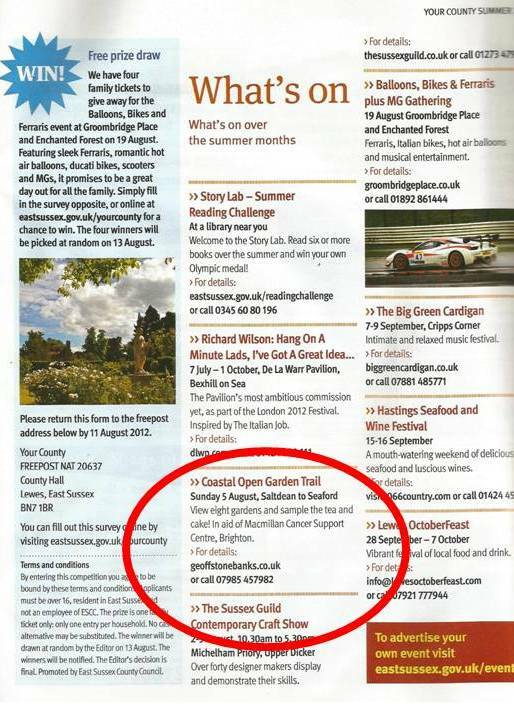 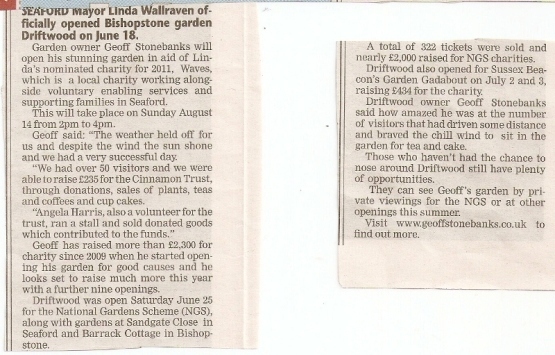 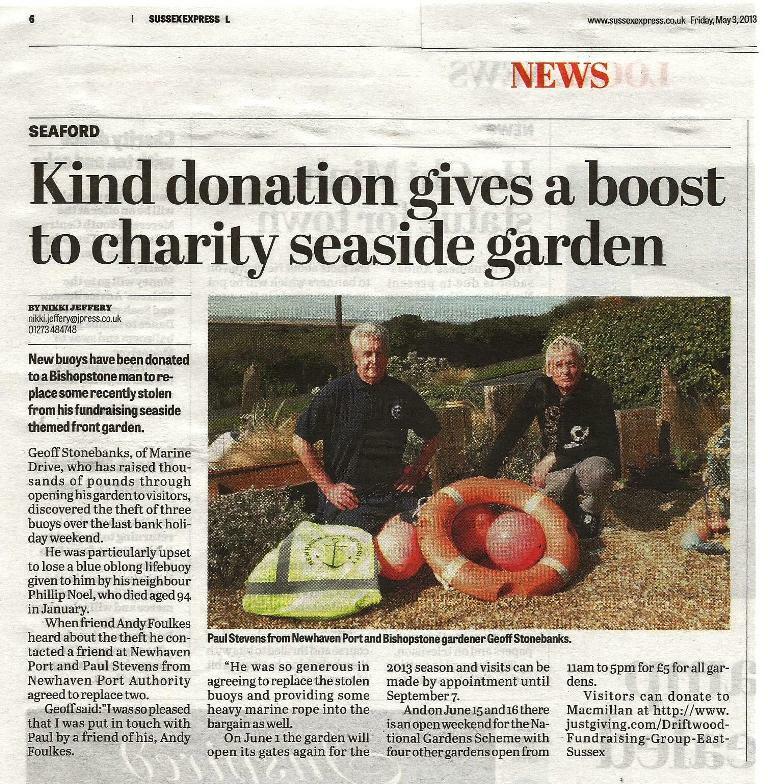 On line feature on Macmillan Tail August 2015 News item on Driftwood opening for NGS on Hugo Fox news August 2015 Full page in Seaford Herald to promote RNLI open Day on 31st July 2015. 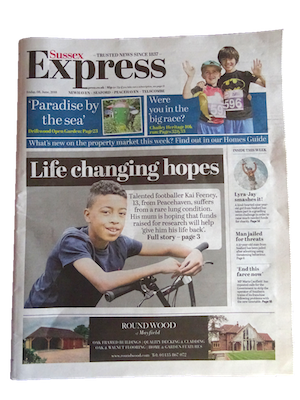 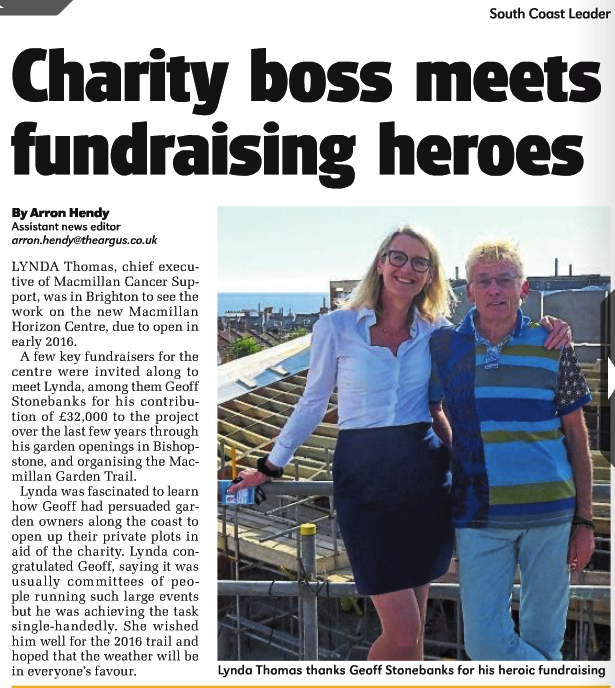 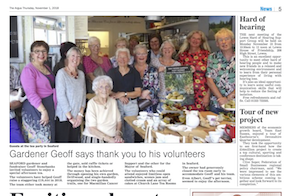 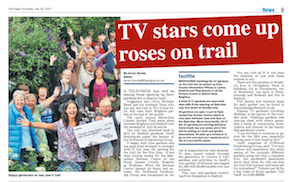 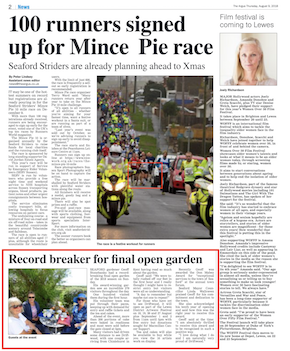 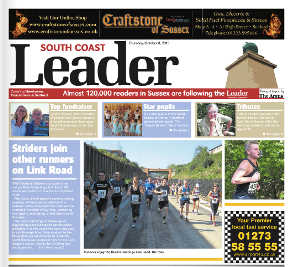 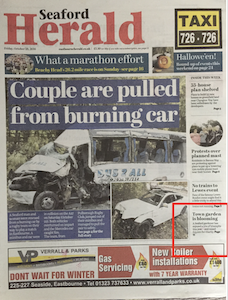 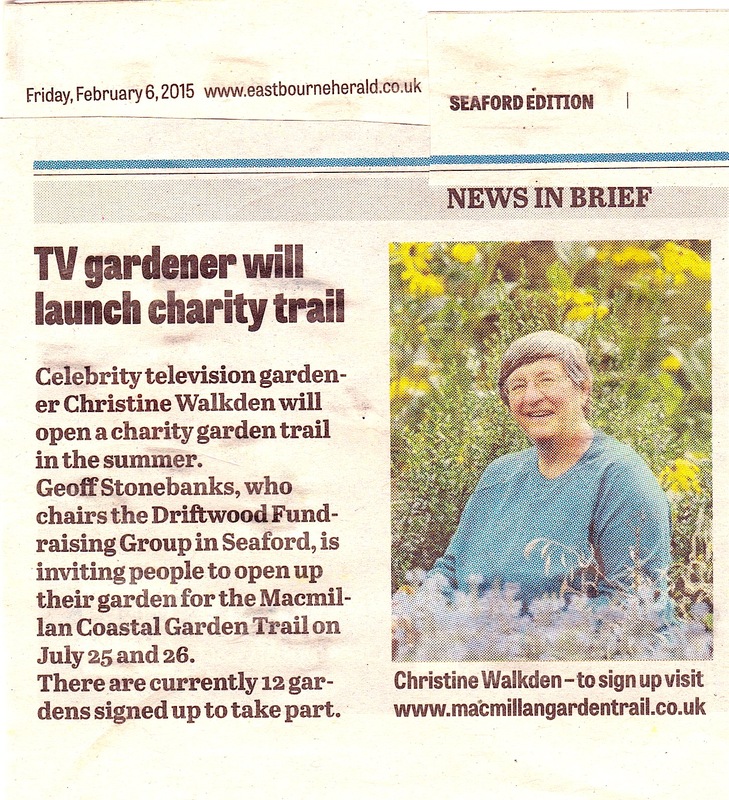 2 page spread in Seaford Herald for Macmillan Trail and update on page 3 on 31st July 2015" Front page of Sussex Express 31st July for Macmillan Trail and 2 page coverage inside. 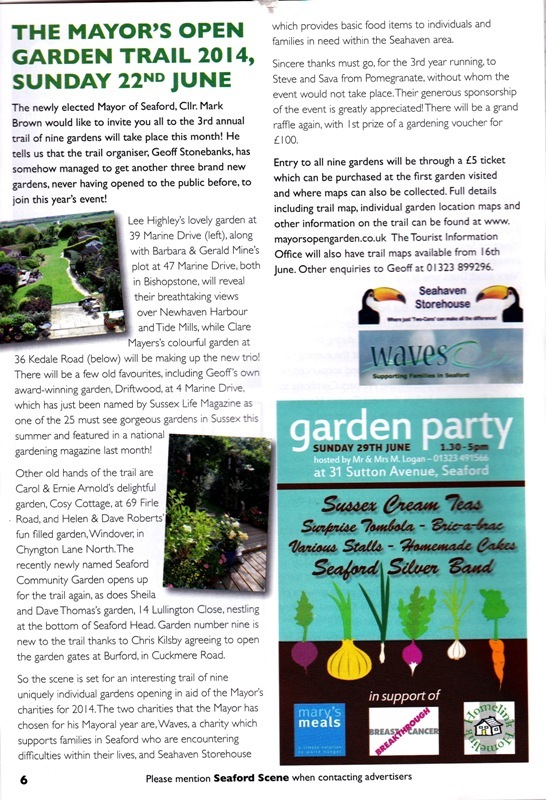 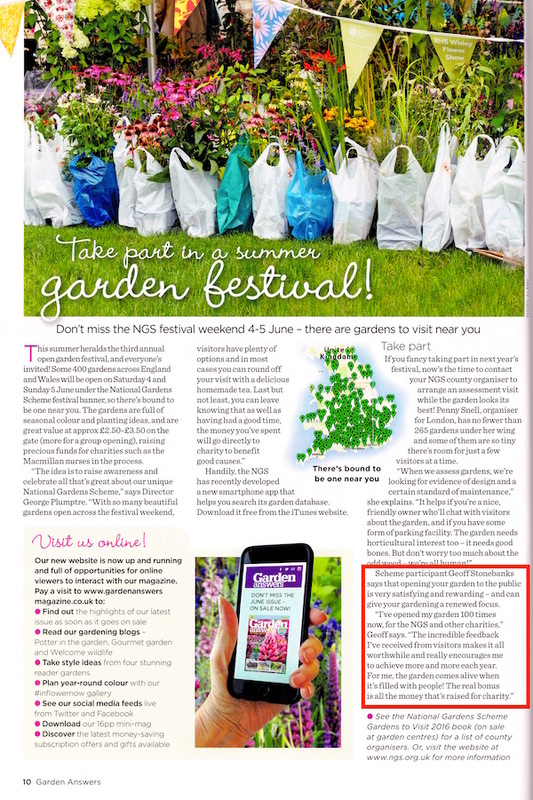 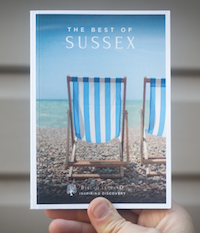 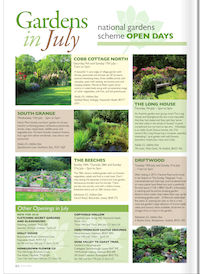 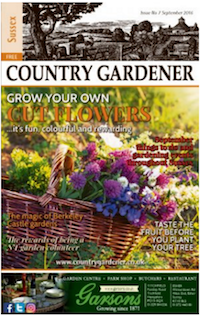 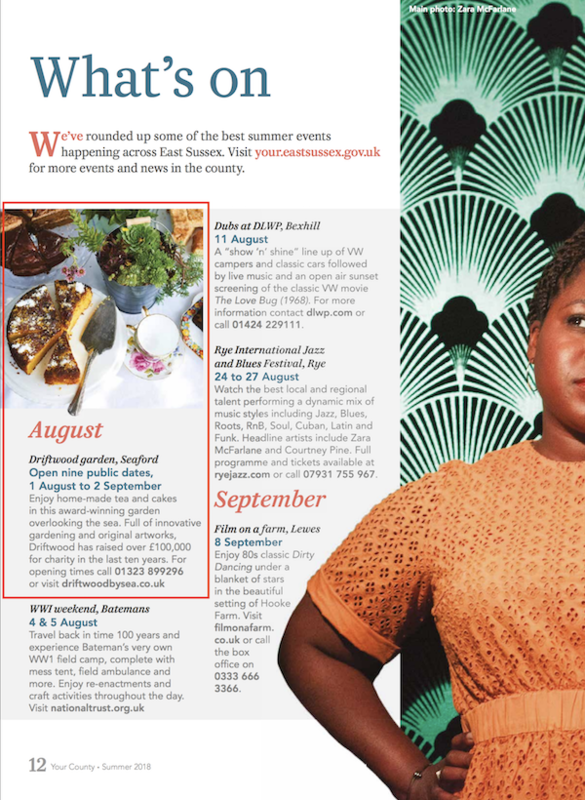 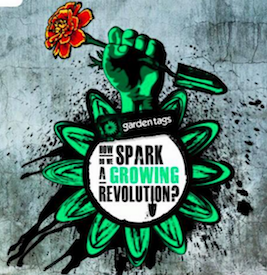 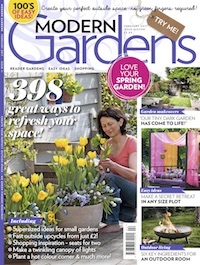 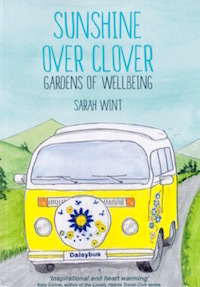 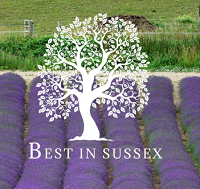 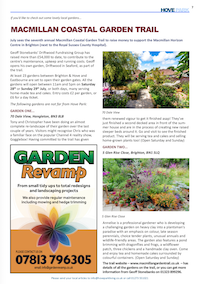 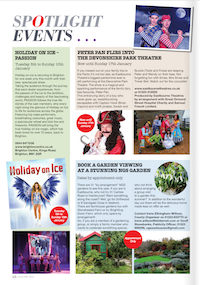 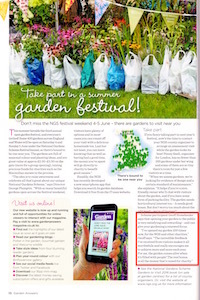 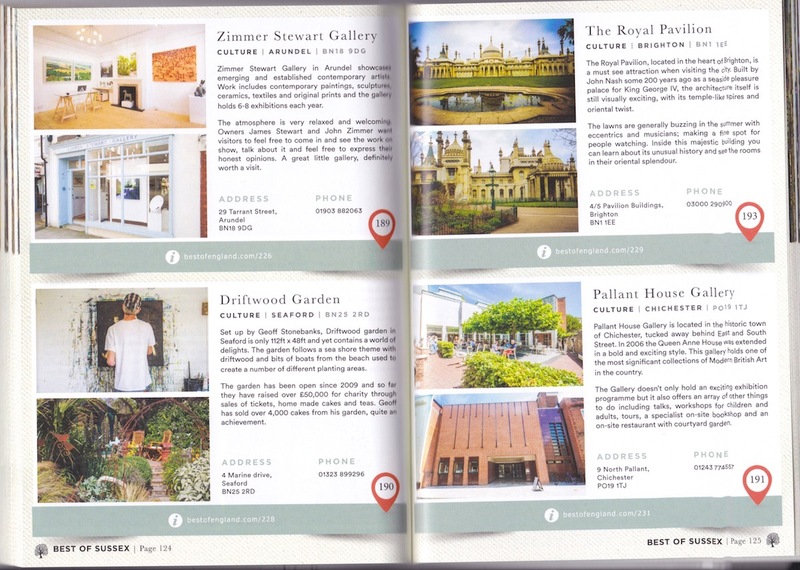 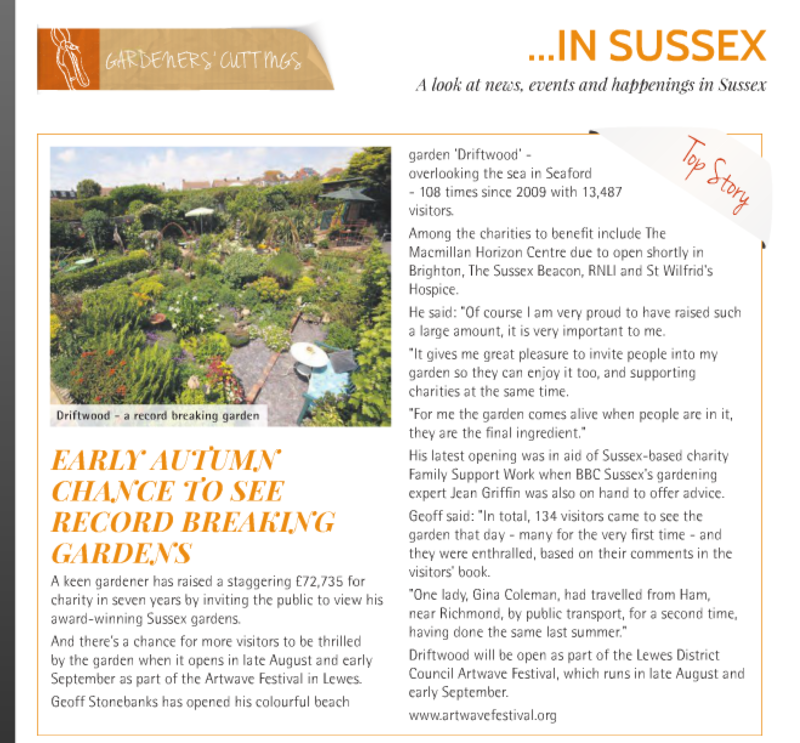 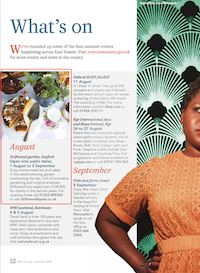 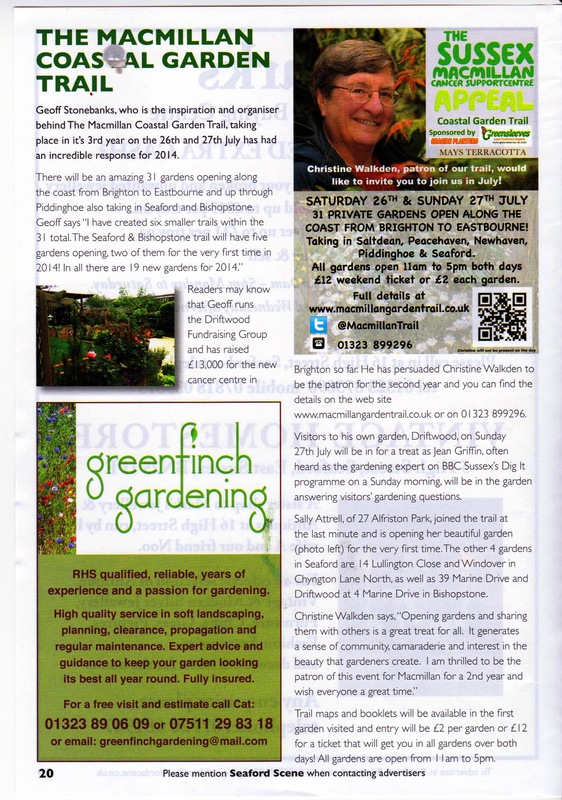 Read page 1 and page 2 by clicking links Garden listed on Best In Sussex web site August 2015. 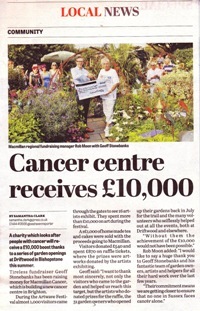 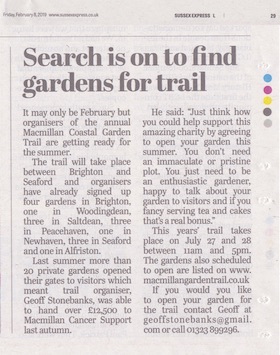 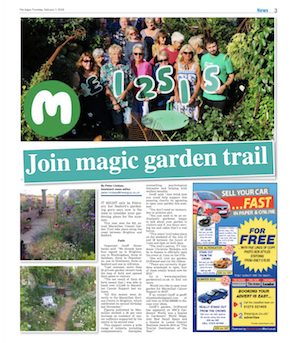 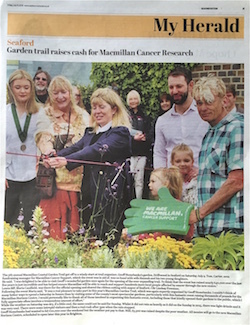 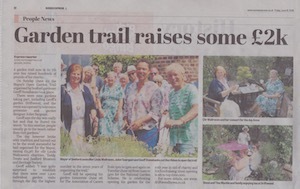 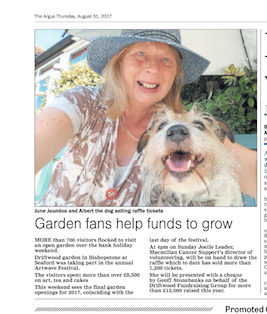 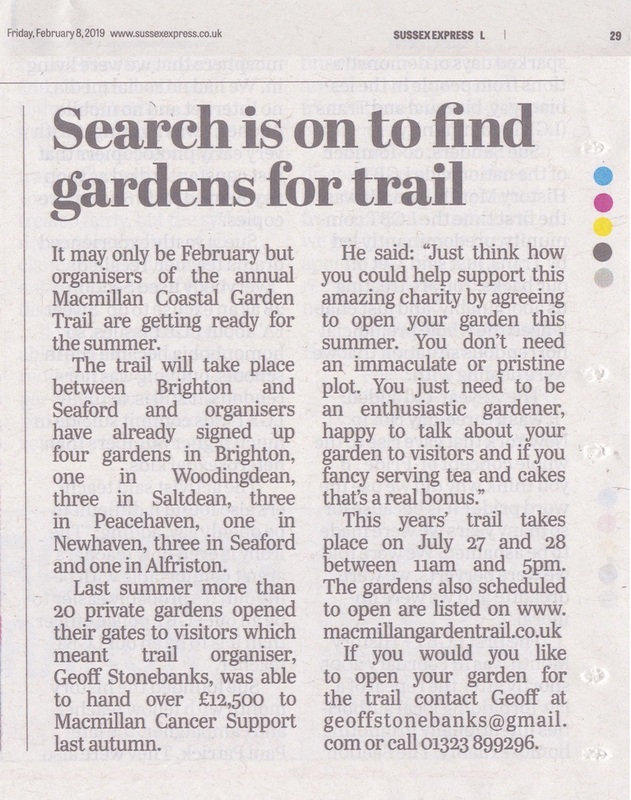 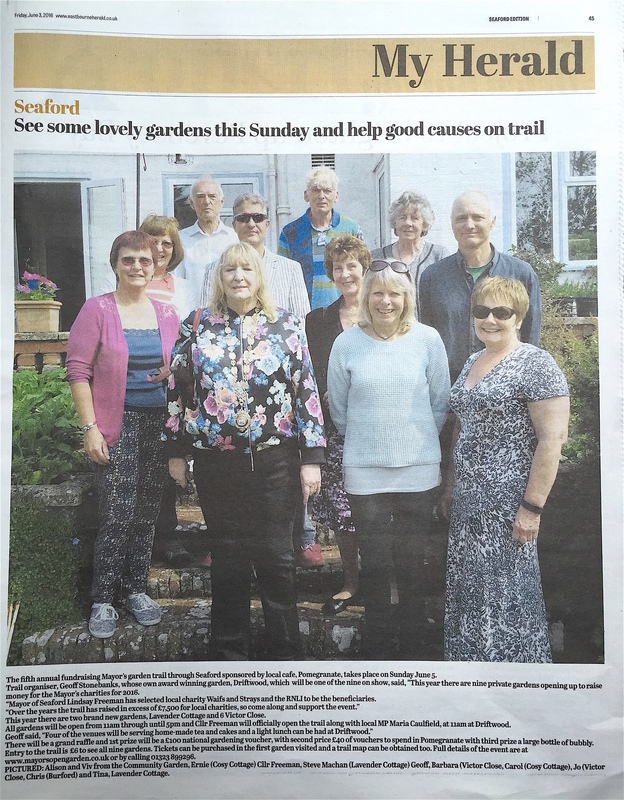 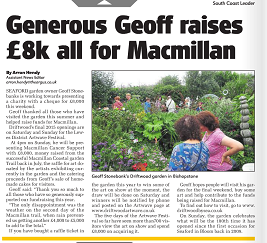 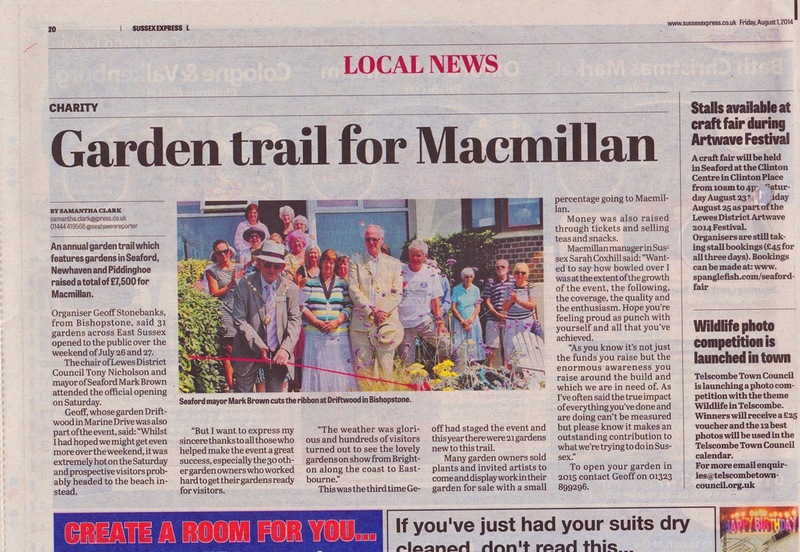 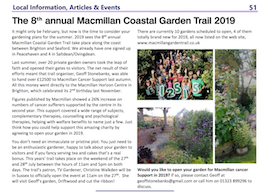 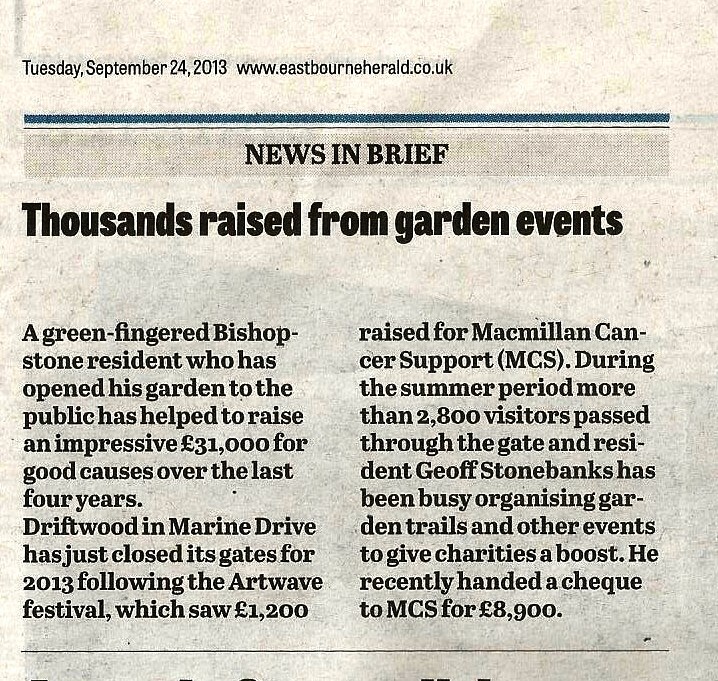 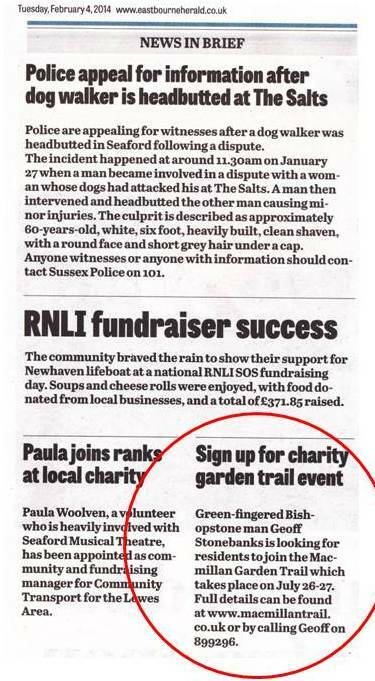 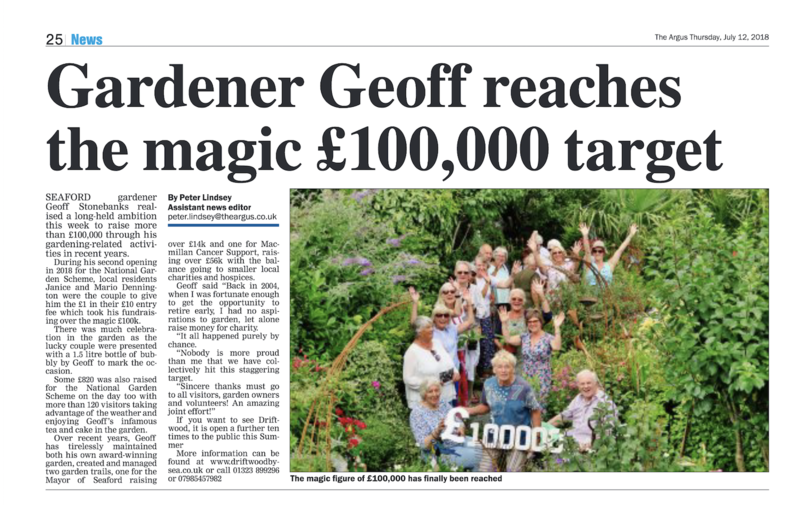 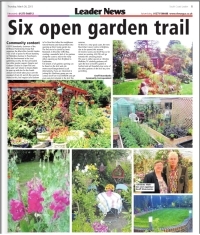 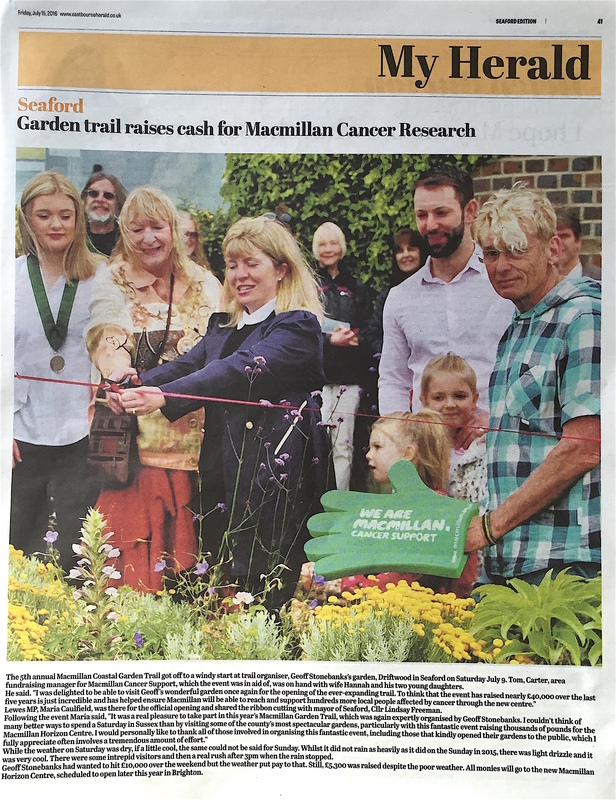 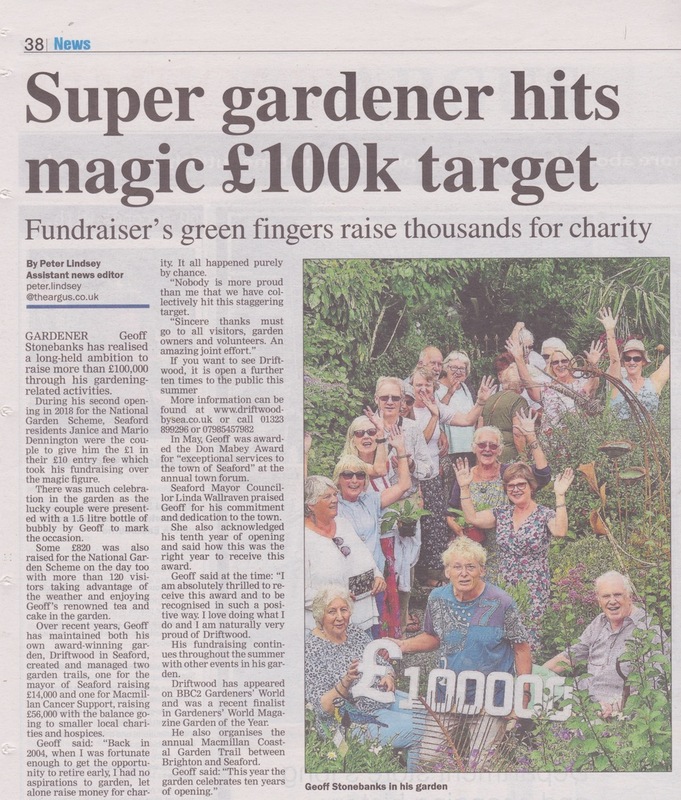 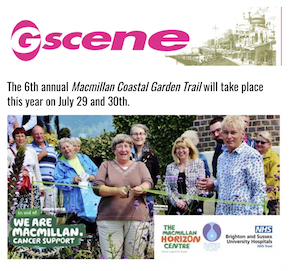 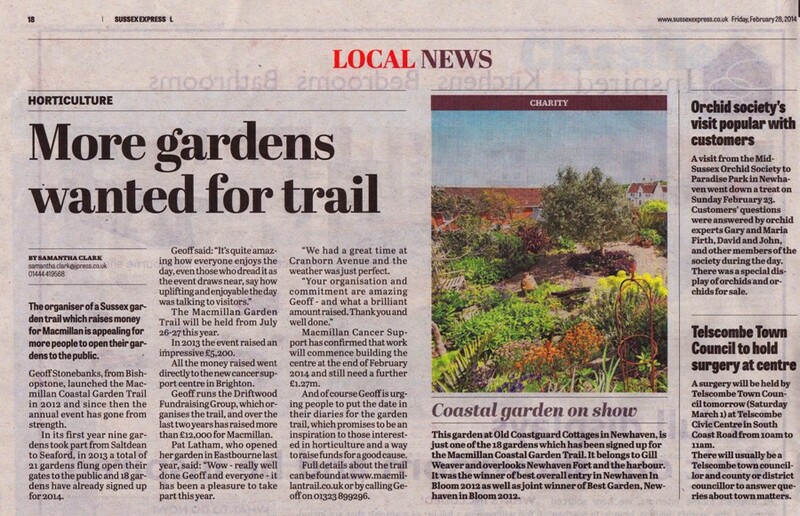 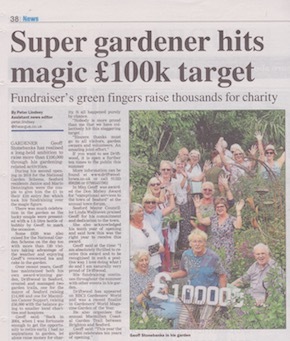 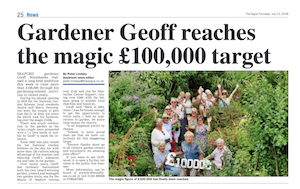 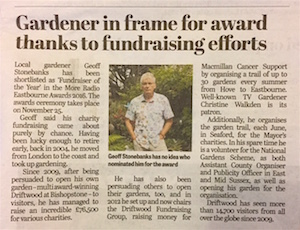 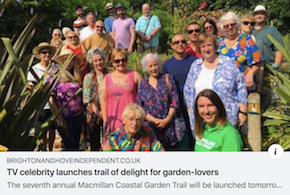 Front page of South Coast Leader for Macmillan Trail 30th July 2015 Garden mentioned in Magnet Magazine August 2015 Great plug on BBC Sussex by Joe and Jean on Dig It on 26th July. 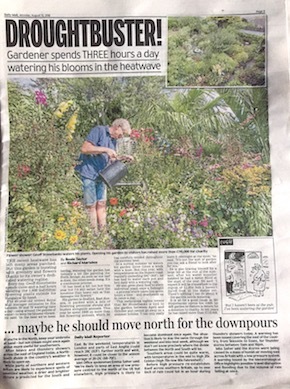 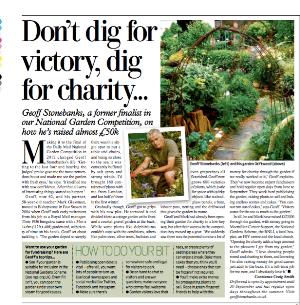 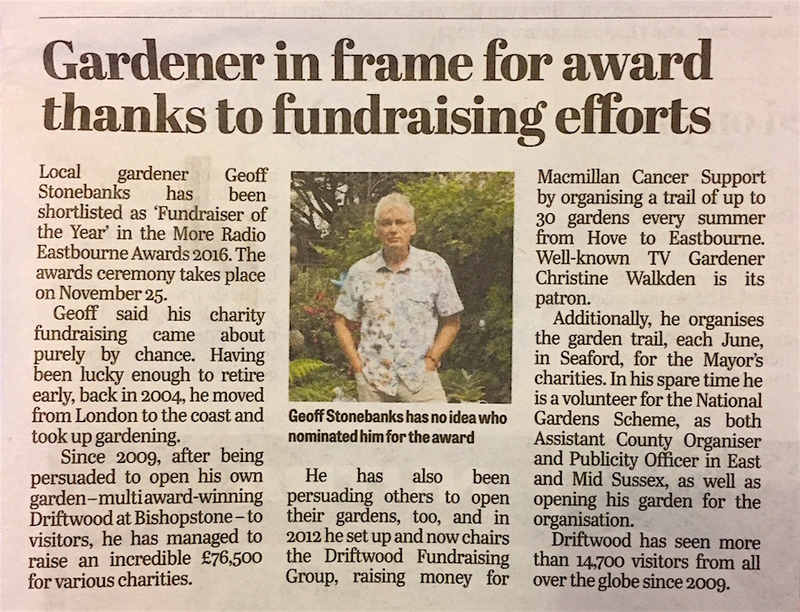 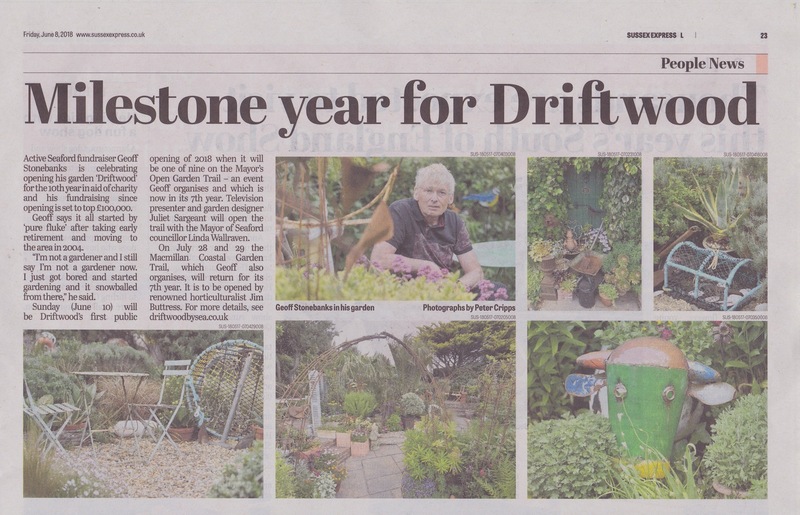 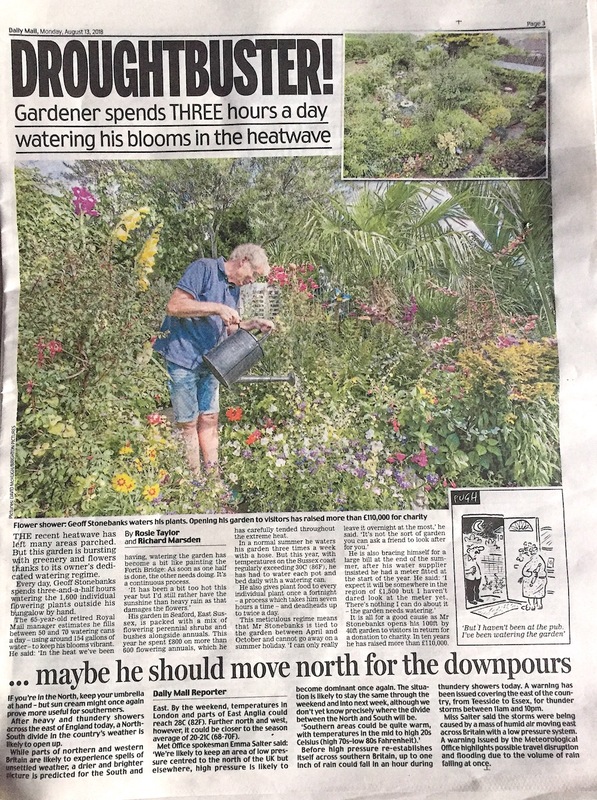 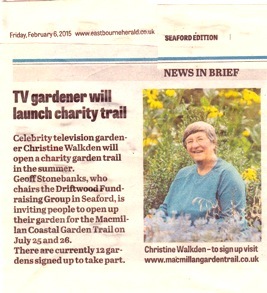 Nice piece in Sussex Express for Macmillan Trail 17th July 2015 Great plug by Graham Dene and Steve Bradley on BBC Sussex's Gardening programme, Dig It, on Sunday 5th July 2015 Discovered on 4th July Daily Mail had used my garden image to launch the 2015 competition! 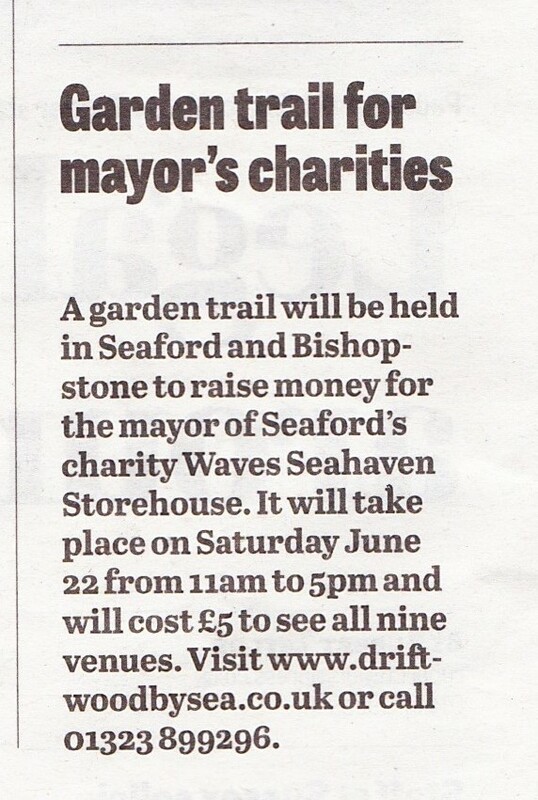 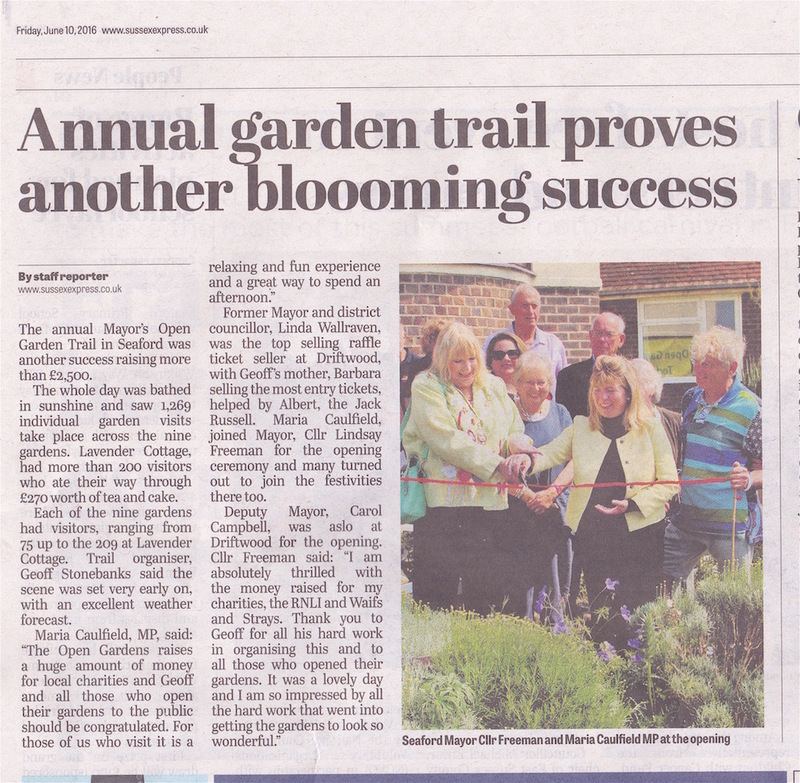 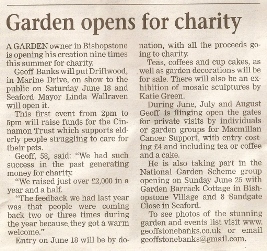 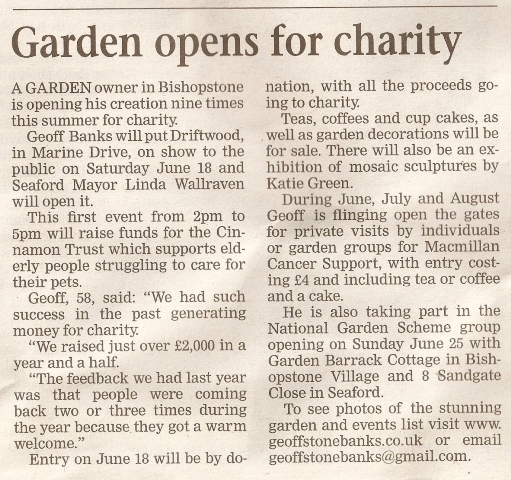 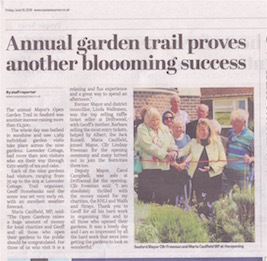 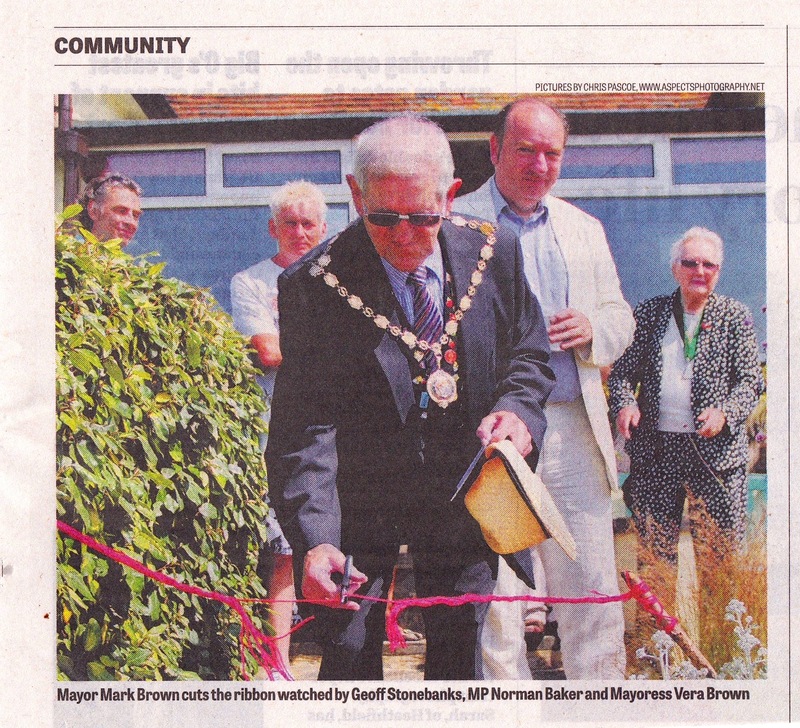 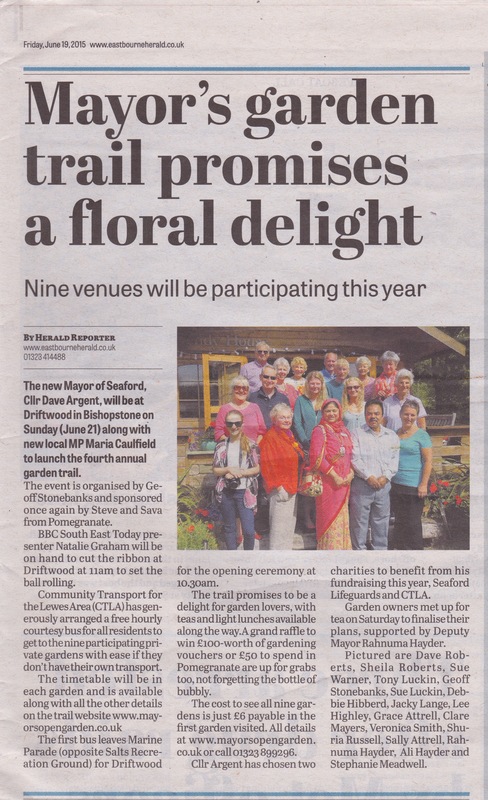 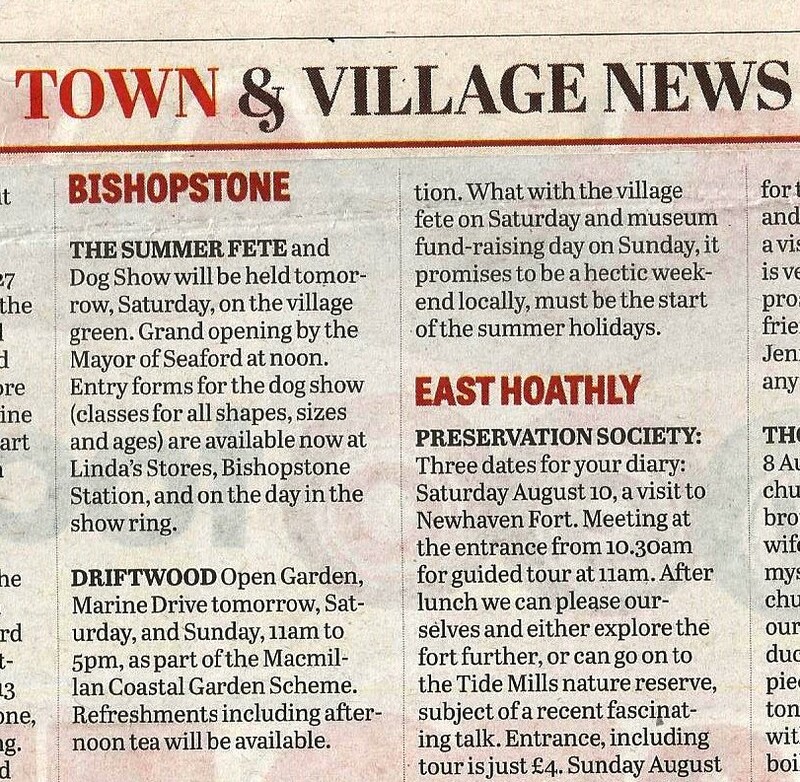 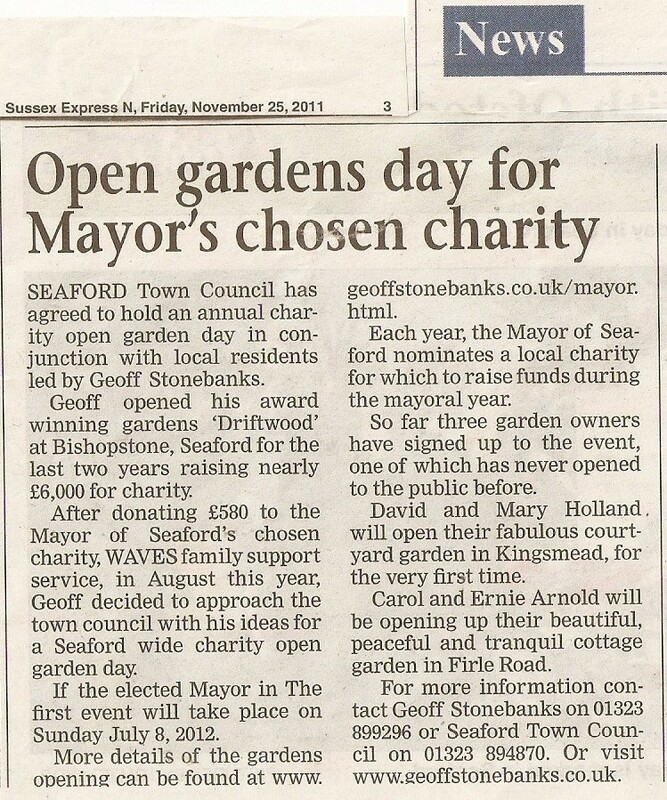 Article in Sussex Express on Mayor's Trail and opening at Driftwood 19th June 2015, on line version here too. 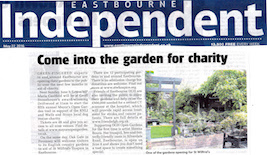 Article about 2015 openings in Eastbourne Herald 29th May. 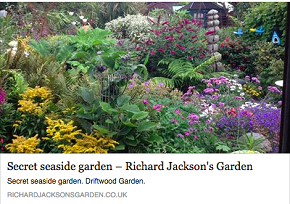 Can also be viewed on-line here too. 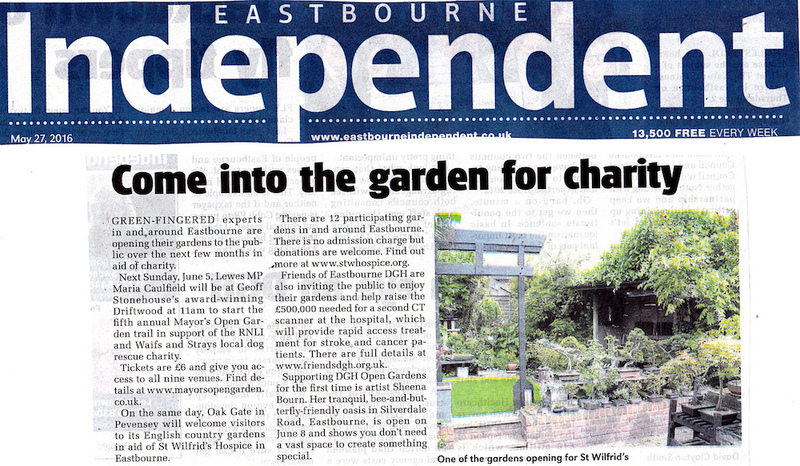 Article about 2015 openings in Sussex Express 29th May.Can also be viewed on-line here too. 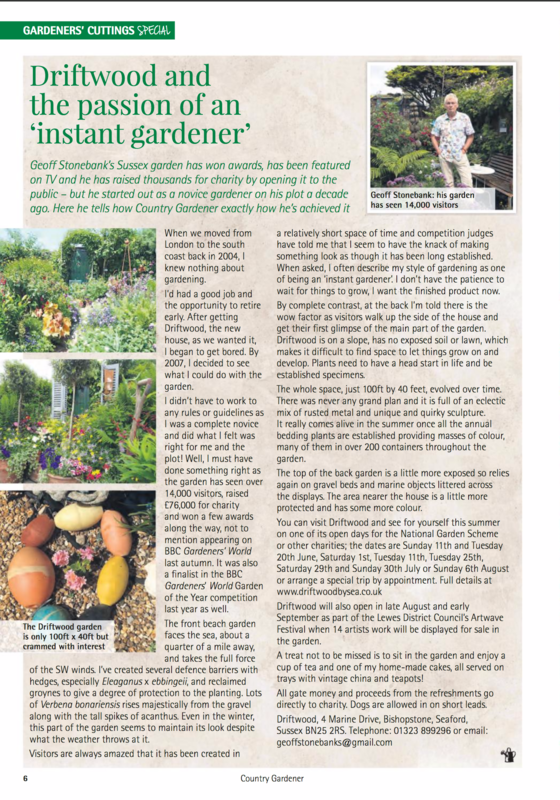 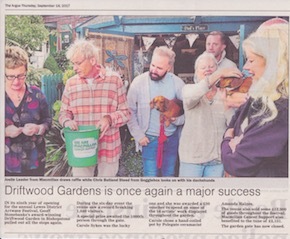 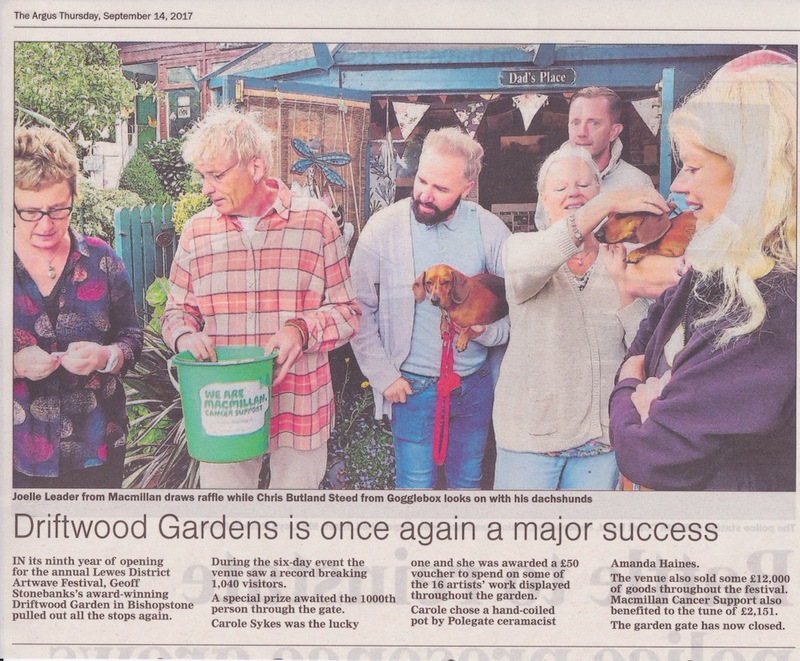 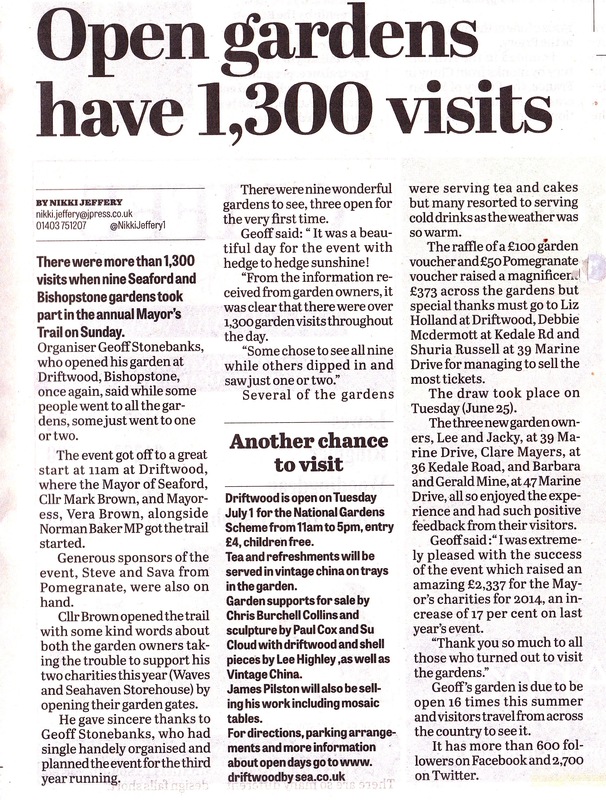 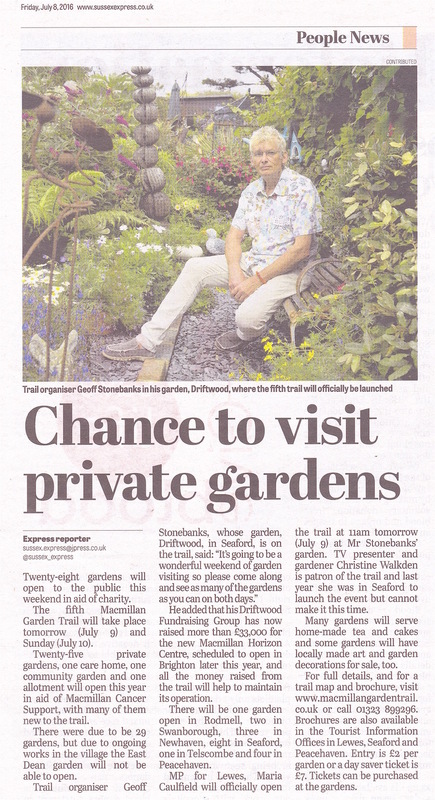 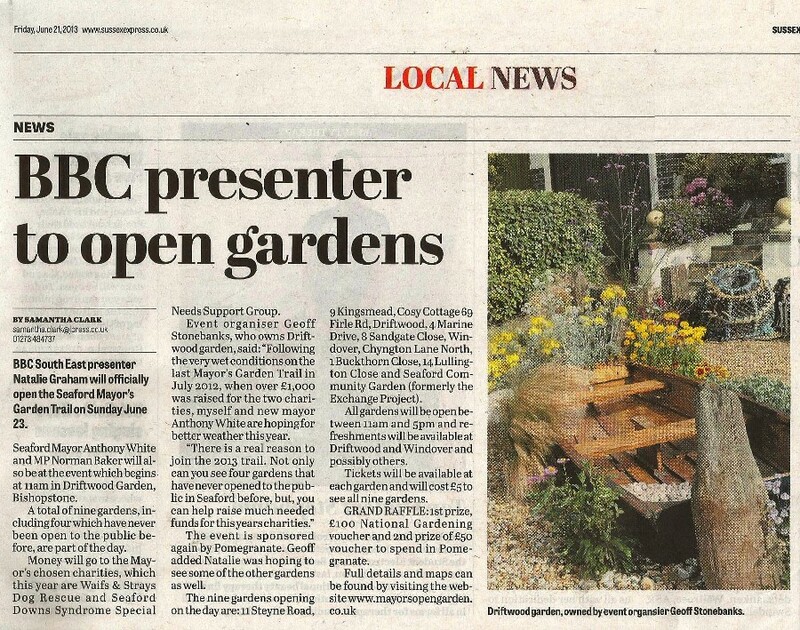 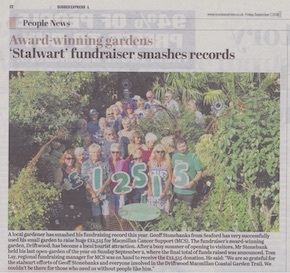 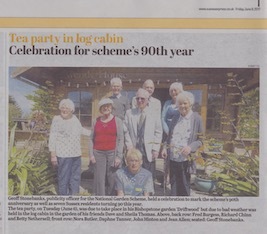 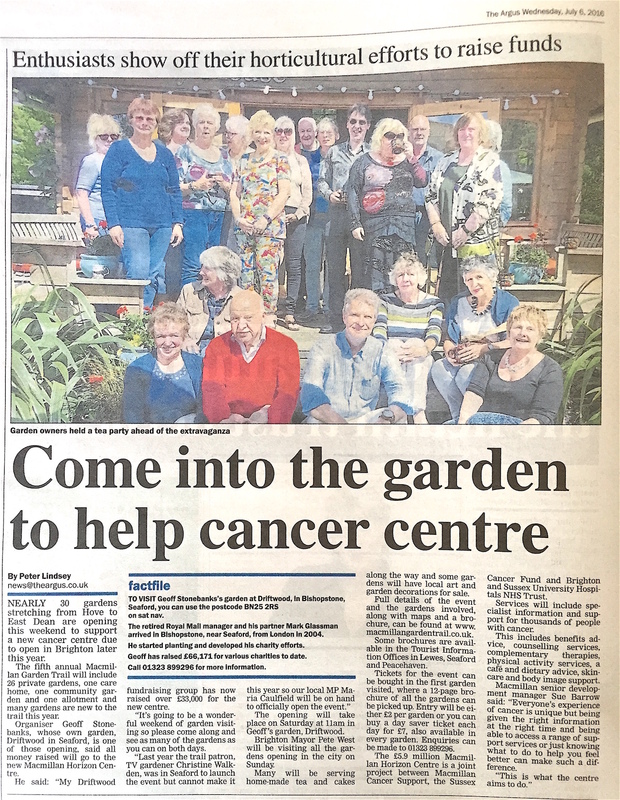 Piece in Sussex Express on Peacehaven gardens joining trail, 6th March 2015 20 minute live interview with Joe Talbot on Feelgood Friday on BBC Sussex on 6th March discussing both NGS and Driftwood. 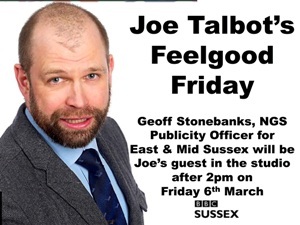 Plug for studio interview with Joe Talbot on BBC Radio Sussex broadcast 1st March for studio interview on 6th March. 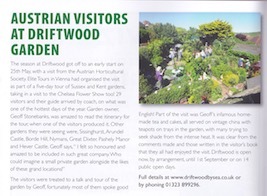 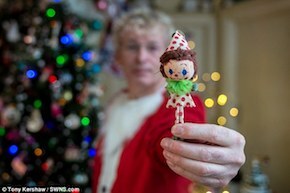 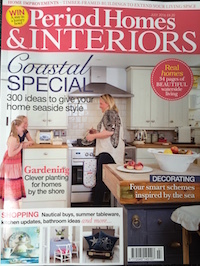 Mentioned in Latest Homes Magazine, reference the Christmas filming at Driftwood. 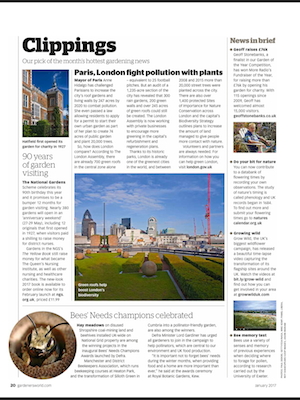 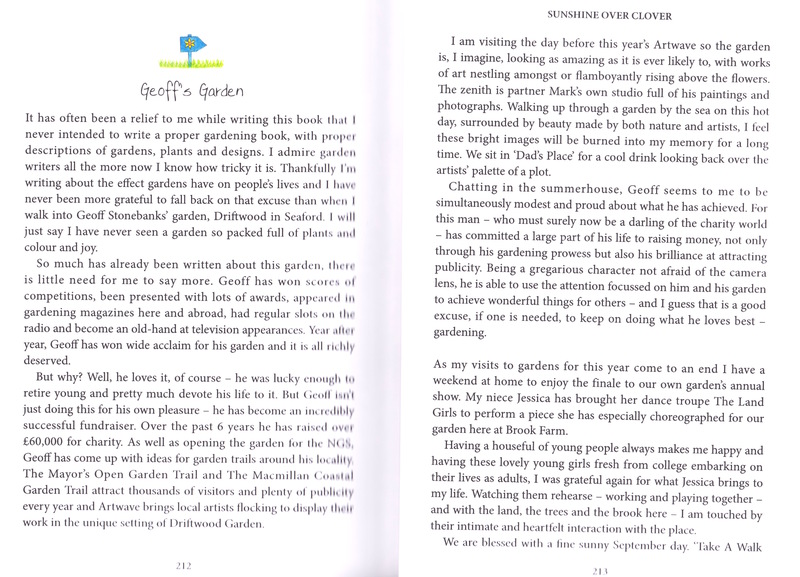 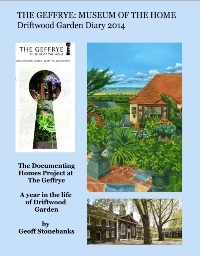 9th December 2014 Book published on Blurb of Geffrye Museum Diary of garden activities in 2014. 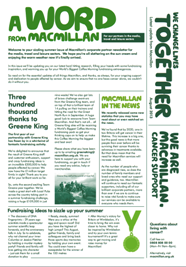 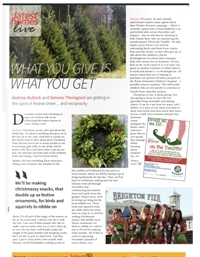 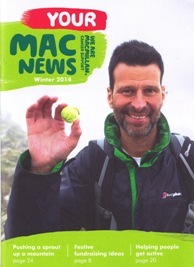 Featured as an "Amazing Fundraiser" in Winter edition of Macmillan Cancer Supports Mac News December 2014. 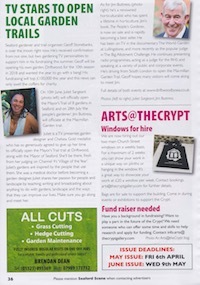 Click image to see page 15. 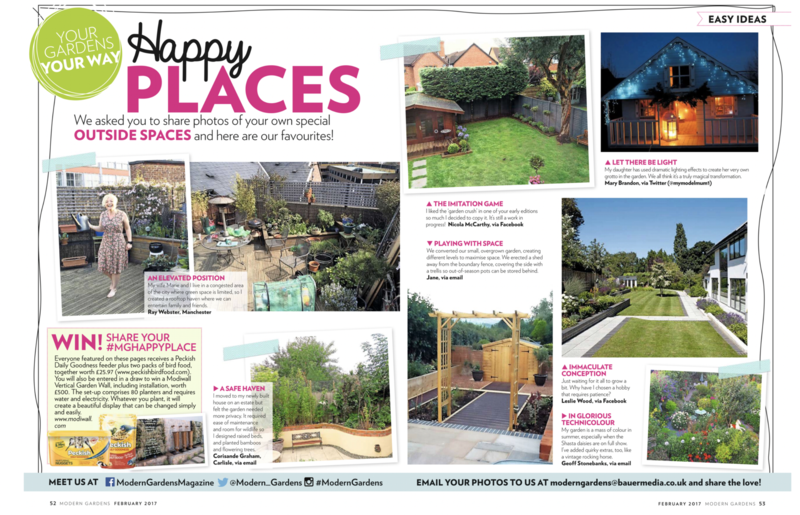 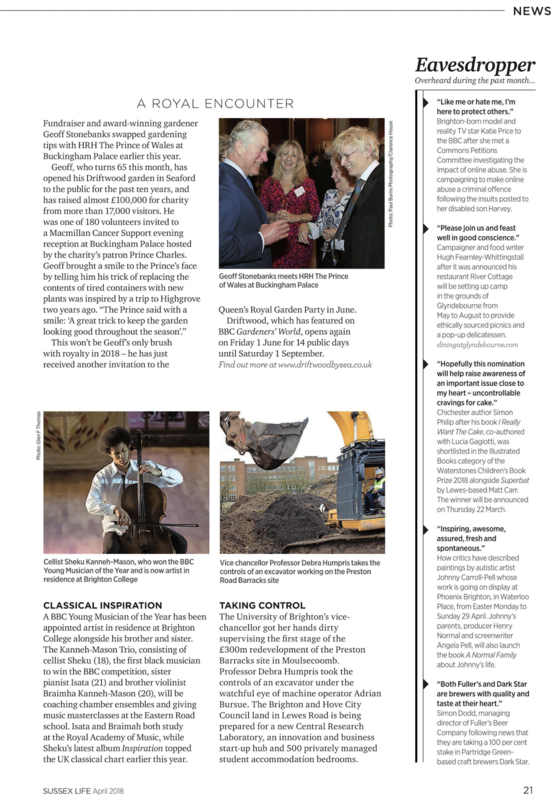 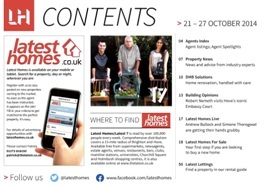 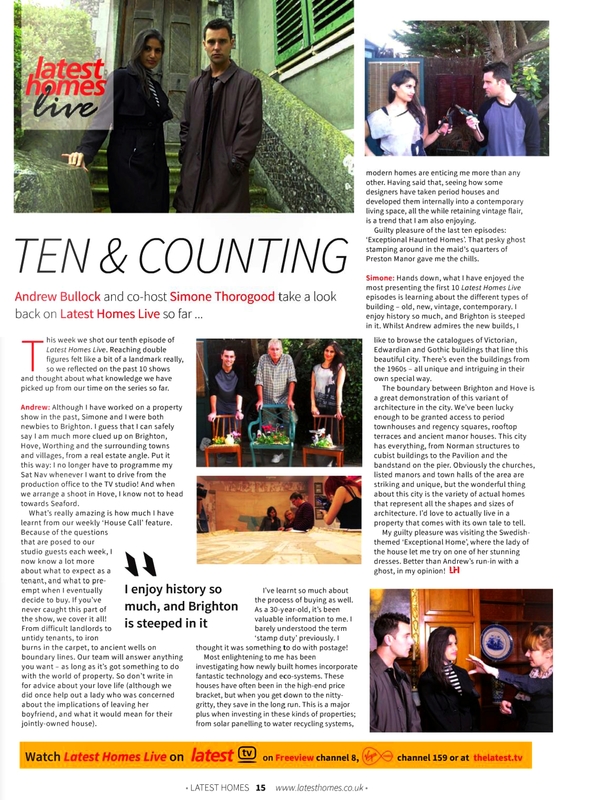 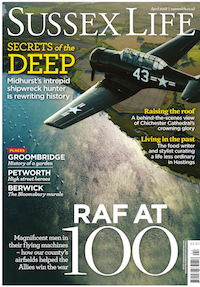 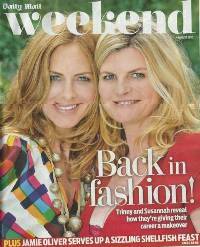 November 2014 Great whole page in Latest Homes Magazine covering the film shoot on 3rd October. 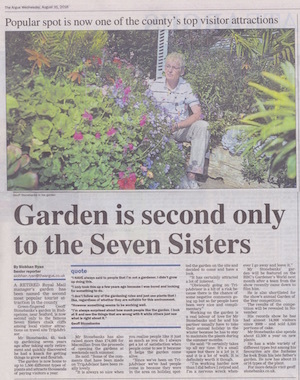 and read page 6 and page 7 too! 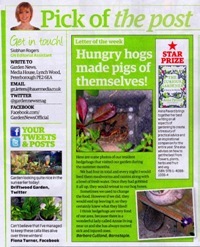 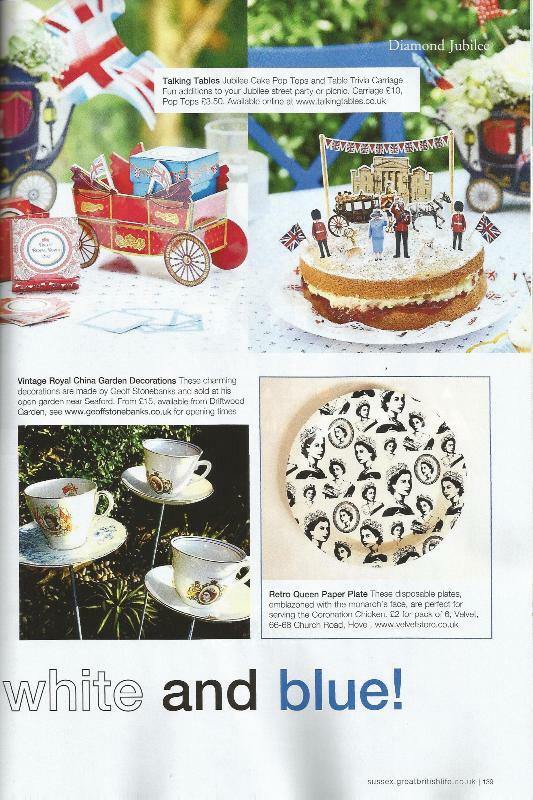 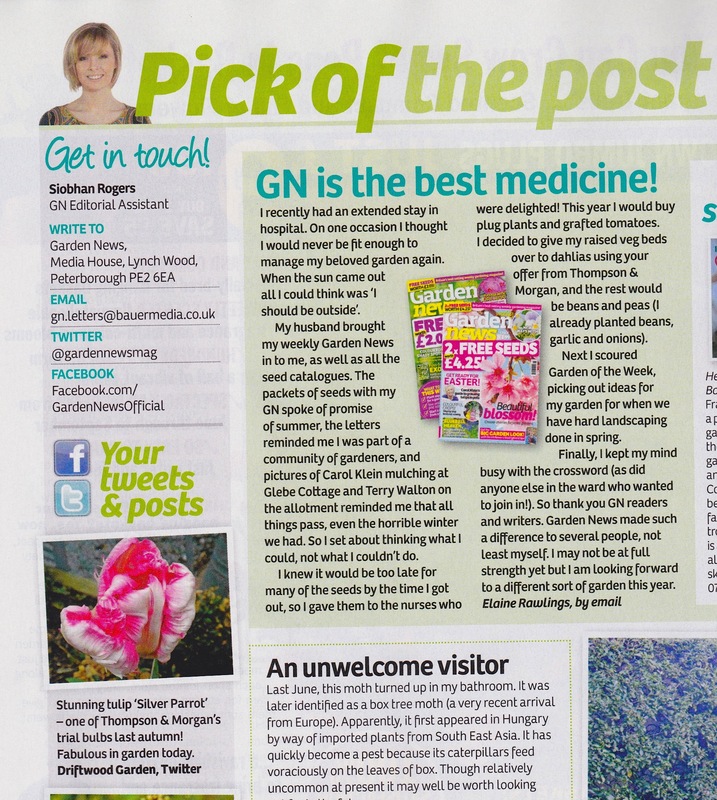 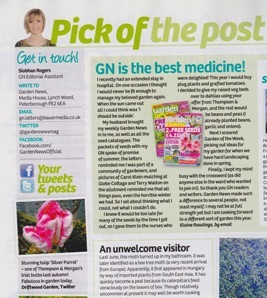 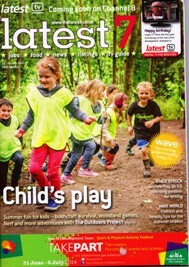 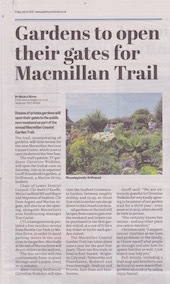 Great coverage too of the Macmillan Trail in Latest 7 Magazine and in their on line magazine too! 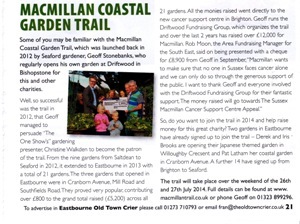 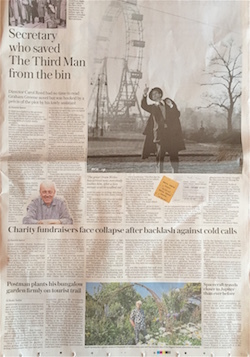 5th August 2014	 Great full page spread of cover of Macmillan Trail. 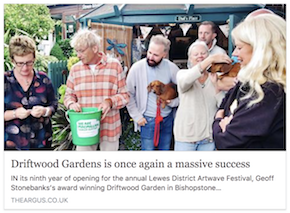 5th August 2014 Great blog posted by broadcaster Jonathan Kent, following his visit to Driftwood on 27th July to talk to me about the links between social media and charity fundraising. 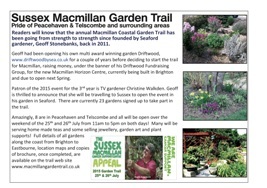 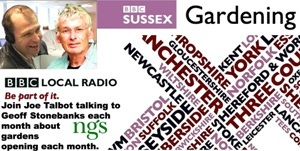 August 2014	 Great plug for Macmillan Trail on BBC Sussex's Dig It programme with me. 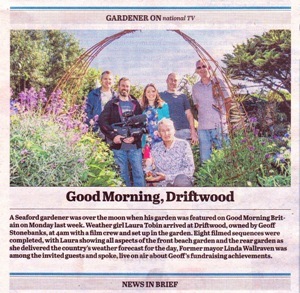 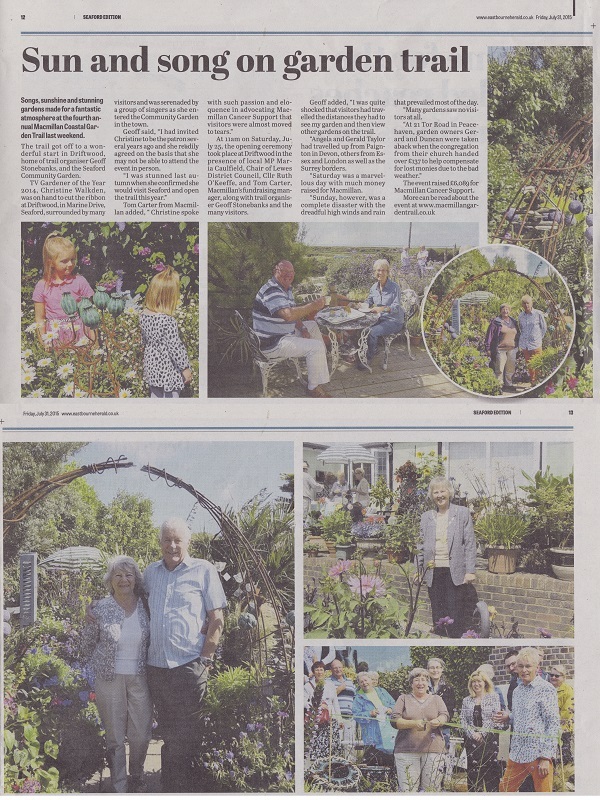 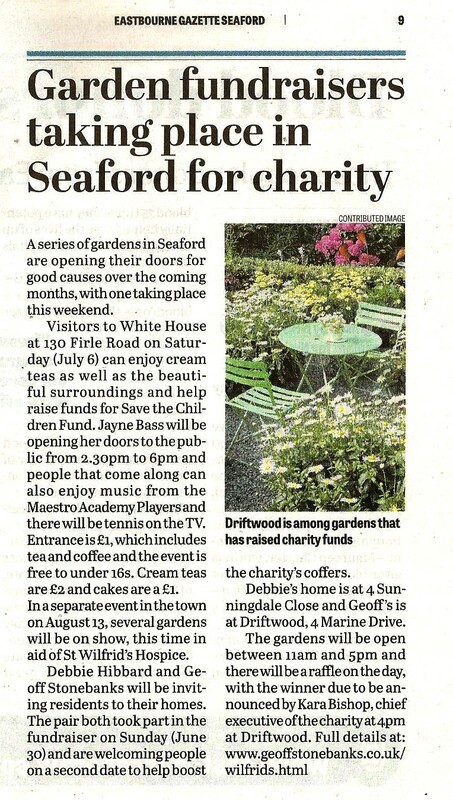 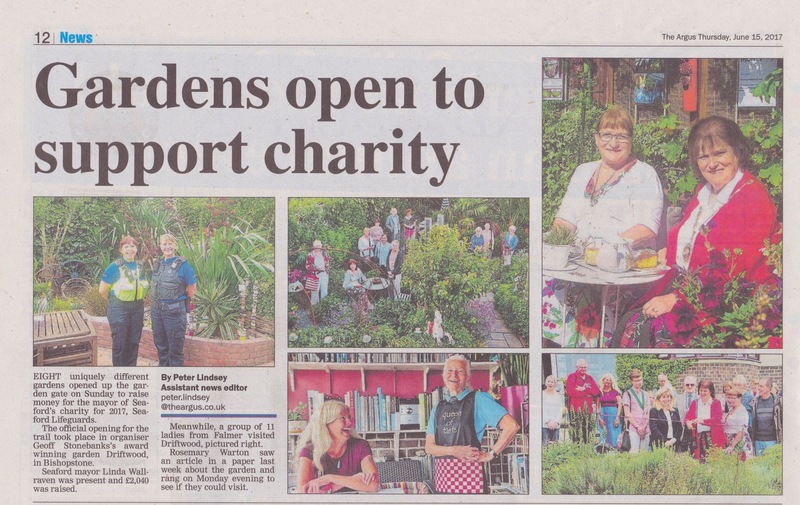 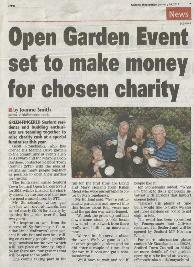 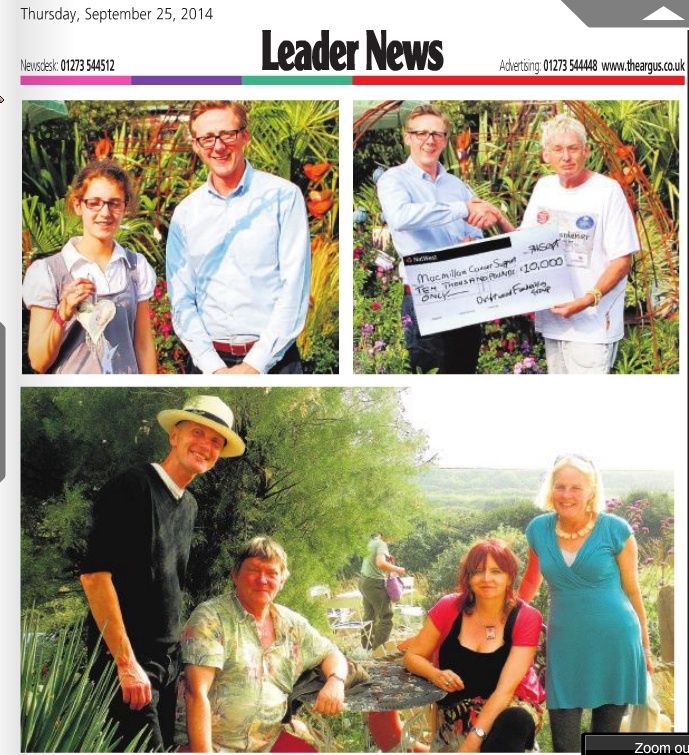 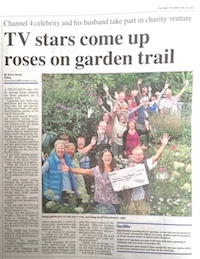 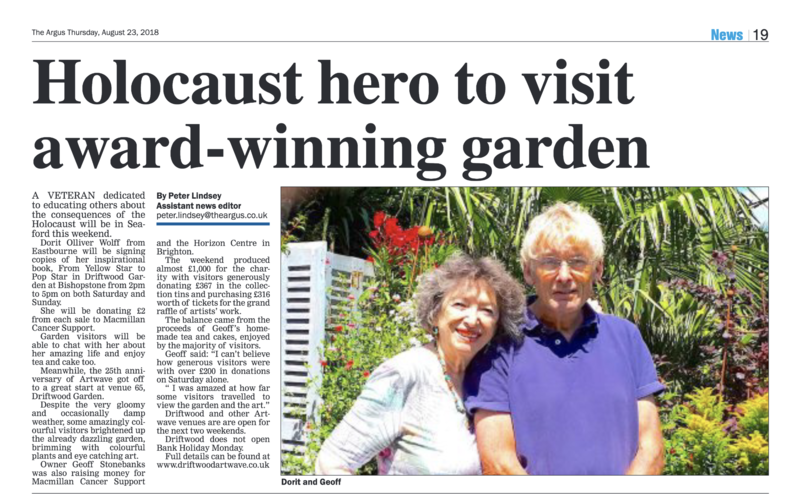 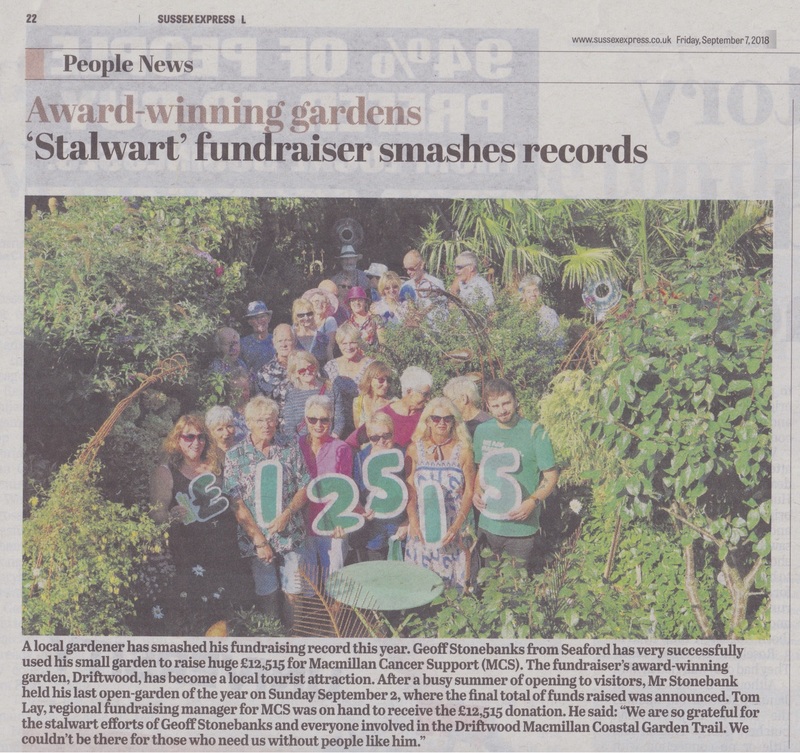 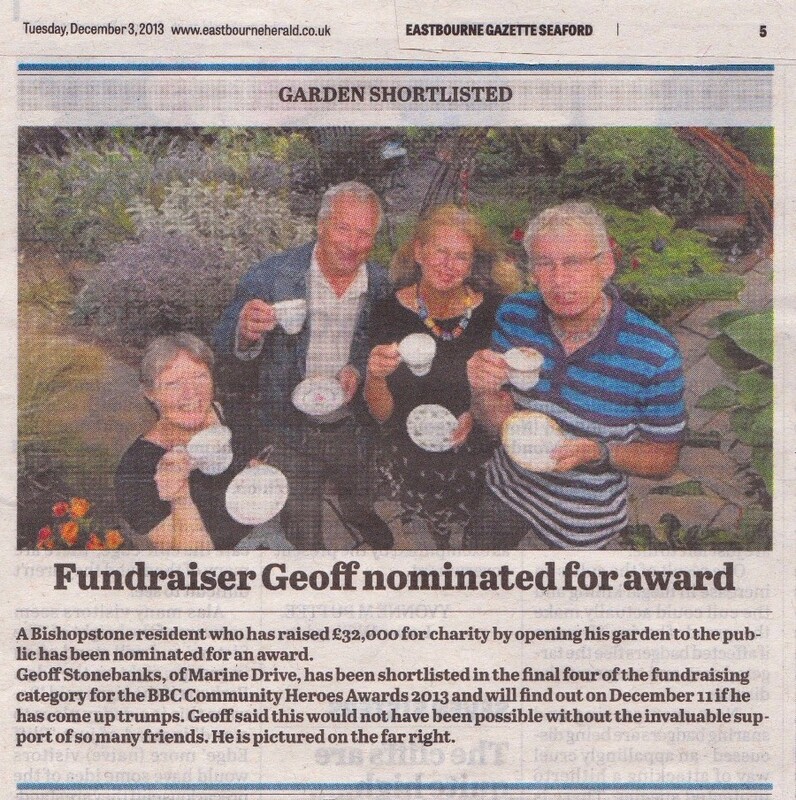 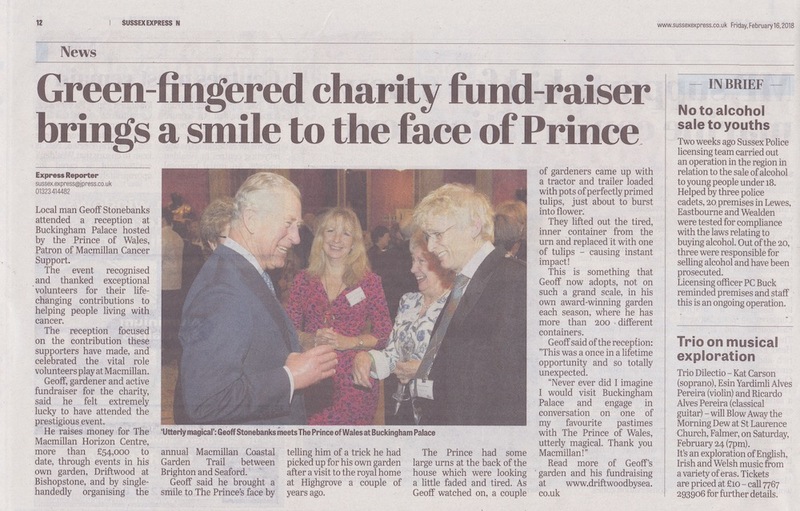 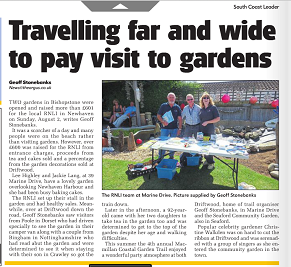 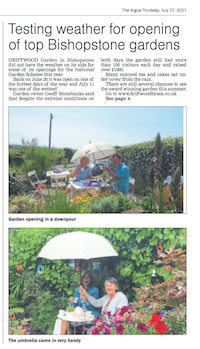 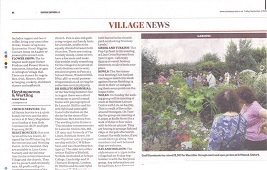 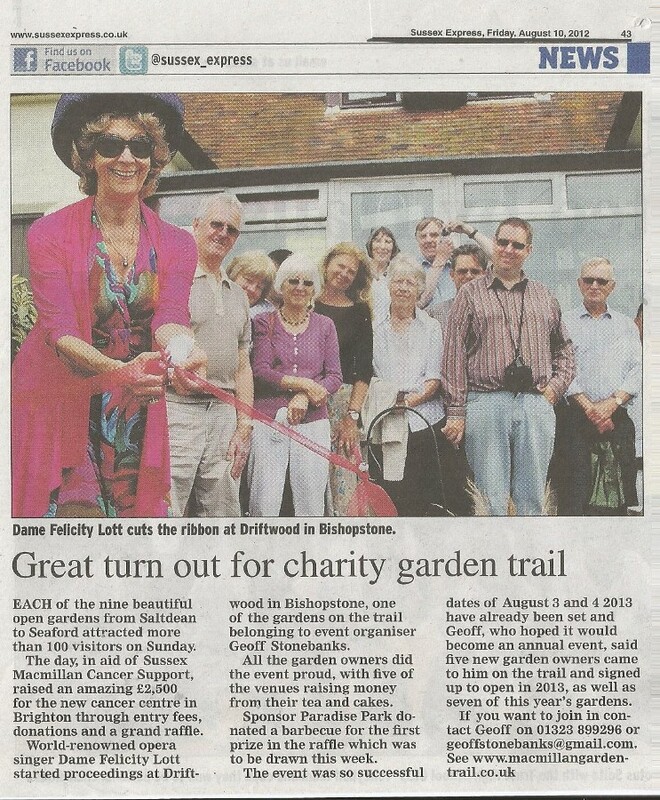 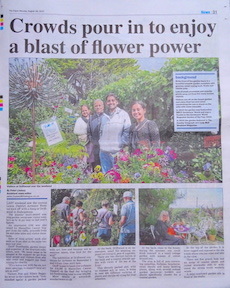 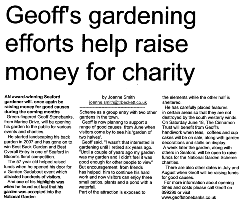 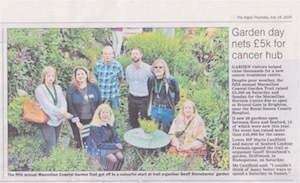 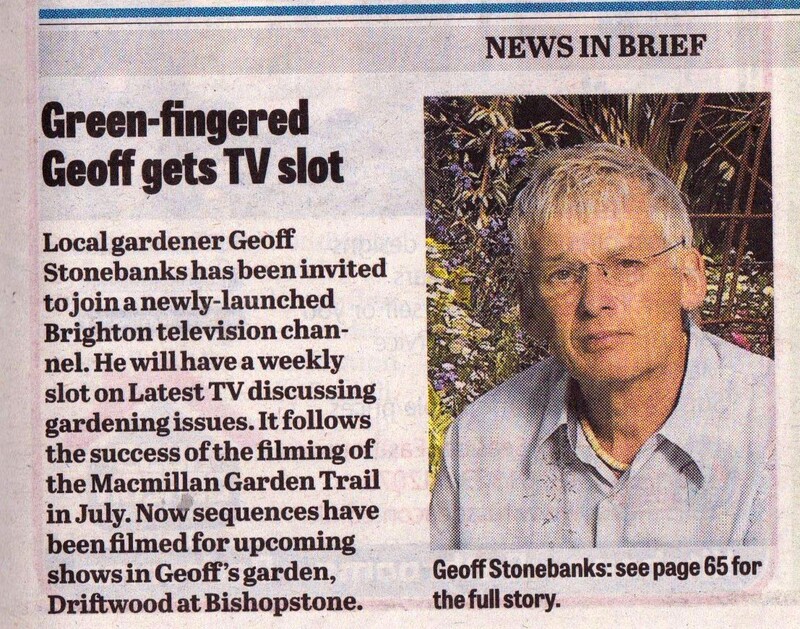 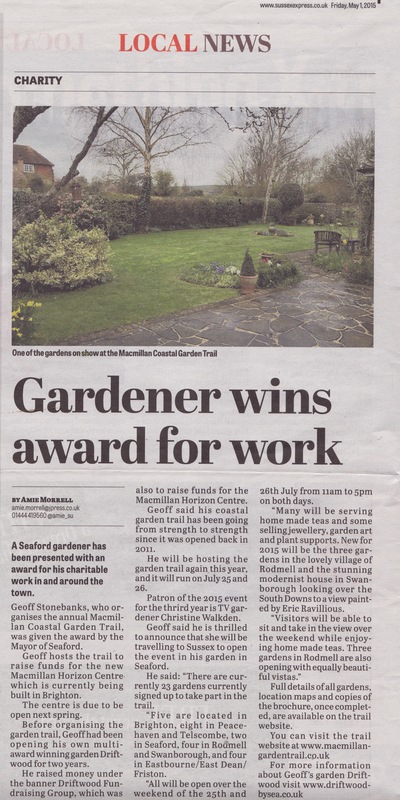 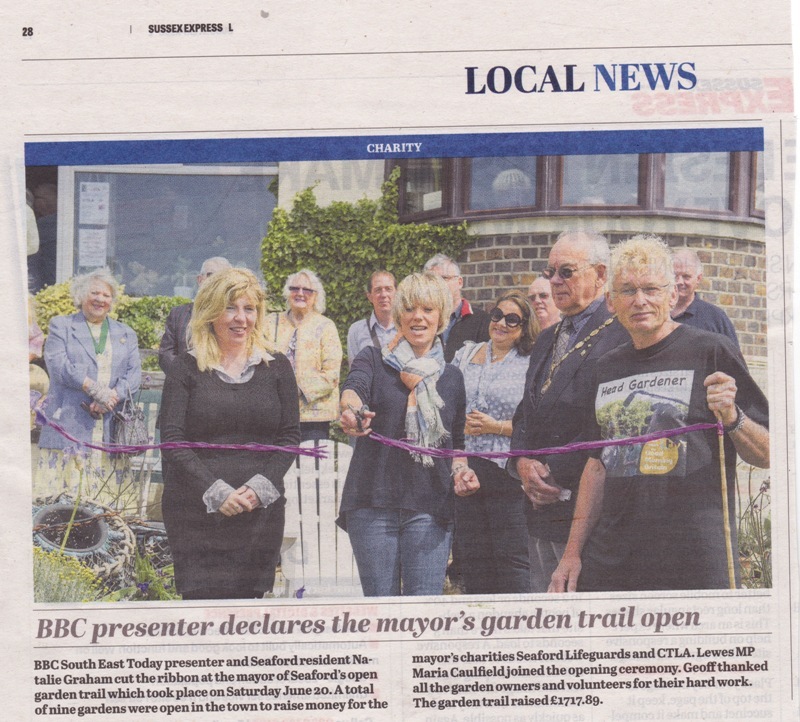 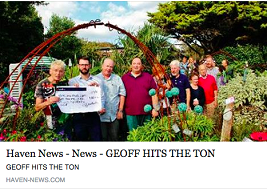 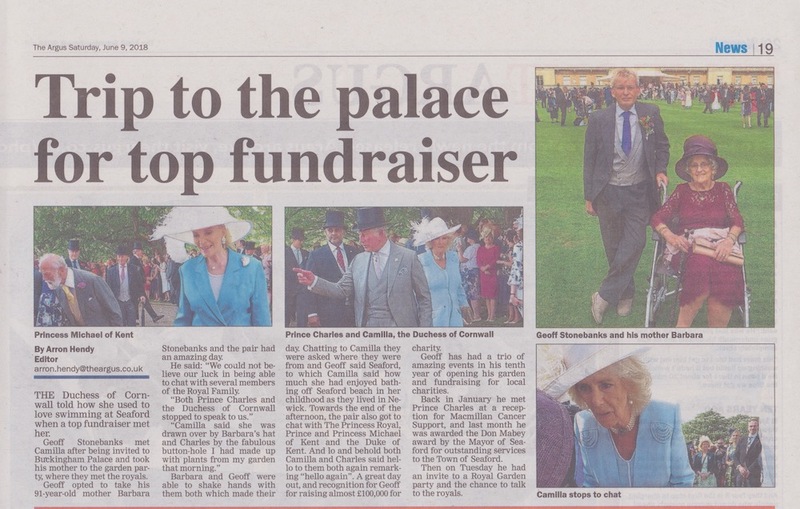 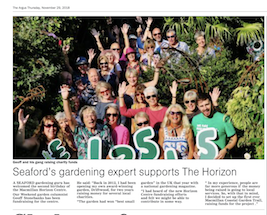 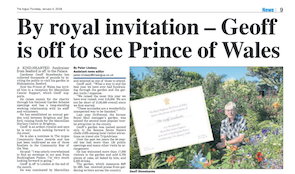 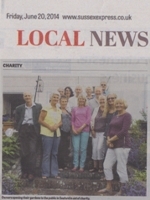 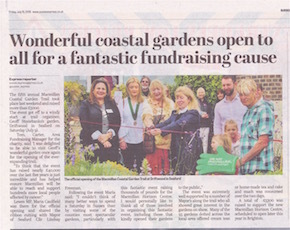 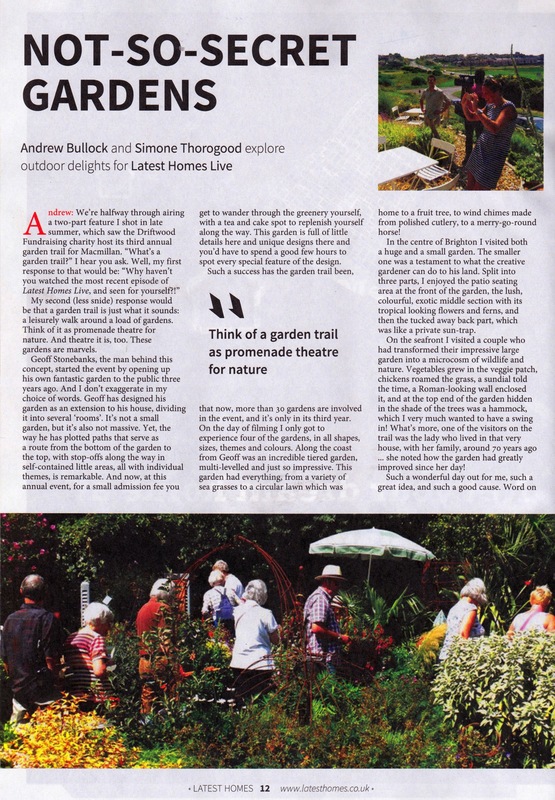 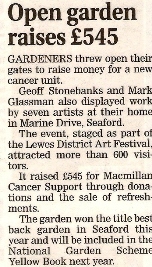 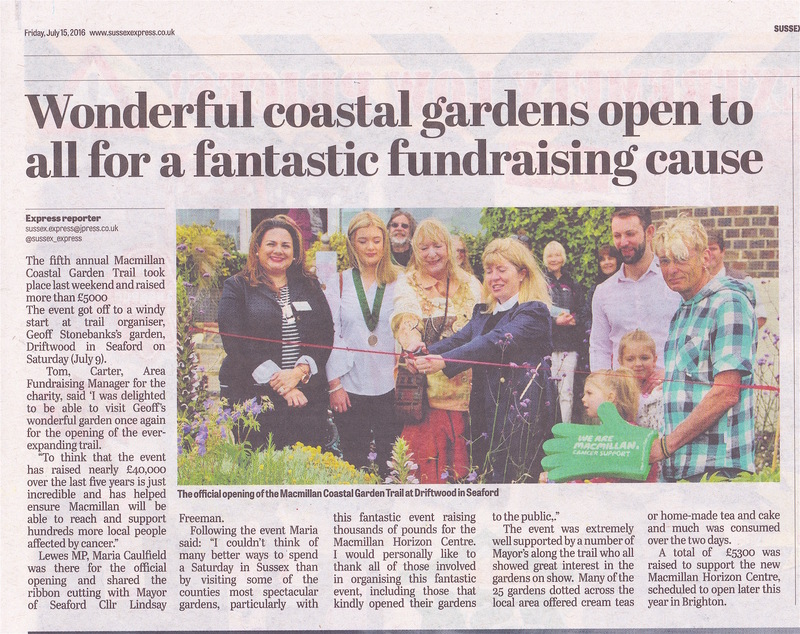 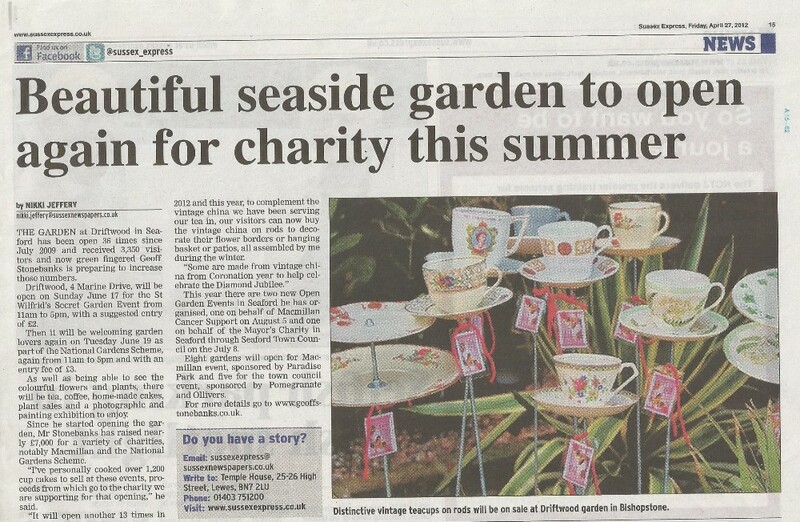 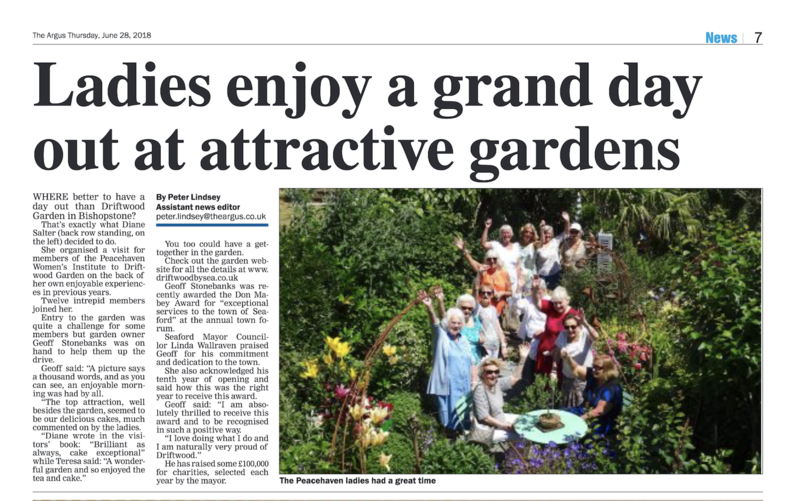 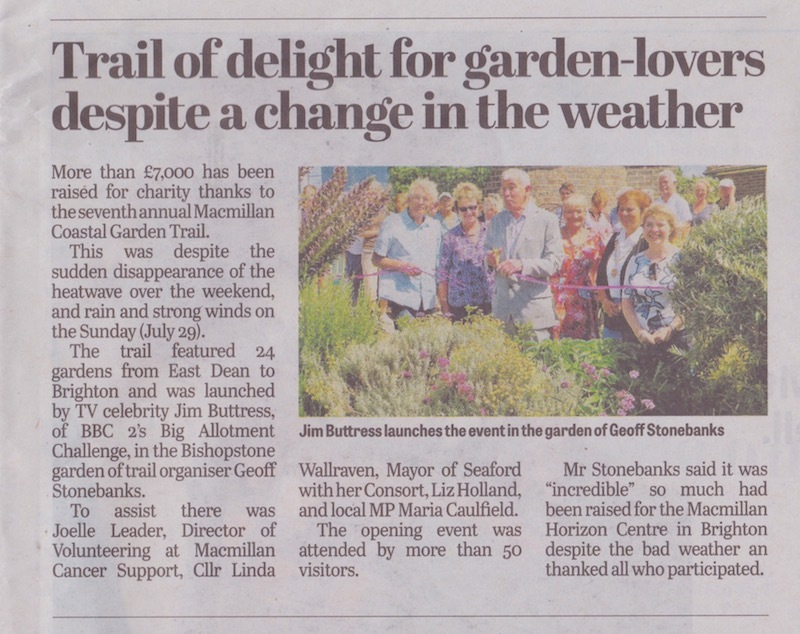 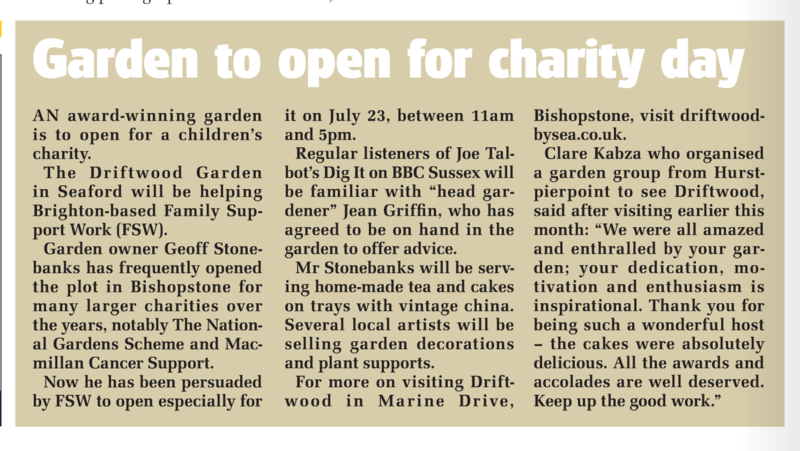 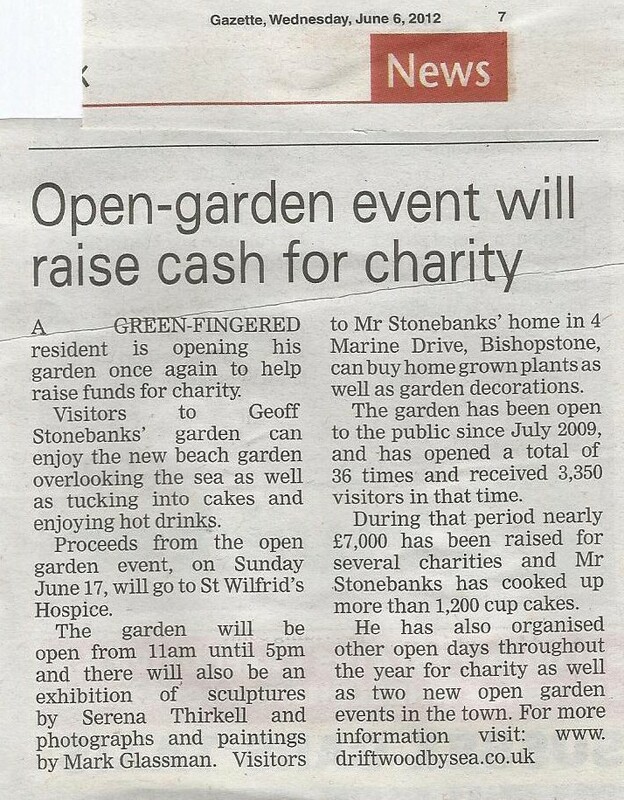 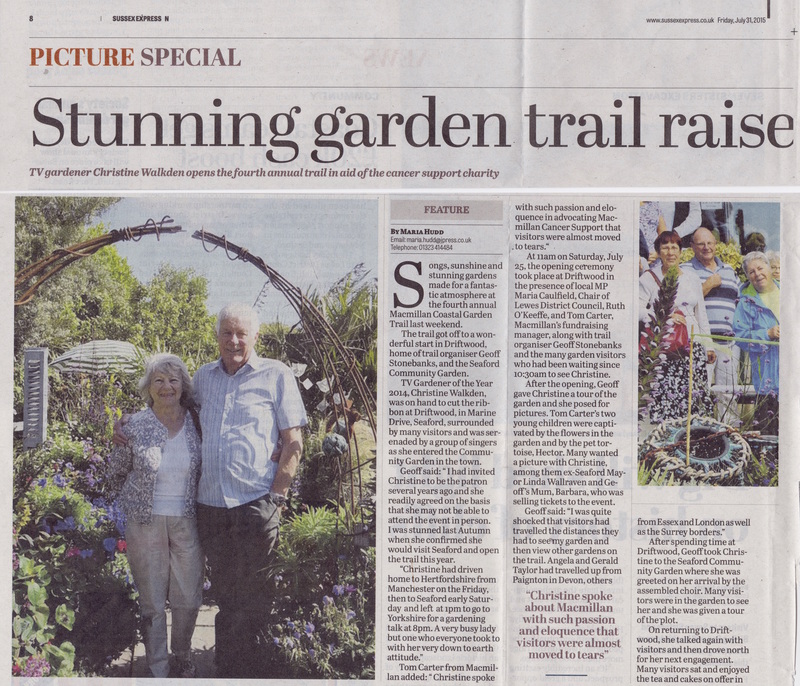 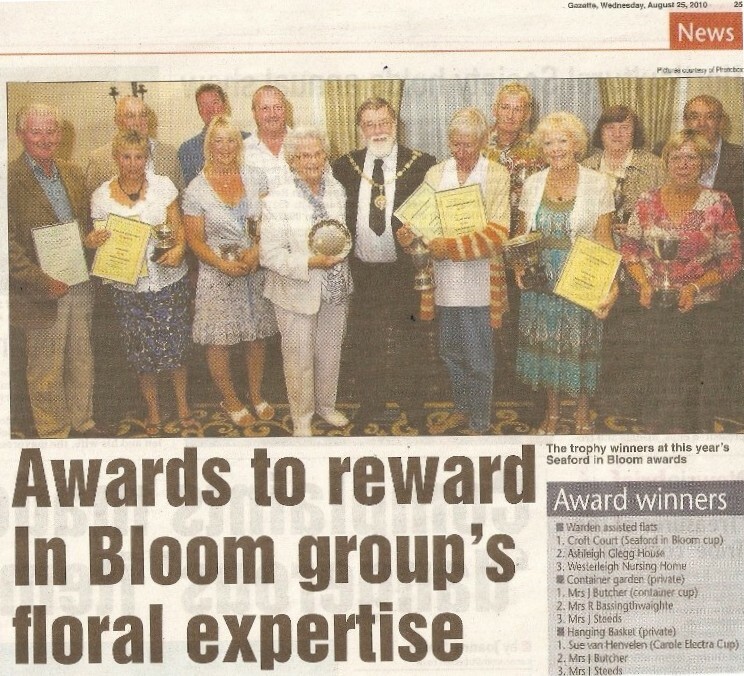 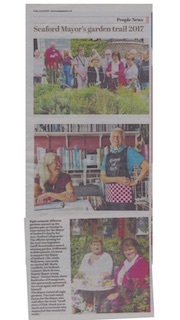 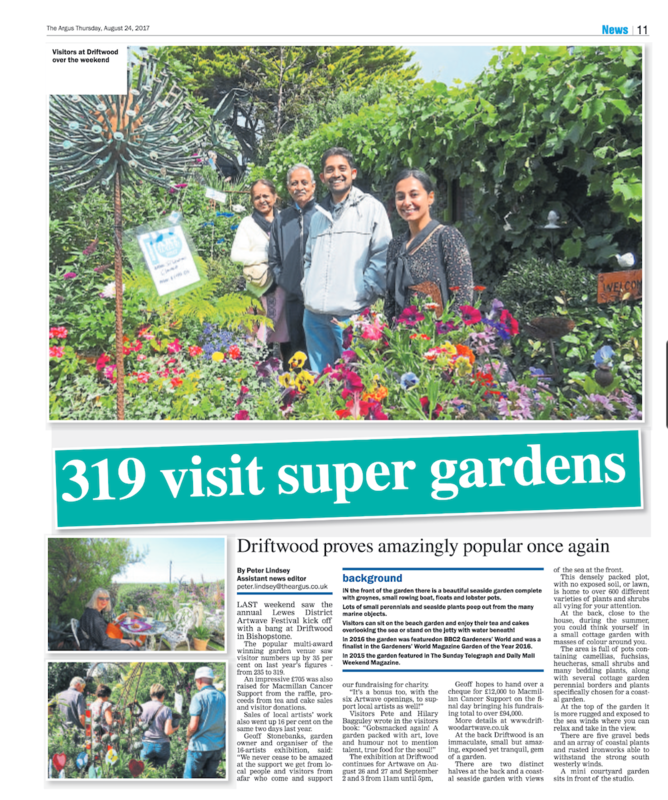 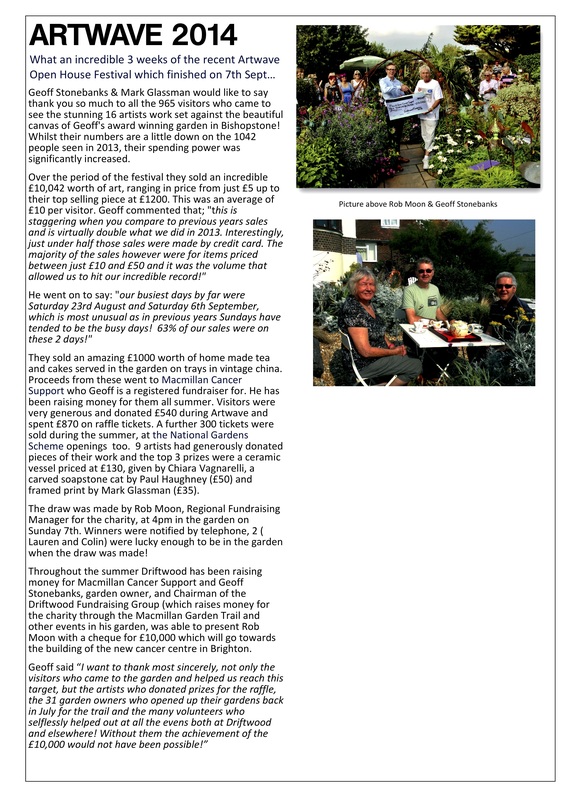 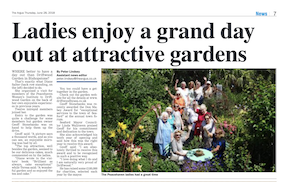 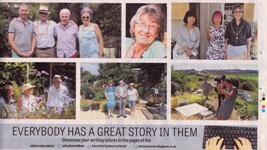 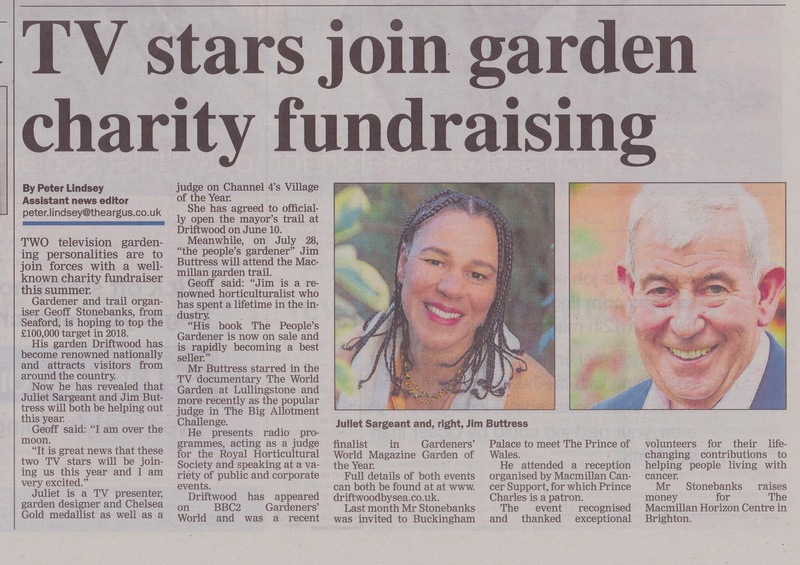 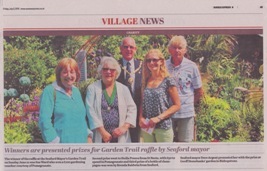 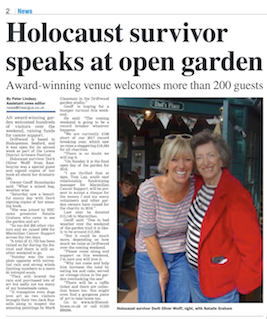 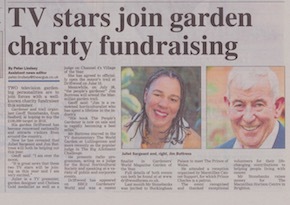 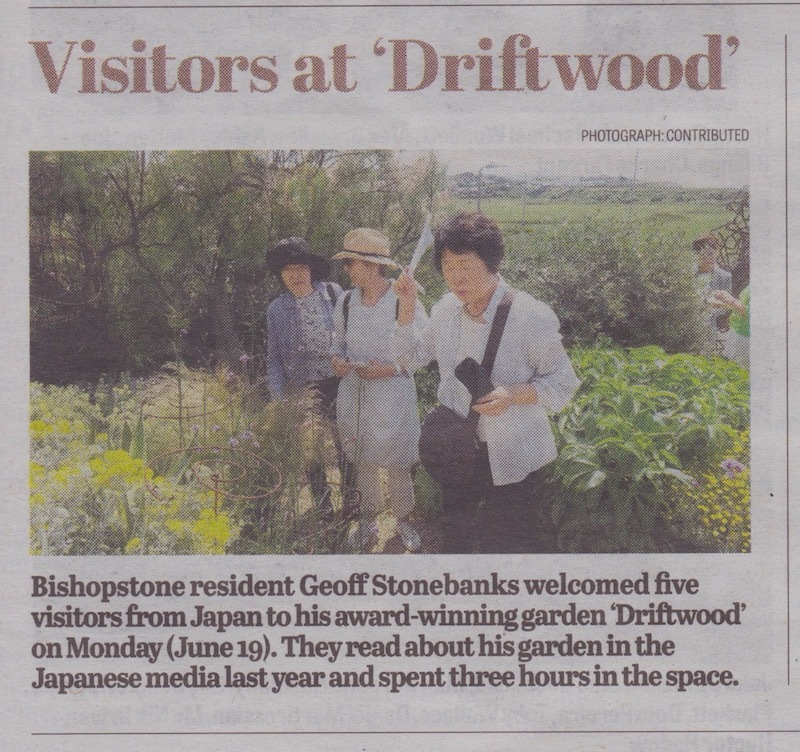 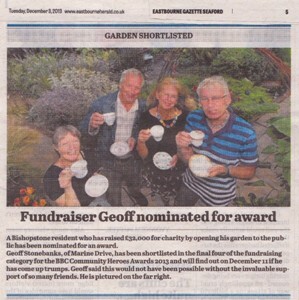 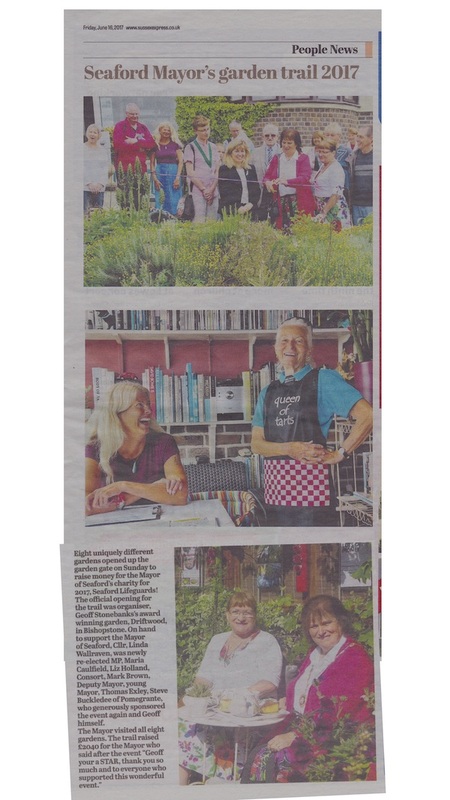 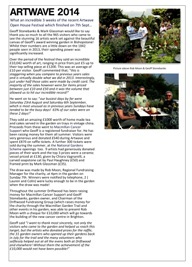 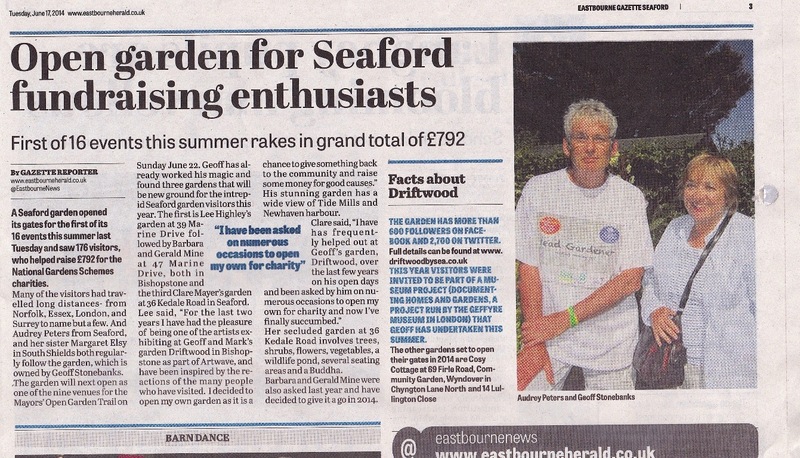 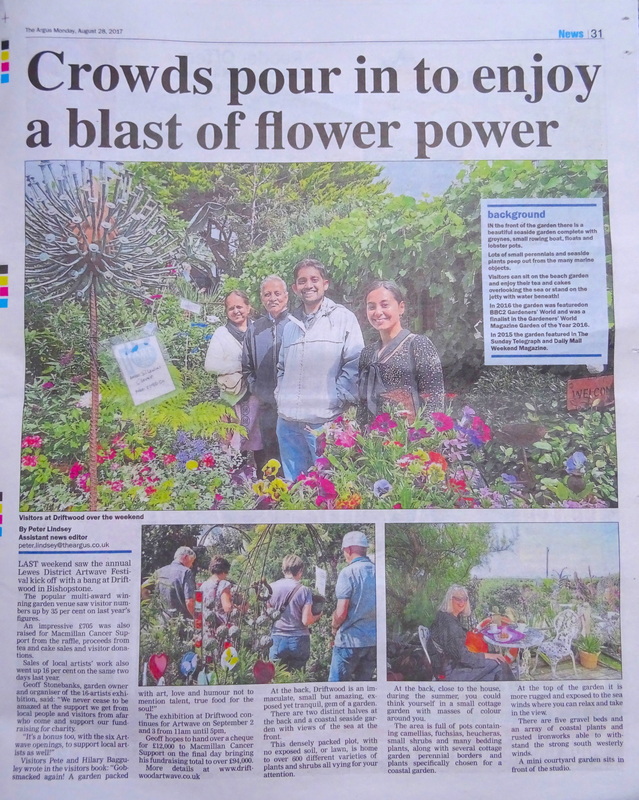 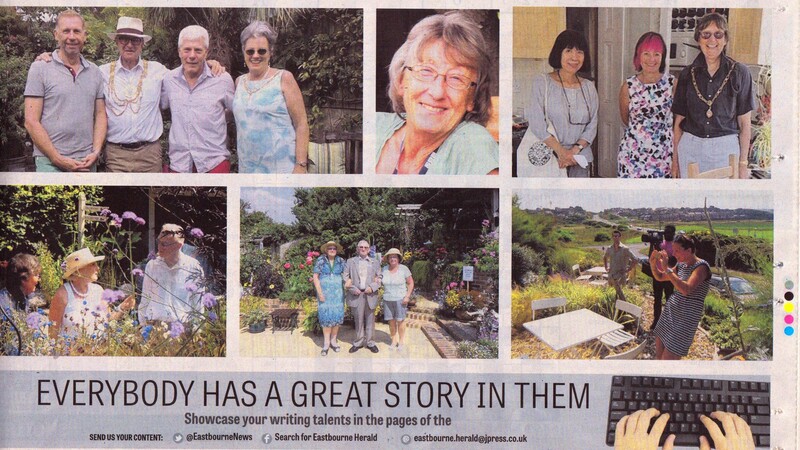 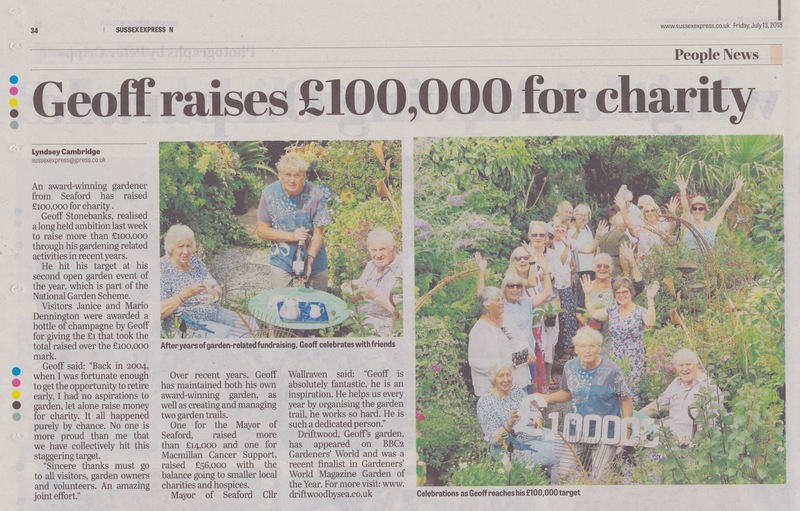 27th July 2014 Article in Seaford Gazette about Good Morning Britain's visit to garden. 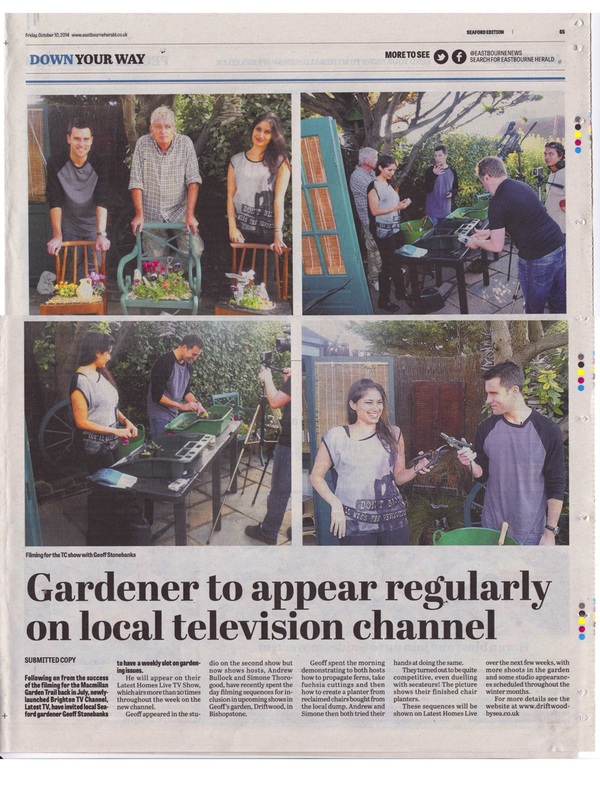 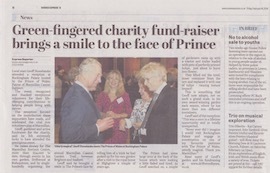 Great on line piece in Sussex Express about Good Morning Britain appearance. 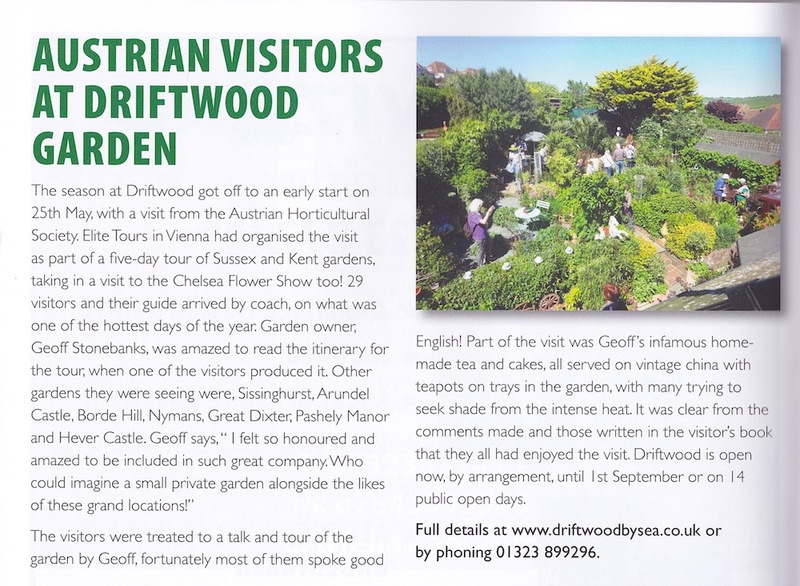 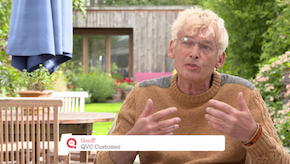 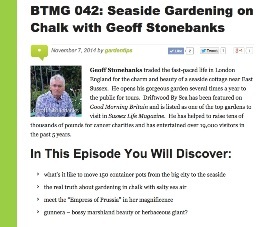 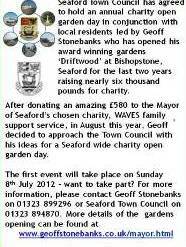 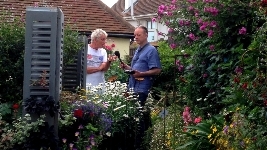 15th July 2014	 Driftwood featured and Geoff interviewed throughout the programme. 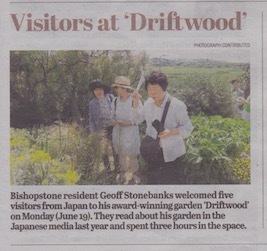 The english translation version can be read here . 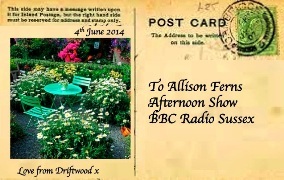 "Postcard" from Seaford with Allison Ferns on BBC Radio Sussex! 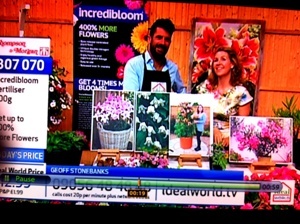 2nd June 2014 Promoting Thompson & Morgan Alstromeira Peruvian Tree Lily on Ideal World Shopping Channel! 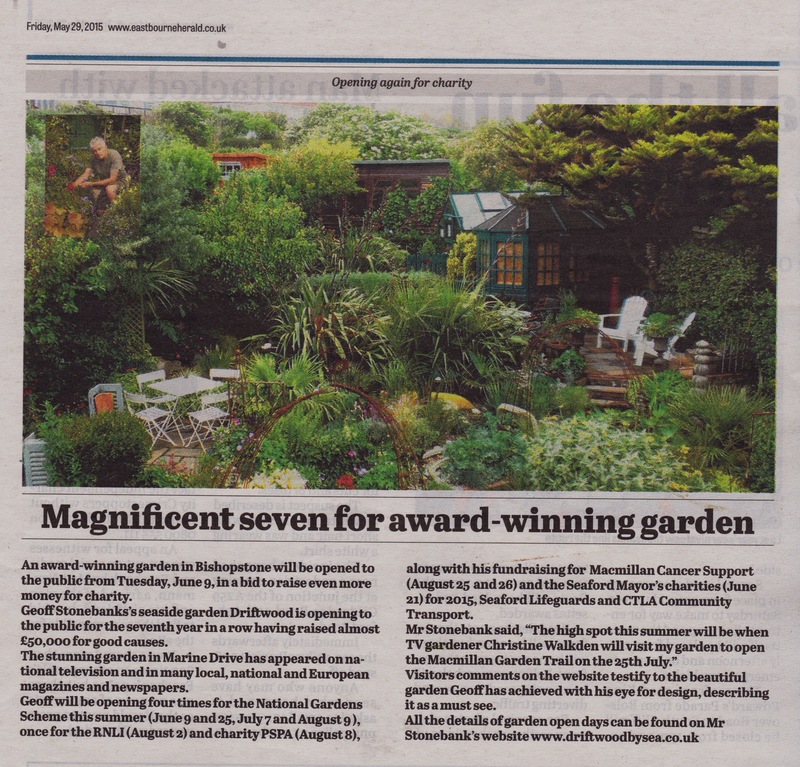 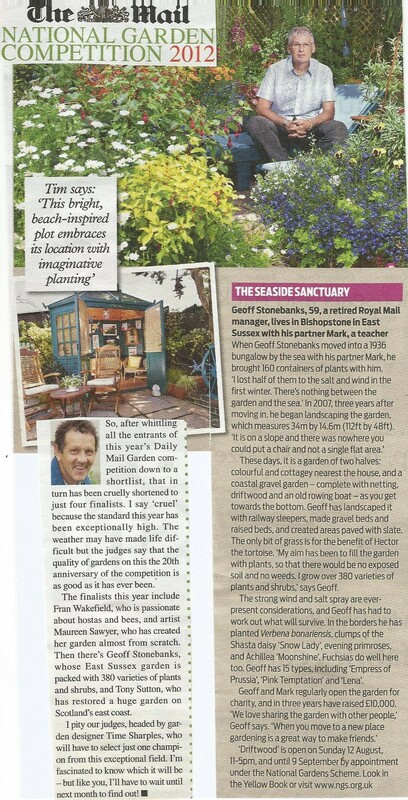 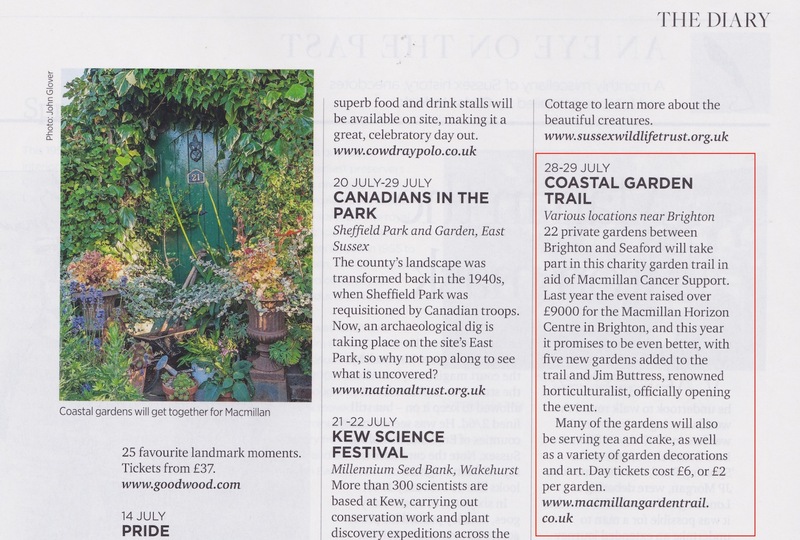 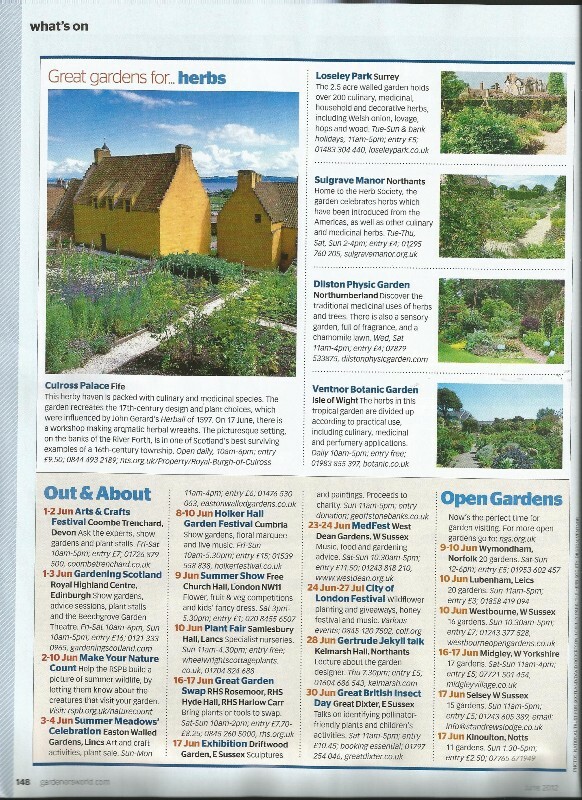 Listed in Weekend Magazine as 1 of 6 previous finalists in Daily Mail National Garden Competition opening this summer and a quoted as " a place to draw inspiration from the experts." 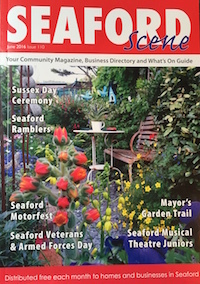 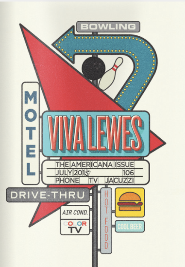 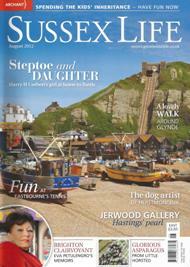 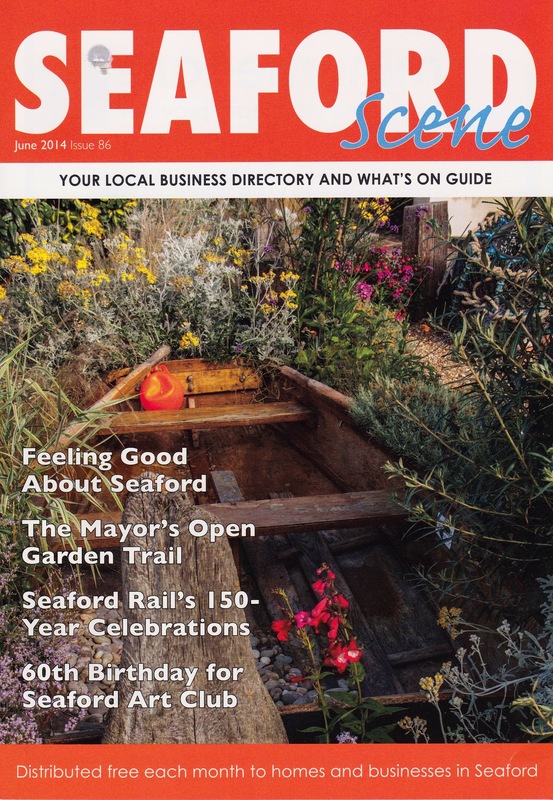 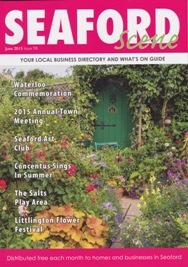 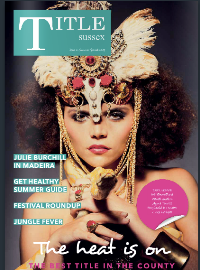 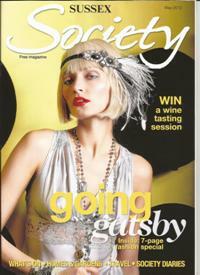 Cover image and article inside June issue of Seaford Scene 2014. 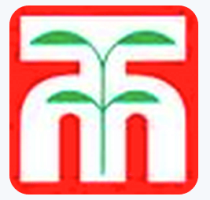 Click both images to large version. 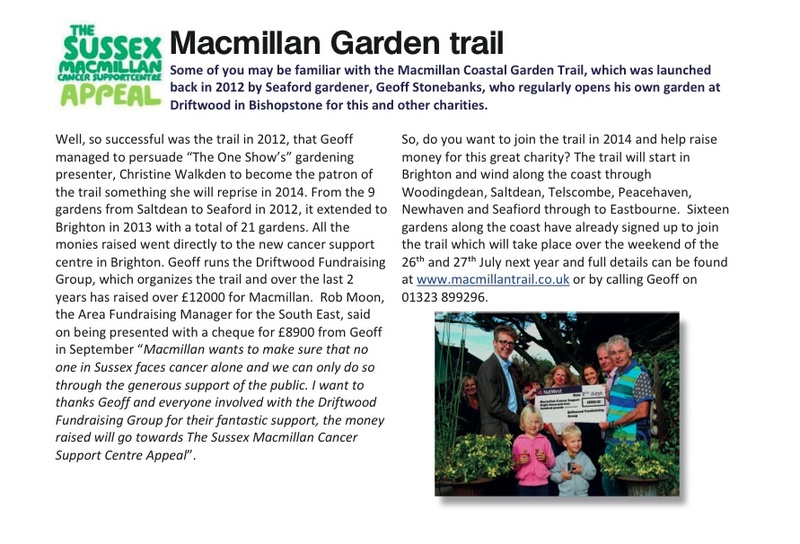 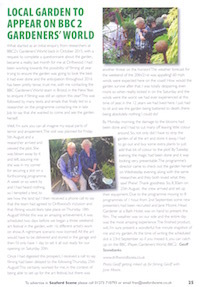 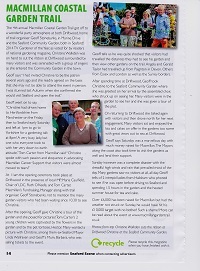 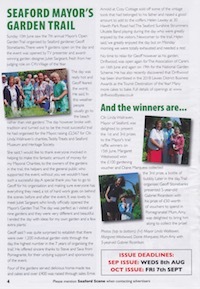 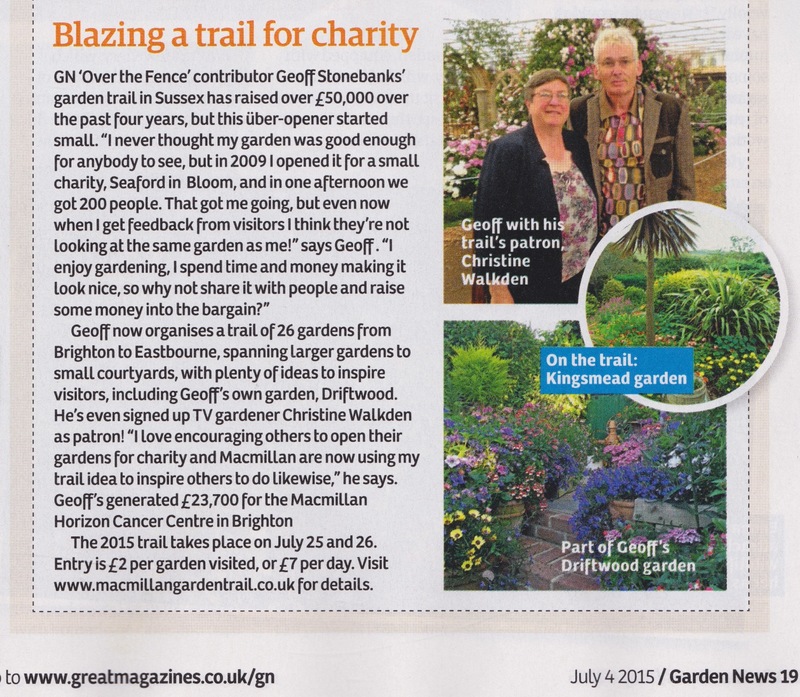 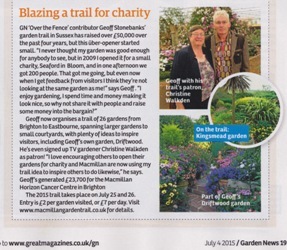 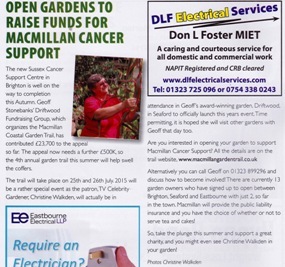 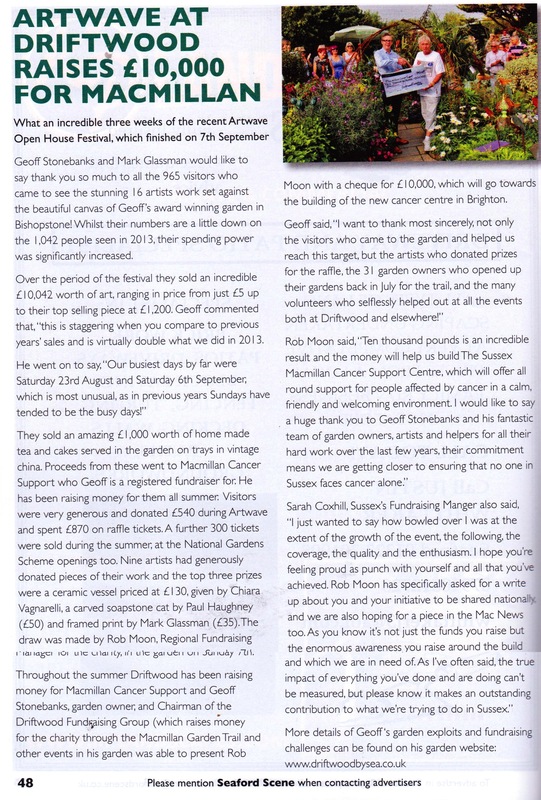 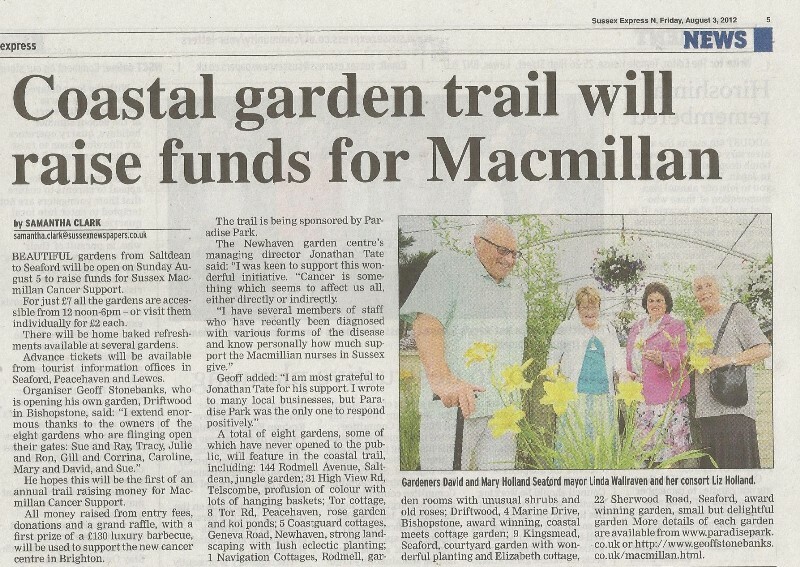 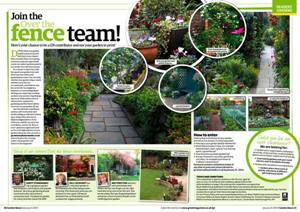 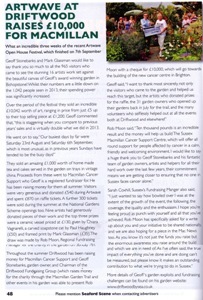 June 2014 On line article about Macmillan Trail hitting 30 gardens and Christine Walkden on Hugo Fox News. 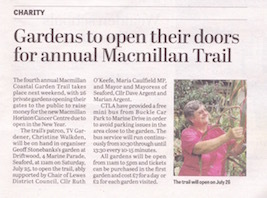 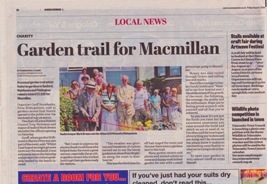 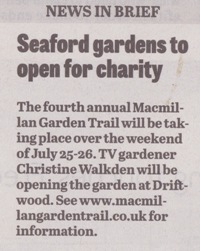 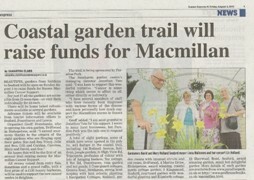 On line article about Macmillan Trail hitting 30 gardens and Christine Walkden on Latest 7 News. 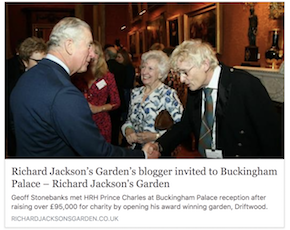 9th May 2014 On line here too. 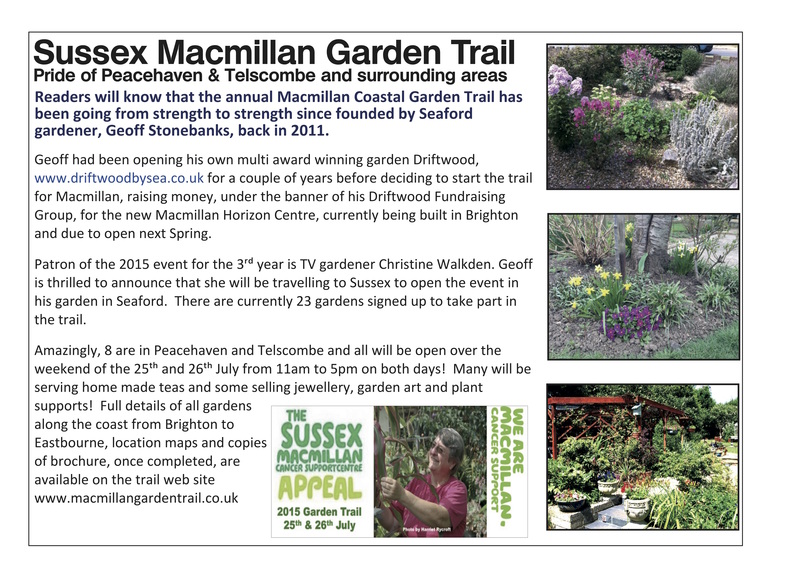 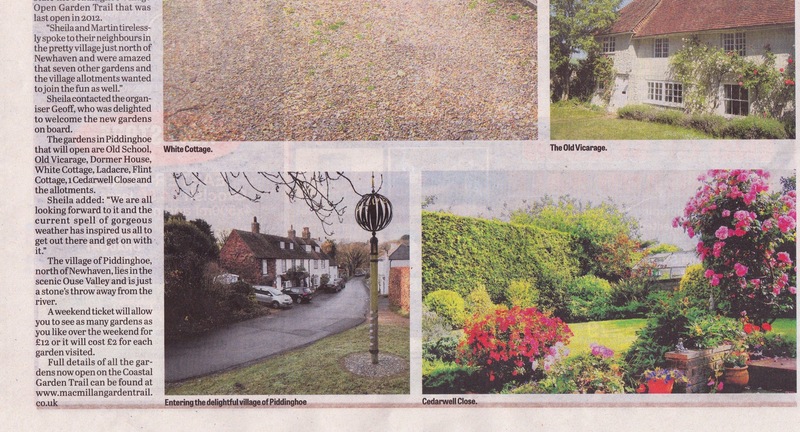 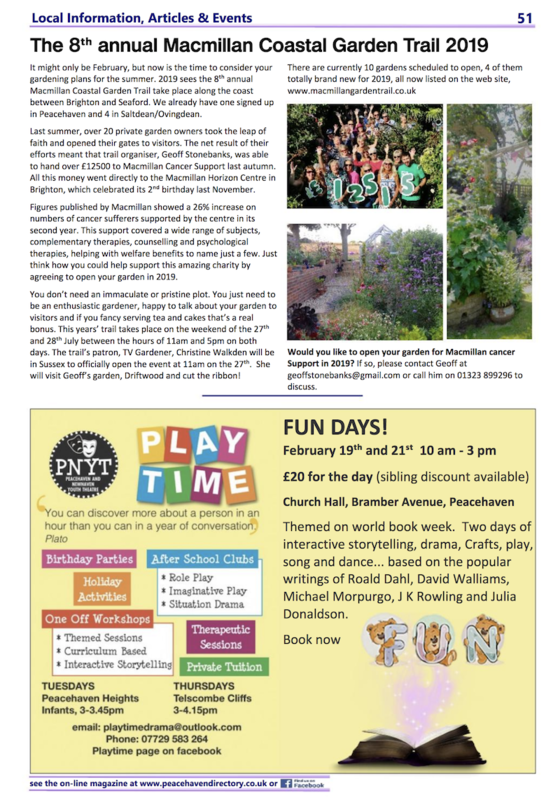 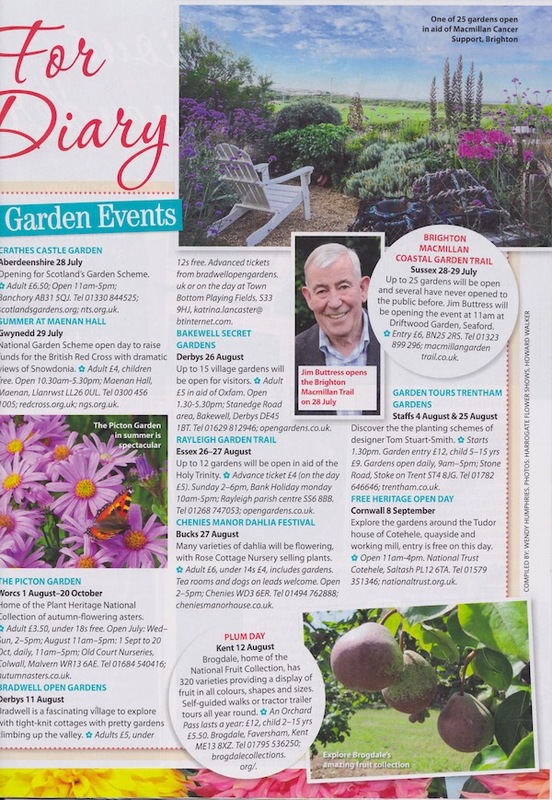 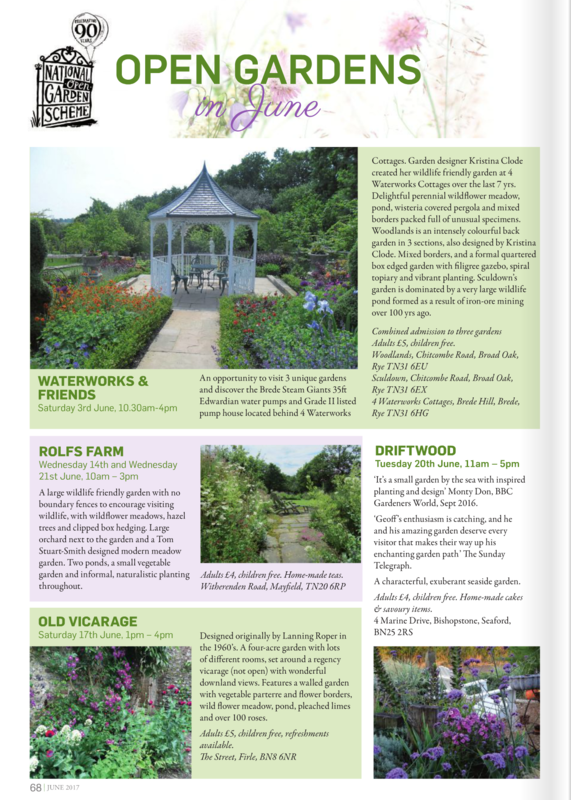 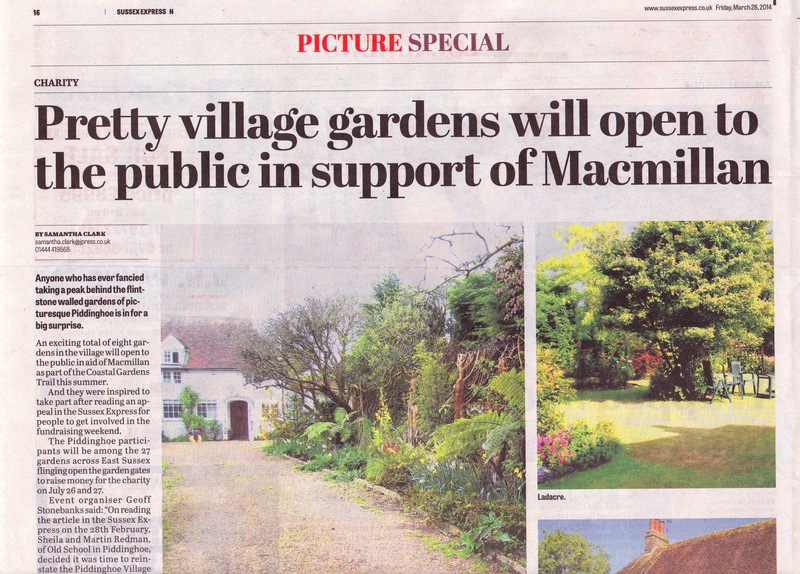 Latest 7, 3rd April 2014 Feature on Piddinghoe gardens opening for Macmillan Trail, click top and bottom of image to see whole page. 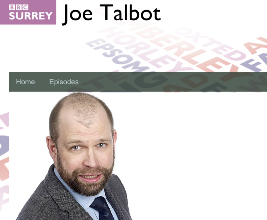 Mention of web site by Joe Talbot! 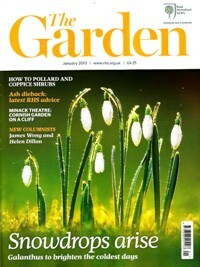 "White Out" 2 images of garden published.